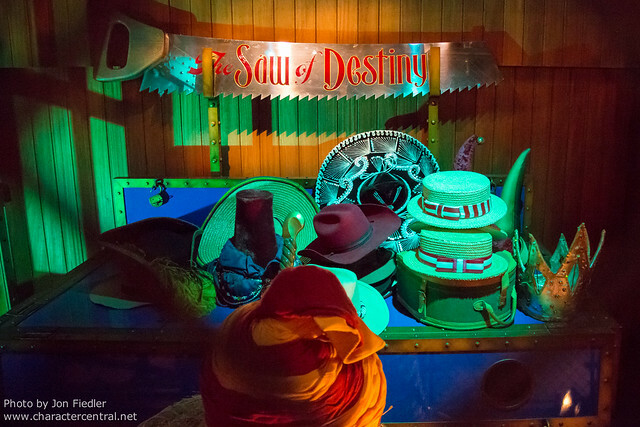 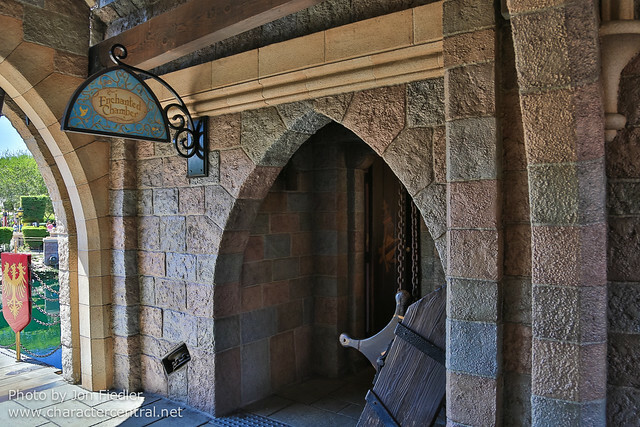 We shall start this part of the tour by resetting, and standing back in Central Plaza again, following our adventures into the Wild West in part three. 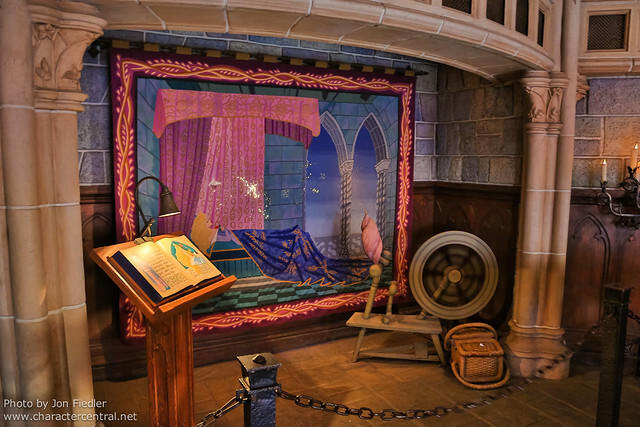 Depending on which park you’re in, Sleeping Beauty Castle or Cinderella Castle towers above you, welcoming you to the magical lands of fantasy and make believe that lie just beyond its portcullis. 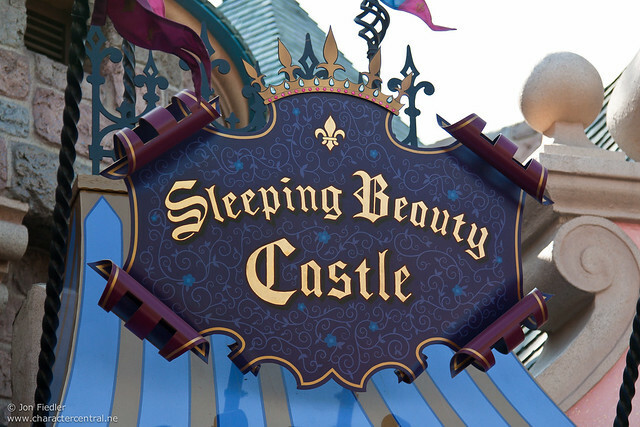 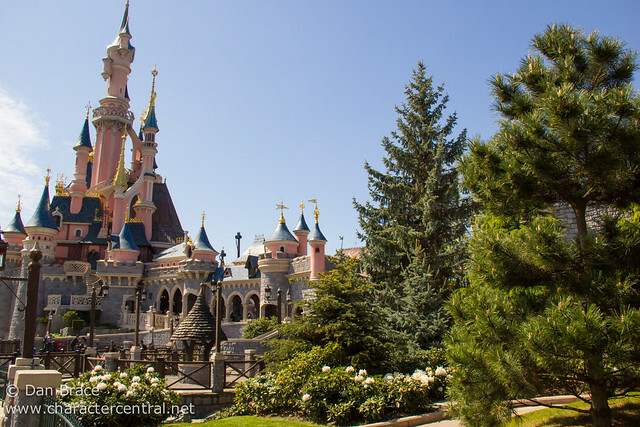 Disneyland park’s Sleeping Beauty is of course the original castle, although it shares its name with two other castles (Paris and Hong Kong), and its design with one other (Hong Kong). 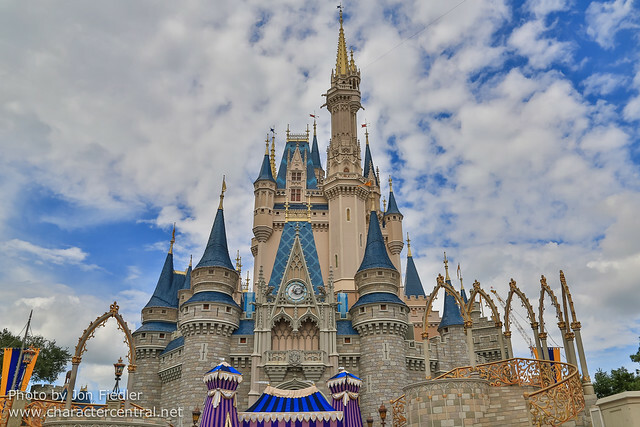 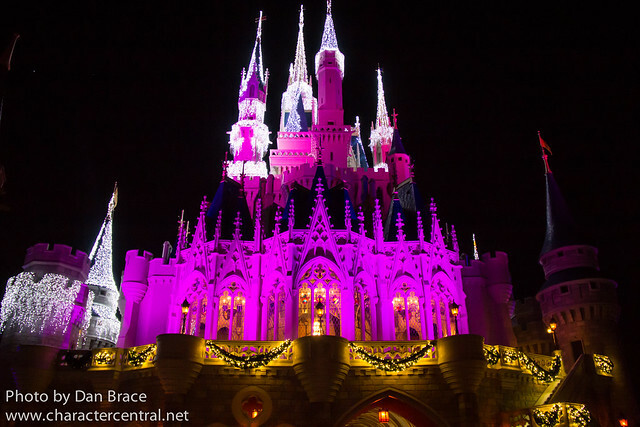 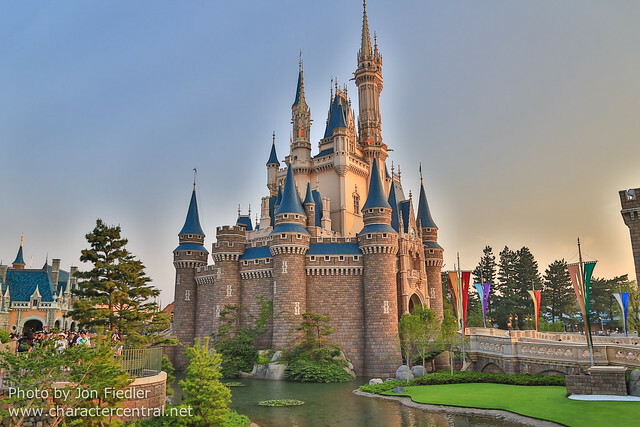 Cinderella Castle originated in Florida and also stands in Tokyo Disneyland. 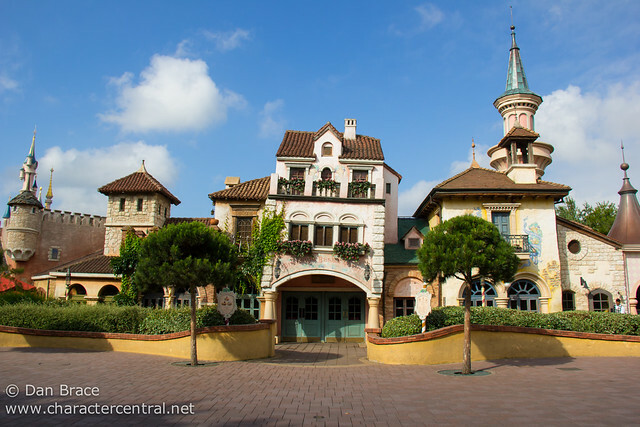 Despite looking similar in appearance at first, Disneyland/Hong Kong and Florida/Tokyo actually are all quite different from one another; and of course Paris’ is completely unique. 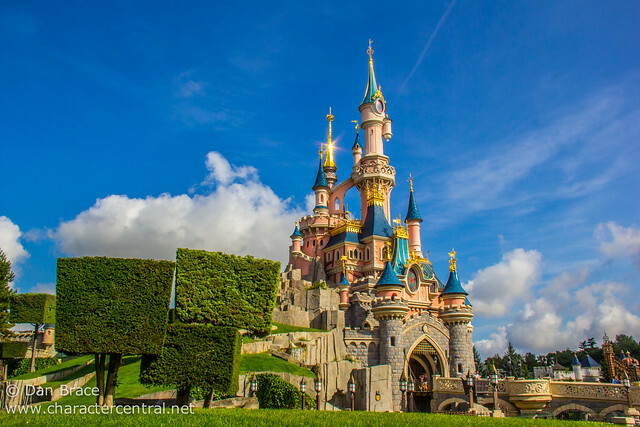 Of all five current castles, Disneyland Paris’ Sleeping Beauty Castle (or Le Chateau de la Belle au Bois Dormant, for those who want its French name) is my favourite, with no exception. 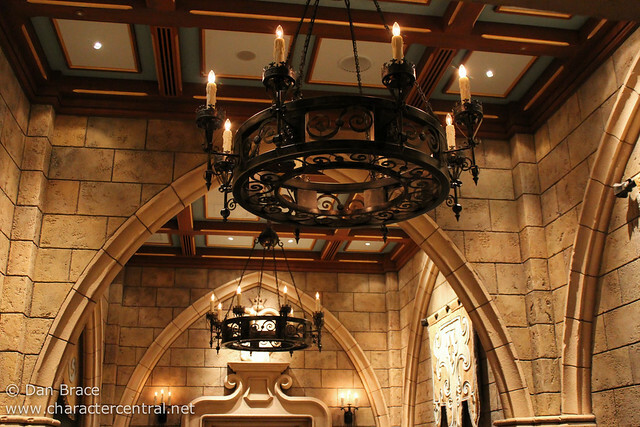 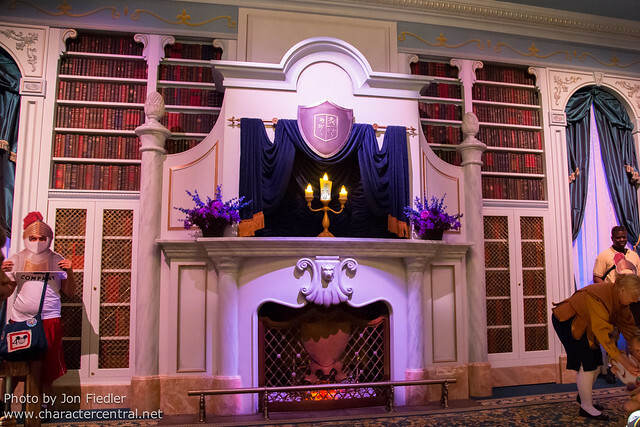 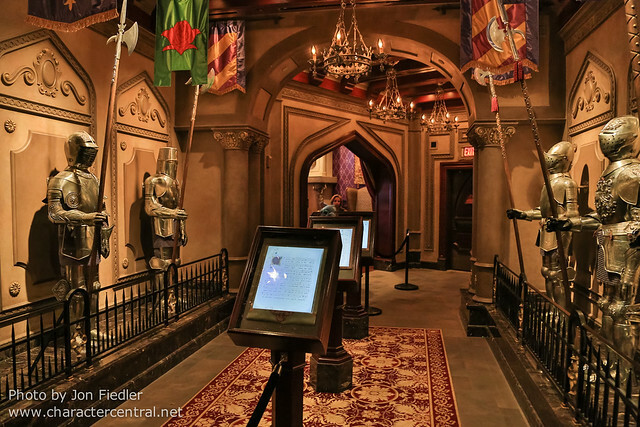 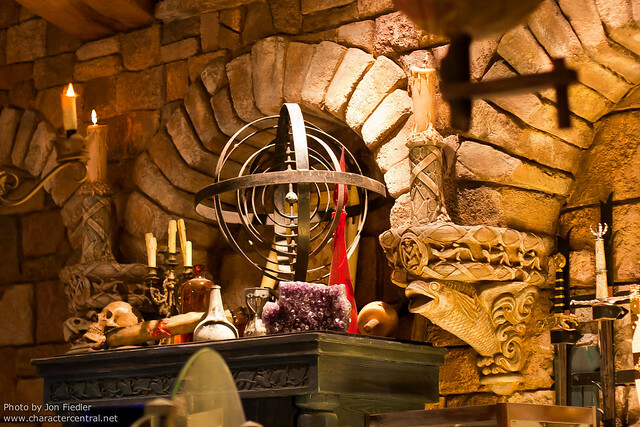 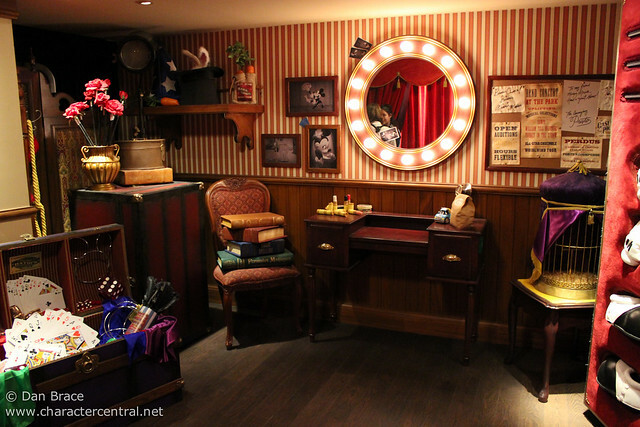 Everything about the design, theming, construction and presentation is simply stunning. 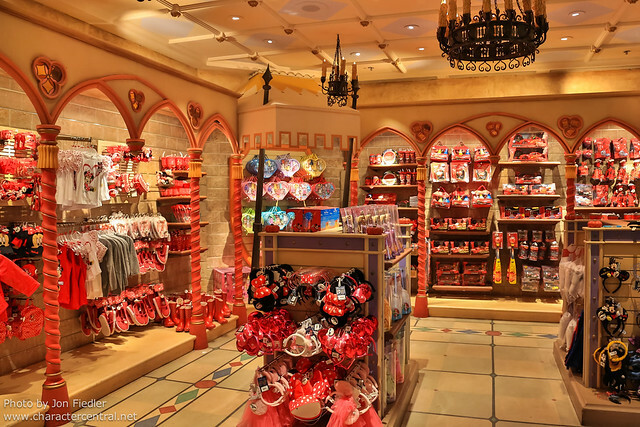 There are walk-through areas and two stores. 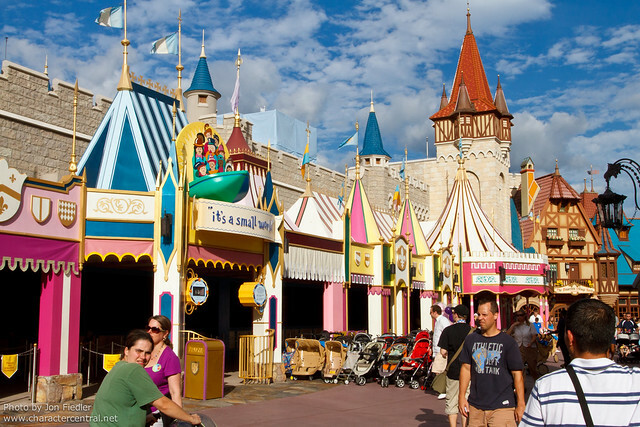 Disneyland’s would come second, because it is the original, and it does have a nice walk-through attraction and store inside. 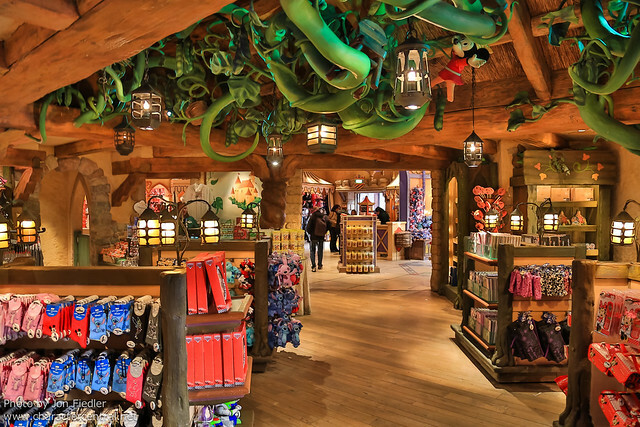 Let’s take a look inside and outside both, including the stores, before we move on to the others. 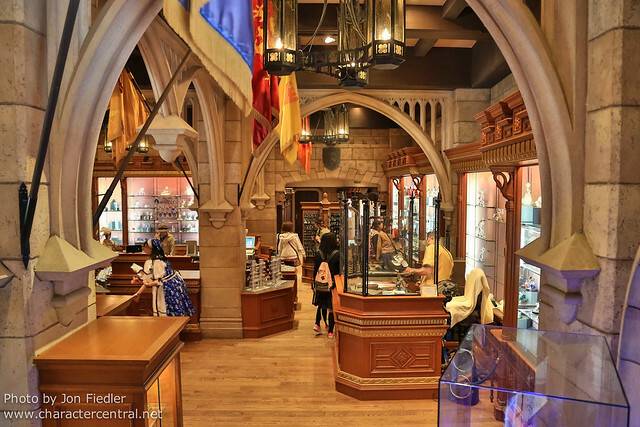 Cinderella Castle in Tokyo Disneyland is my next favourite, since it also has a walk-through attraction inside, plus a store. 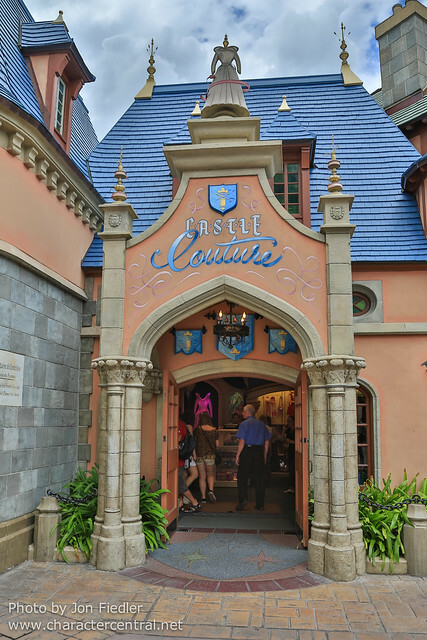 Cinderella Castle in Florida can often lead to being a disappointment for first time fans, for if you do not have a hard-to-get dining reservation for Cinderella’s Royal Table, or the Bibbidi Bobbidi Boutique, then there really isn’t much else to do besides walk through the middle of it - when it’s open, that is! 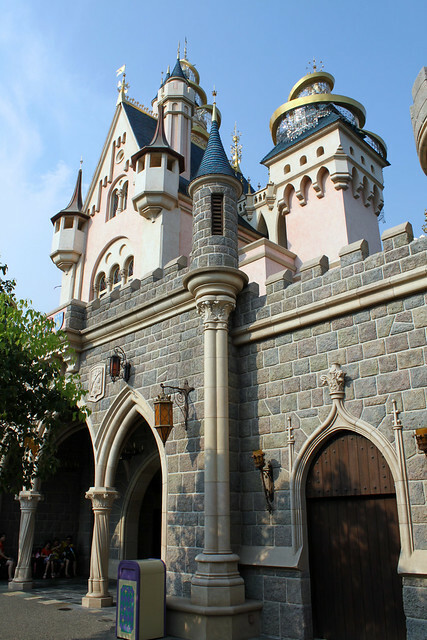 Castle stage shows often close down the castle walkway, making it nothing more than an icon for most guests. 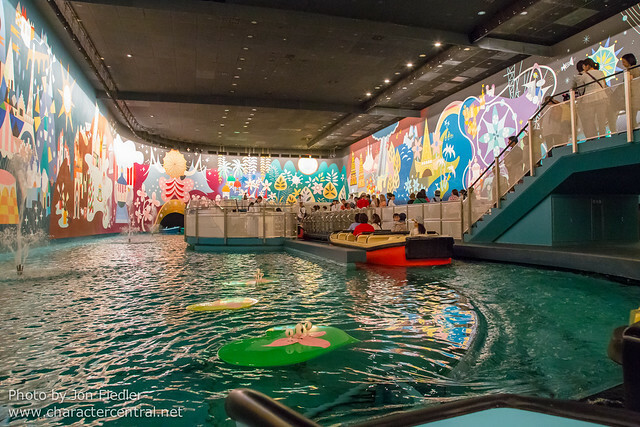 It’s unfortunate, since I think the surroundings are pretty, and the colour scheme is nicer than Tokyo’s, but Tokyo has the edge since there is actually something for everyone to do inside of it. 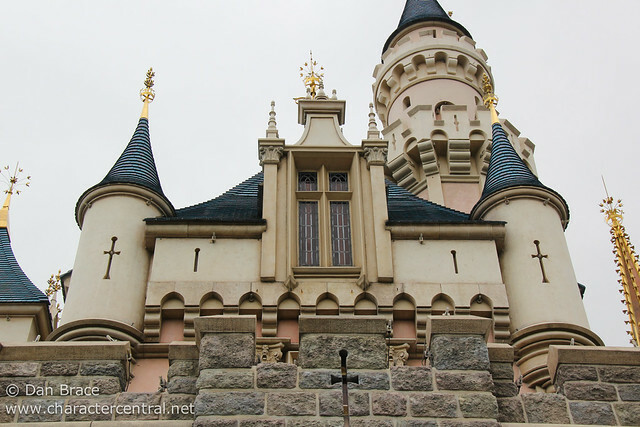 Finally, Hong Kong Disneyland’s Sleeping Beauty Castle is the weakest of them all. 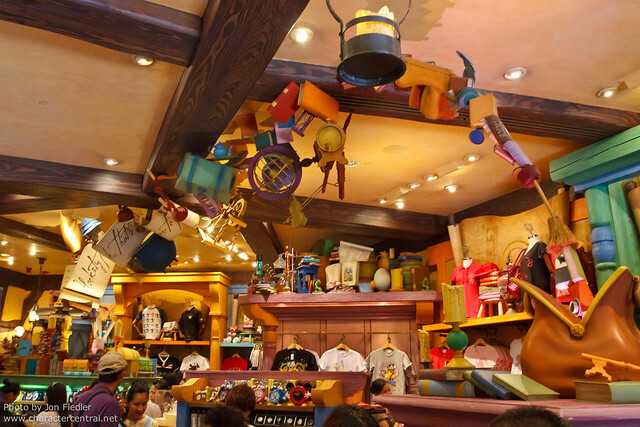 Although it is currently undergoing a refurbishment for their 10th anniversary, the paint colour has always been really off, and there is nothing inside, not even a store, which is really odd. 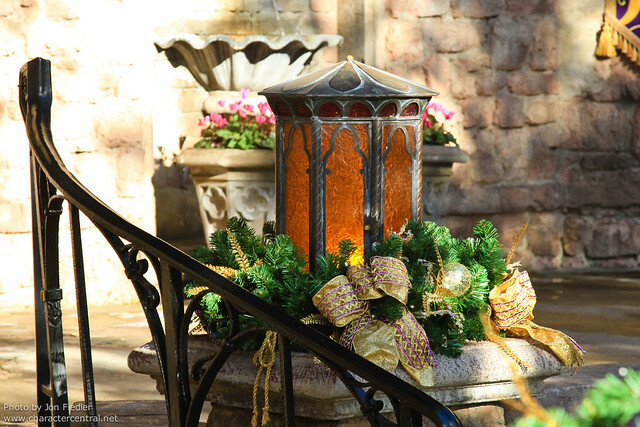 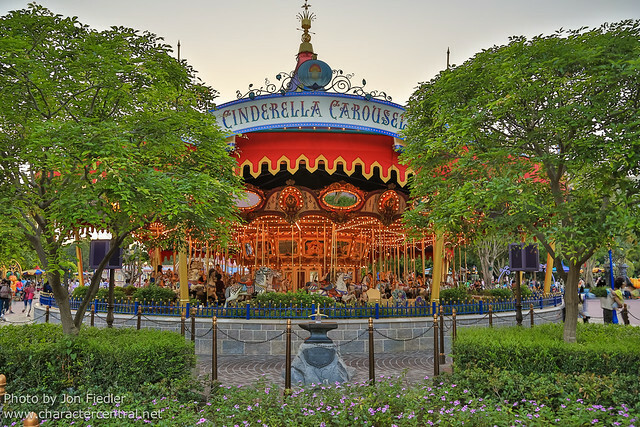 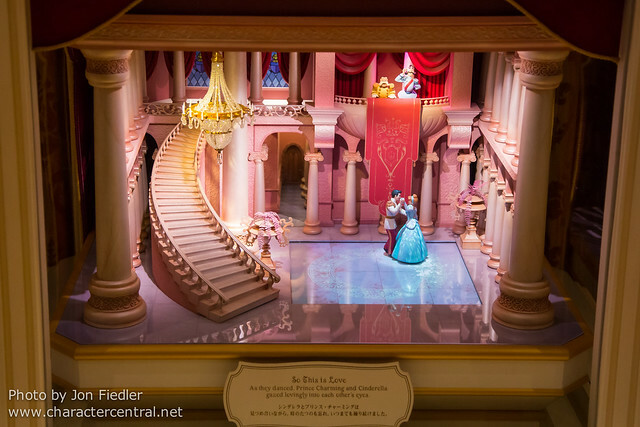 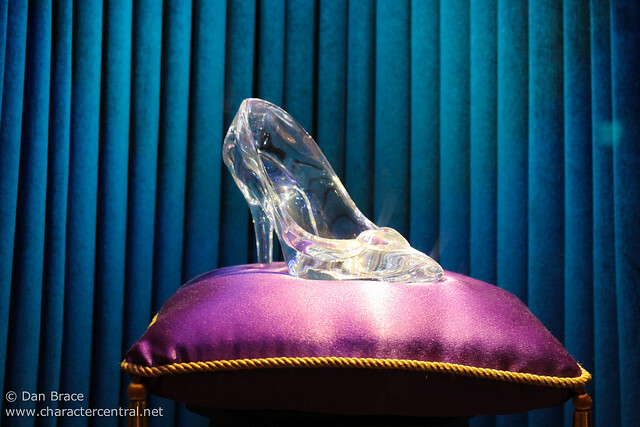 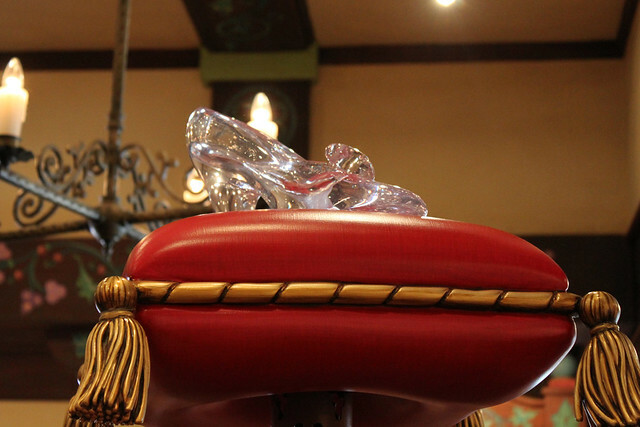 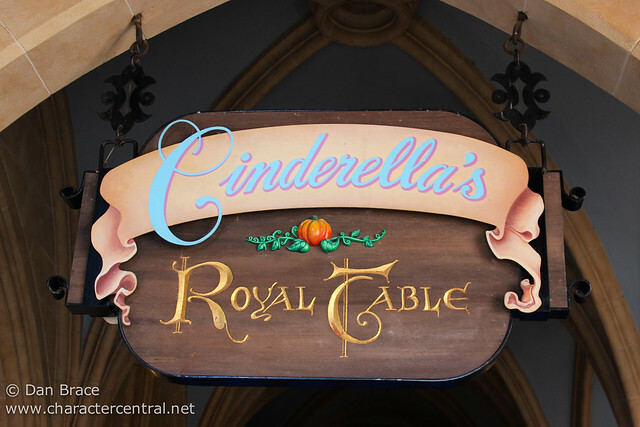 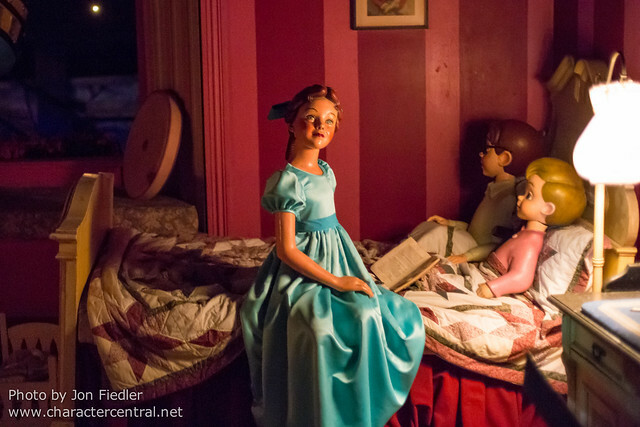 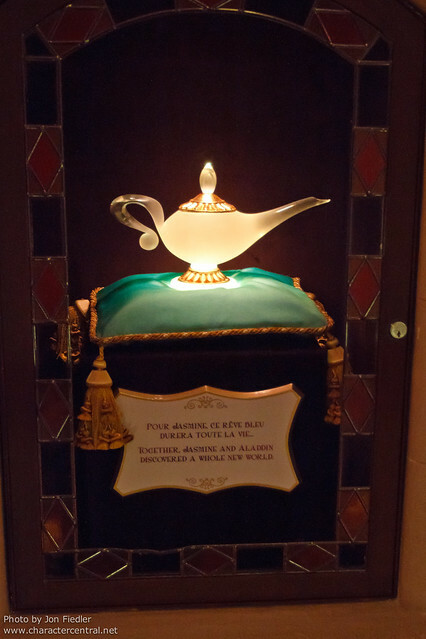 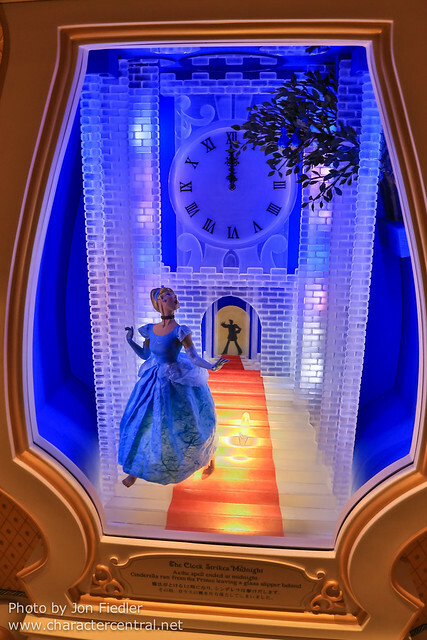 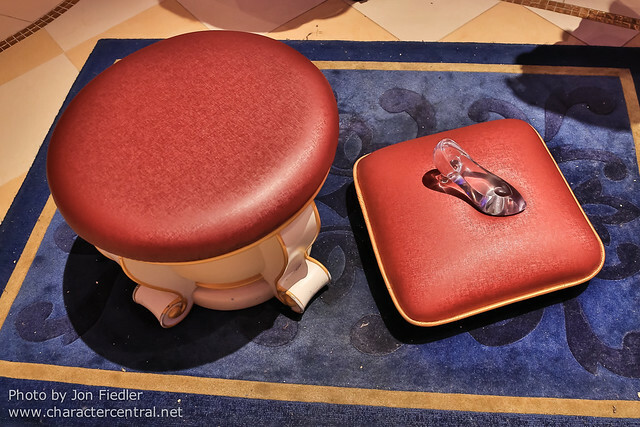 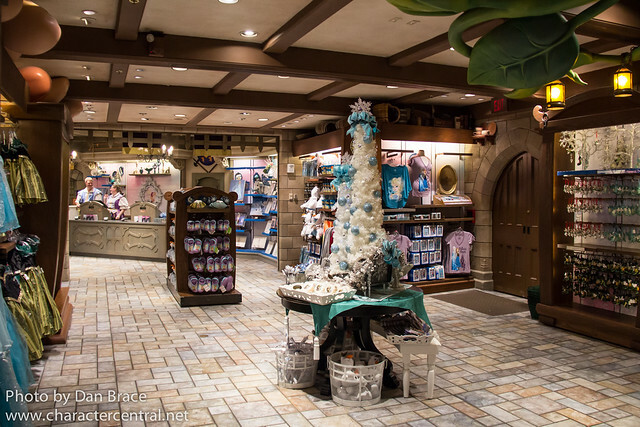 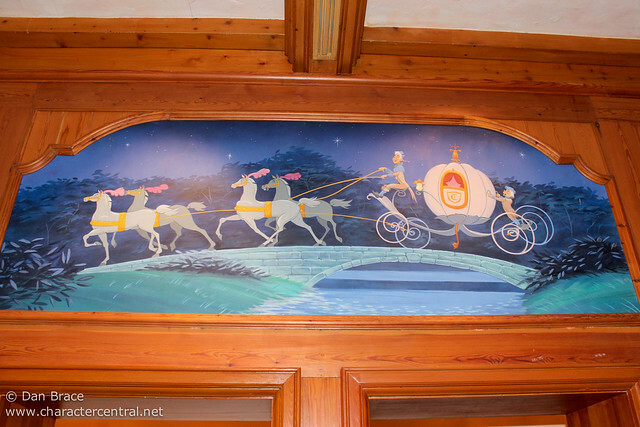 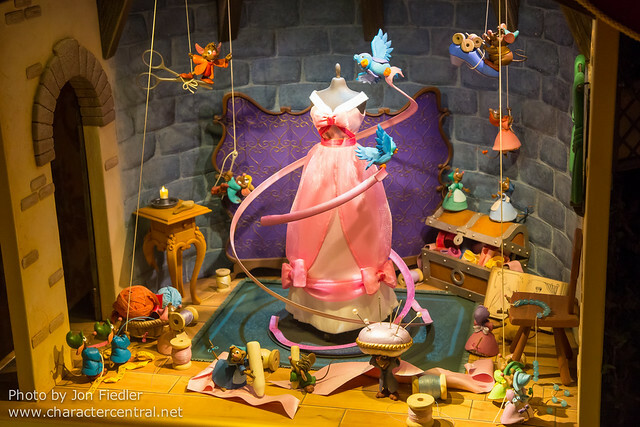 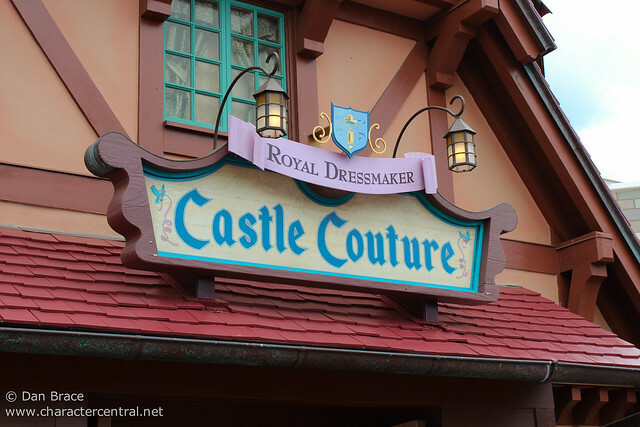 Let’s take a look around inside and outside all three, including the stores and Cinderella’s Royal Table. 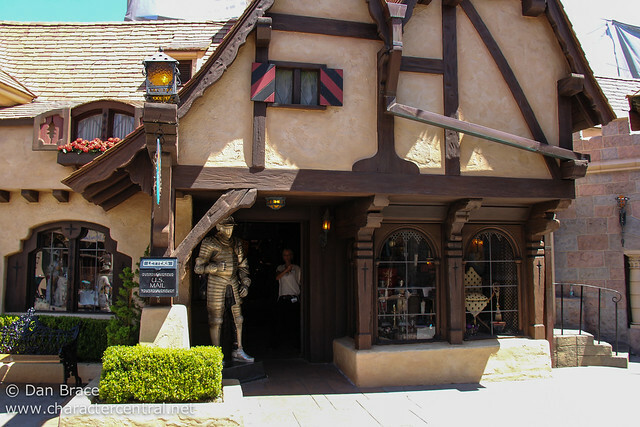 Exiting the castle you find yourself in the castle courtyard area at each park, surrounded by boutiques, attractions and restaurants. 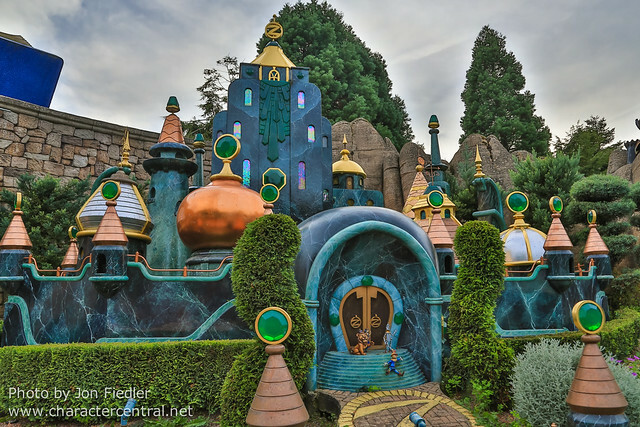 I want to take the opportunity here to give a few of my own overall impressions of the Fantasylands of the world, before we move on. 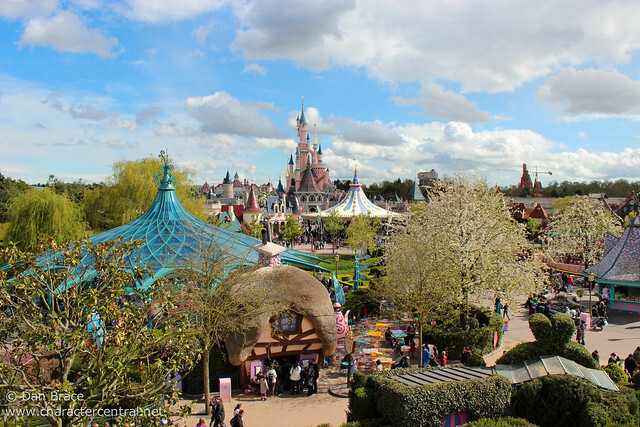 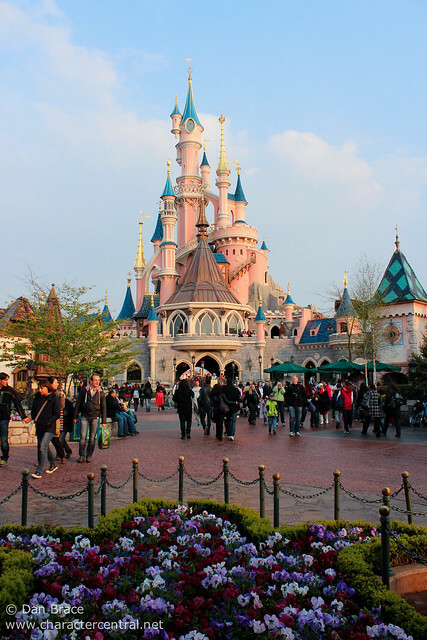 My favourite Fantasyland by design is Disneyland Paris’. 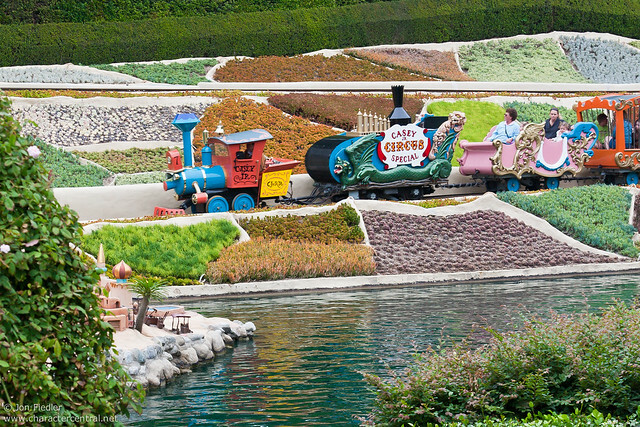 The carefully planned layout, which incorporates waterways that weave in and around the land, is beautiful. 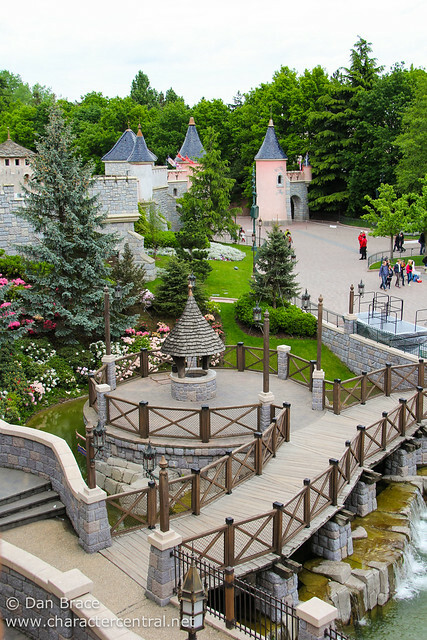 Filled with trees, bridges, topiaries and neat details, it really encapsulates the word ‘fantasy’. 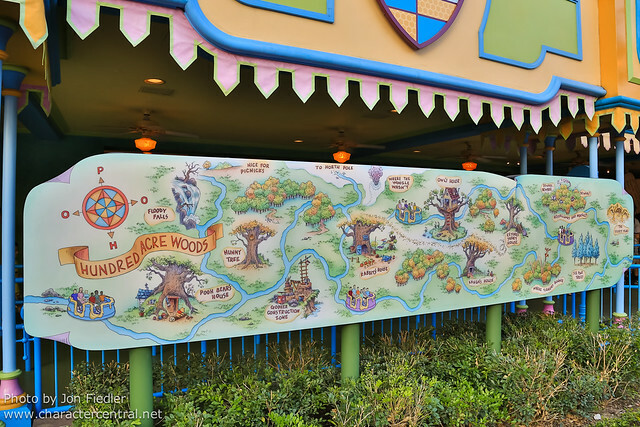 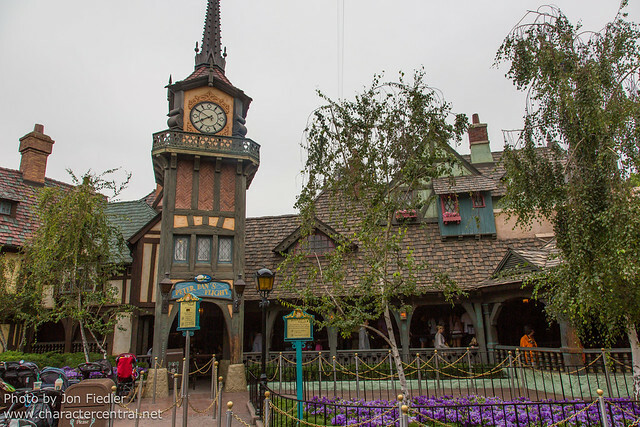 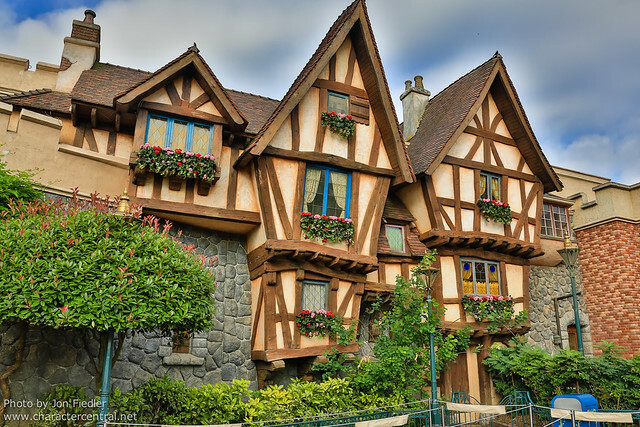 It’s interesting, too, because there are areas that are clearly grouped by certain influences, for example, the “British” area, which is an area that has Peter Pan’s Flight, Toad Hall Restaurant and the Labyrinth all grouped together. 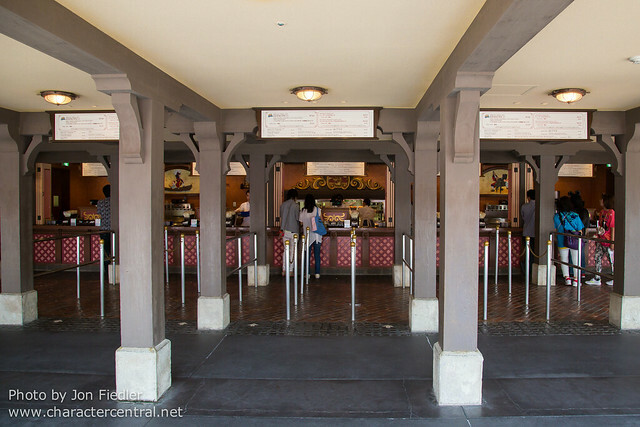 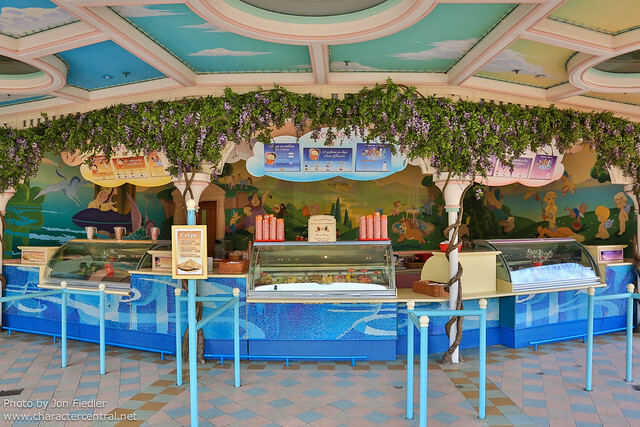 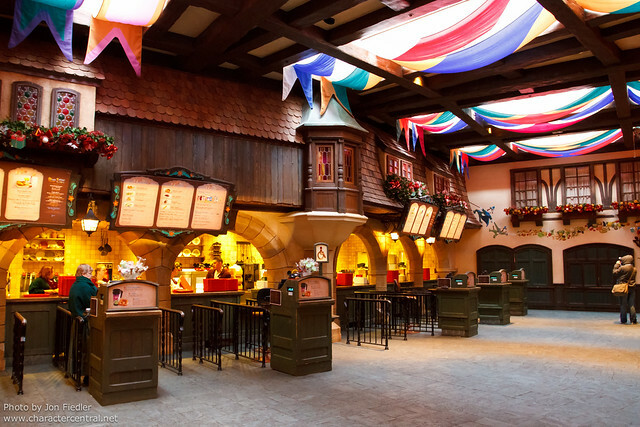 Another example would be the “Italian” area which groups together Pizzeria Bella Notte and Fantasia Gelati. 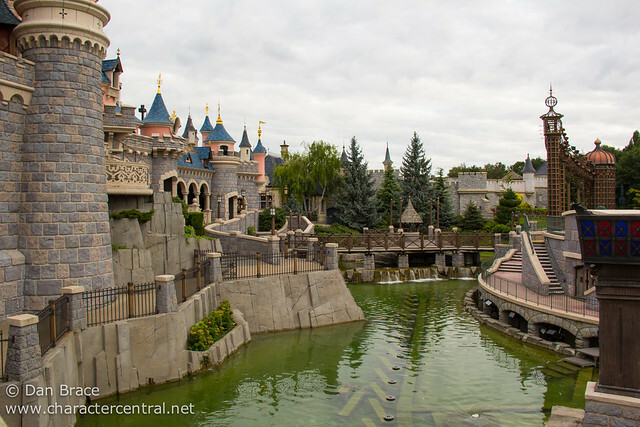 Disneyland would be my next favourite Fantasyland, with its intimate feel, lots of trees and unique attractions. 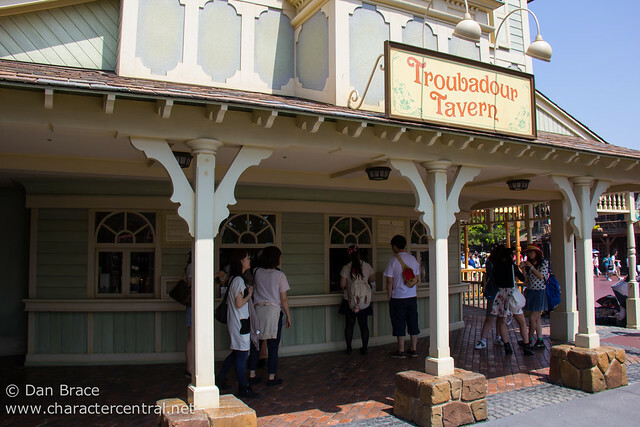 The one problem with Disneyland’s courtyard area is the size, and the bottleneck through the parade route and into Frontierland, but those are minor complaints in the grand scheme of things. 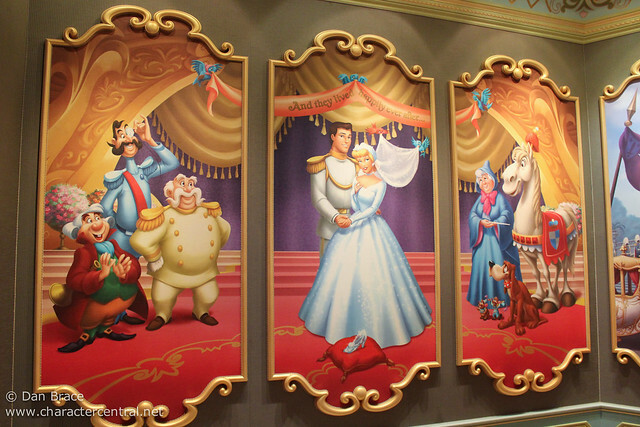 It would be hard to say which of the final three would come next. 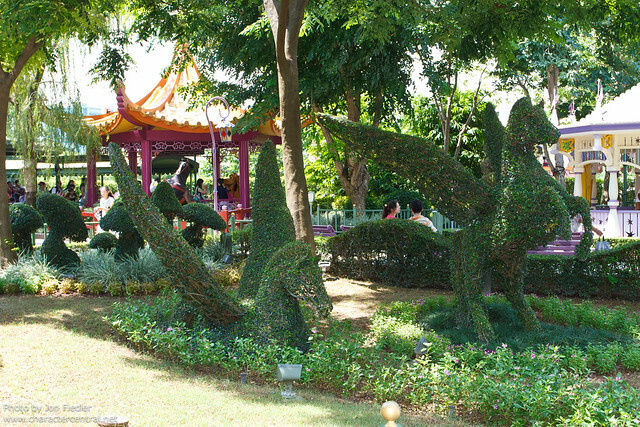 Hong Kong lacks a lot of anything, but has some nice, charming areas that redeem it some. 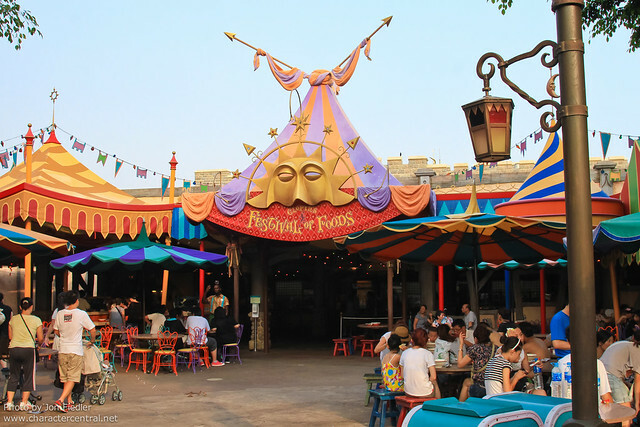 Tokyo is a real mosh, with pre-1980’s style renaissance faire style tents, the 8-arm Dumbo and vast open swathes of concrete. 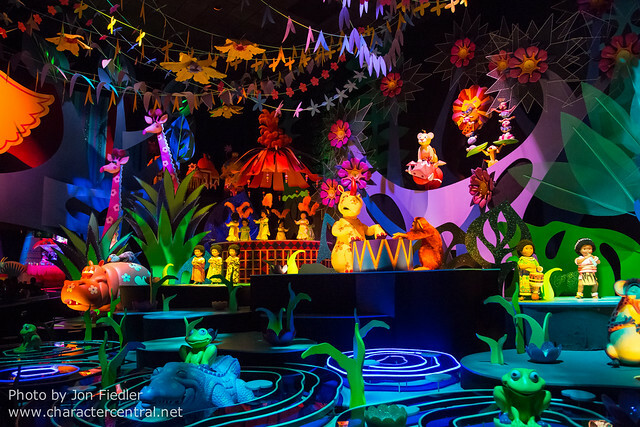 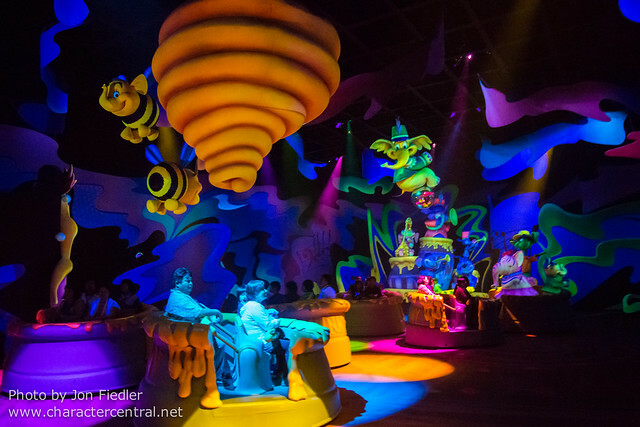 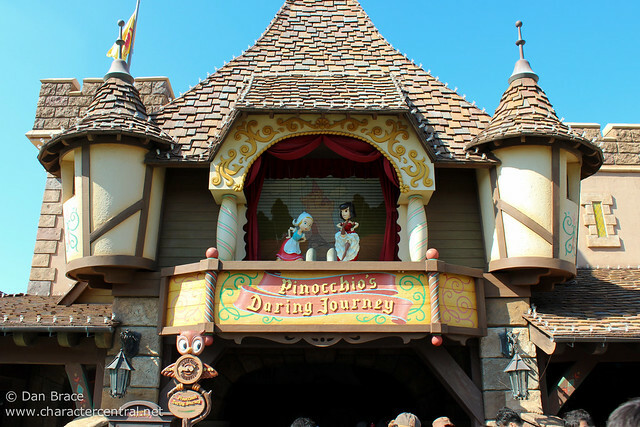 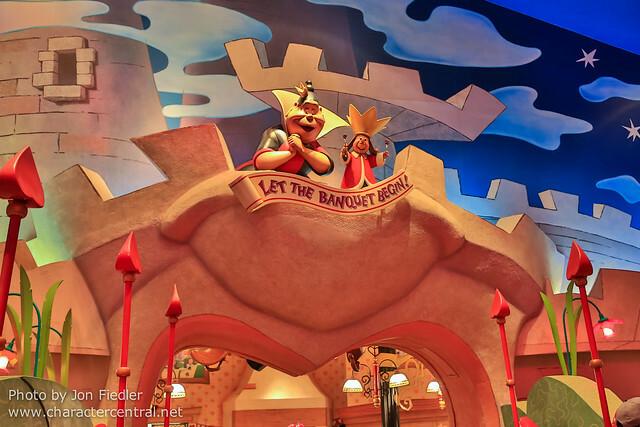 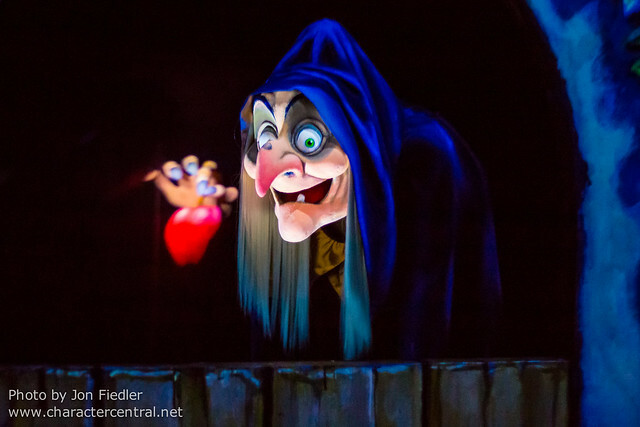 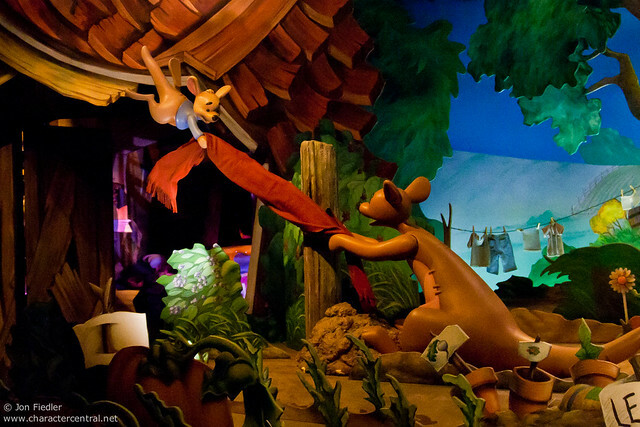 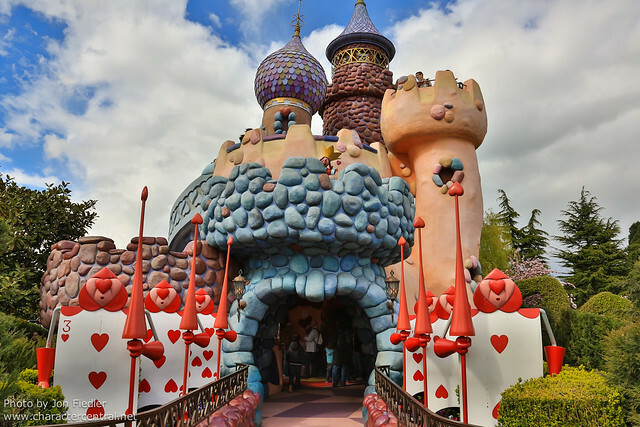 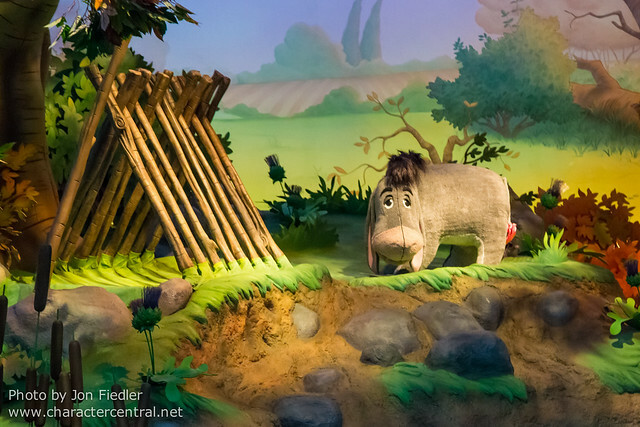 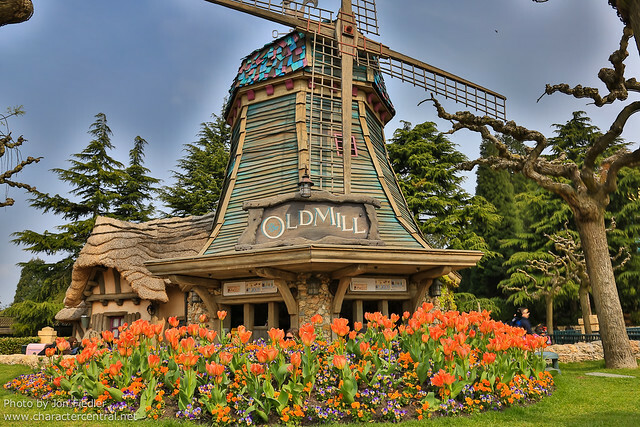 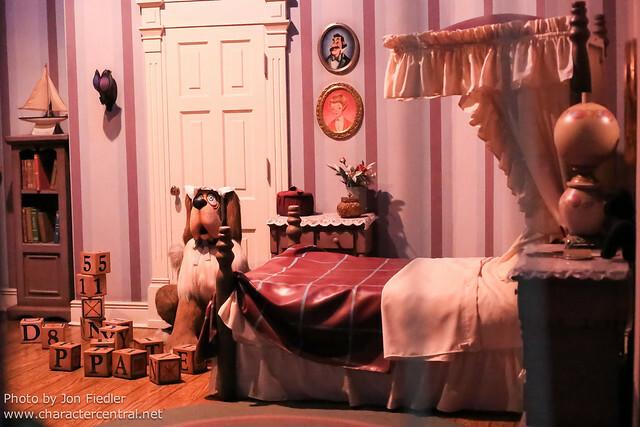 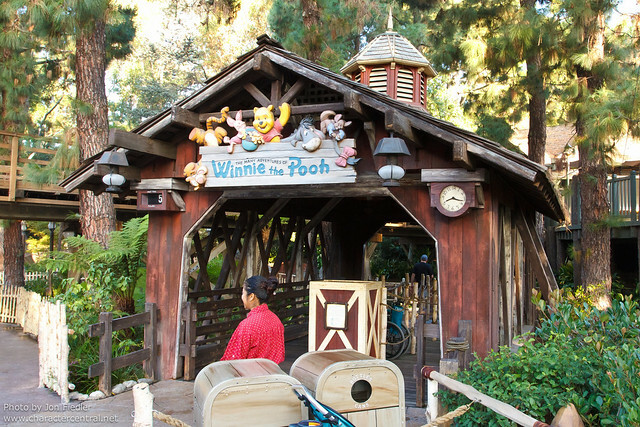 It also has the overall weakest versions of most of the dark rides, but adversely it has the best Winnie the Pooh attraction, and awesome buildings such as the Queen of Hearts Banquet Hall. 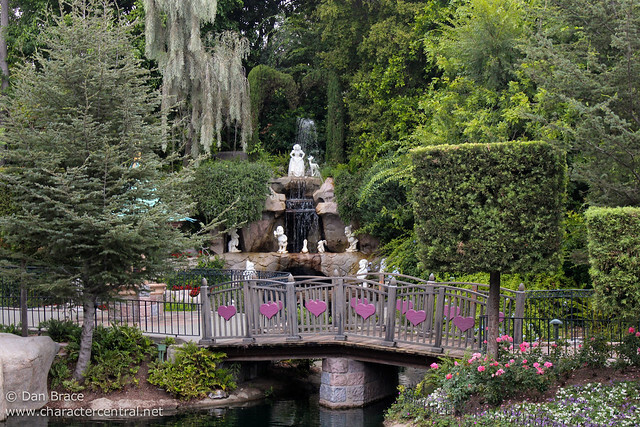 Again, like Hong Kong, it isn’t amazing, but it has redeeming points. 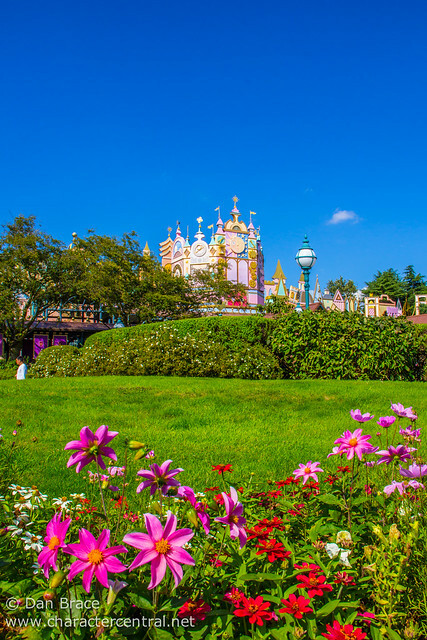 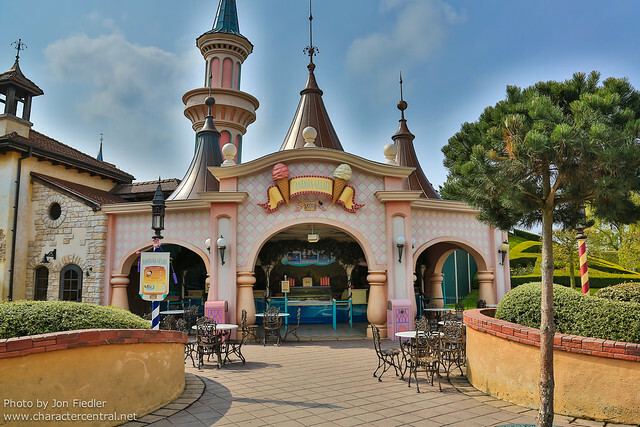 It should be noted here though, that after all these years, Tokyo Disney Resort have finally realised what a mess Fantasyland looks, and recently announced a massive overhaul. 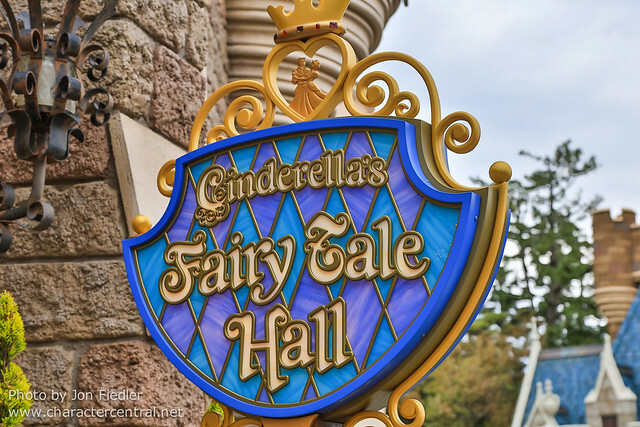 Hopefully this will go a long way to address many of the issues it has. 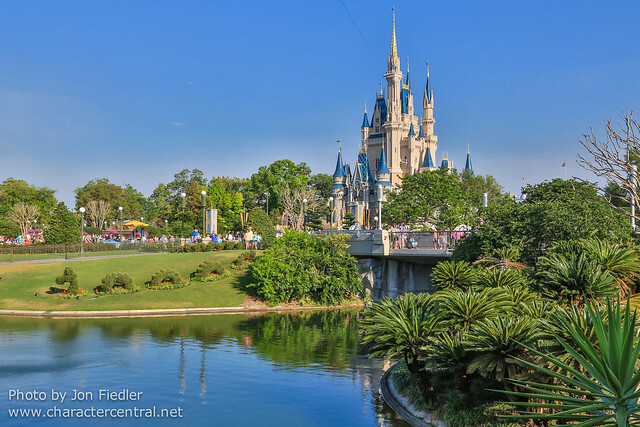 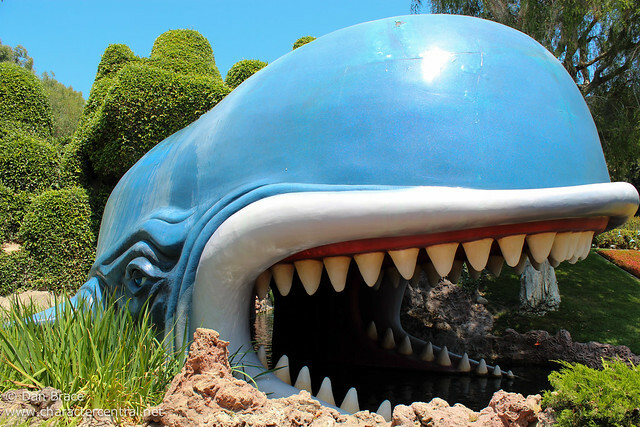 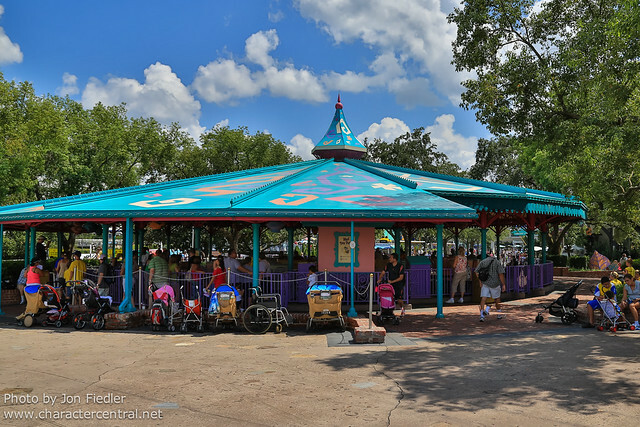 Florida has recently had what most would consider the best expansion the park has ever seen, added to its Fantasyland, but overall it did little to address many other issues. 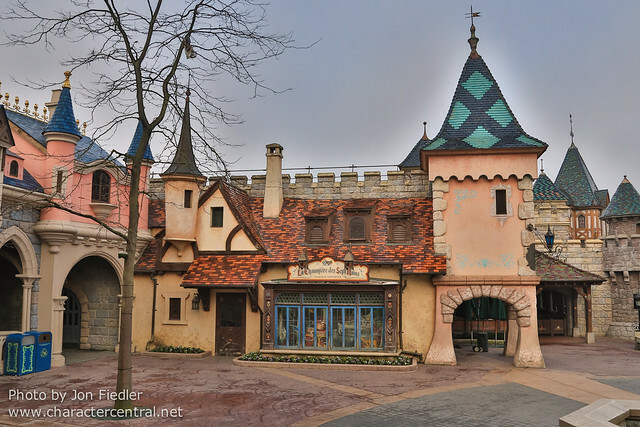 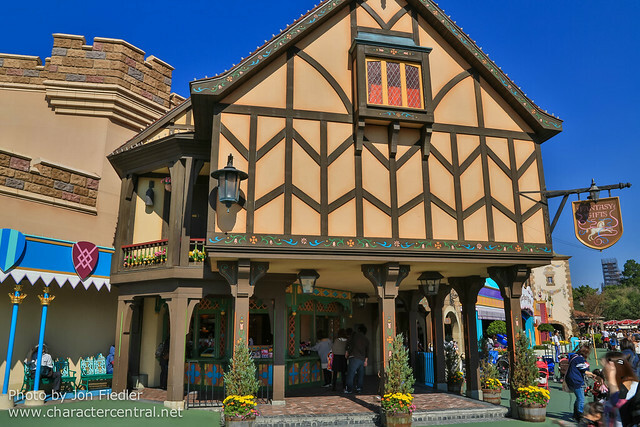 The first, original, half of Fantasyland still suffers from the old renaissance faire style buildings, like Tokyo, and is largely uninspired, again with large open concrete areas. 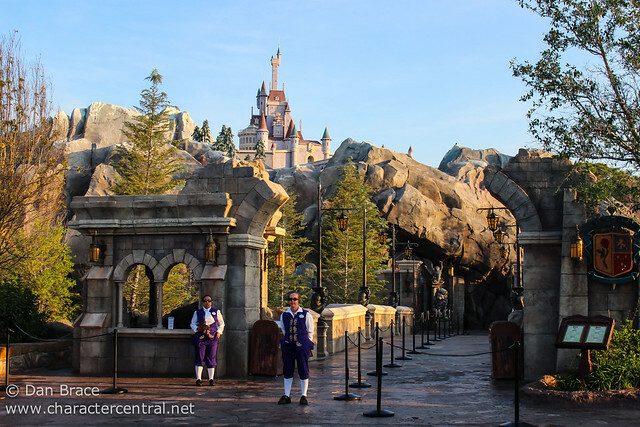 There is a clear separation between new and old with the new castle walls they constructed, which really serve no purpose, except to highlight the fact that it is a newer area - which makes the old area feel even worse! 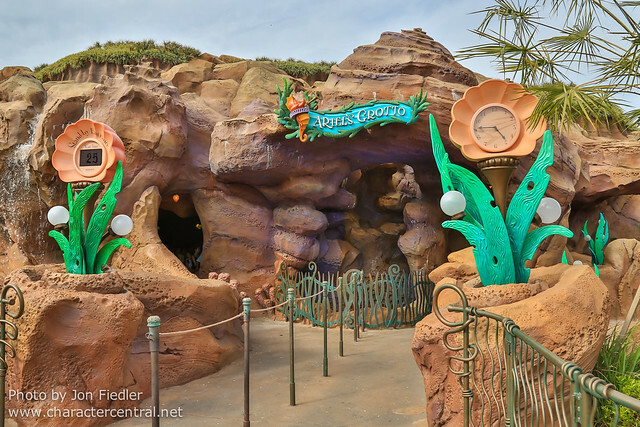 The new area, admittedly is very nice, although it amounts to not much more than several meet ‘n’ greets, the Little Mermaid attraction and the Mine Train, the former of which can already be found in Disney California Adventure. 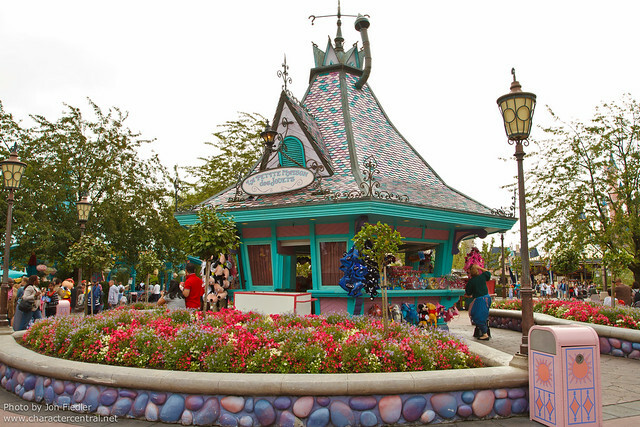 They did do a good job but failed to really change the rest of Fantasyland. 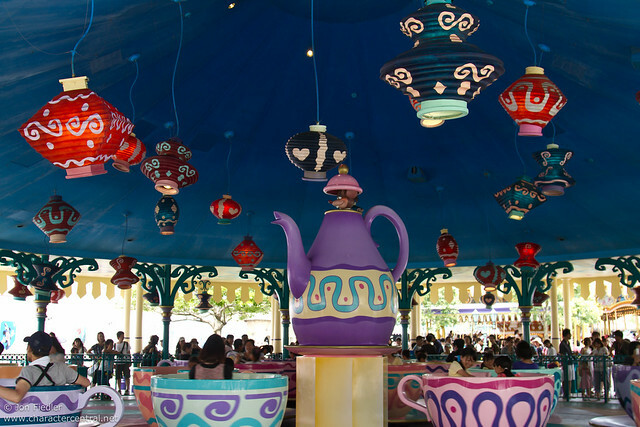 You can still stand at the Tea Cups and see, hear and even smell the Speedway. 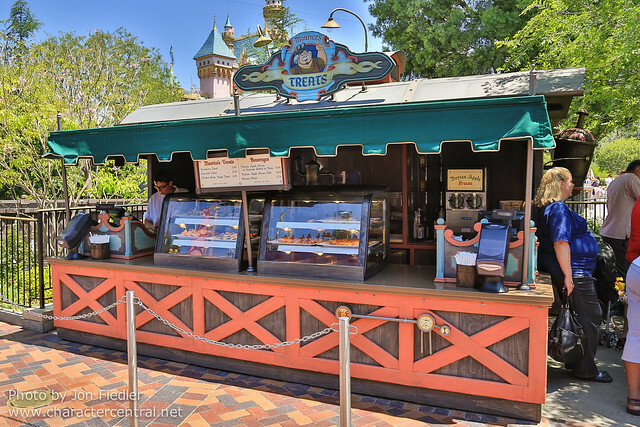 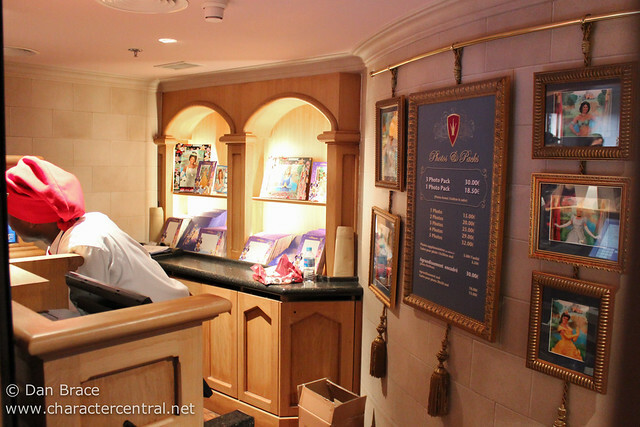 Cheshire Cafe is in Fantasyland, but faces Cosmic Ray’s Starlight Cafe in Tomorrowland. 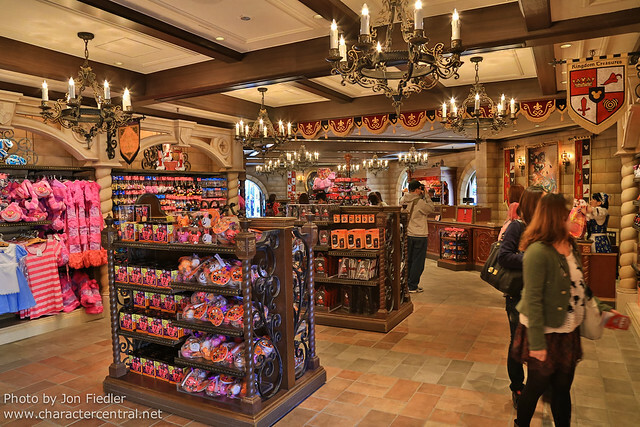 I just wish they had spent more on fixing existing areas, and not just tacking on a whole new one. 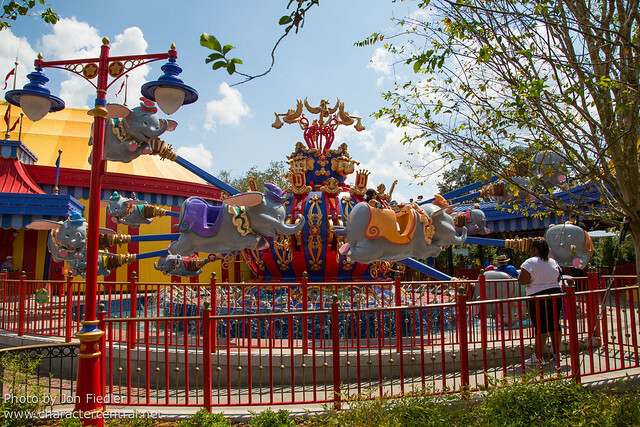 Each park is a little different in its overall layout, but there are some commonalities, so we shall focus on those first, then on each park’s unique offerings. 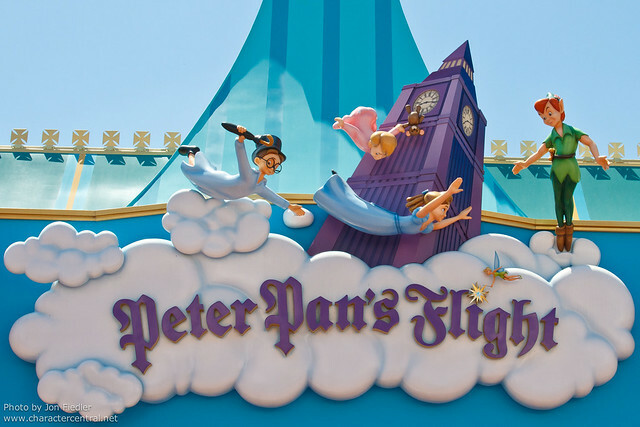 First up, let’s experience some attractions, starting with a classic which is found at all the parks except Hong Kong, Peter Pan’s Flight. 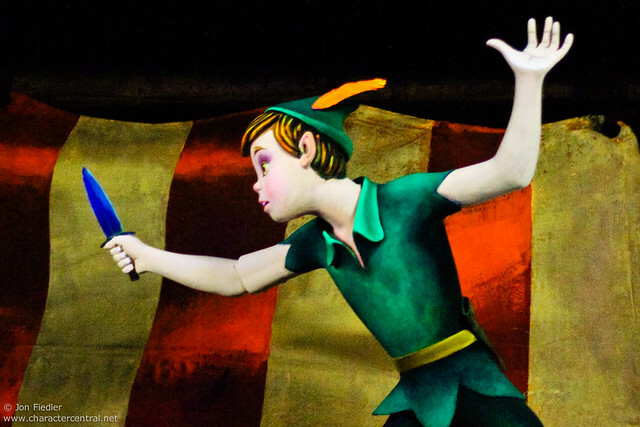 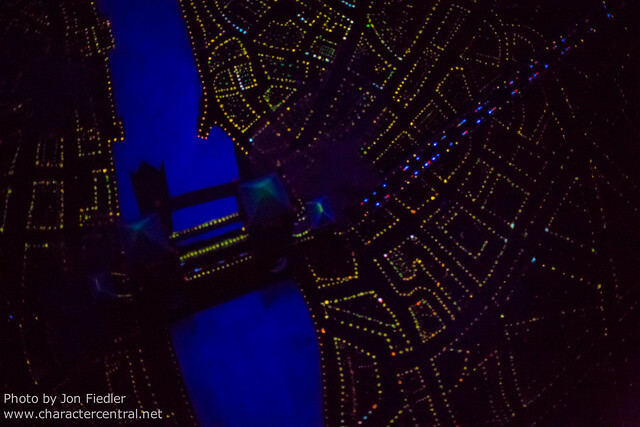 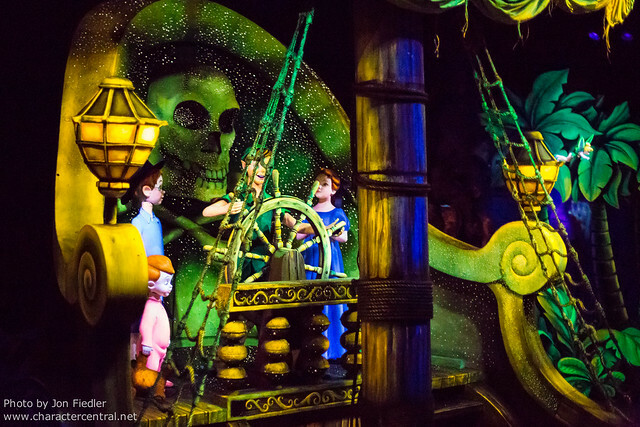 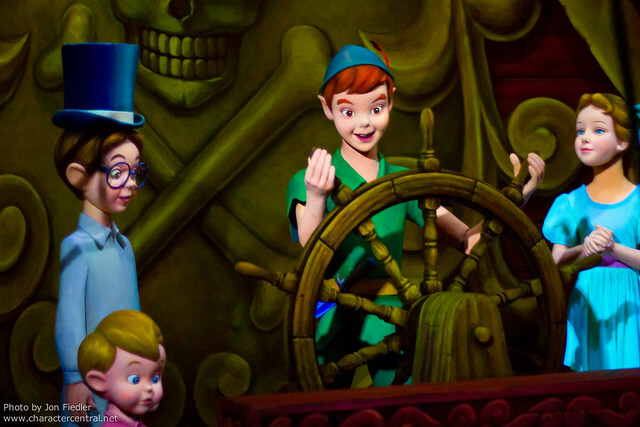 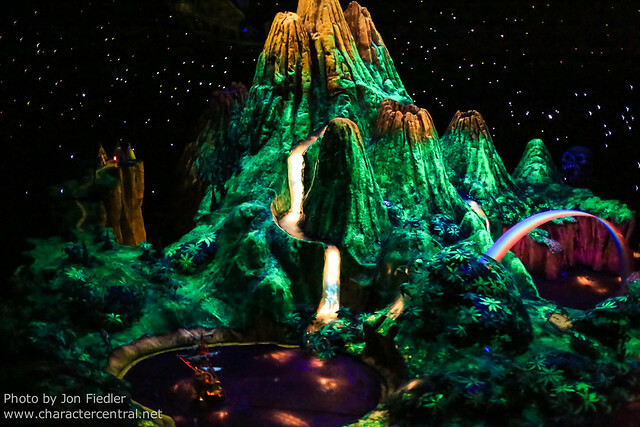 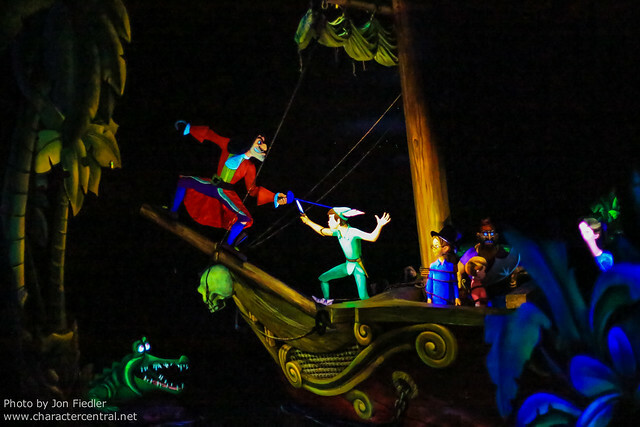 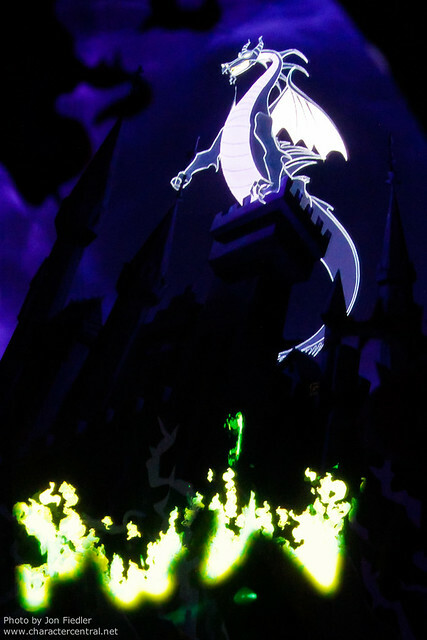 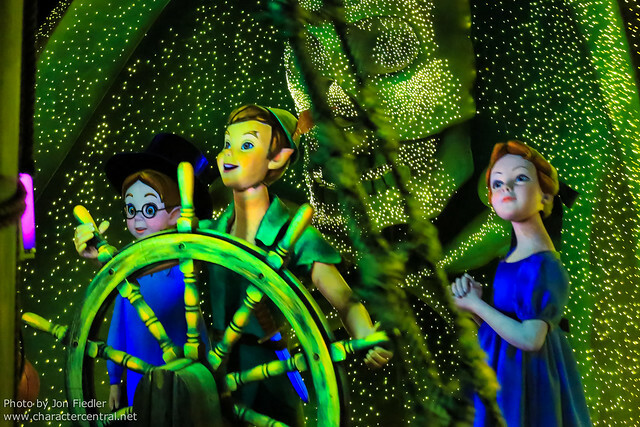 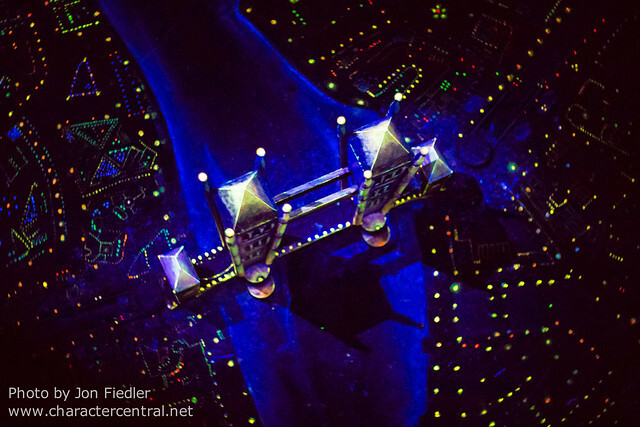 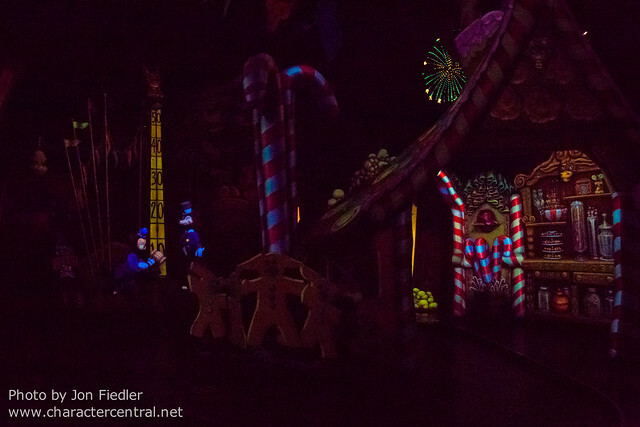 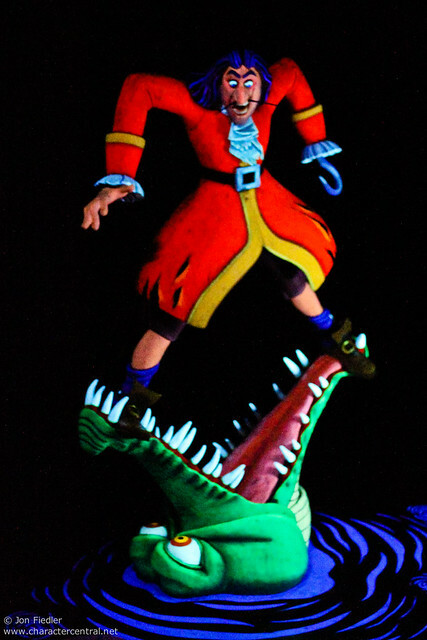 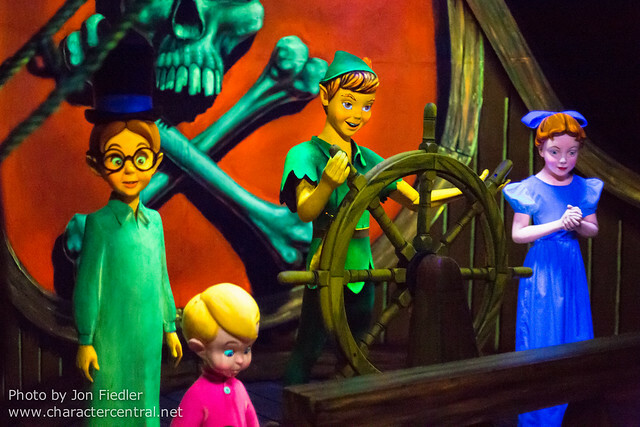 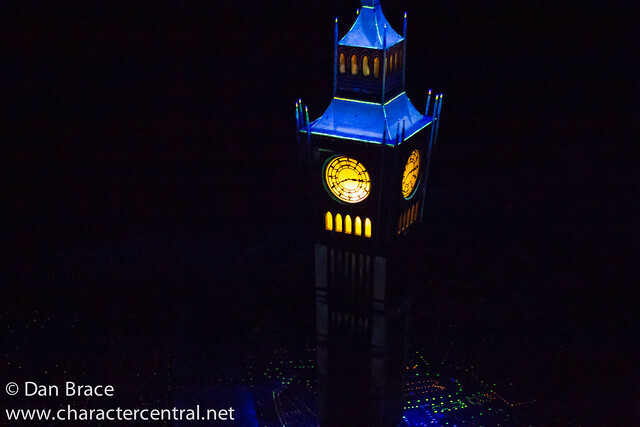 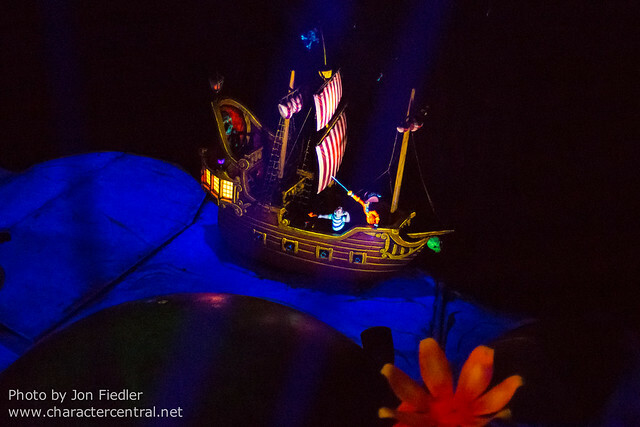 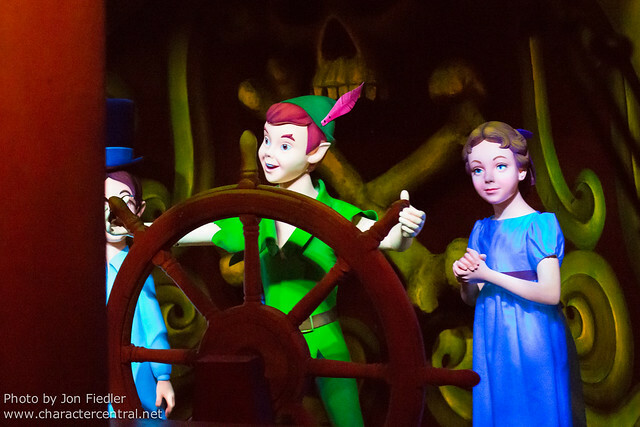 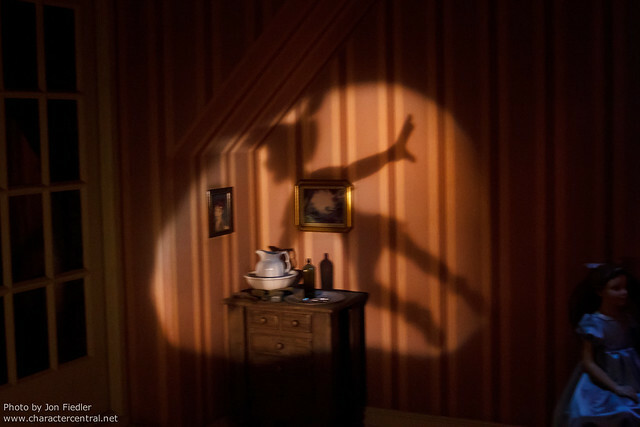 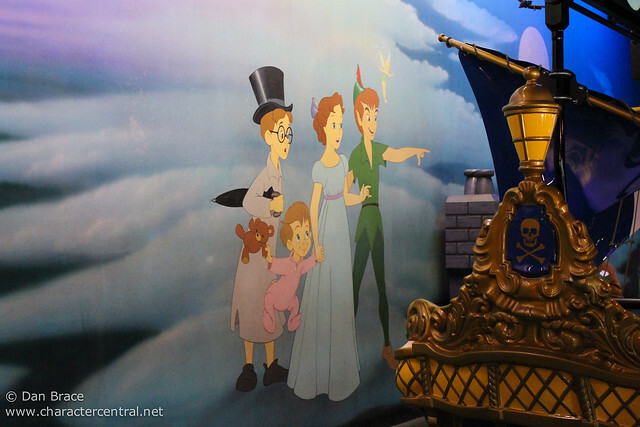 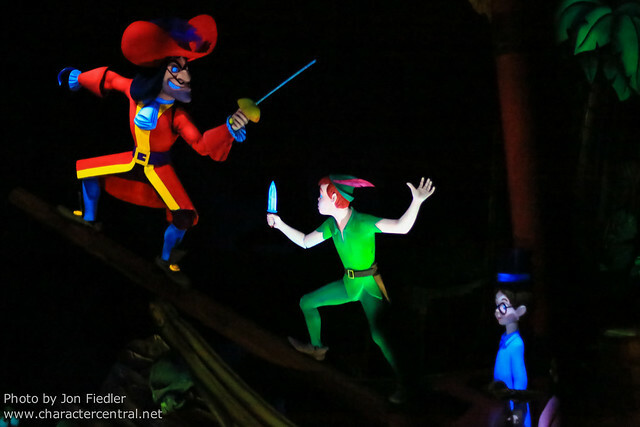 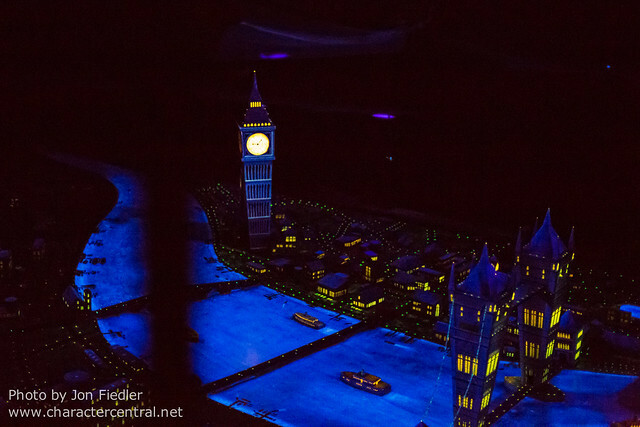 Peter Pan’s Flight has always been a firm guest favourite, and it’s not hard to see why. 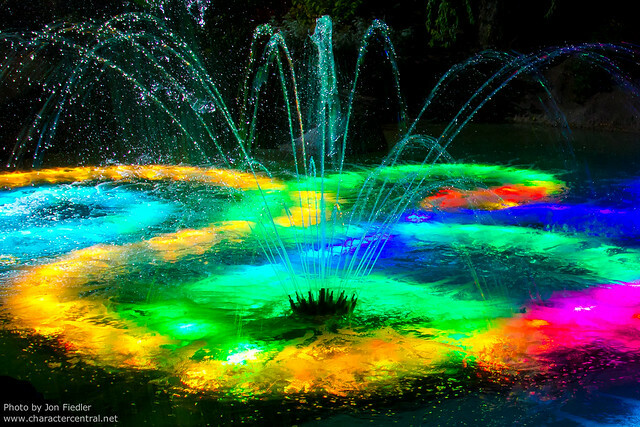 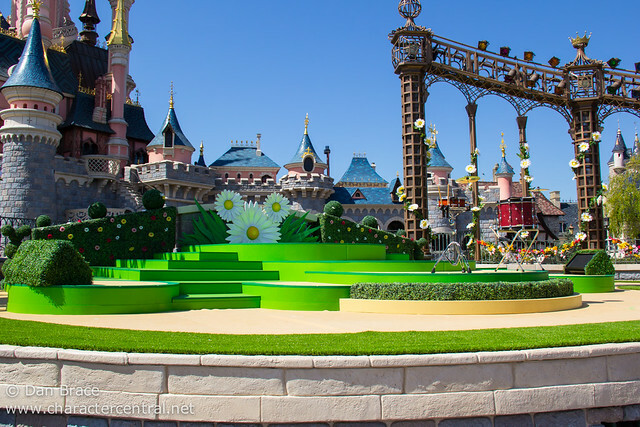 Each park has a slightly different setup for it, however, our favourite is Paris’. 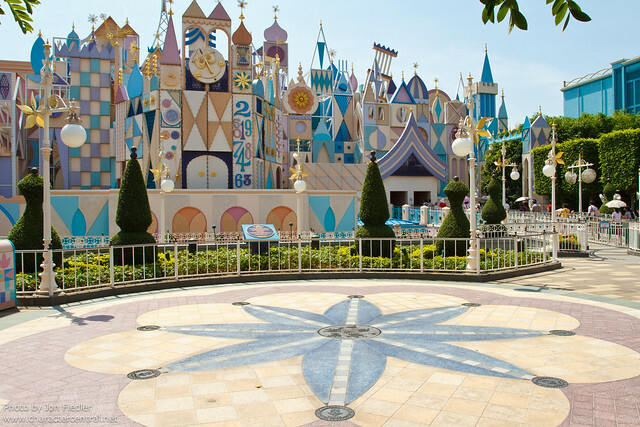 The exterior is much like California’s, but bigger, but the interior has effects not utilised in the other three versions. 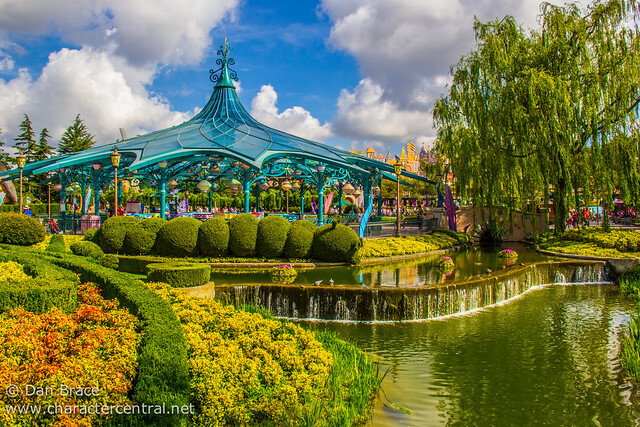 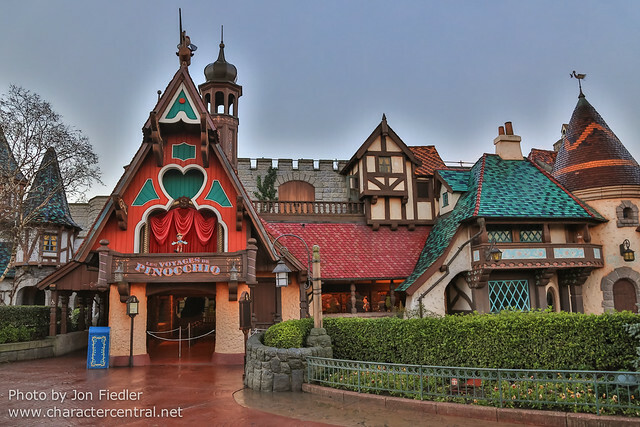 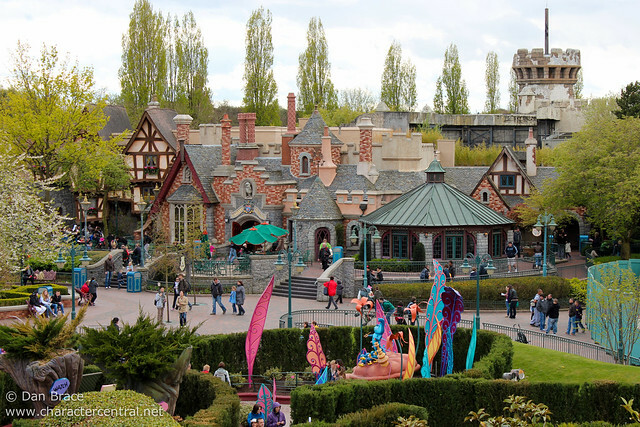 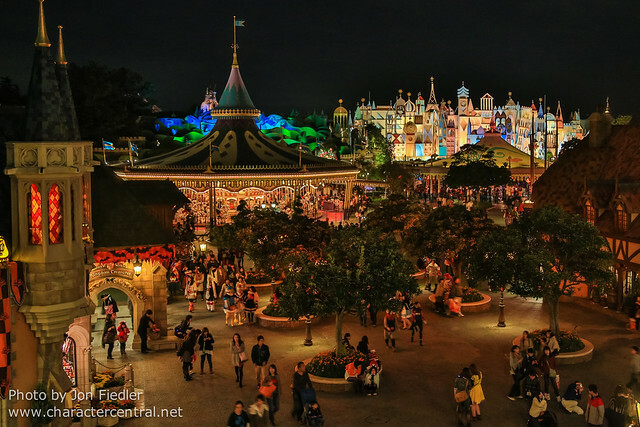 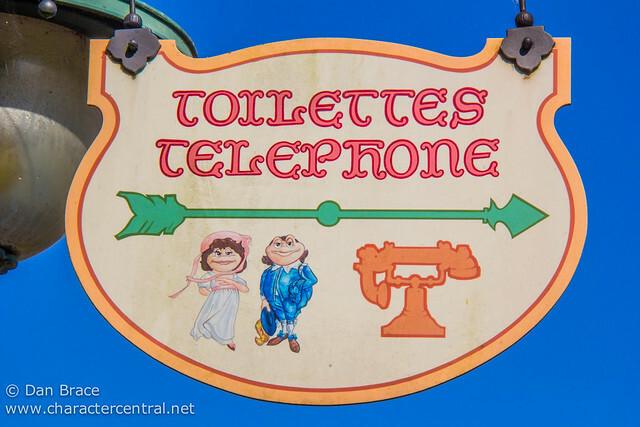 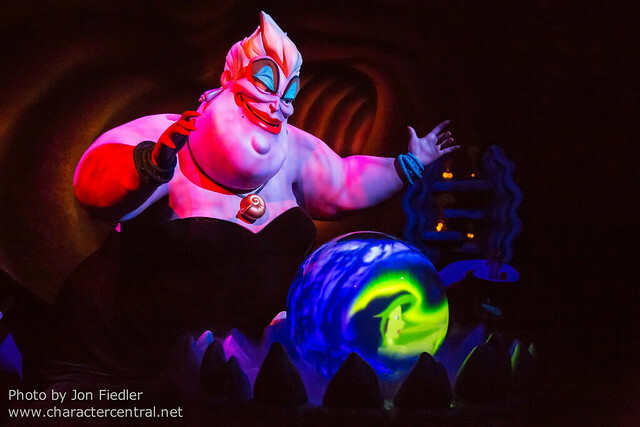 Of course, this could change with the recent overhaul of Fantasyland dark rides for Disneyland’s upcoming 60th anniversary, and Peter Pan’s Flight there may become number one for us, but for now, at least, it is Paris. 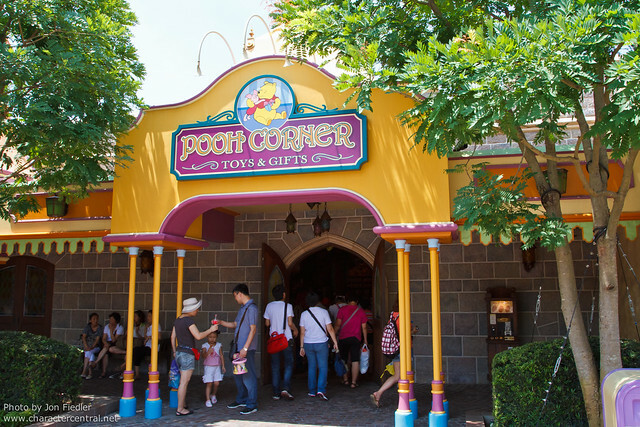 Tokyo has the weakest version of this attraction. 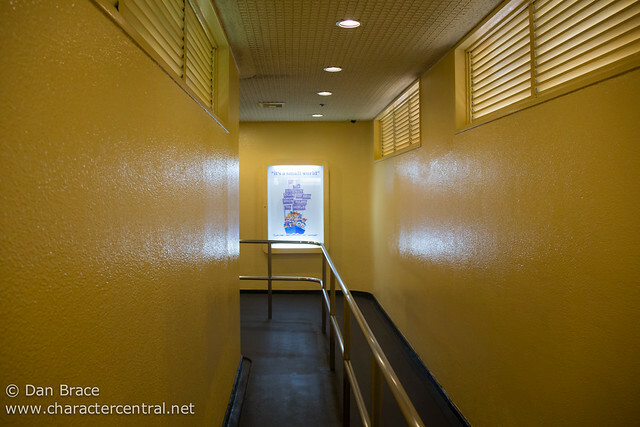 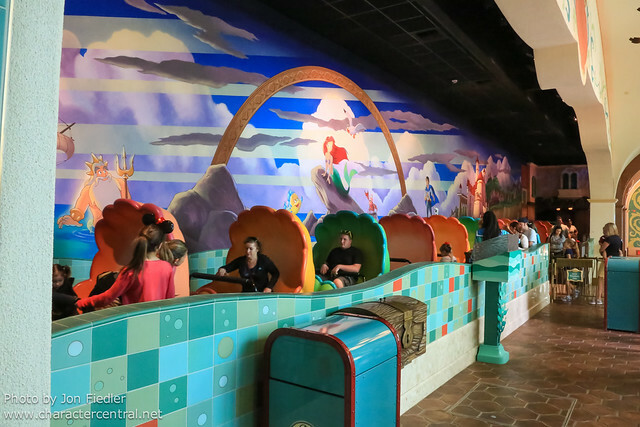 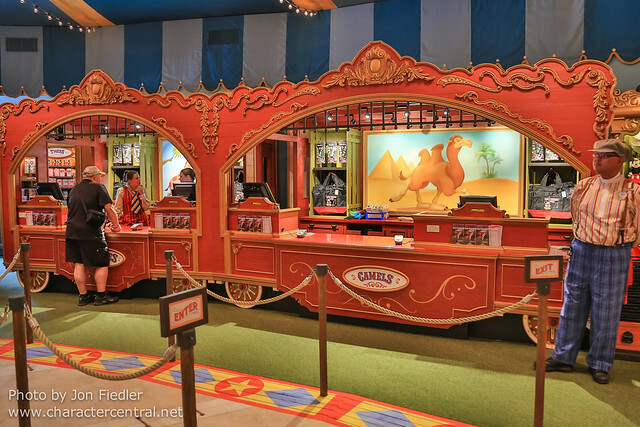 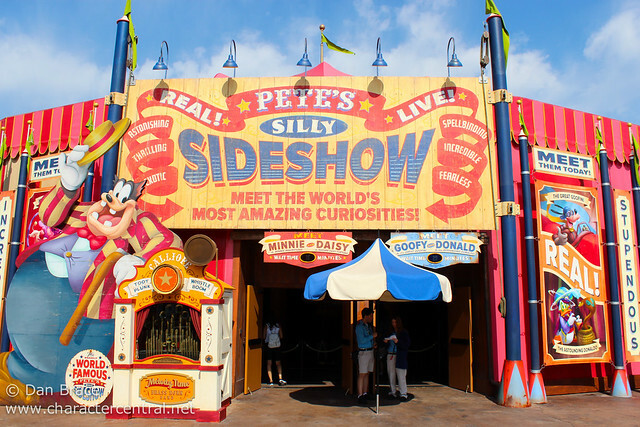 Florida just recently upgraded their indoor queue area, but the actual attraction is yet to receive any update. 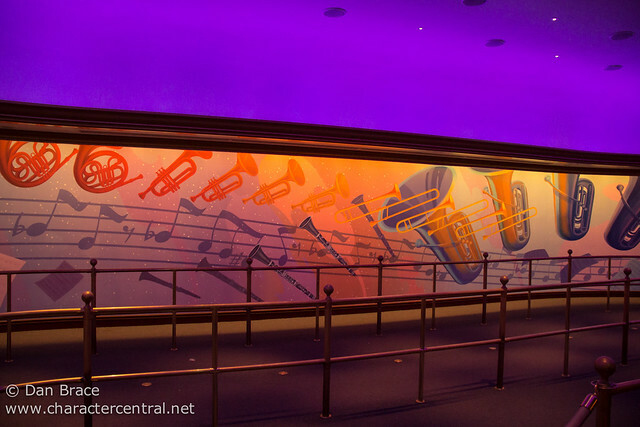 We don’t currently have any queue photos for Florida, since it is brand new, but I’ll update this post once we do. 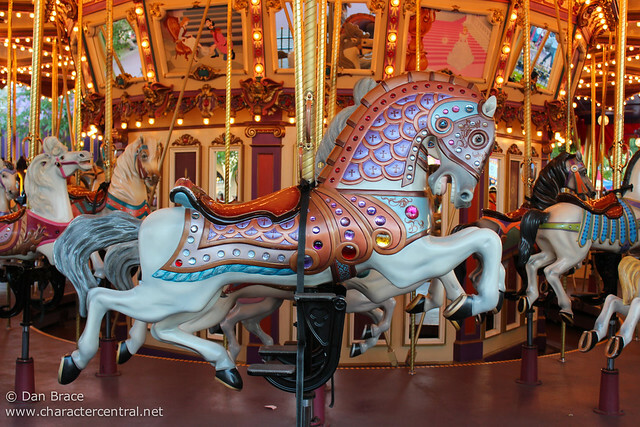 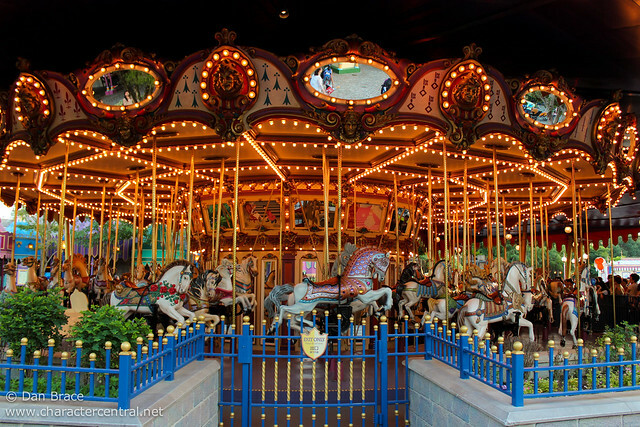 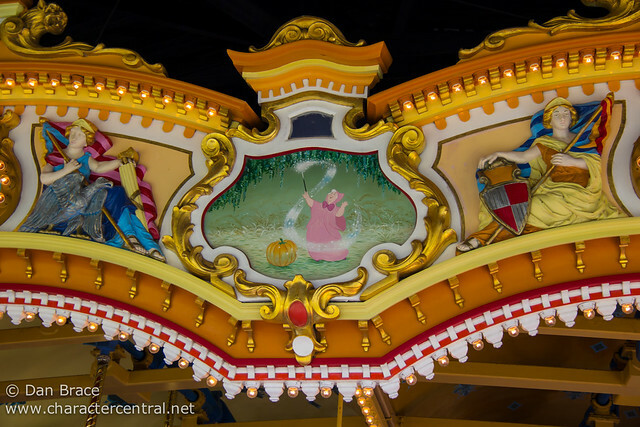 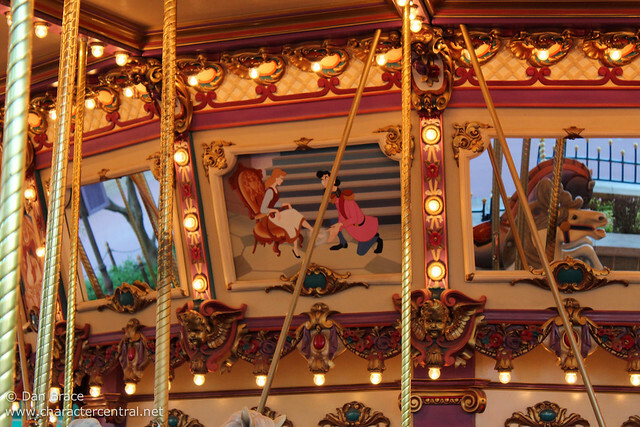 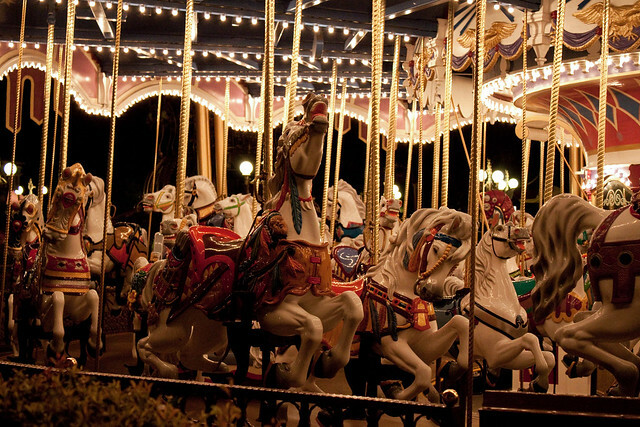 Next, we take a spin on the carousels of the world! 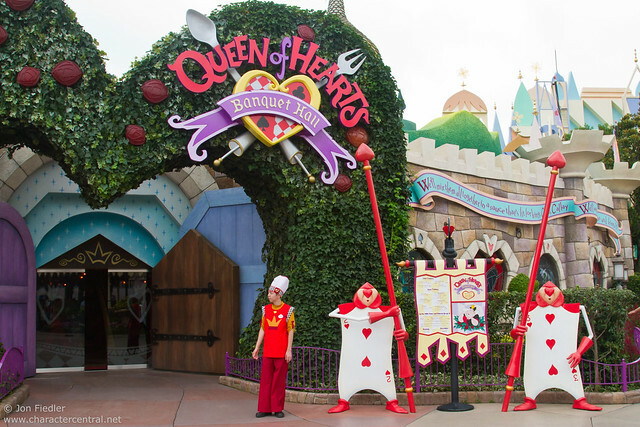 There isn’t too much to say about them overall. 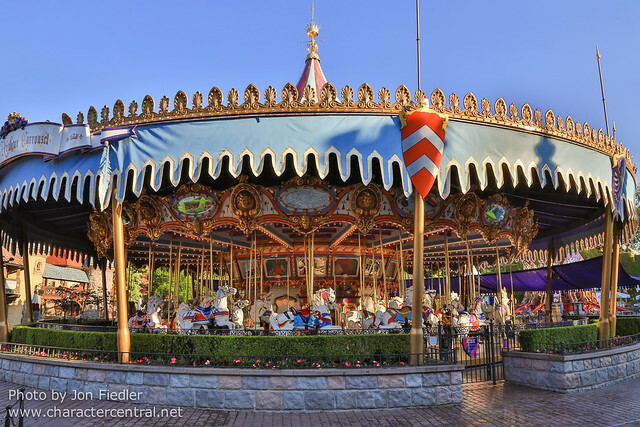 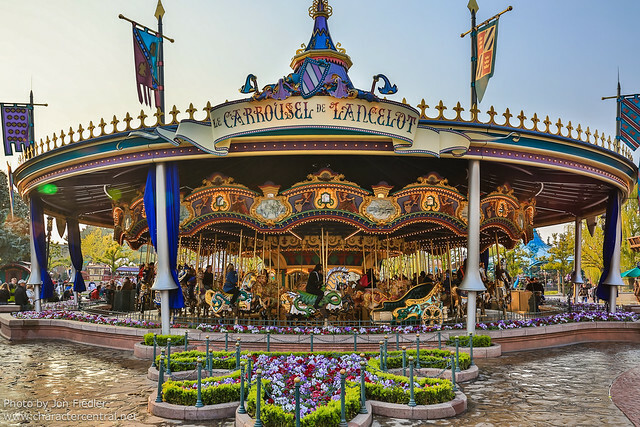 Disneyland’s has “Jingles” the “Mary Poppins” horse, which honours Julie Andrews, and is generally prettier than the others, except Paris’, which is quite ornate. 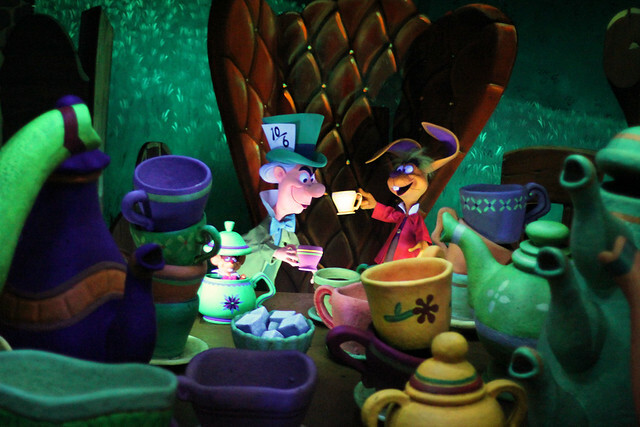 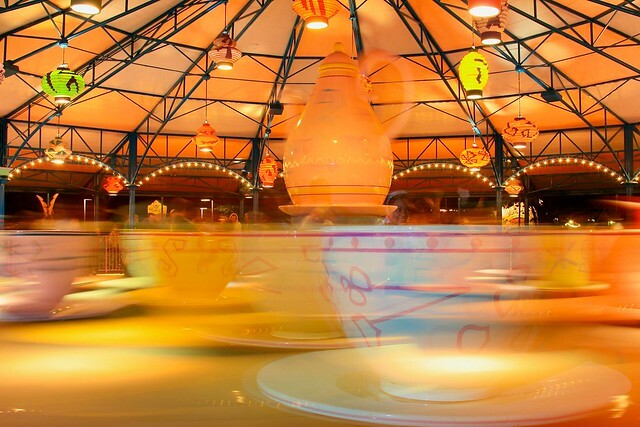 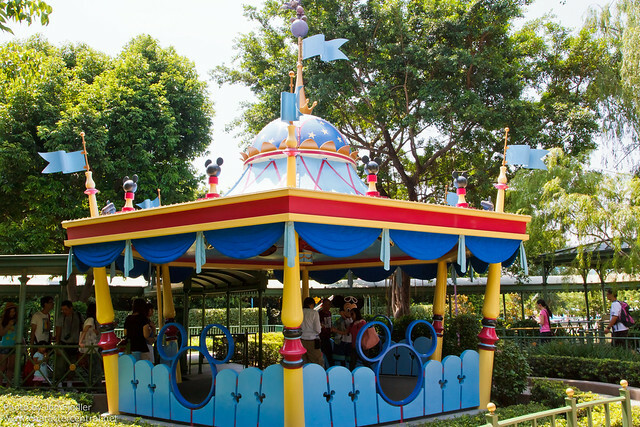 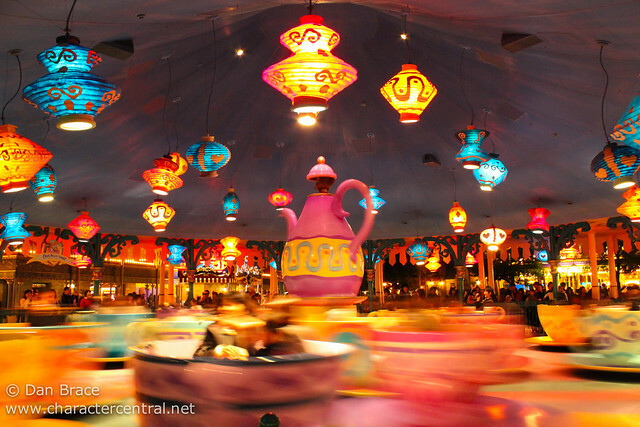 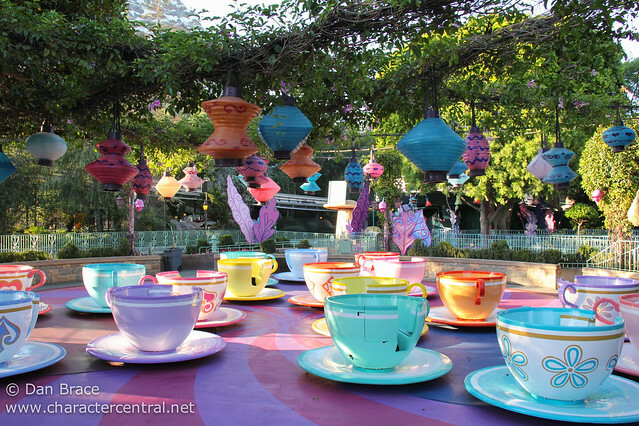 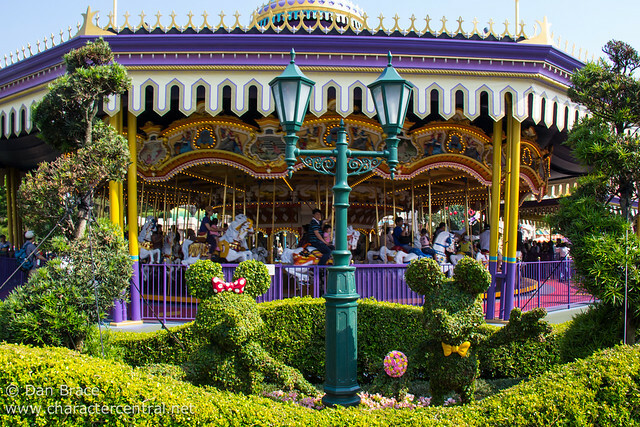 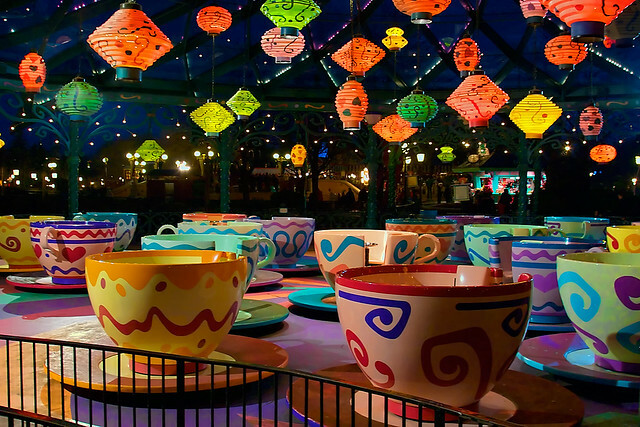 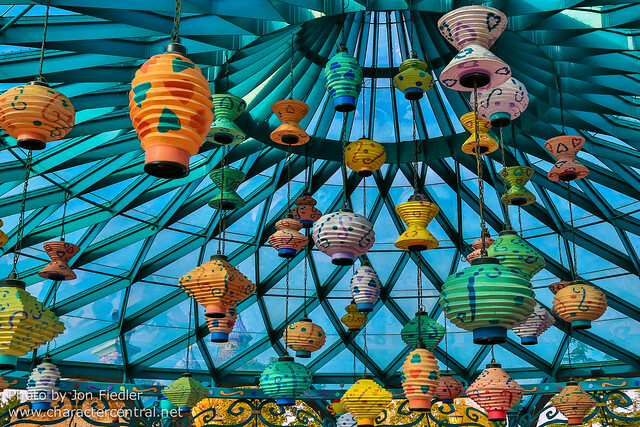 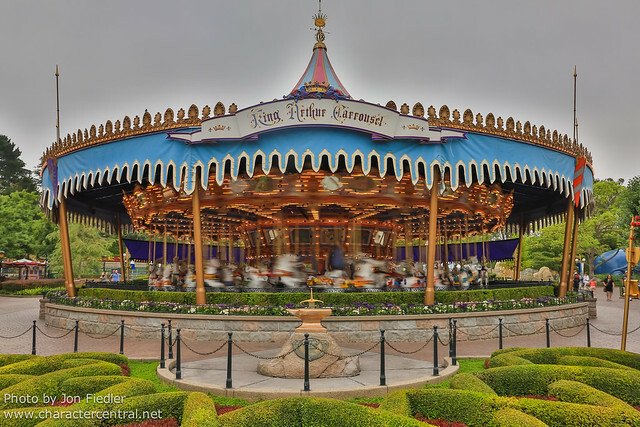 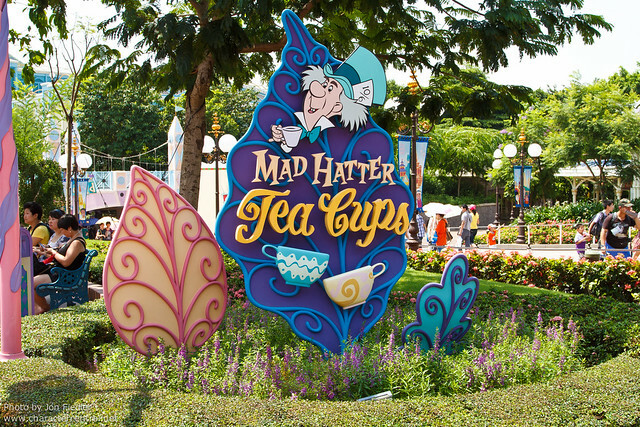 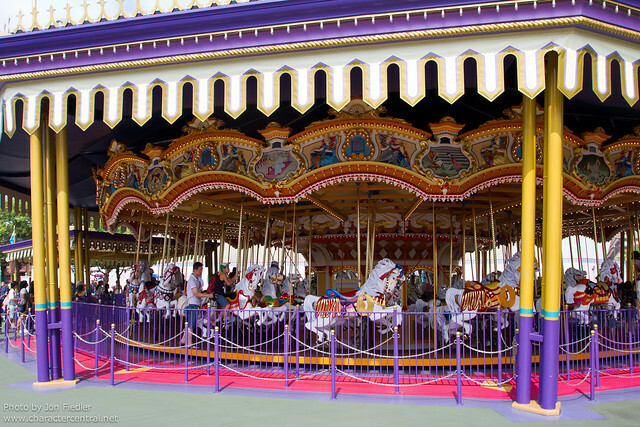 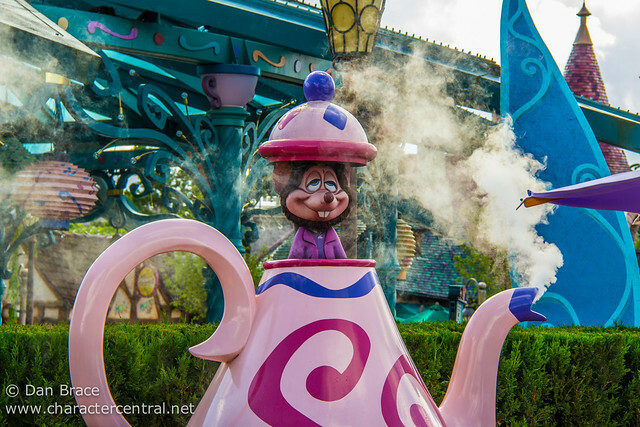 Let’s take a twirl on another spinning attraction, the tea cups! 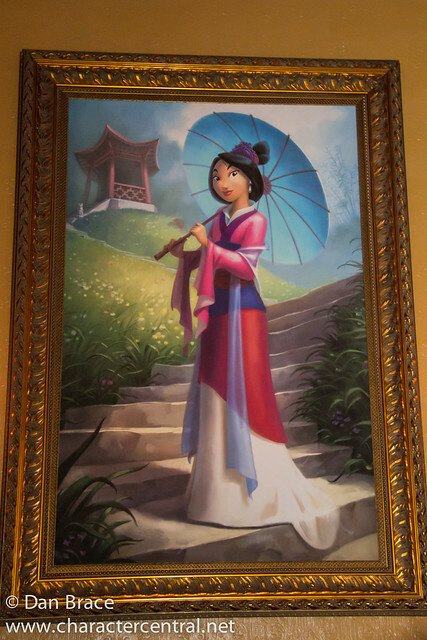 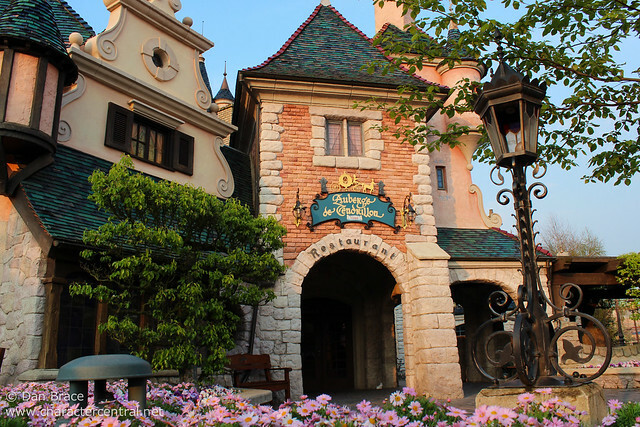 By far the prettiest versions are Disneyland and Disneyland Paris’, equally, followed by Hong Kong. 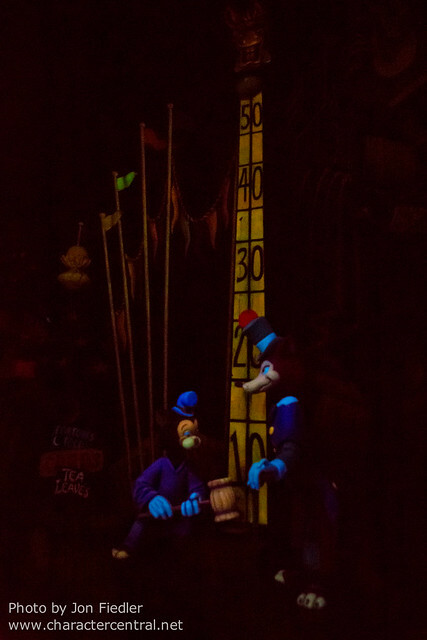 Tokyo would be near the bottom, but Magic Kingdom is by far the weakest version of this popular attraction. 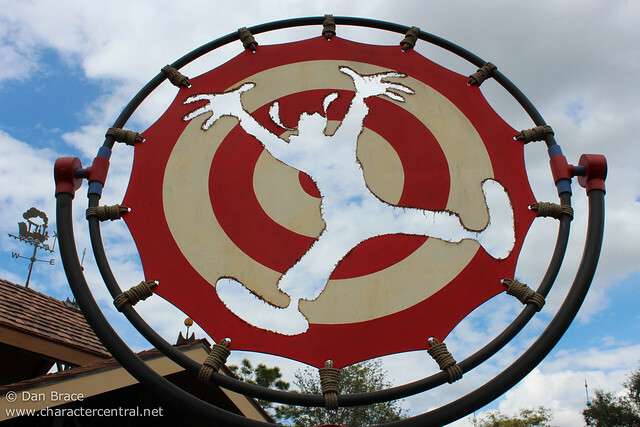 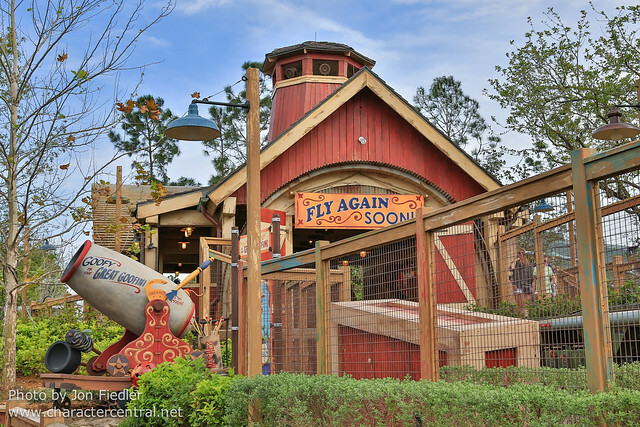 As if two spinning attractions wasn’t enough, we have one more to come! 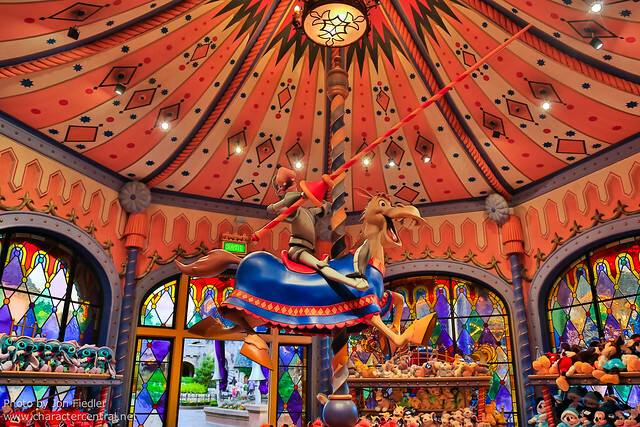 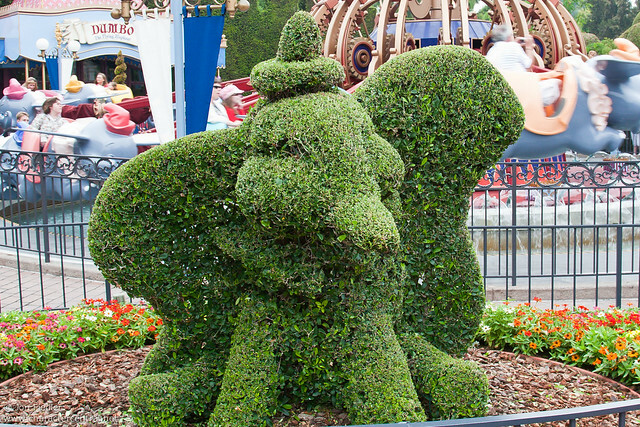 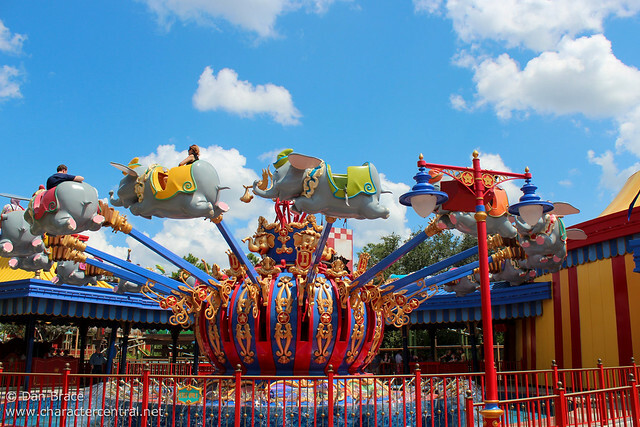 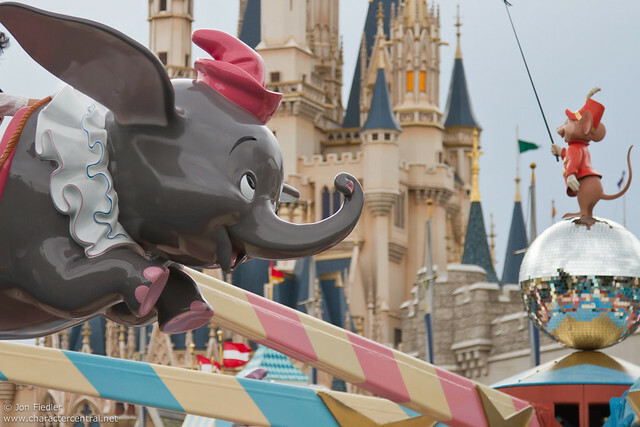 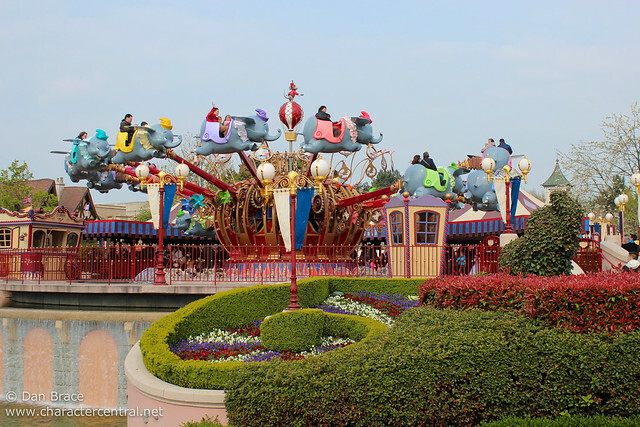 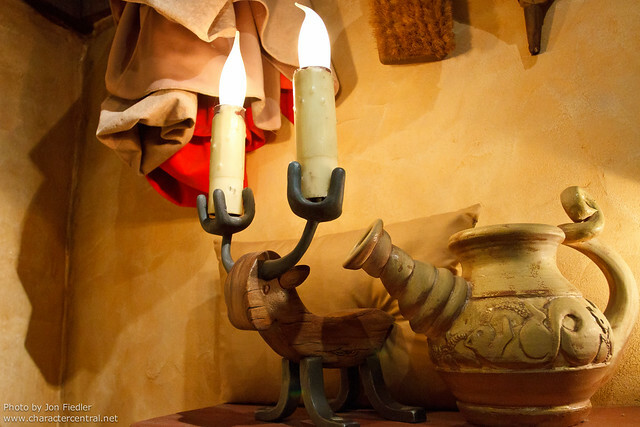 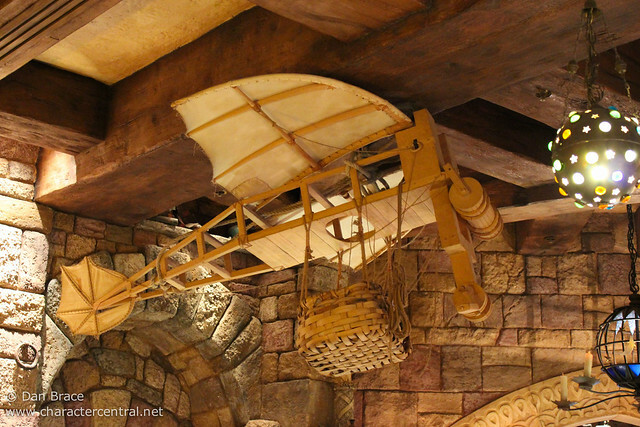 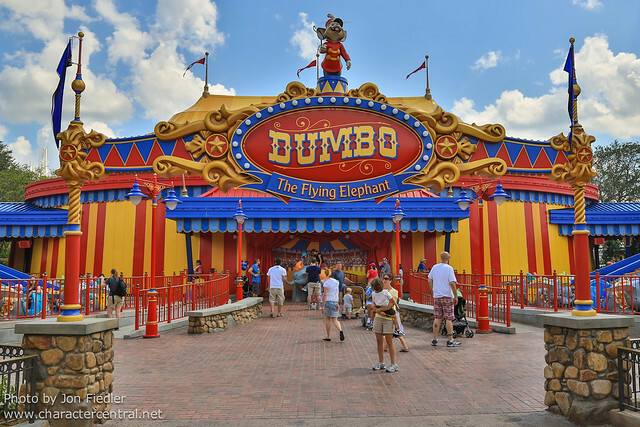 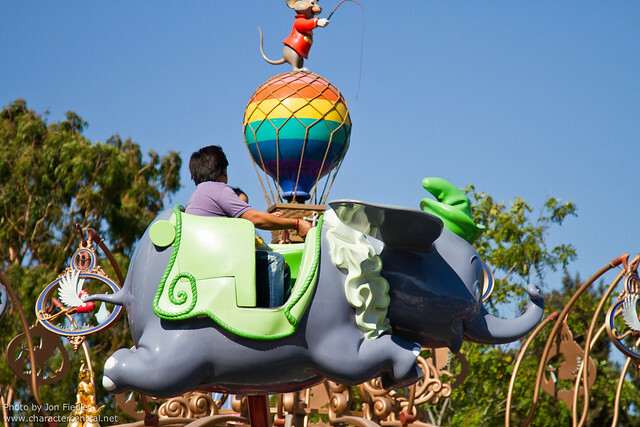 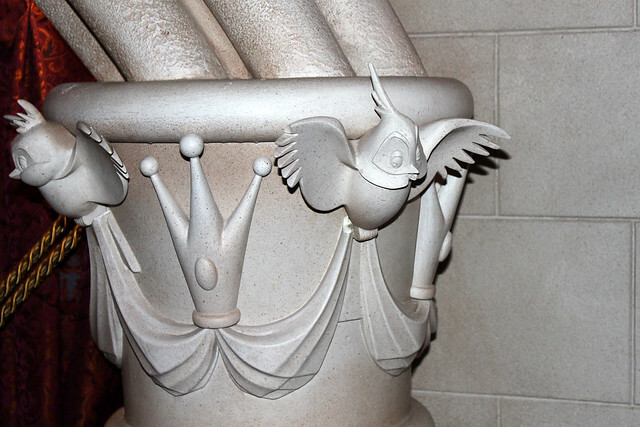 Dumbo the Flying Elephant is also featured at all five Kingdoms, with varying degrees detail. 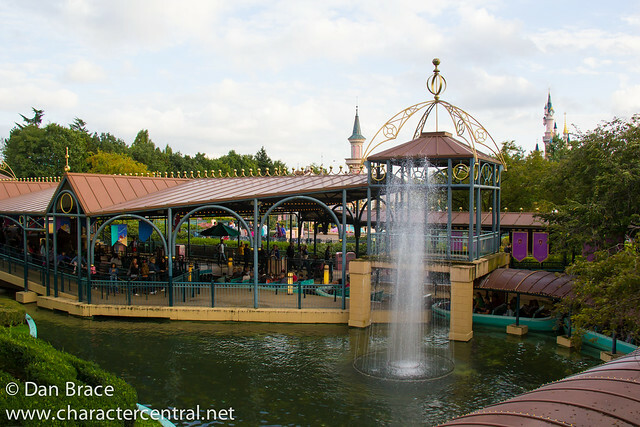 Paris definitely has the edge, being situated atop a raised platform, with a waterfall surrounding it, giving excellent views over the land. 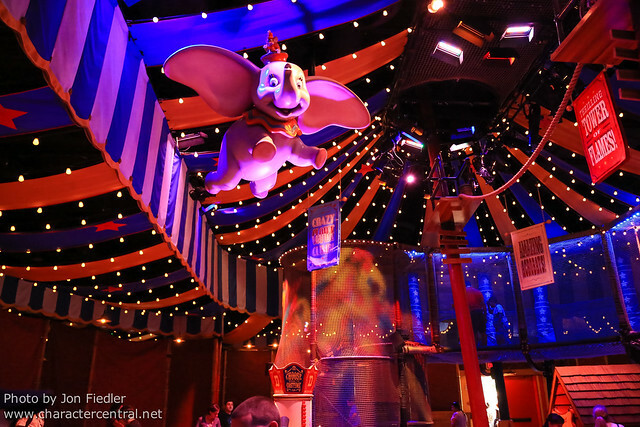 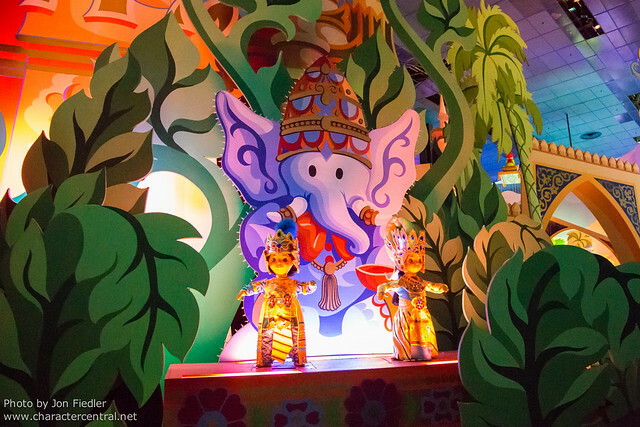 Magic Kingdom’s “dueling” Dumbos don’t necessarily have that same edge, but they do have a cool circus tent filled with fun interactive experiences. 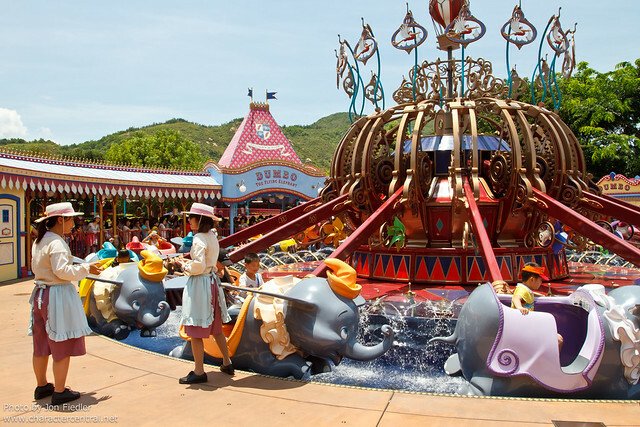 Dumbo in California and Hong Kong are simply “in the land”, and while not being bad, they aren’t “special” either. 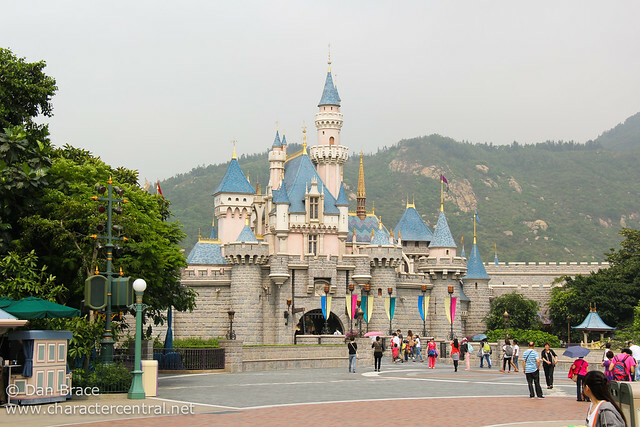 Having said that, personally I think California’s is situated better than Hong Kong’s,, but that’s just me. 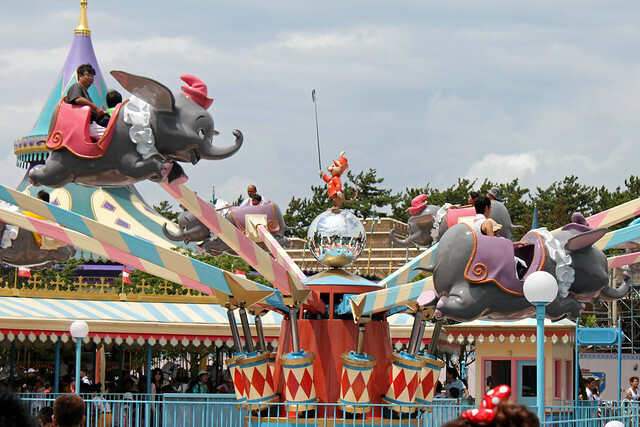 Tokyo has unfortunately suffered for decades with the old 8-arm Dumbo and nothing about it is pleasing to the eye. 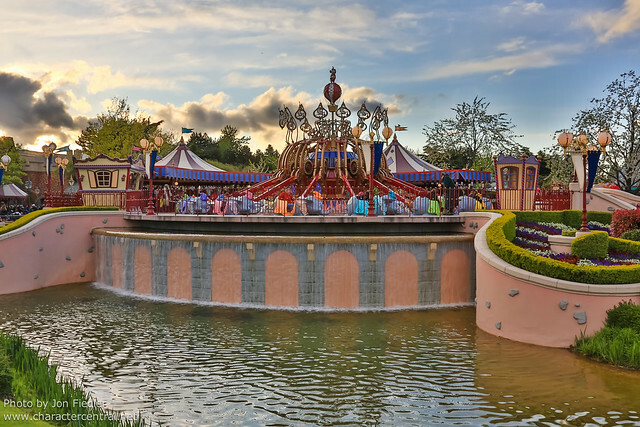 With that said, their new Fantasyland overhaul and expansion shall hopefully fix that. 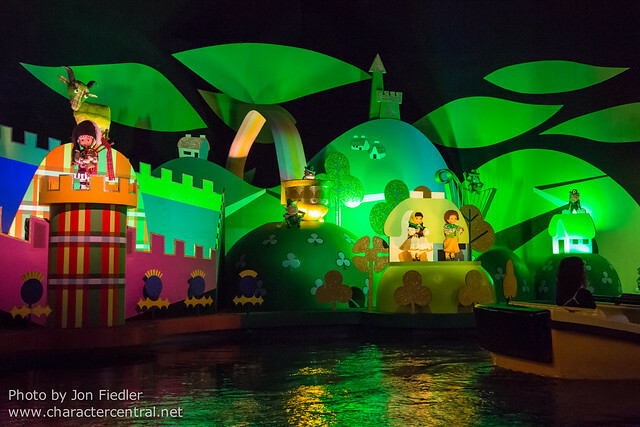 After all that dizzying motion, we should take a cruise aboard a little boat around the world! 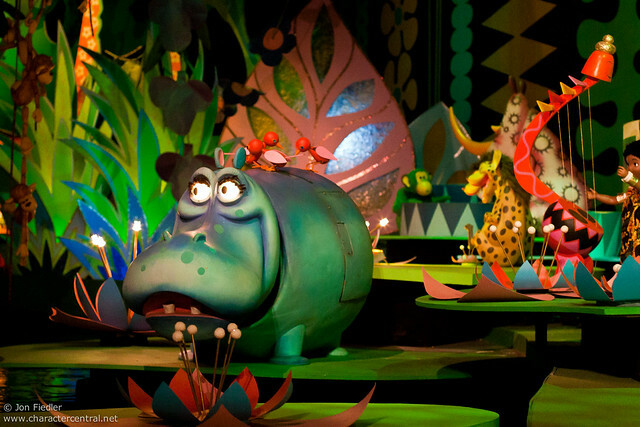 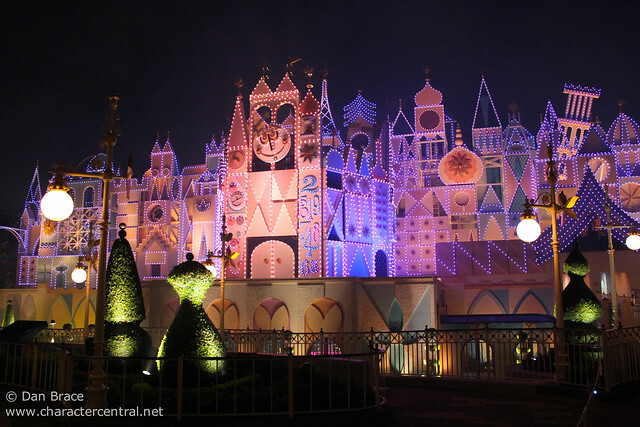 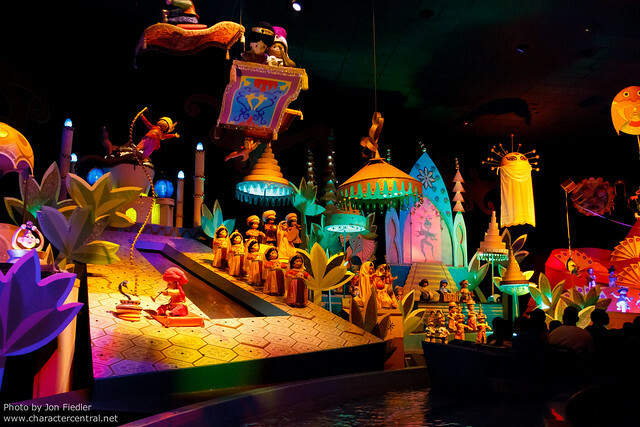 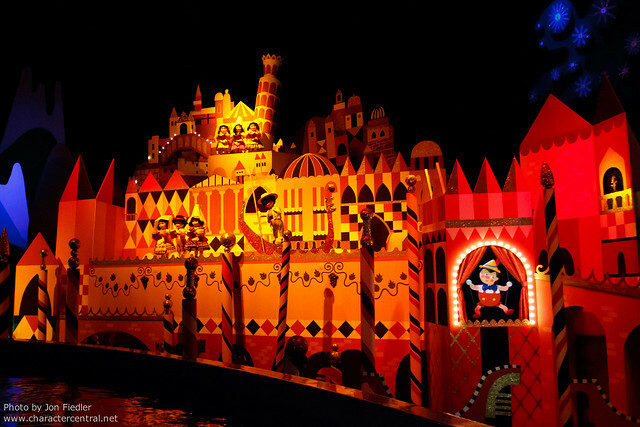 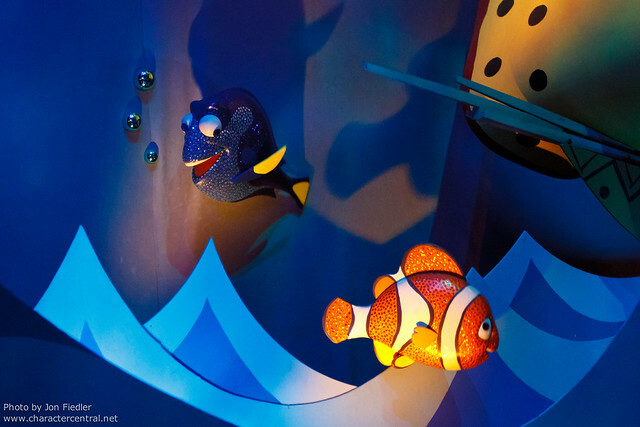 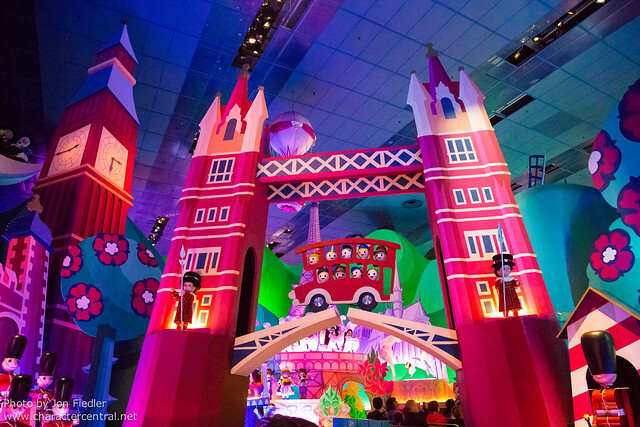 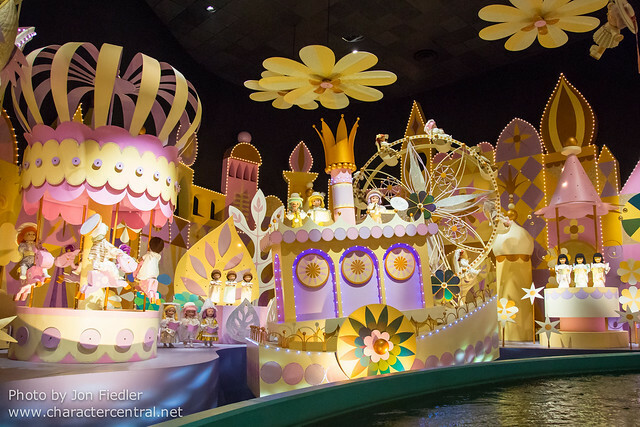 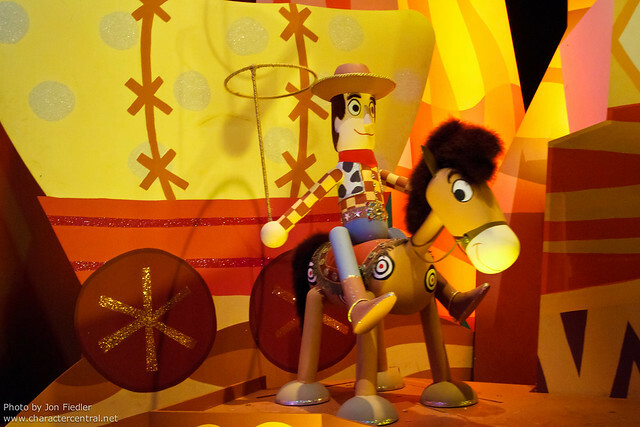 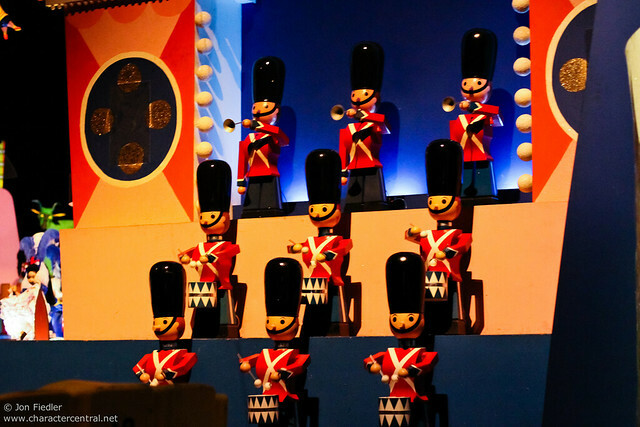 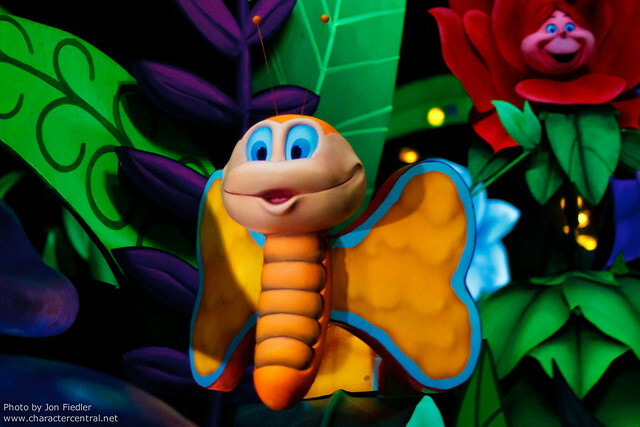 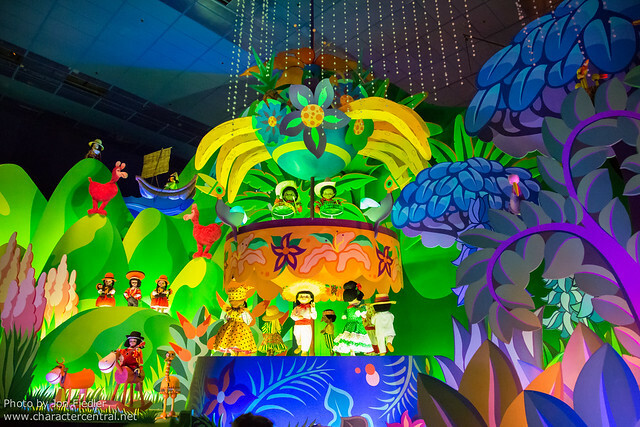 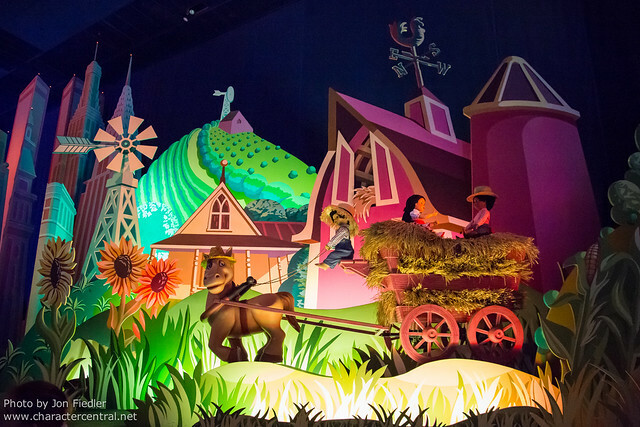 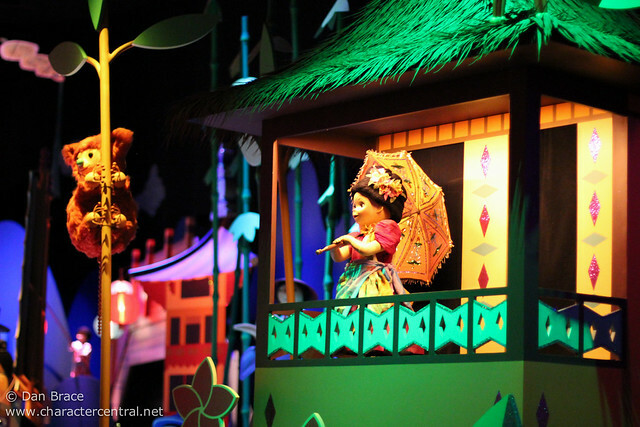 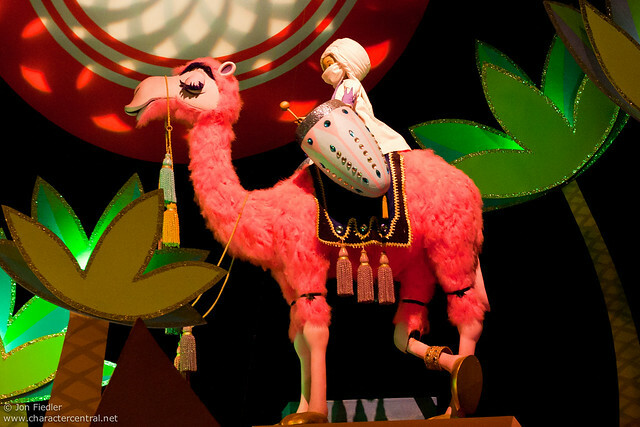 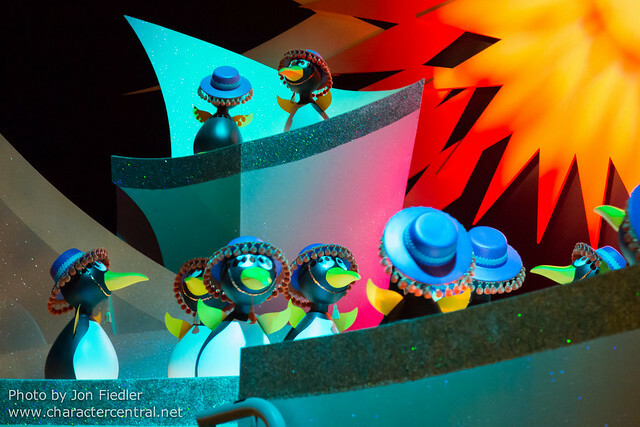 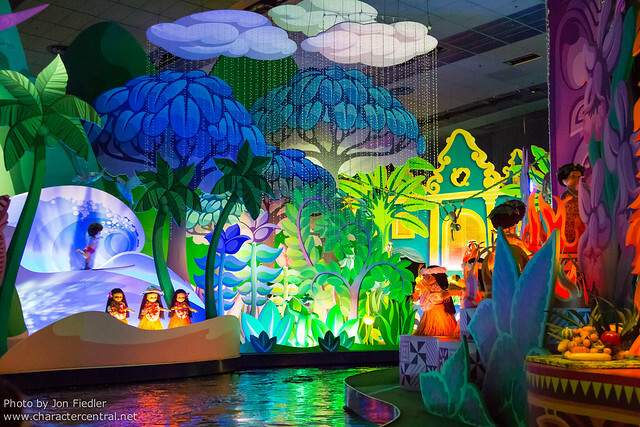 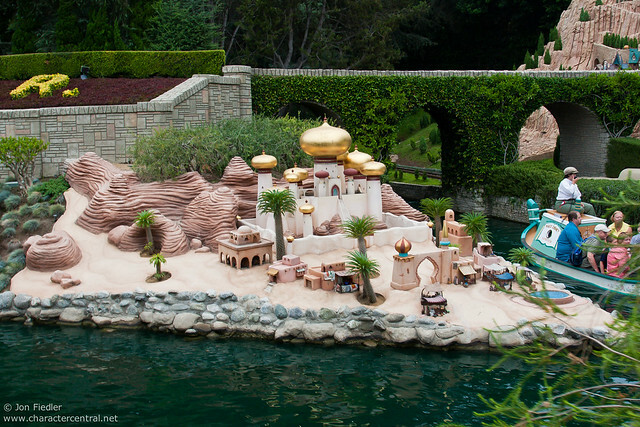 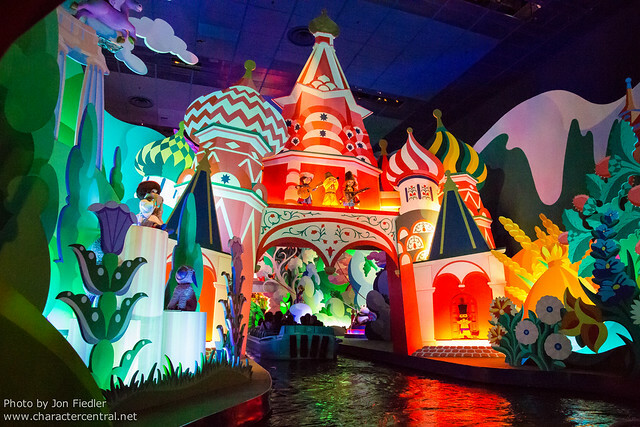 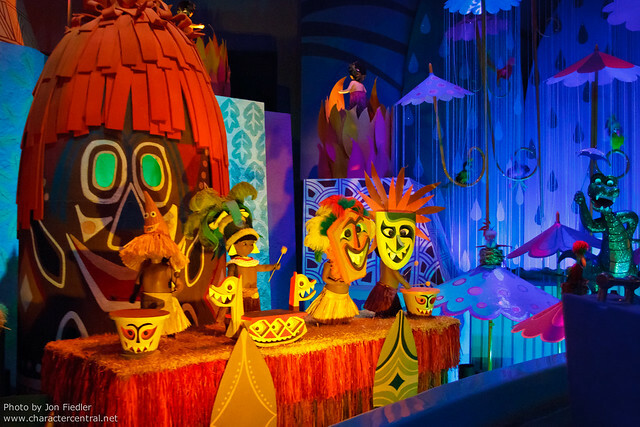 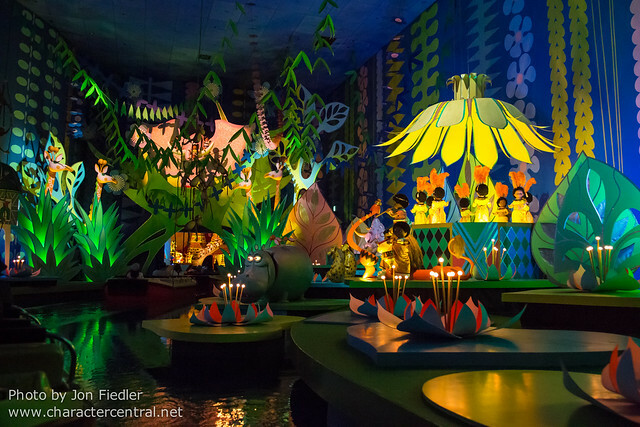 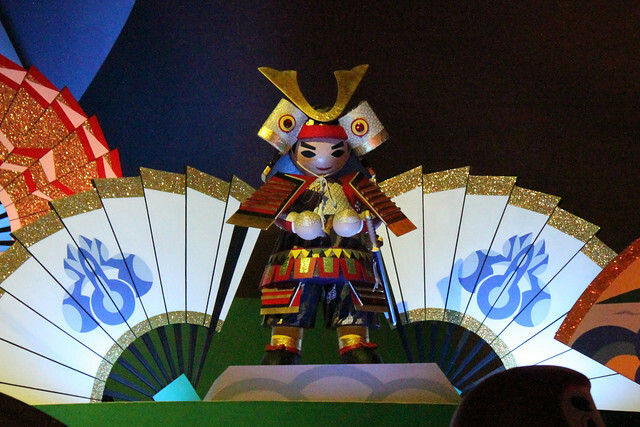 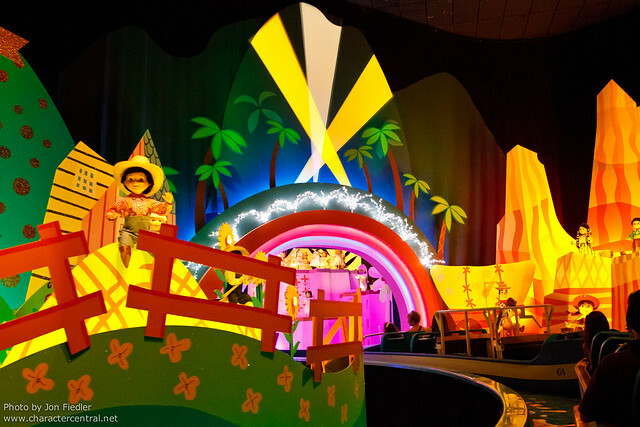 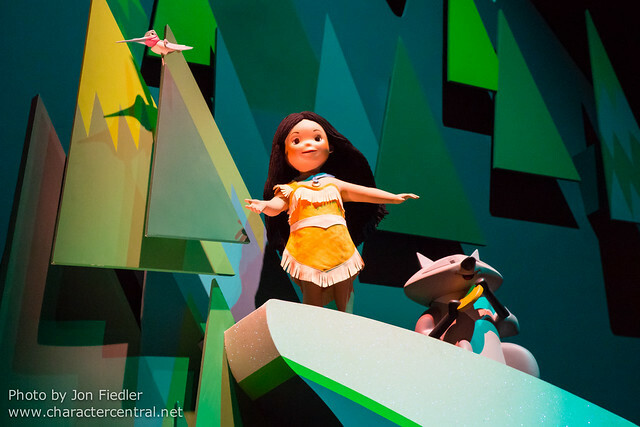 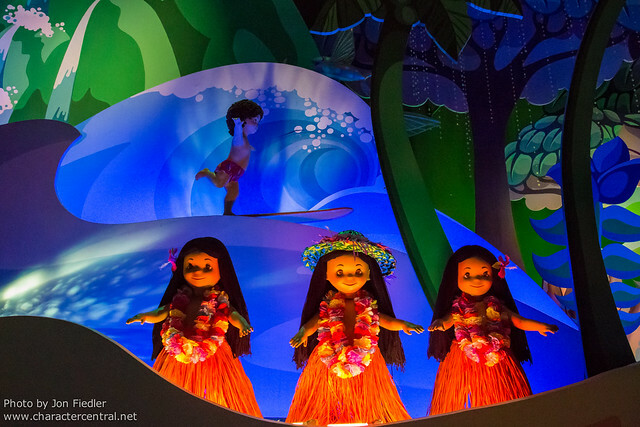 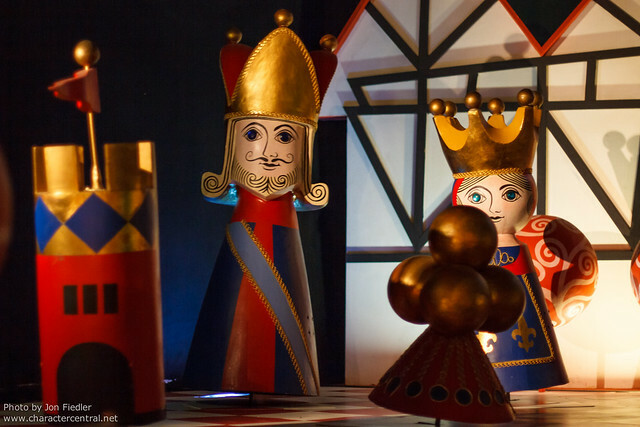 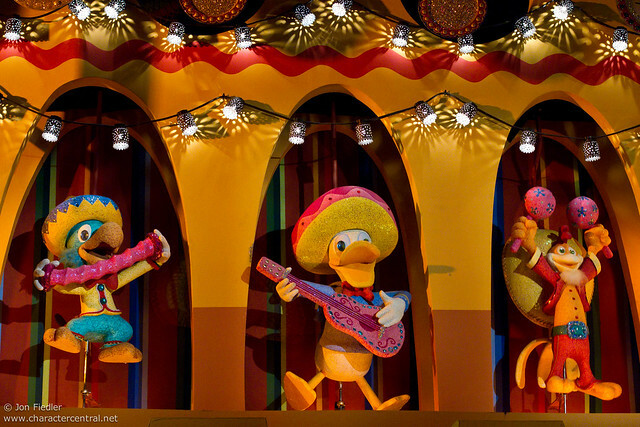 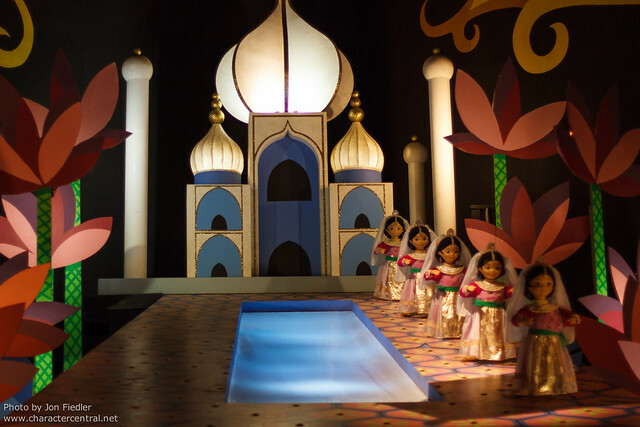 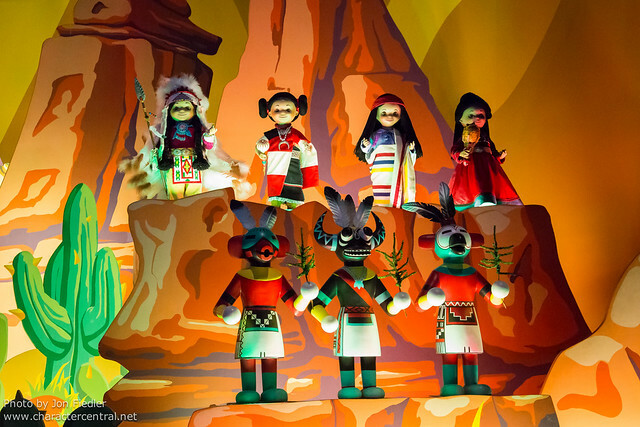 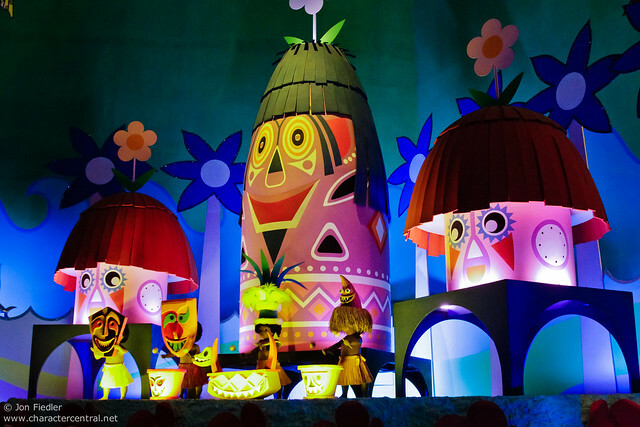 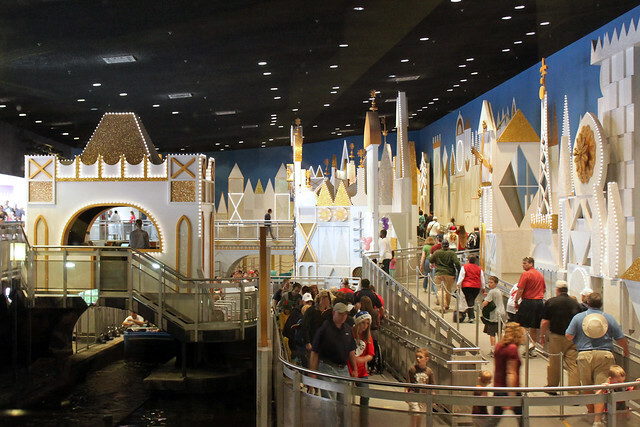 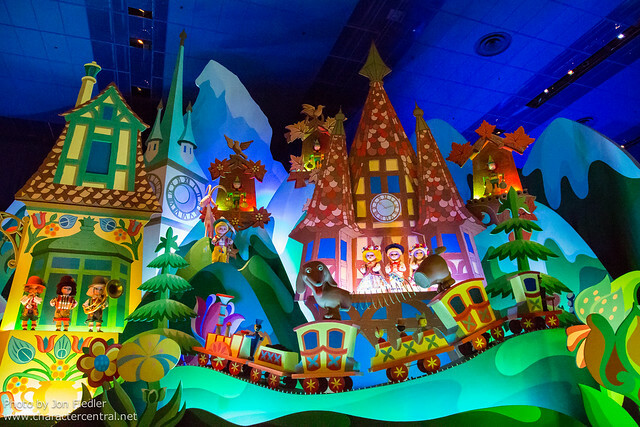 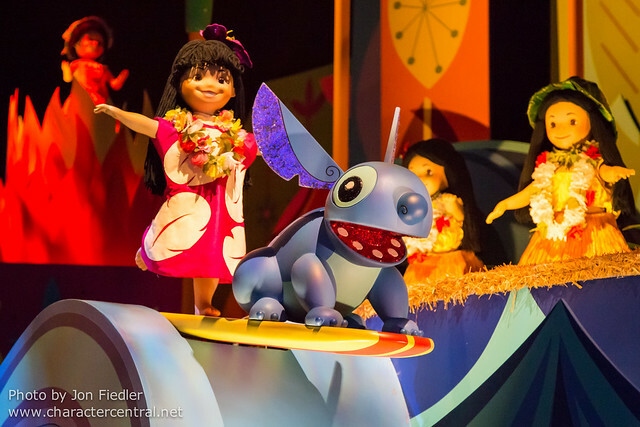 “it’s a small world” is a classic Disney attraction, beloved by millions of fans across the world. 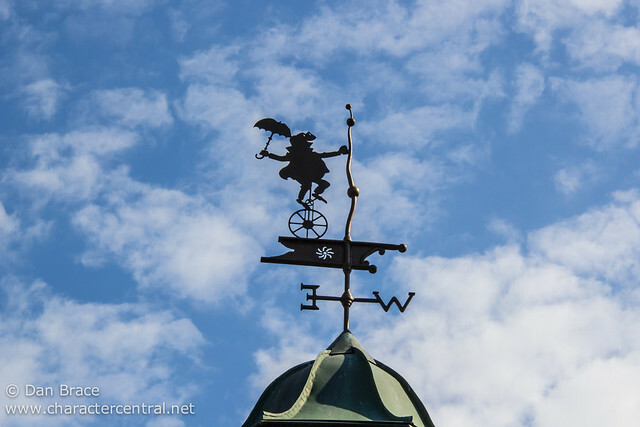 There are many varying opinions on this one, and I respect that everyone has a different view. 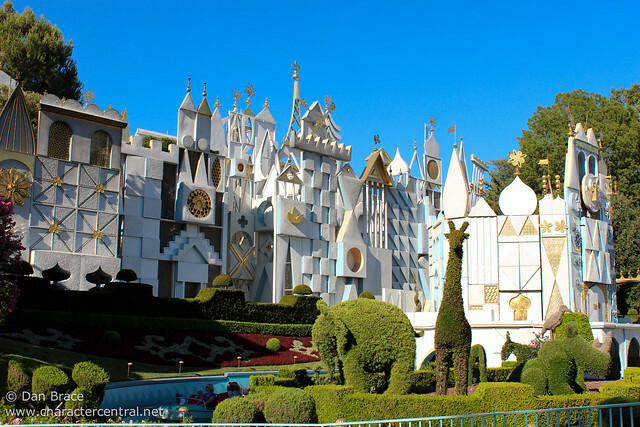 Disneyland in California of course houses the original version of this attraction, which was designed by Disney Legend, Mary Blair. 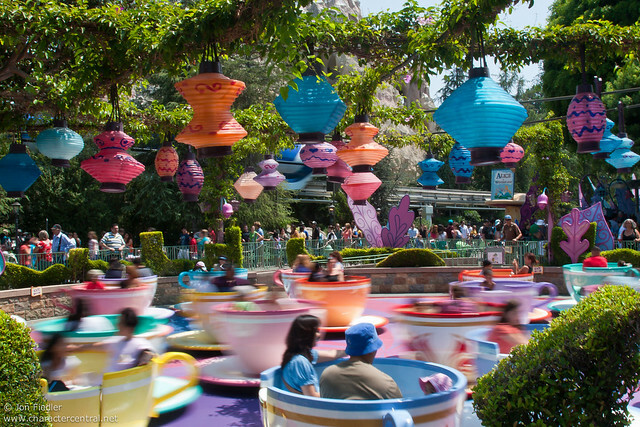 I like how colourful Disneyland’s is, and I like having the characters in it. 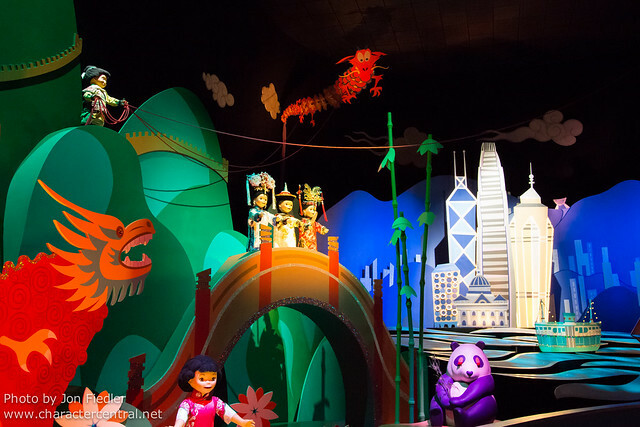 For the same reason, I like Hong Kong’s version, which, as well as being colourful and having characters, has some different scenes not installed anywhere else. 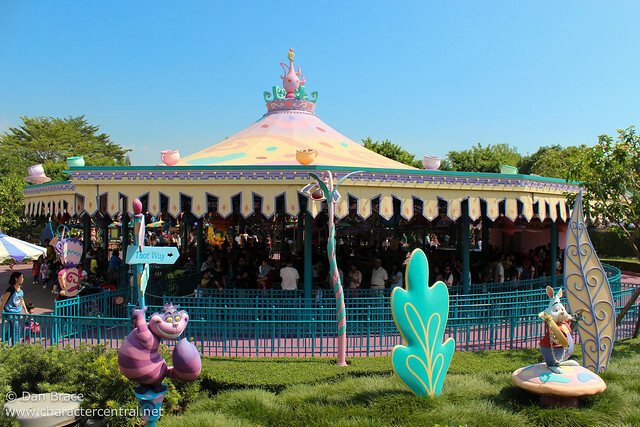 Paris, again, is colourful, but does not have the characters. 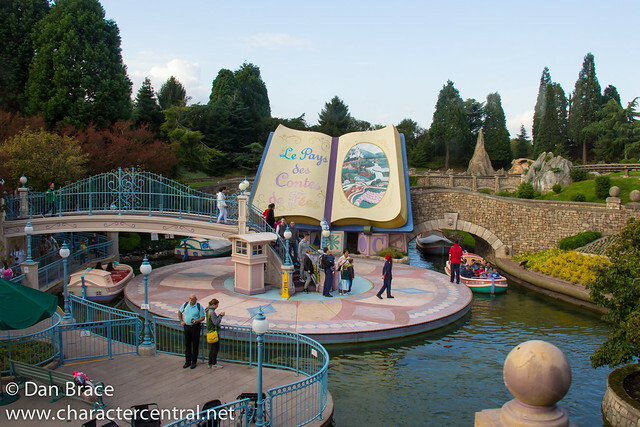 I also like how Paris doesn’t have the “canal” through the attraction, but rather the “shoreline” meets the water in each scene. 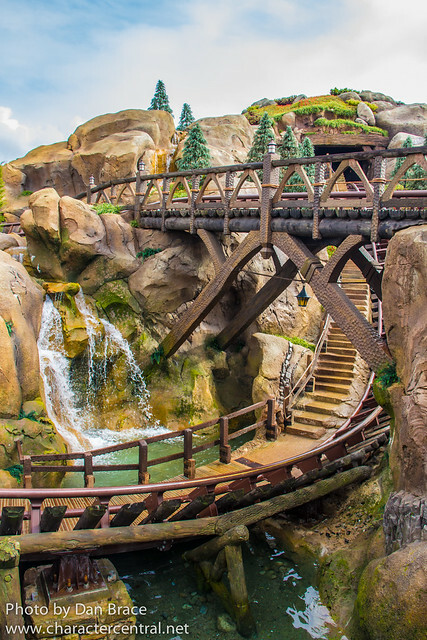 It’s a little tricky to explain, but the way the water weaves through the attraction is different, and makes it easier to see the scenes (you’d need to ride them consecutively to really know what I mean, I think). 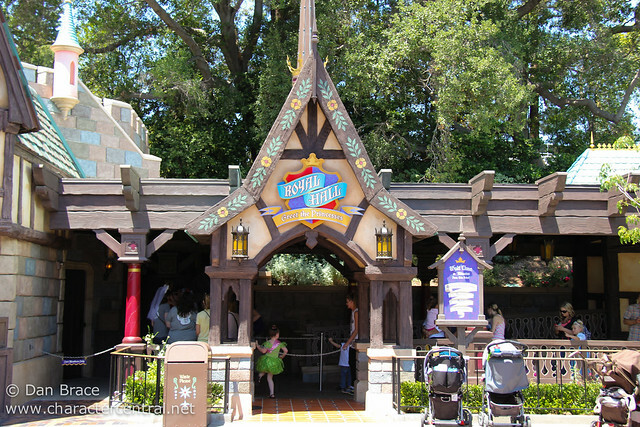 Florida’s version I have always found rather uninspired, with the ren-faire tent entrance, and indoor queue area. 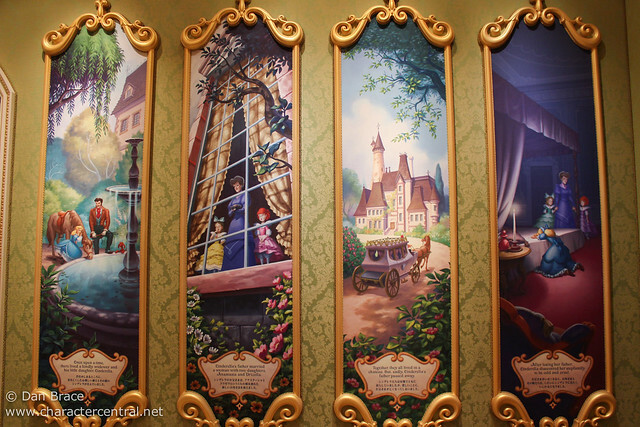 The scenes aren’t as detailed, nor as colourful as the three versions I just mentioned. 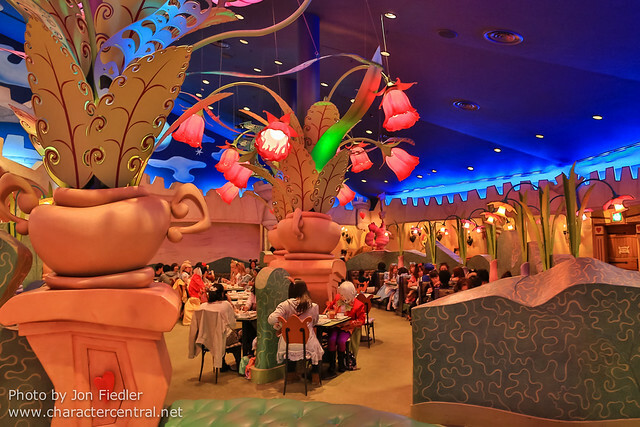 Tokyo does have a better facade than Florida, however, the interior is dire. 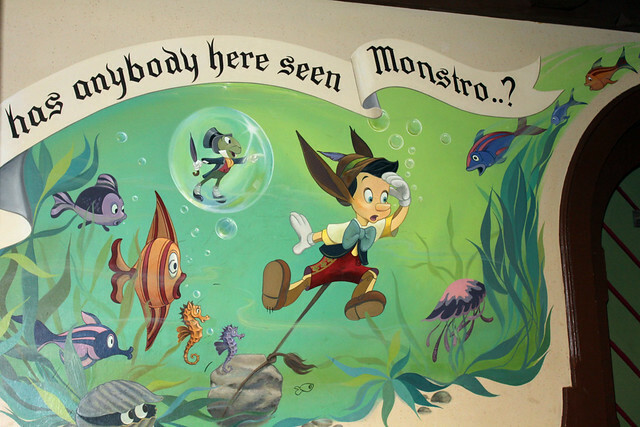 It is by far the weakest version. 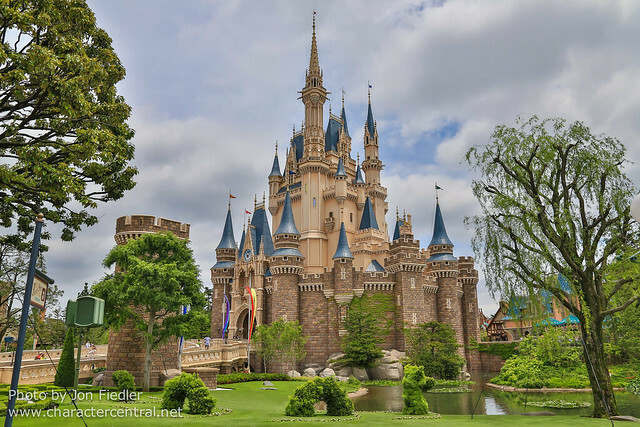 Although few details have been released yet, it appears that the Tokyo version will either move or get some huge overhaul (or both even) when they start work on their new Fantasyland. 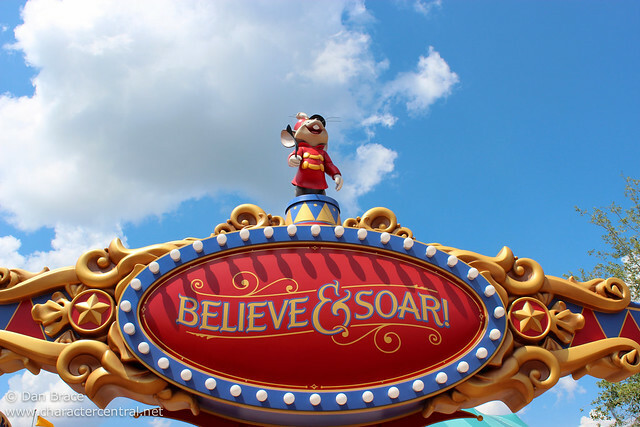 Let’s hope the changes are positive. 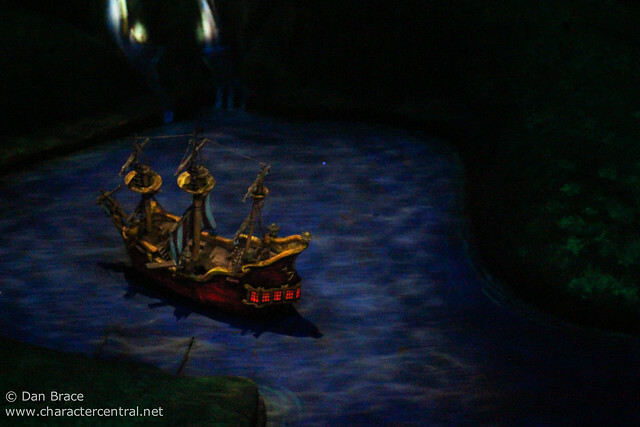 Let’s step aboard our ship, and take a cruise through each one. 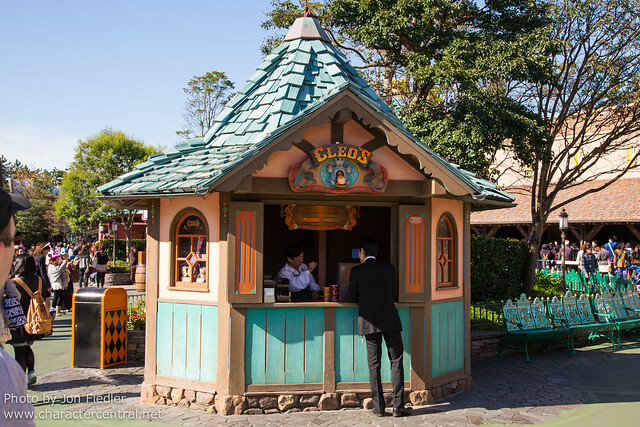 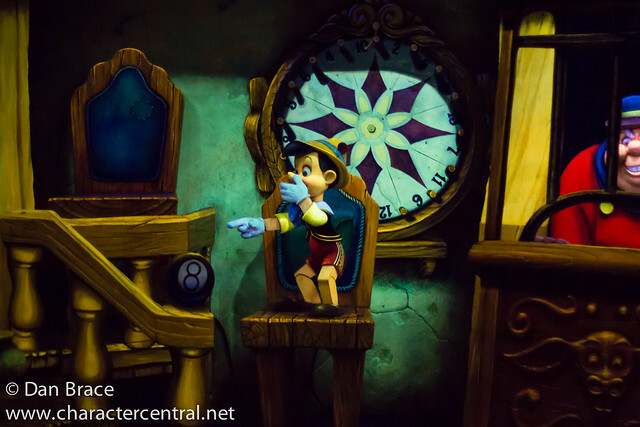 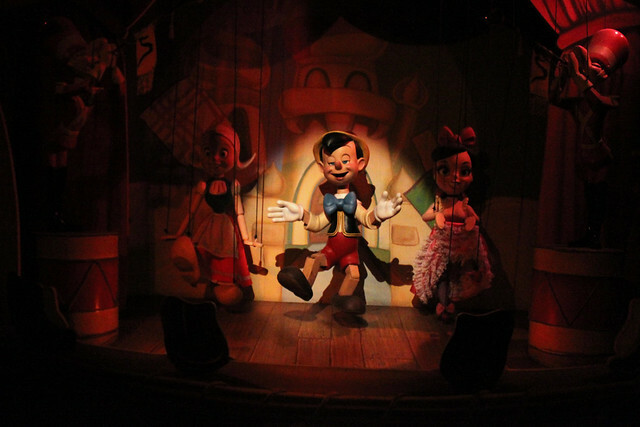 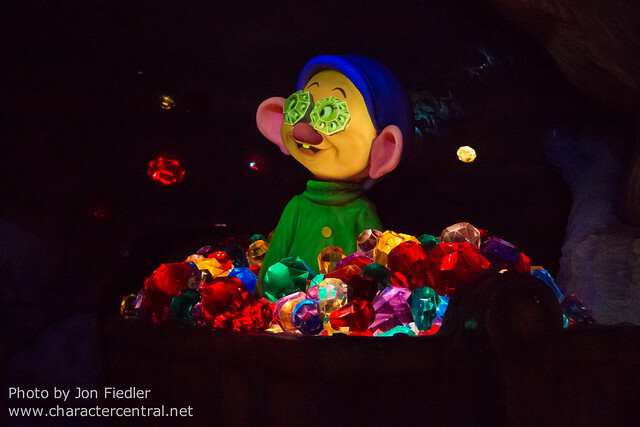 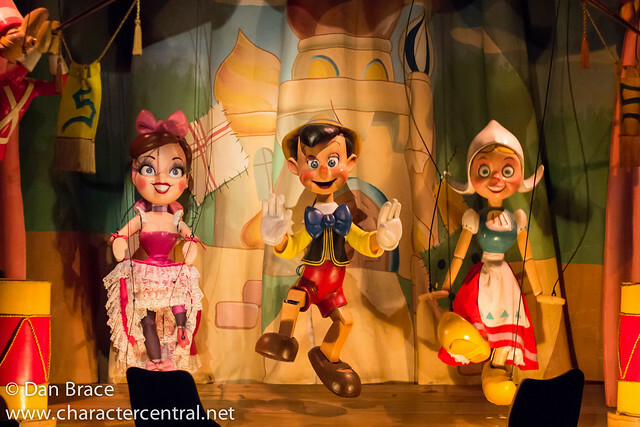 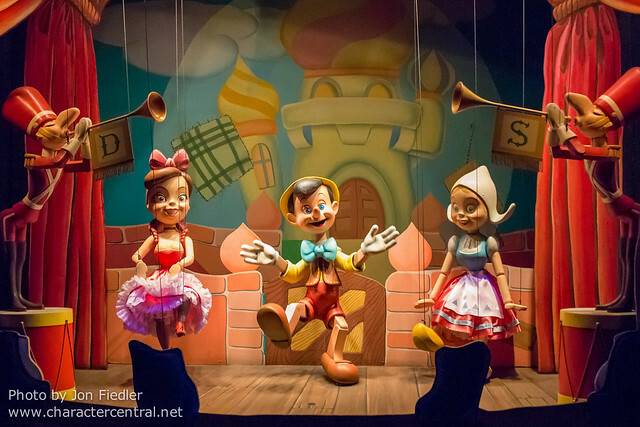 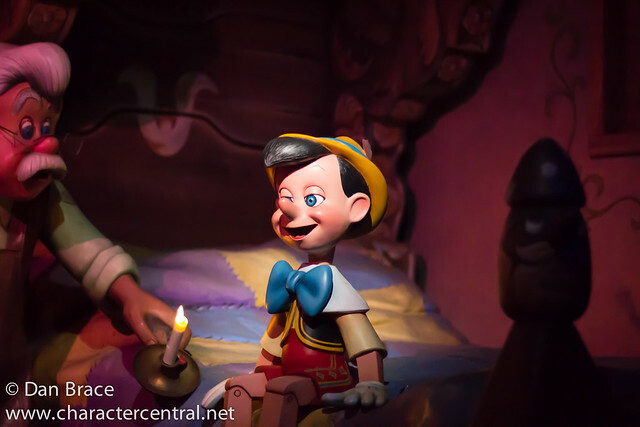 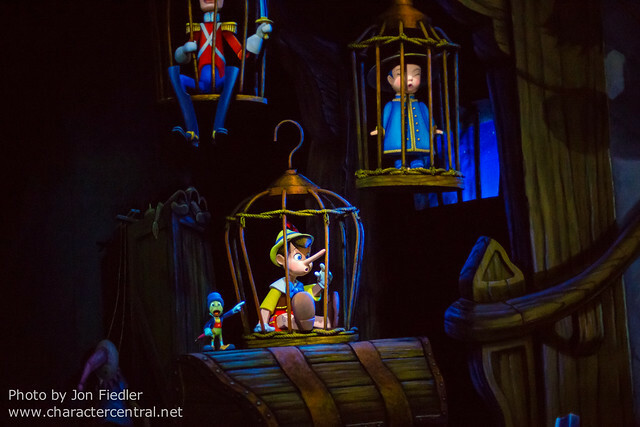 At Disneyland, Disneyland Paris and Tokyo Disneyland, we can take a trip to Pleasure Island with Pinocchio and his friends, in the Pinocchio attraction at those parks. 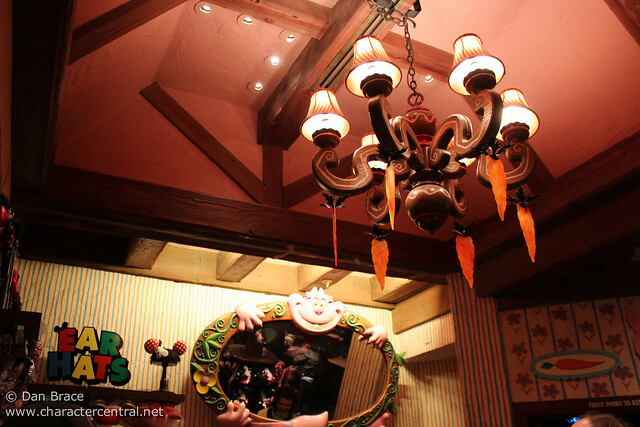 Overall, each version is pretty much the same, but as always, things can be slightly different. 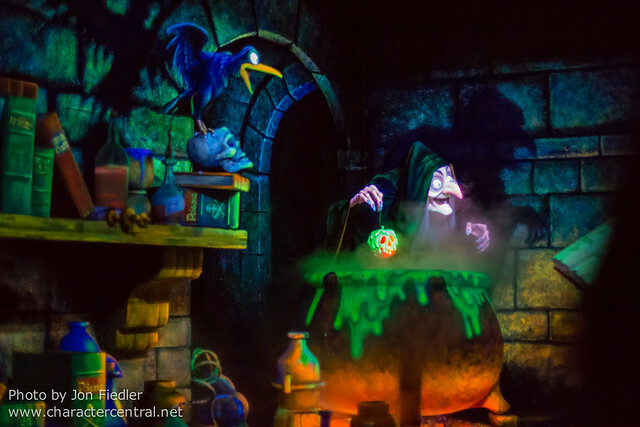 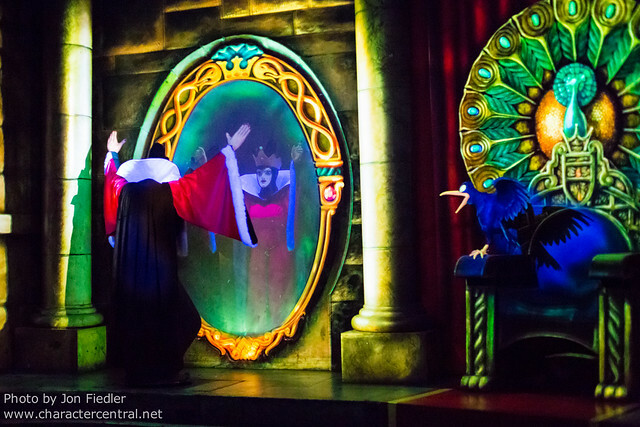 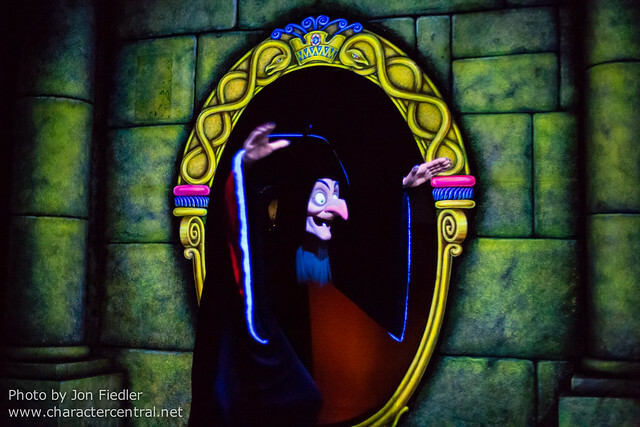 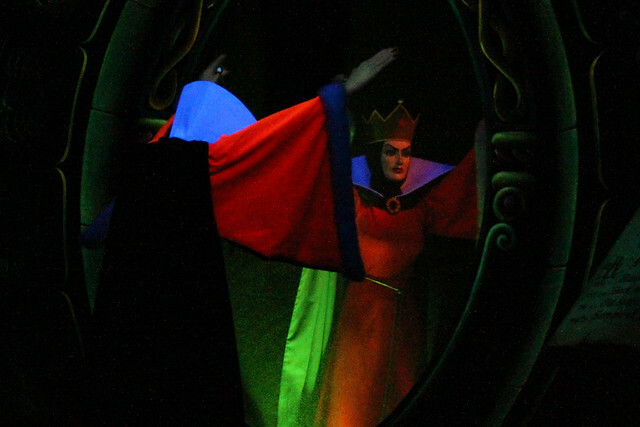 At the same three parks, you can also take a trip with Snow White through the enchanted Forest, but beware of the Evil Queen! 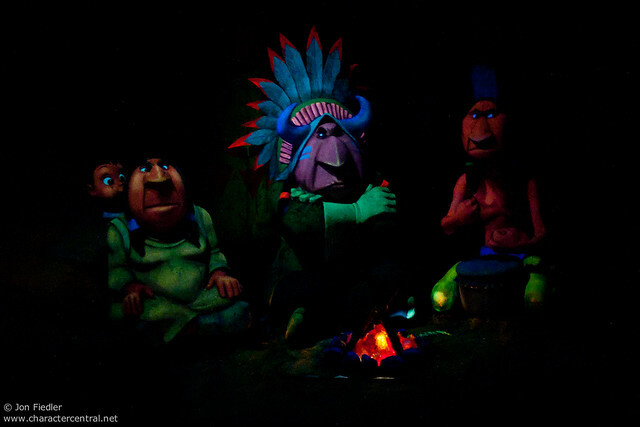 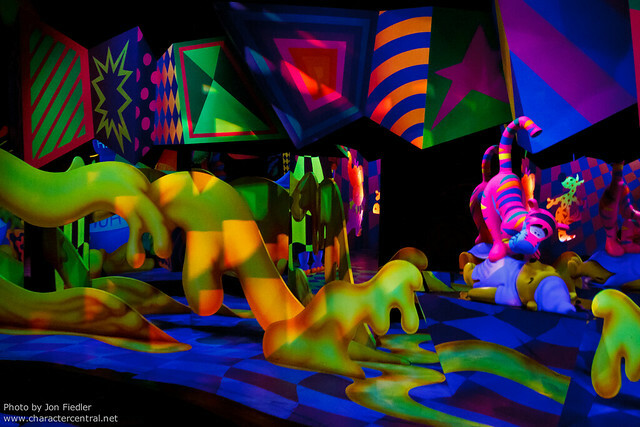 Disneyland has the best version of this attraction since it received some special effect enhancements. 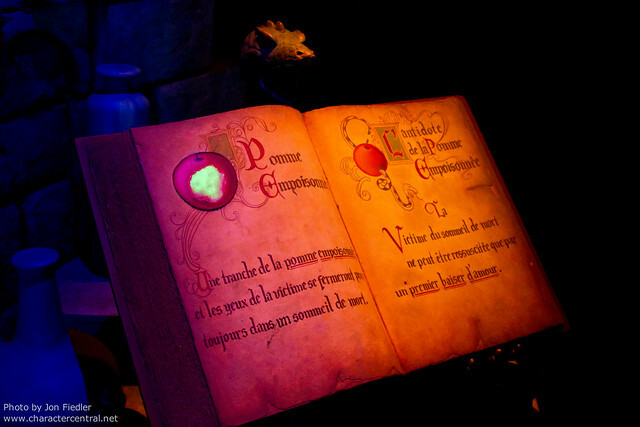 Paris would be my next choice, followed by Tokyo last. 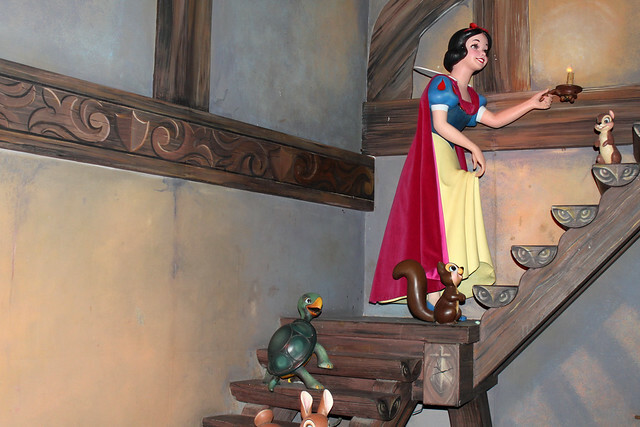 Tokyo’s for some reason comes to an abrupt end without resolving the fact that Snow White is in a death like sleep. 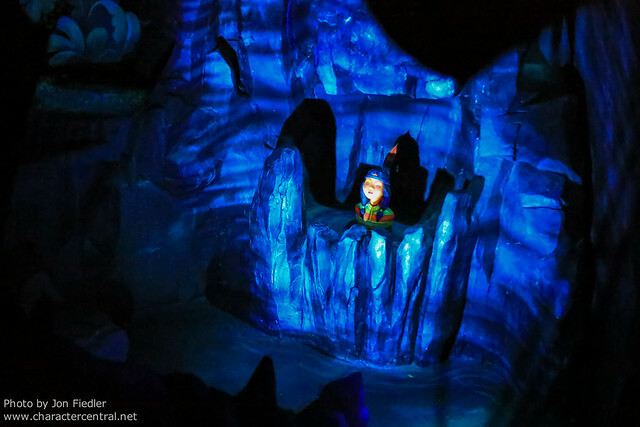 The Witch falls from the rock face, and that’s it, end of ride. 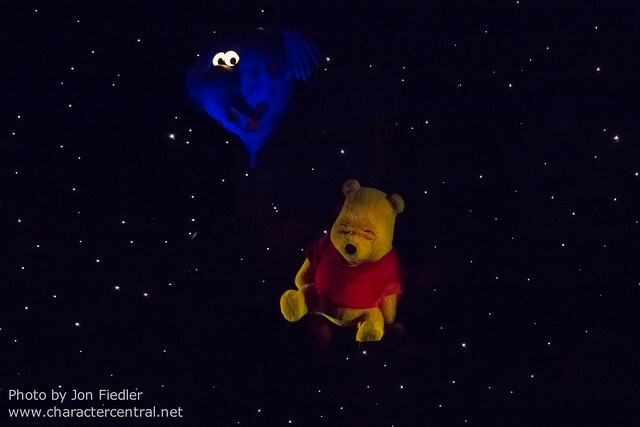 It feels a little weird. 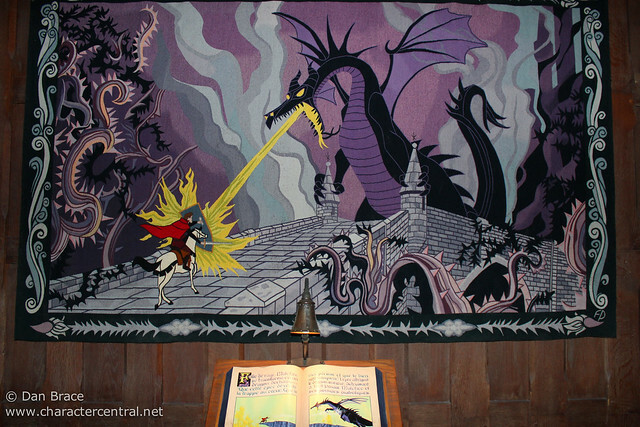 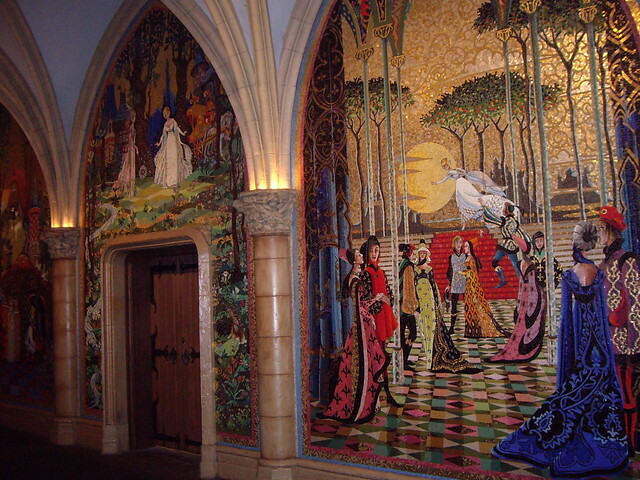 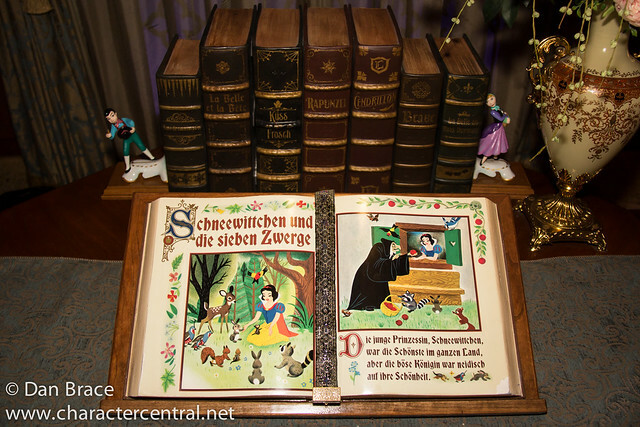 For reference, Magic Kingdom used to have a Snow White attraction, but it was replaced by a princess meet ‘n’ greet. 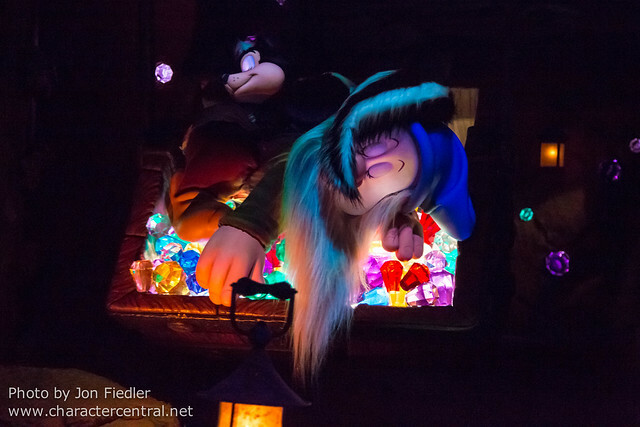 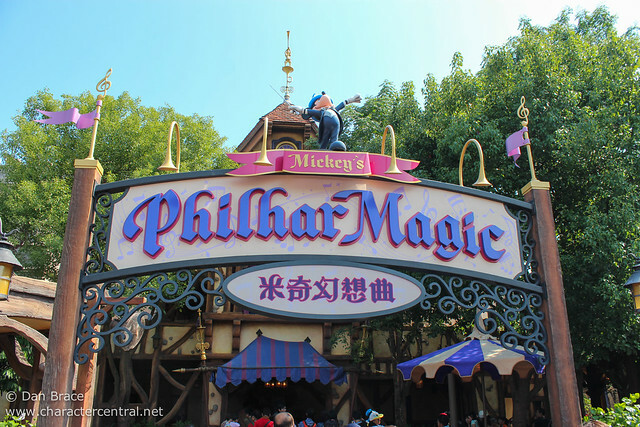 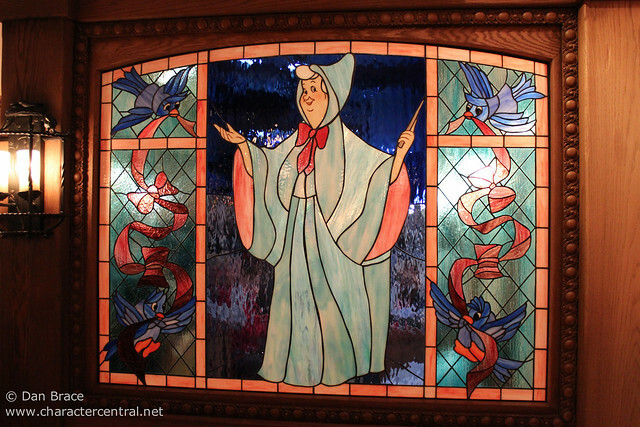 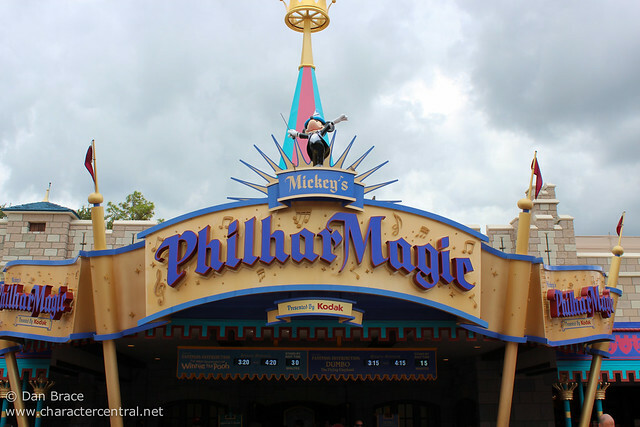 After cruises, trips to Pleasure Island and a scary journey through the forest, we can find rest inside a theatre and take in Mickey’s PhilharMagic at Magic Kingdom, Tokyo Disneyland and Hong Kong Disneyland. 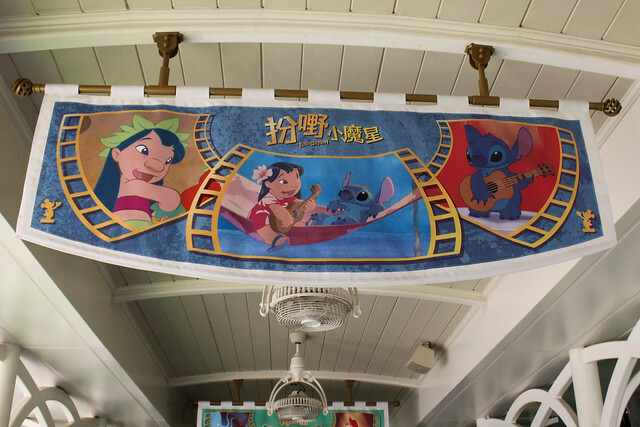 All three presentations are identical, save for parts of the dialogue being in whichever appropriate language. 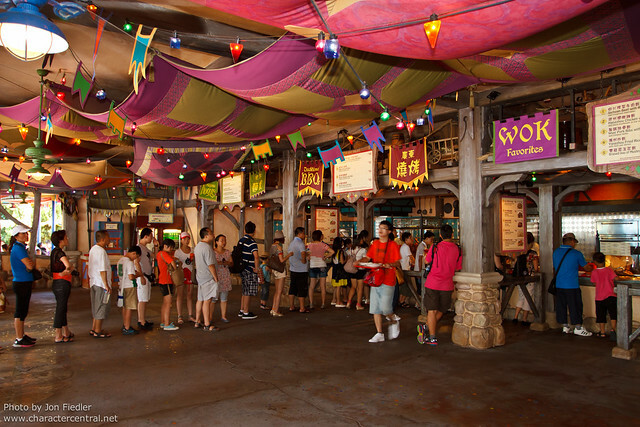 The queue areas are what vary the most. 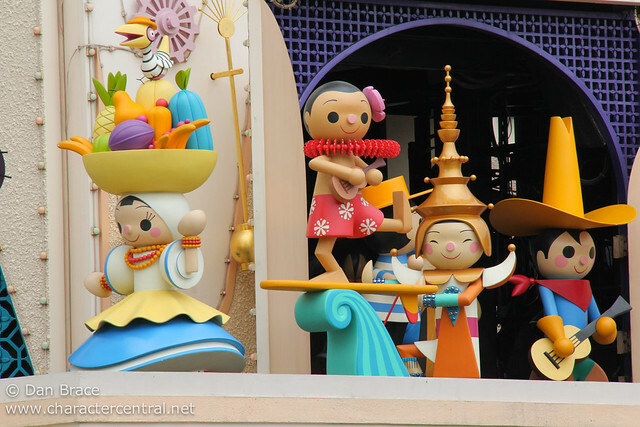 I think overall I like Hong Kong’s the best, but Tokyo did a good job, and Magic Kingdom’s isn’t bad, but it isn’t anything special, either. 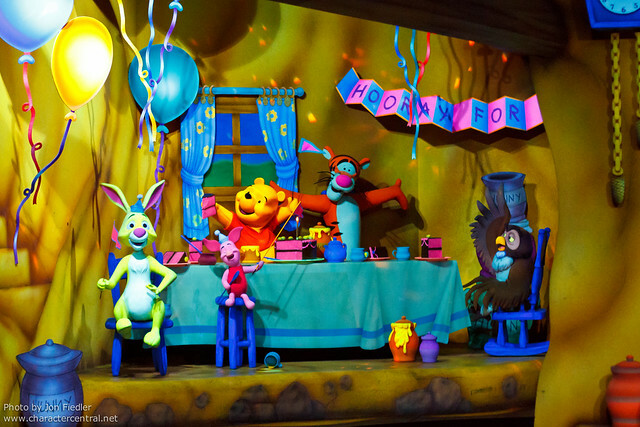 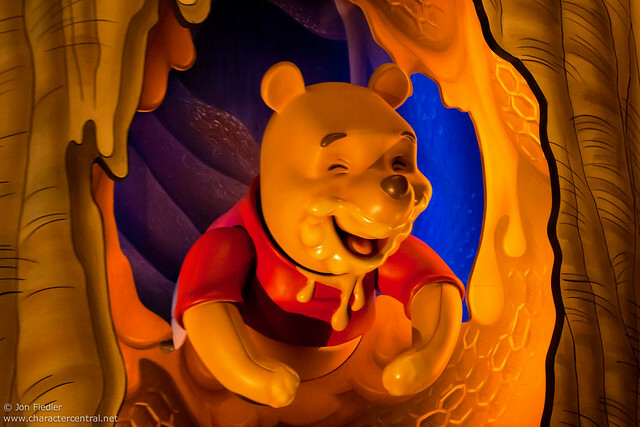 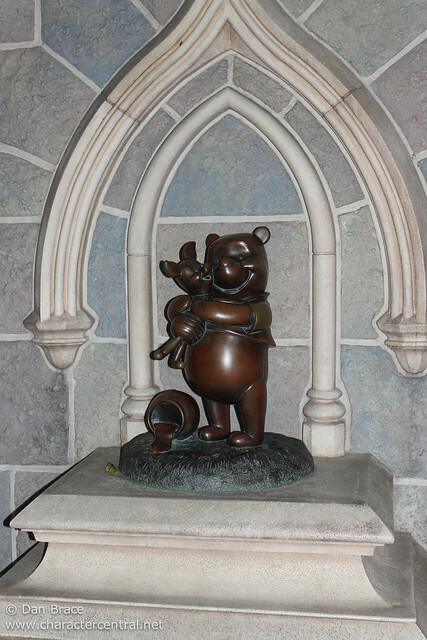 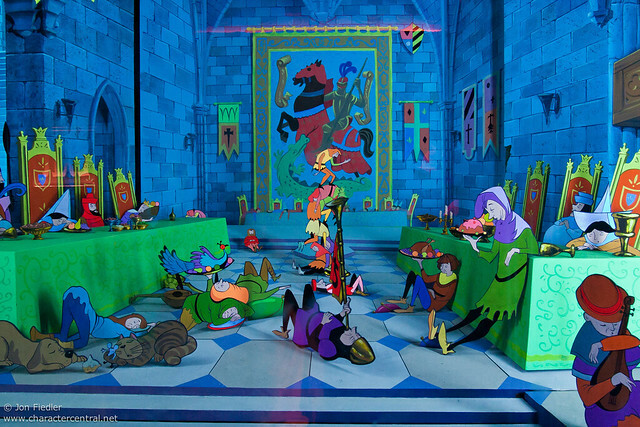 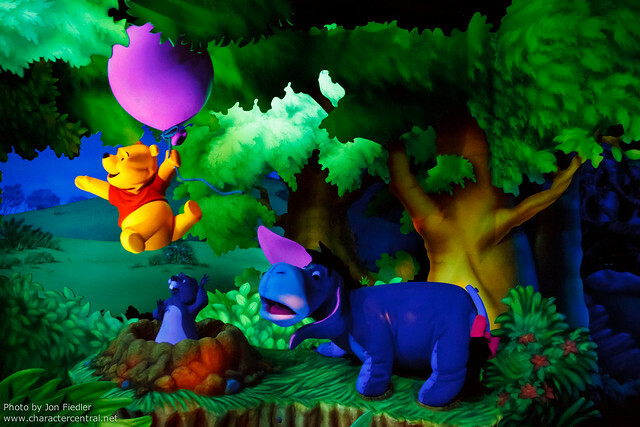 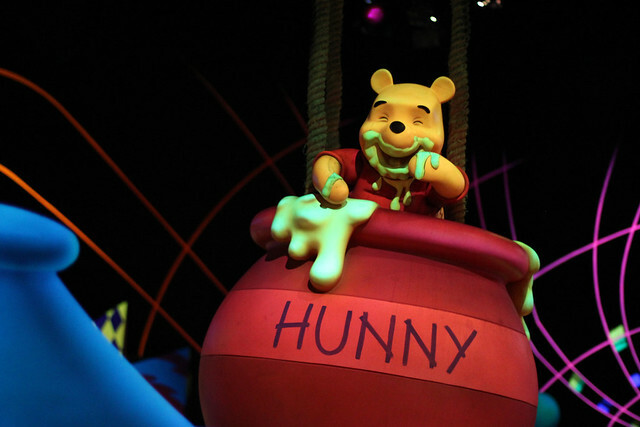 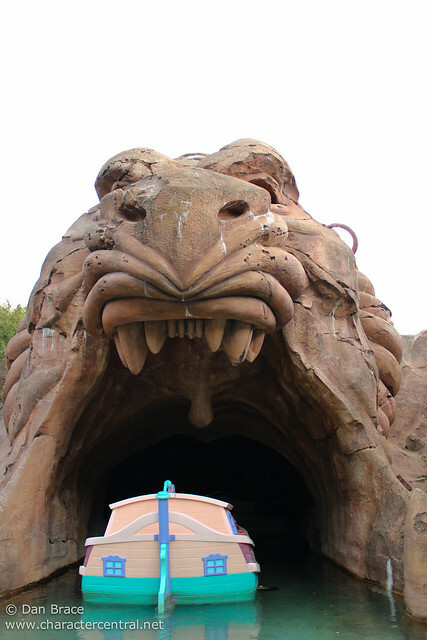 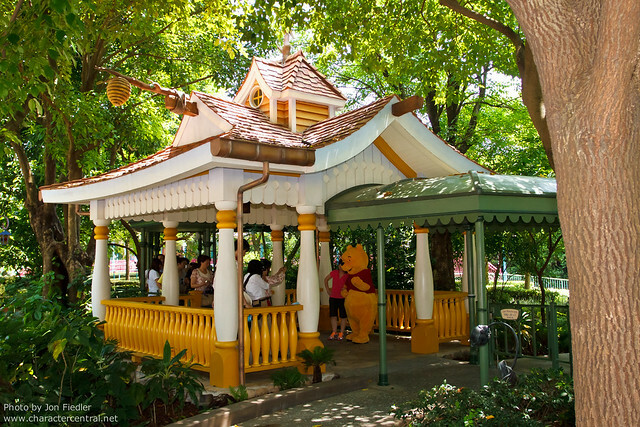 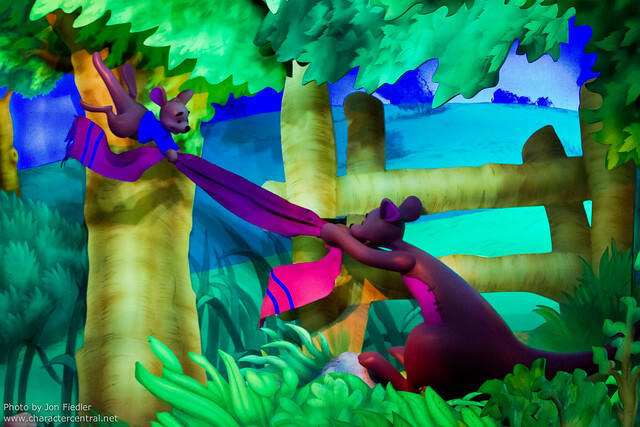 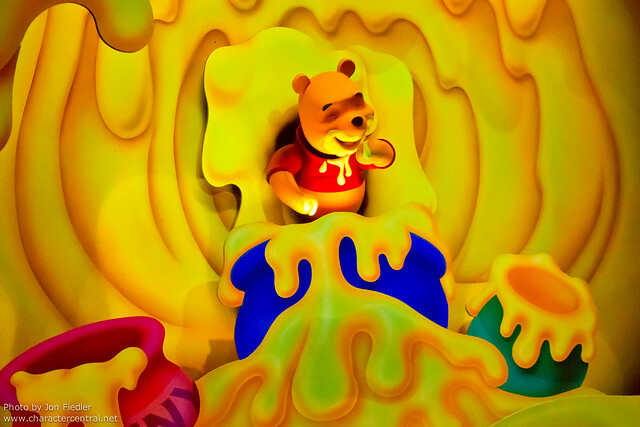 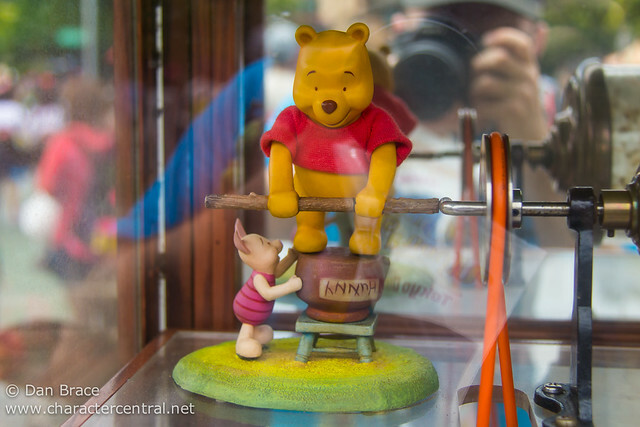 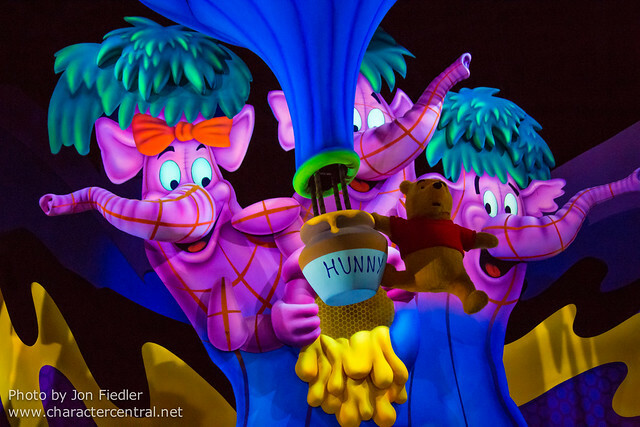 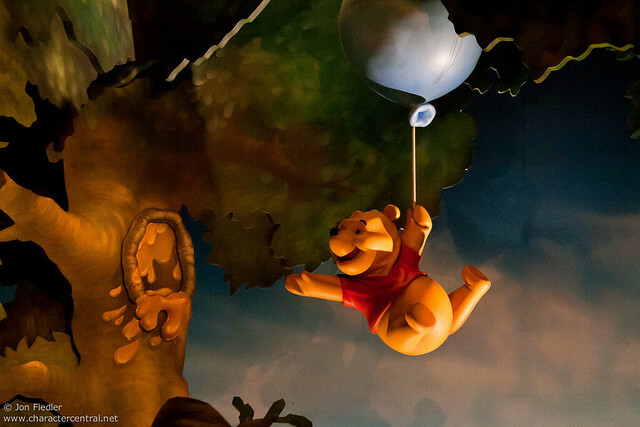 Four of the Kingdoms feature a Winnie the Pooh based attraction. 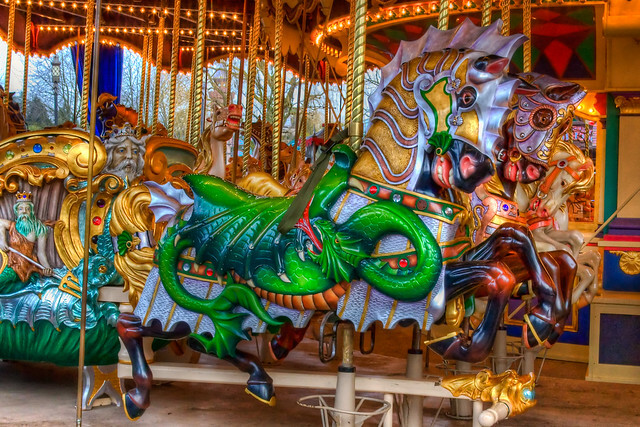 Florida, Hong Kong and Tokyo all have theirs in Fantasyland, and California’s is in Critter Country. 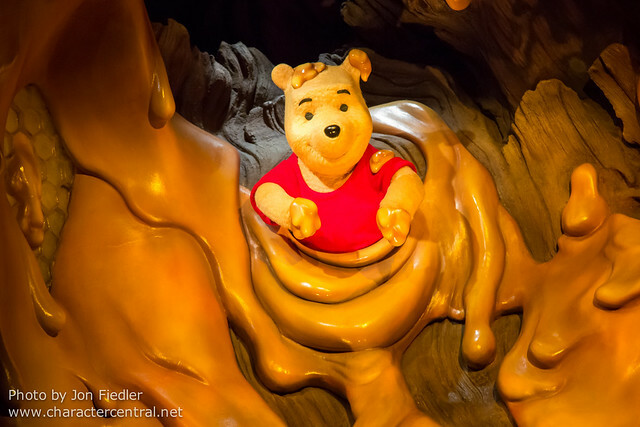 I deliberately left out the Pooh attraction from the Frontierland part of this tour, so that I could include it here, since three of the four versions are all in Fantasyland. 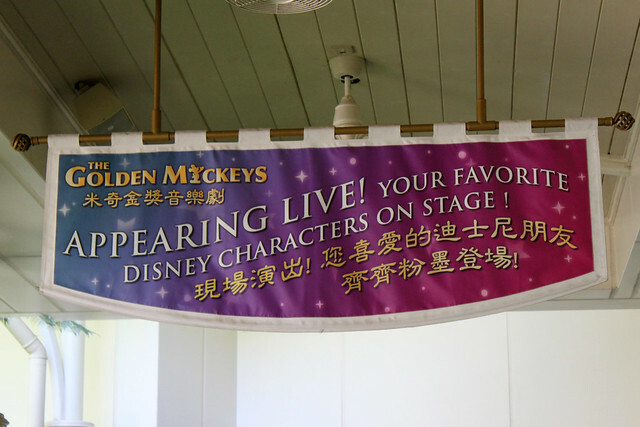 Overall, the Florida, California and Hong Kong ones are very much the same. 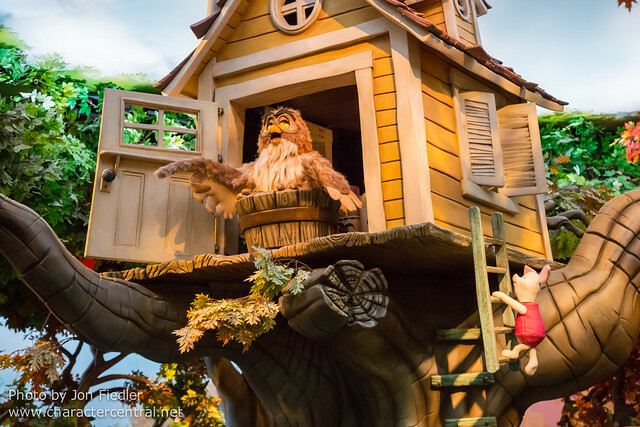 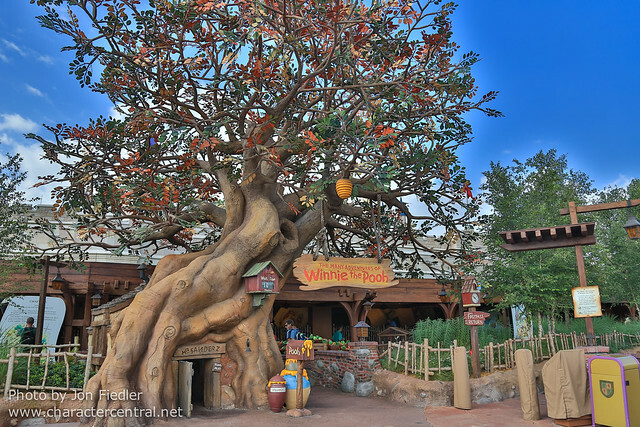 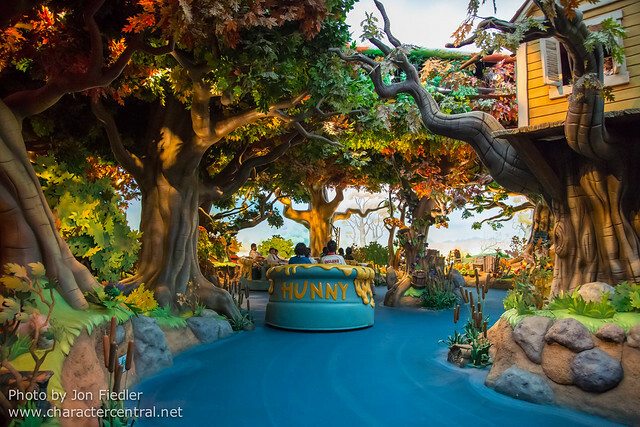 California’s has the advantage of not being in Fantasyland, but rather, is in the rustic country setting of Critter Country, which I feel is much more suited to the 100 Acre Wood friends. 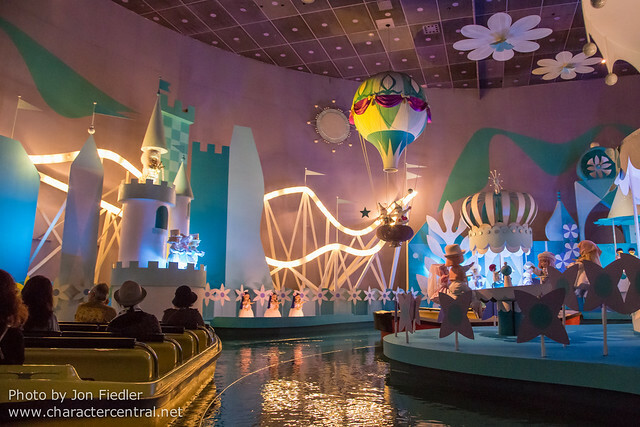 With all that said, ultimately the best version of the attraction though is Tokyo’s. 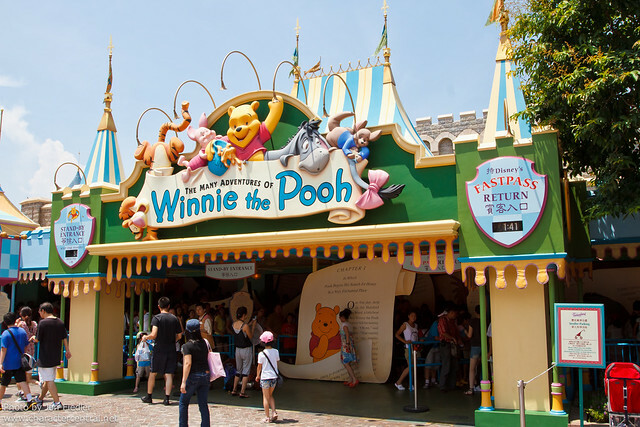 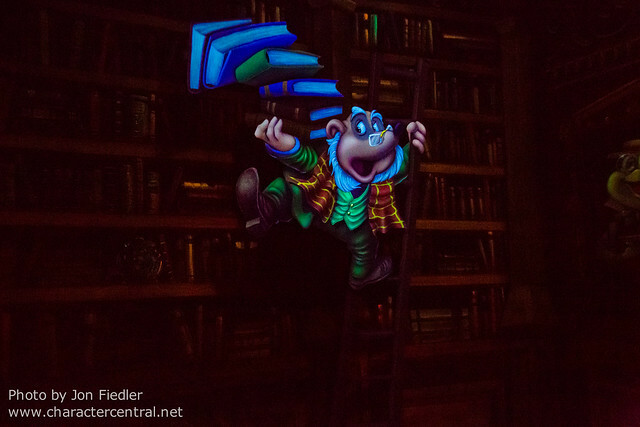 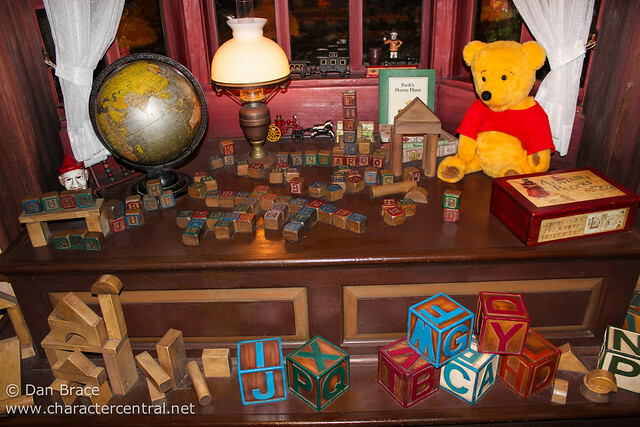 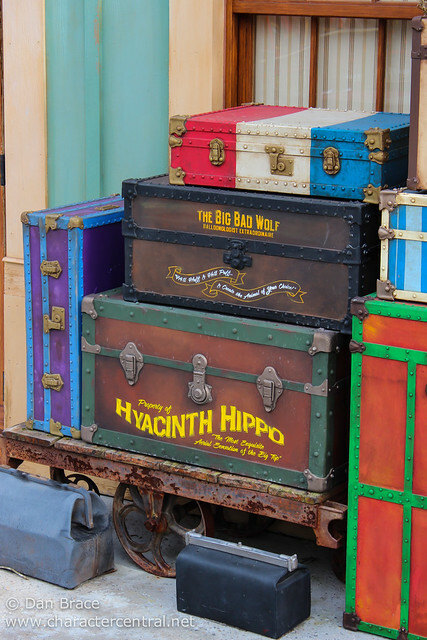 Pooh’s Hunny Hunt utilises the trackless technology that has come to find itself in other recent park additions, such as Ratatouille in Paris and Mystic Manor in Hong Kong. 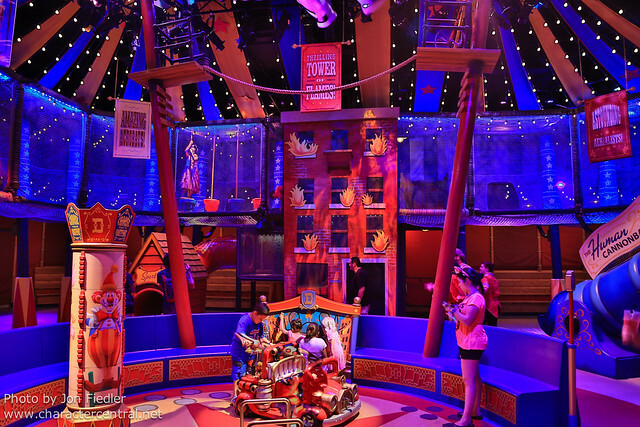 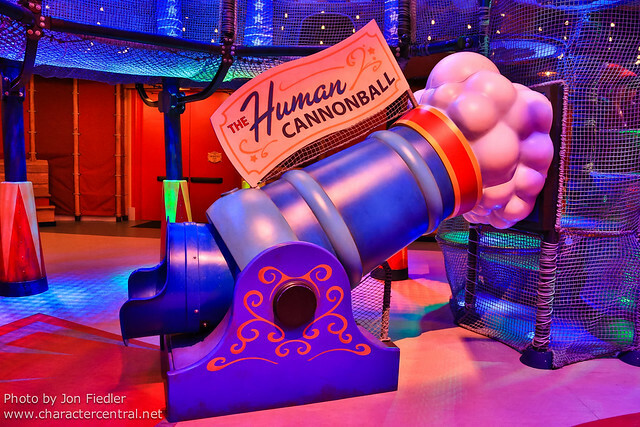 The free moving, seemingly random way in which the ride vehicles move, coupled with scenes where you bounce, spin and move sideways and backwards just make the entire experience thoroughly enjoyable from start to end. 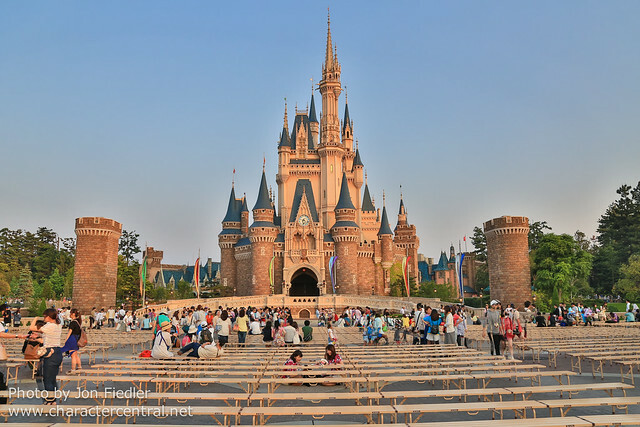 Four of the parks (Tokyo being the exception) have a stop of their respective railroads, in Fantasyland. 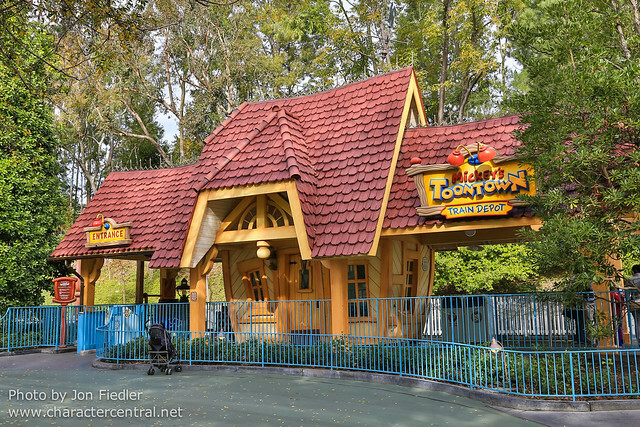 For those wondering, yes, I am including the “Toontown” stop of the Disneyland Railroad. 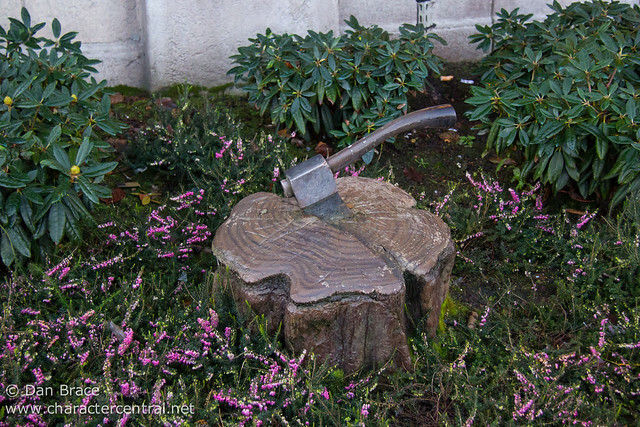 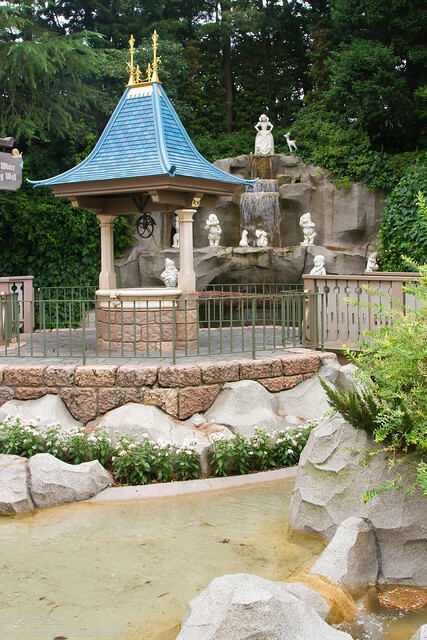 I have always felt that this is more part of Fantasyland, seeing as it is situated next to the theatre, and outside the main berm of Toontown. 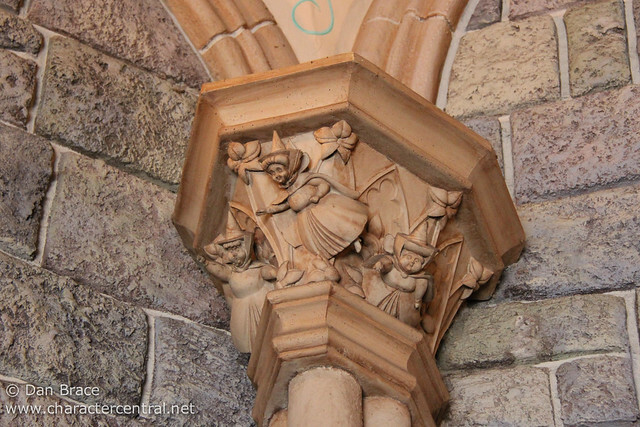 None are exceptional, but all have varying styles, as you will see in the photos below. 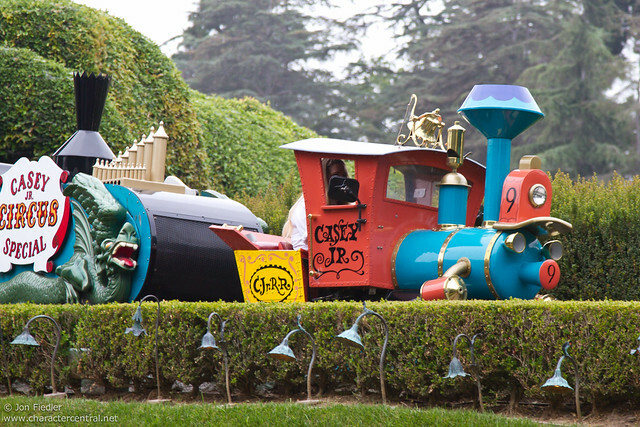 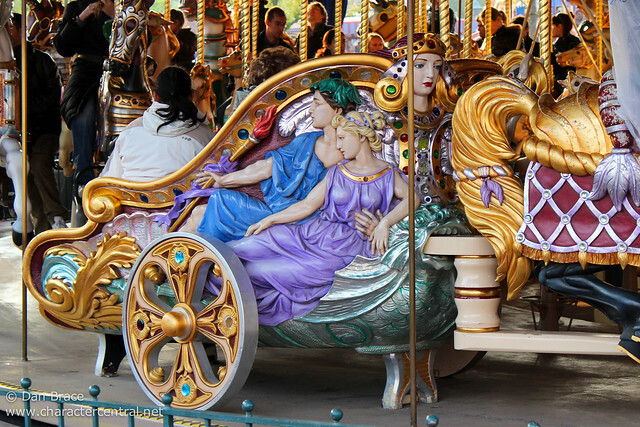 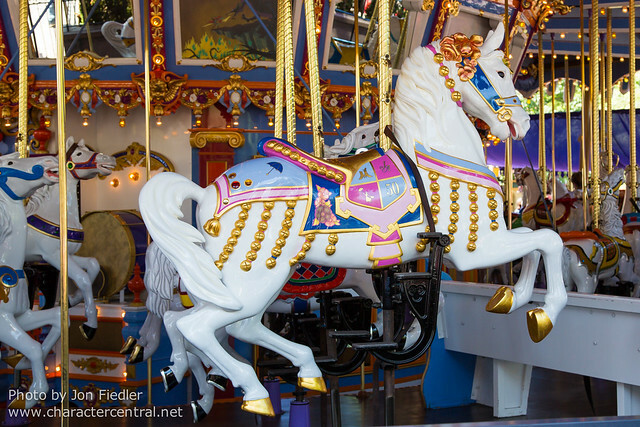 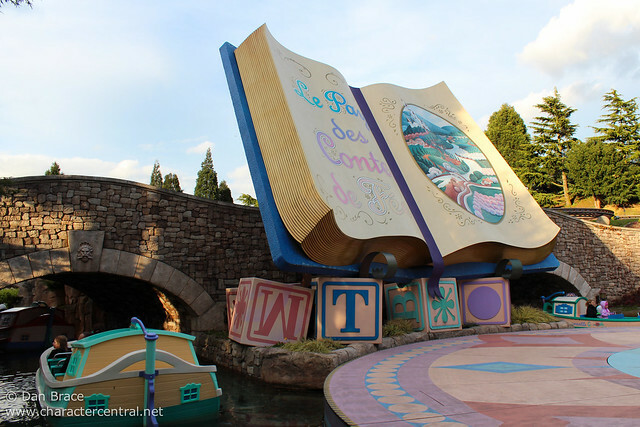 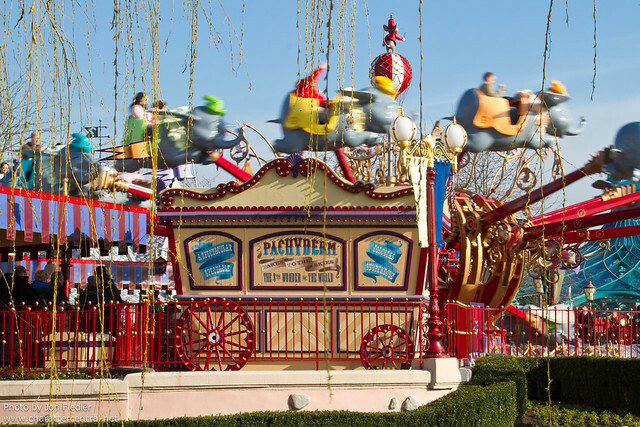 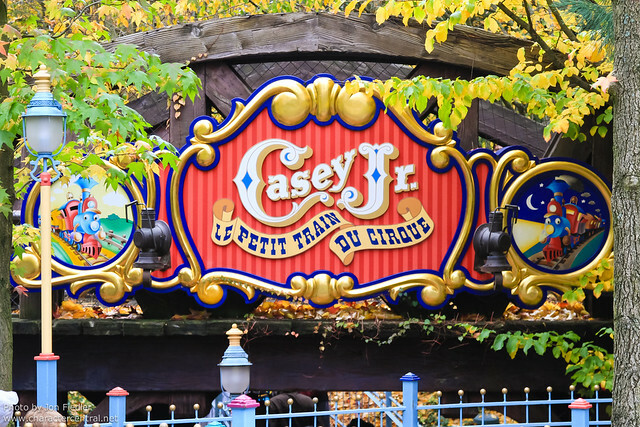 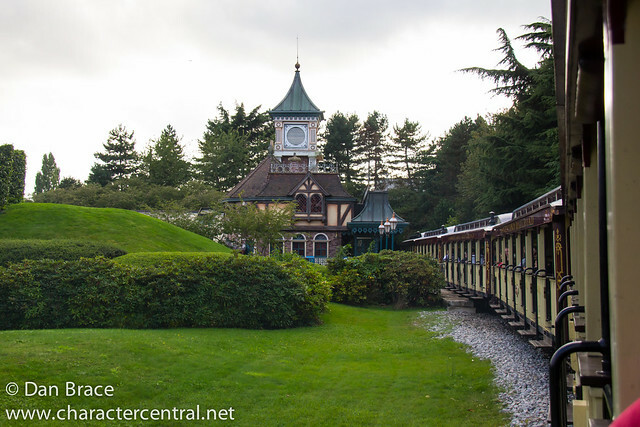 Disneyland and Disneyland Paris both share a storybook area, which features a boat ride and the Casey Junior Circus Train. 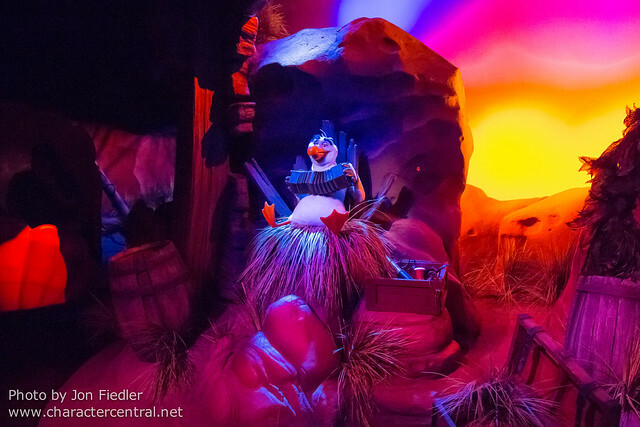 The scenery is a little different in each, and Disneyland’s has an on board narrator, but overall the feel of them is very similar. 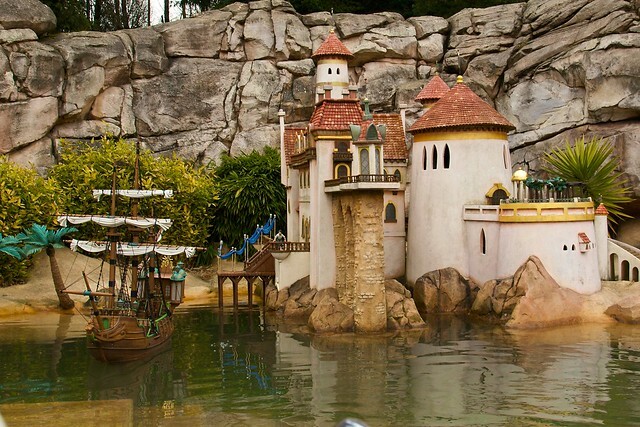 Both attractions are so neatly intertwined, and share much of the same scenes, that I’ll post both the boat and the train together. 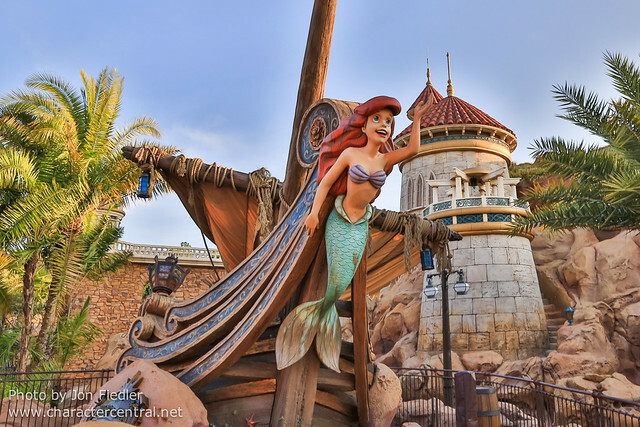 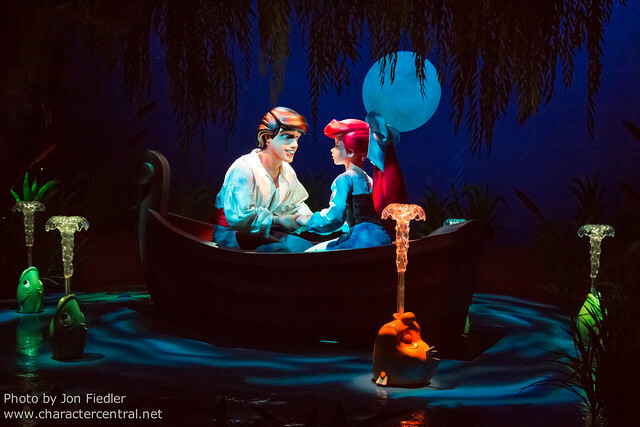 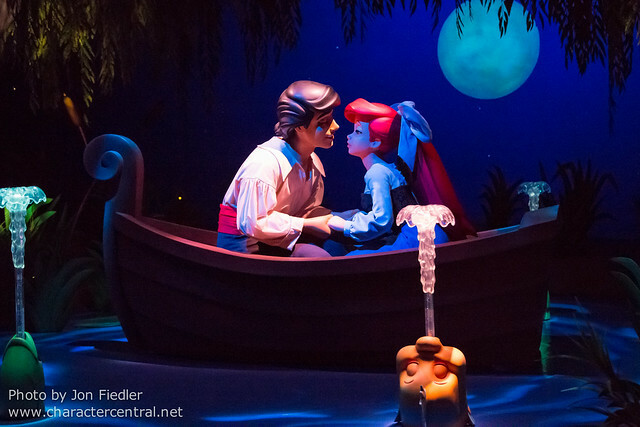 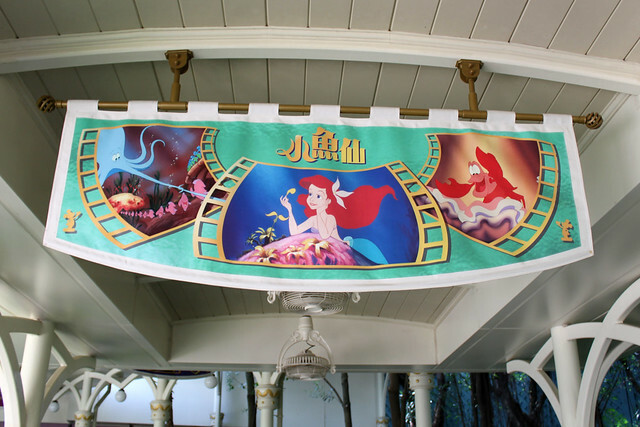 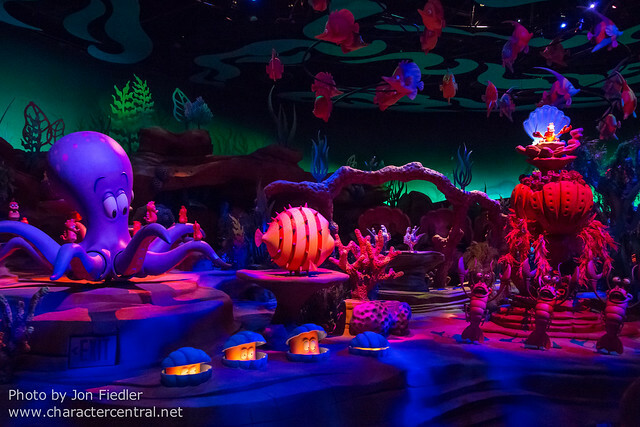 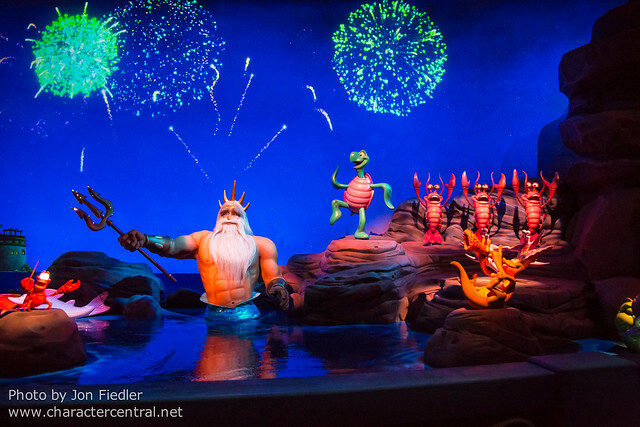 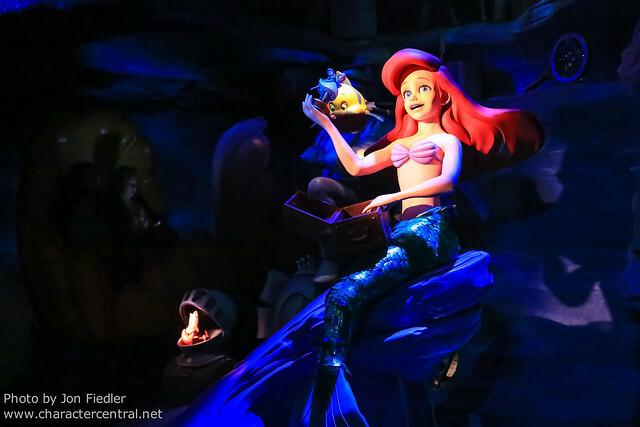 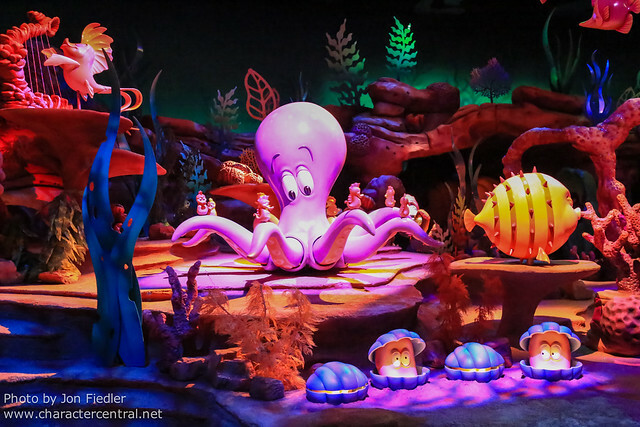 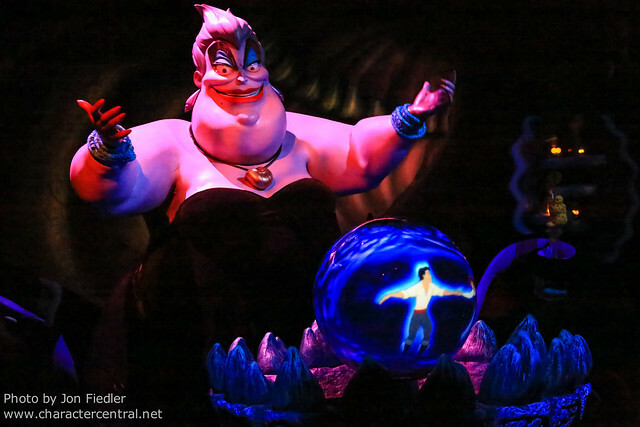 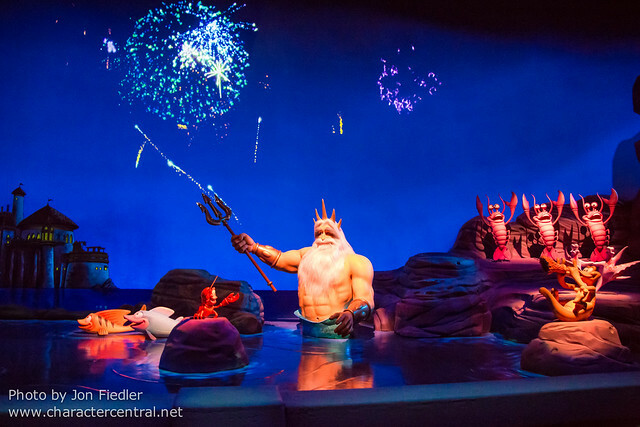 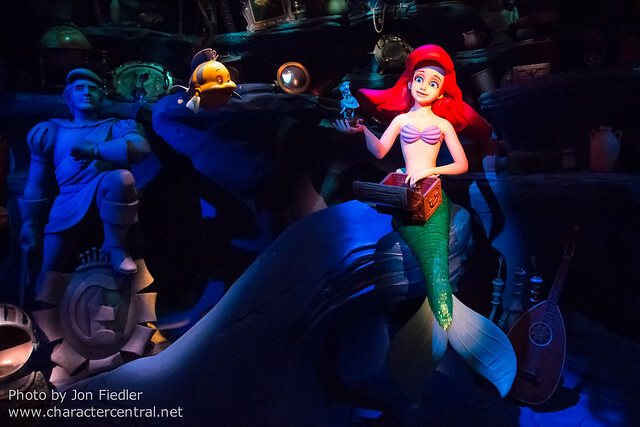 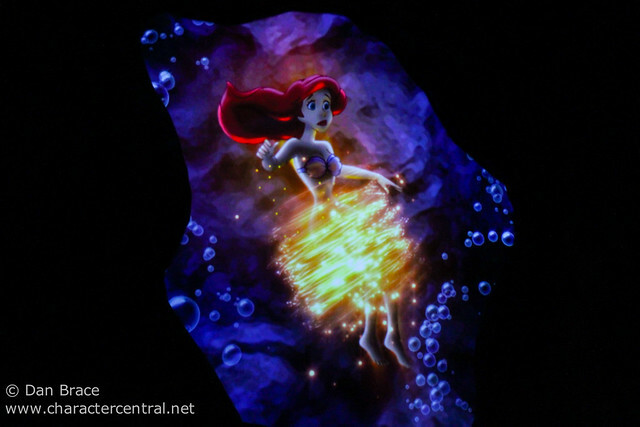 The final attraction that has any comparable at multiple parks is the Journey of the Little Mermaid/Ariel’s Undersea Adventure. 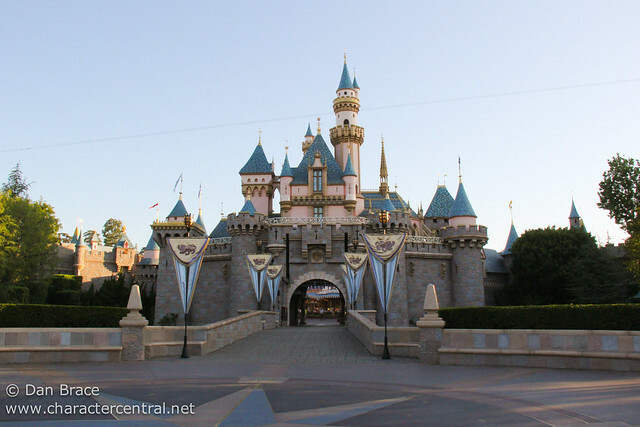 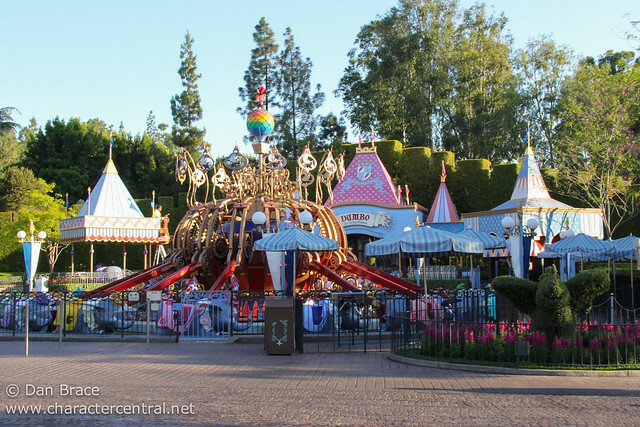 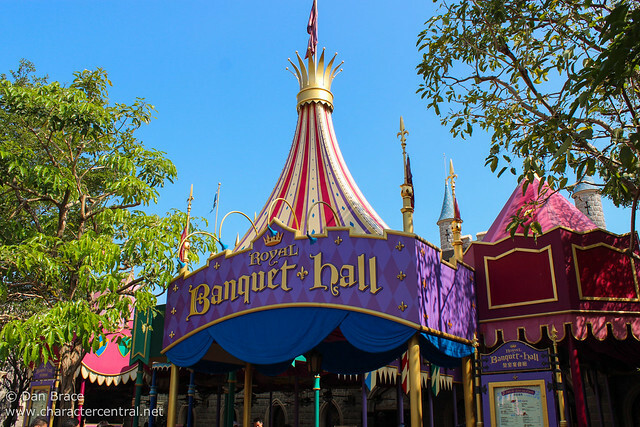 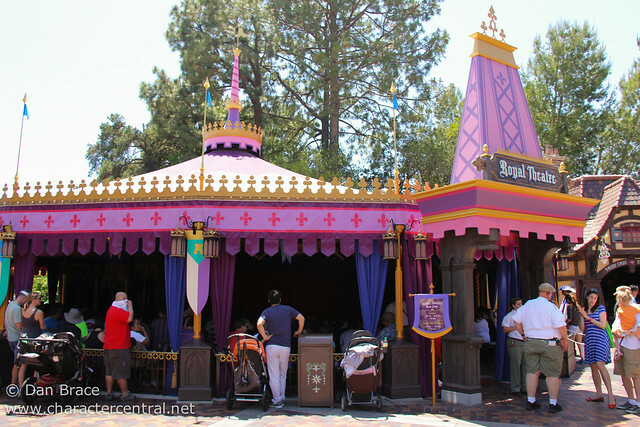 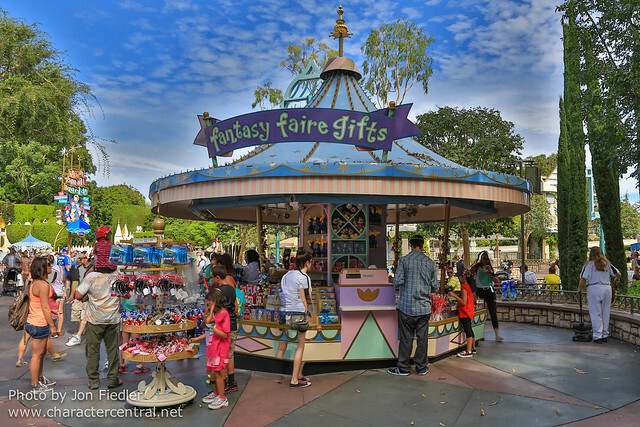 The Magic Kingdom’s is in Fantasyland, but Disneyland’s is actually in Disney California Adventure, so although not a Fantasyland attraction in Disneyland, I’ll show you what it looks like when compared to the Magic Kingdom’s anyway. 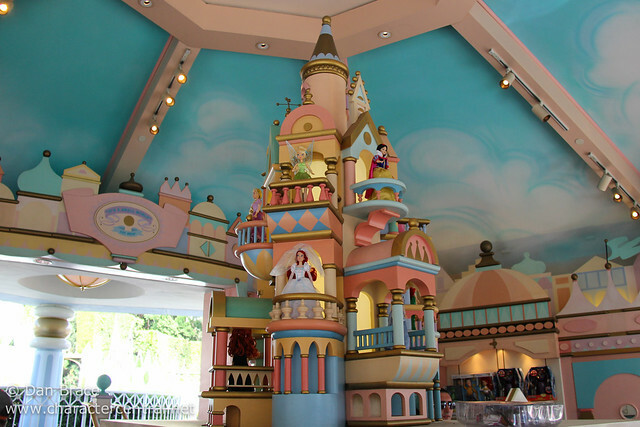 Overall, I think the Magic Kingdom’s is better. 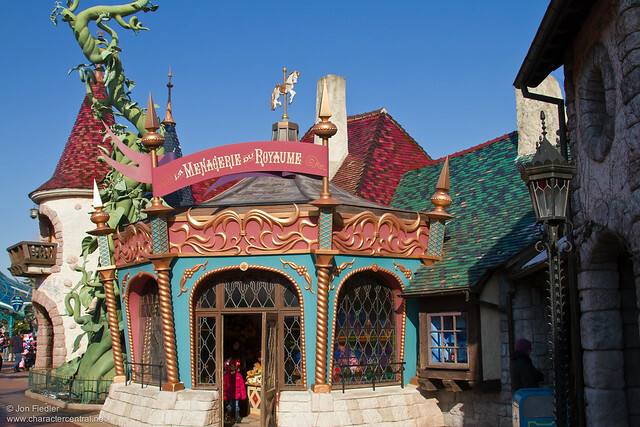 The exterior is far superior in design and theming, and they tweaked just a few small things in the Magic Kingdom one, which I think just gives it that edge. 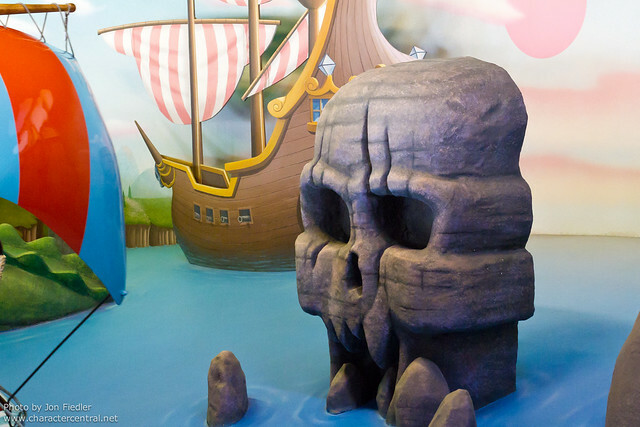 Now we come to the attractions that are unique to each park, and not featured elsewhere! 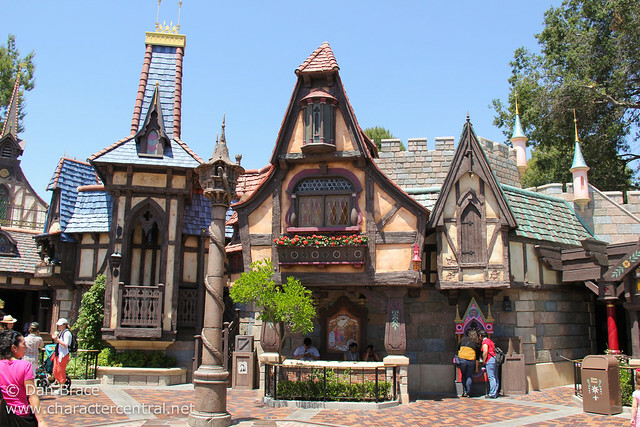 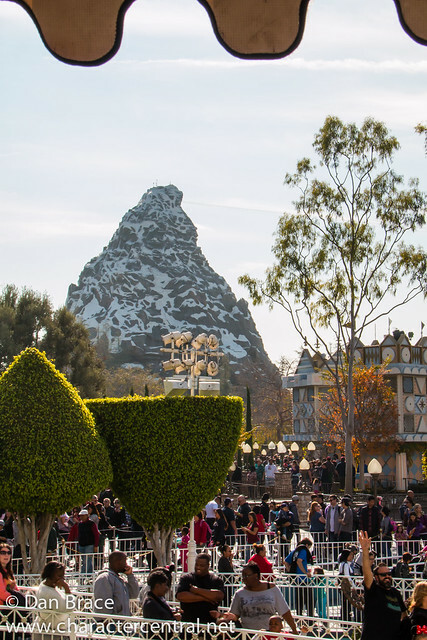 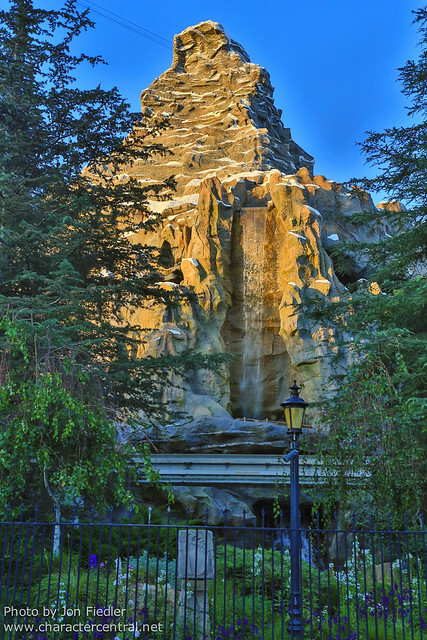 Disneyland has three attraction in Fantasyland that are completely unique; Mr Toad’s Wild Ride, Alice in Wonderland and the Matterhorn Bobsleds. 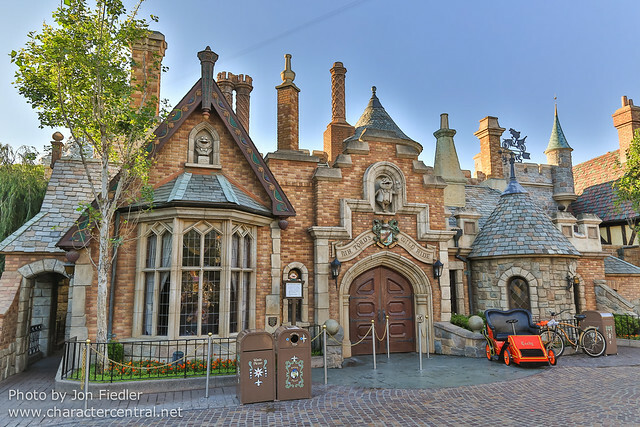 Mr Toad’s Wild ride is a classic dark ride that takes you on a fast paced car journey through the English countryside, to a courtroom and then finally to hell! 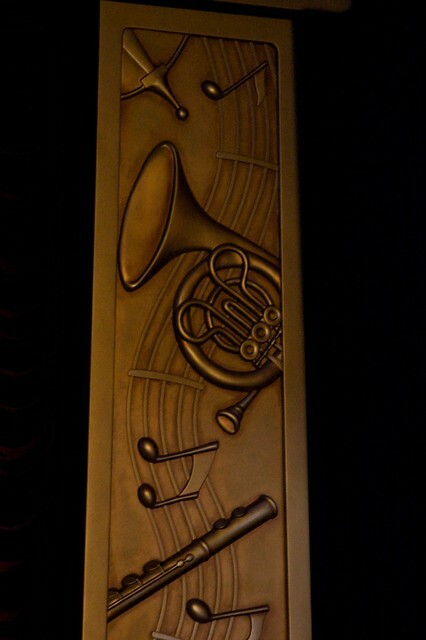 Yes, hell. 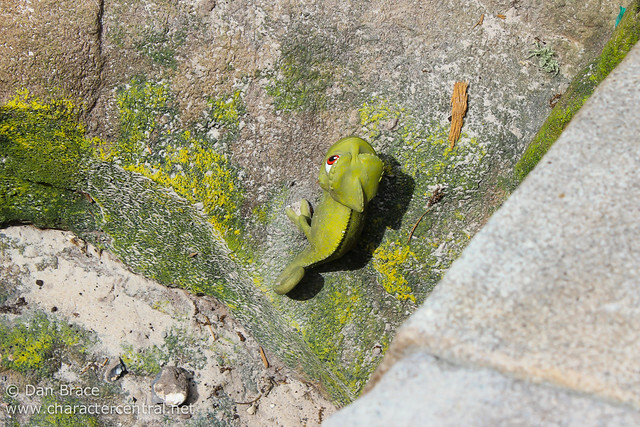 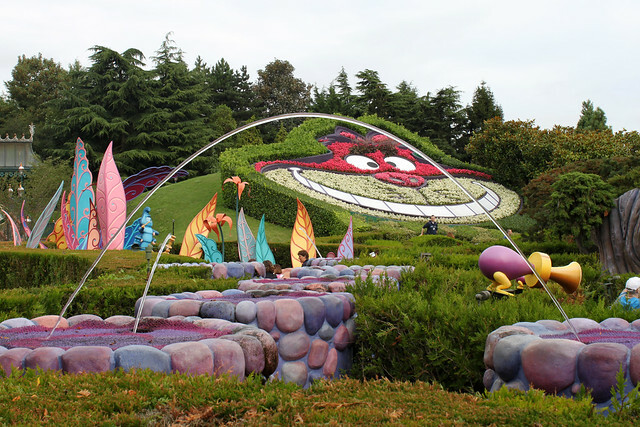 It’s a bizarre attraction, but it is quite entertaining! 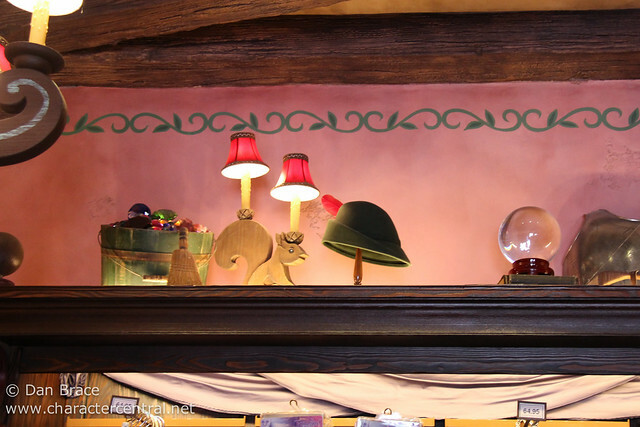 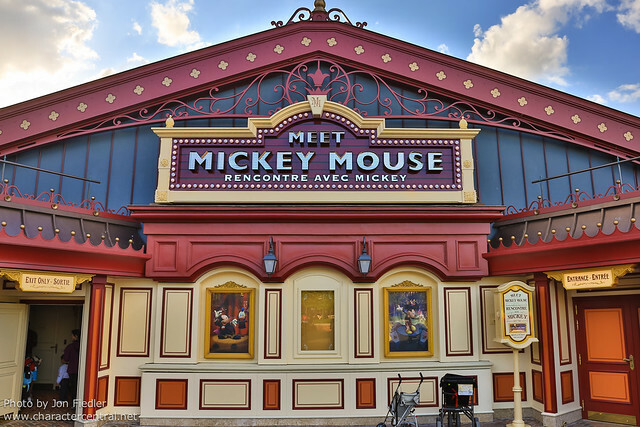 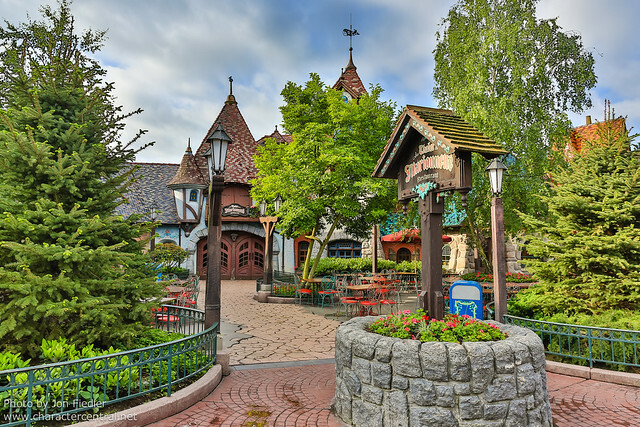 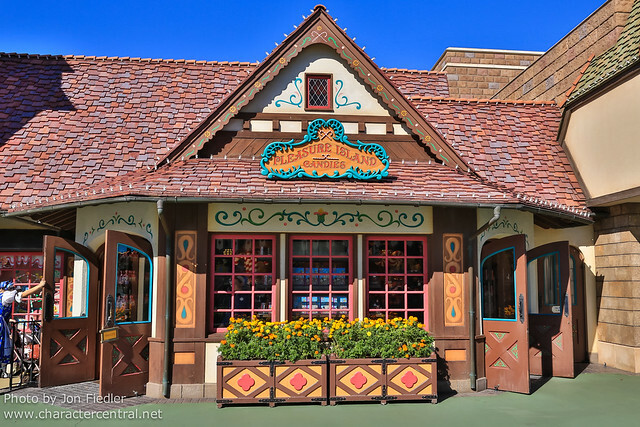 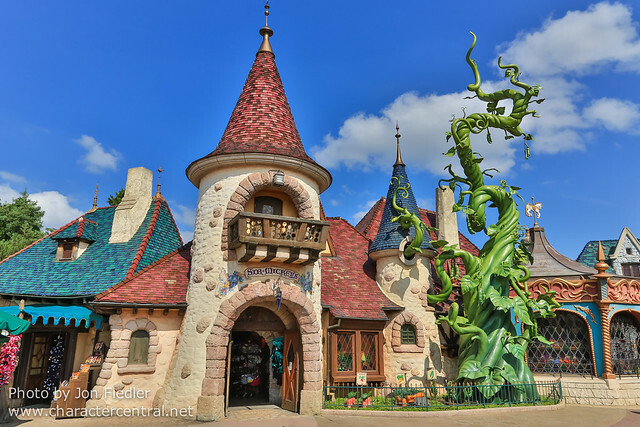 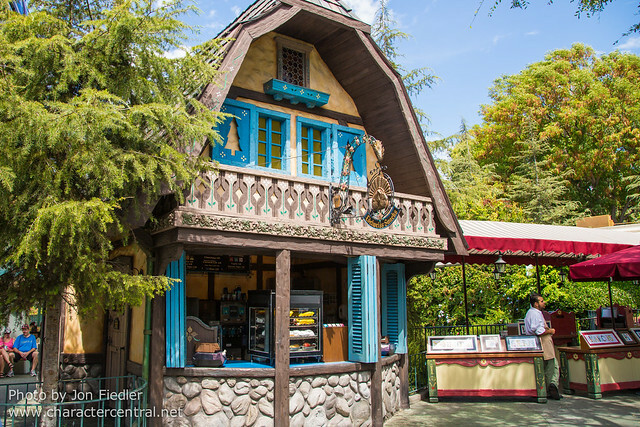 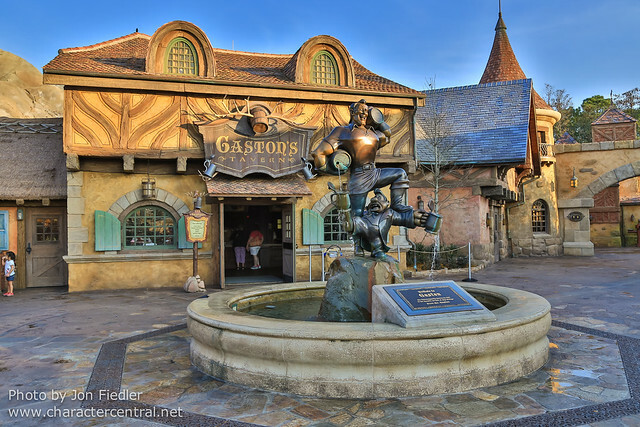 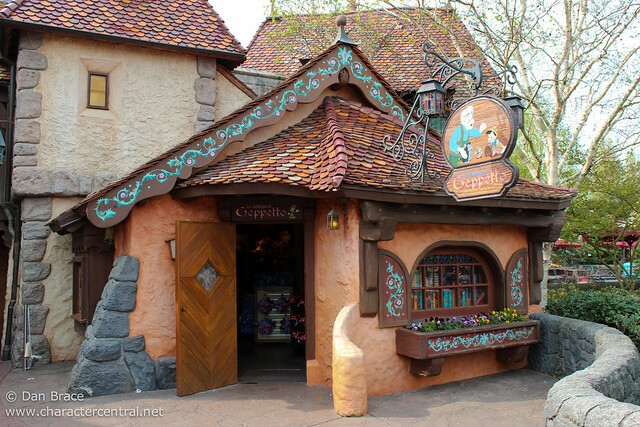 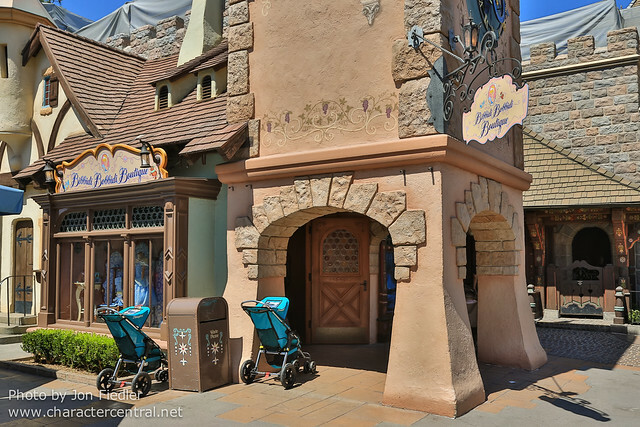 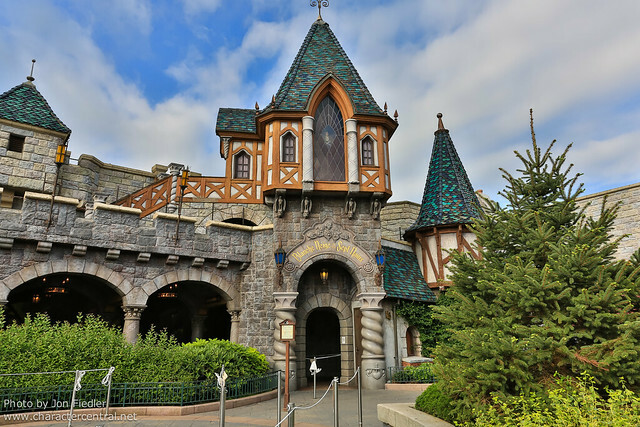 It is interesting to note that although Disneyland Paris does not have a Mr Toad attraction, it does have a Toad Hall Restaurant, and the exterior is practically identical, except for some small details. 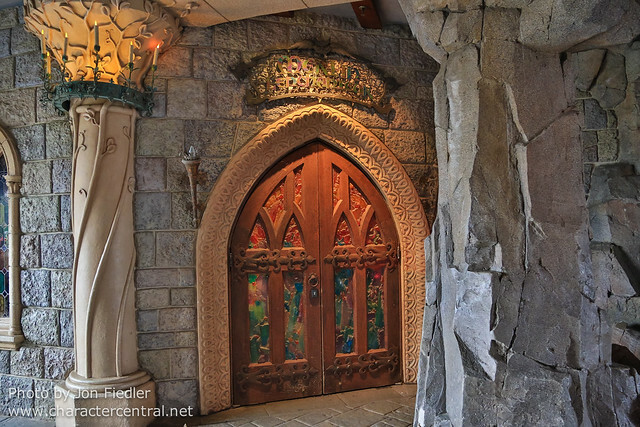 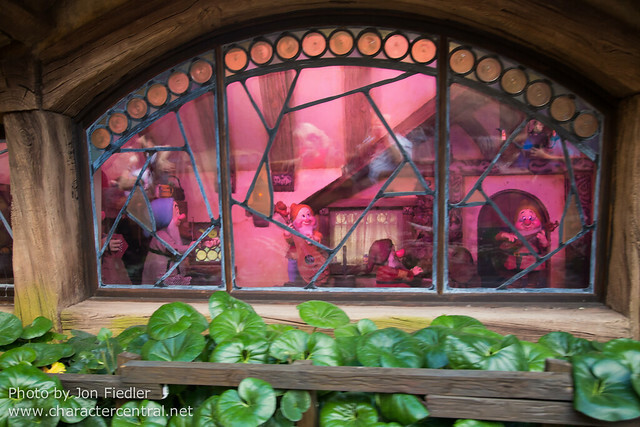 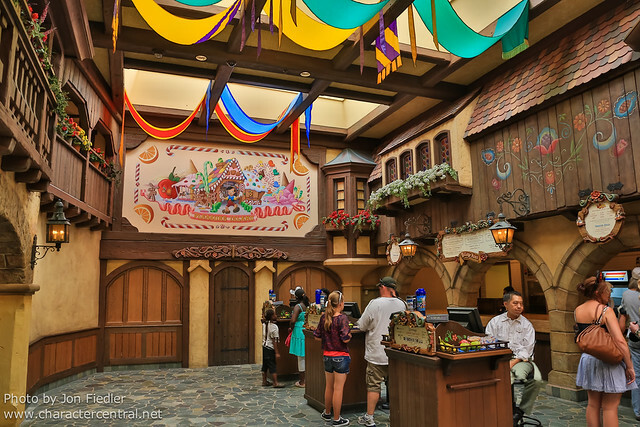 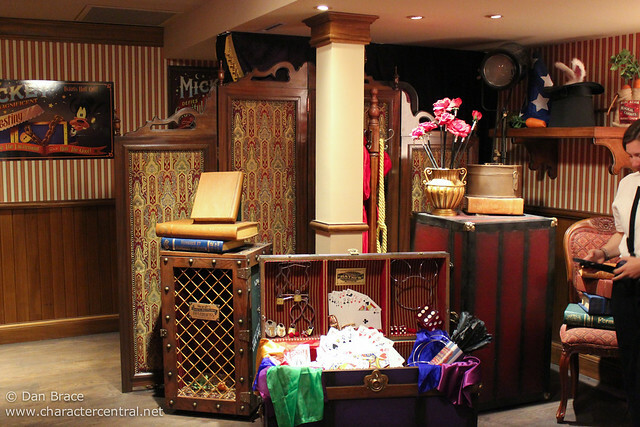 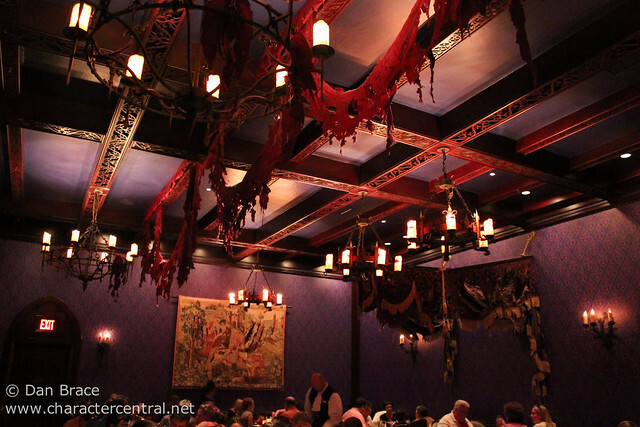 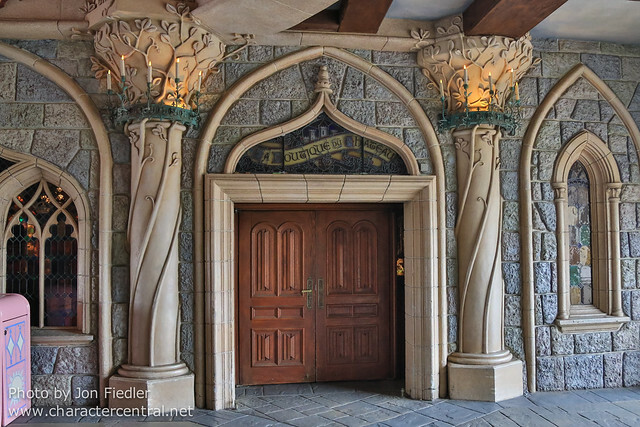 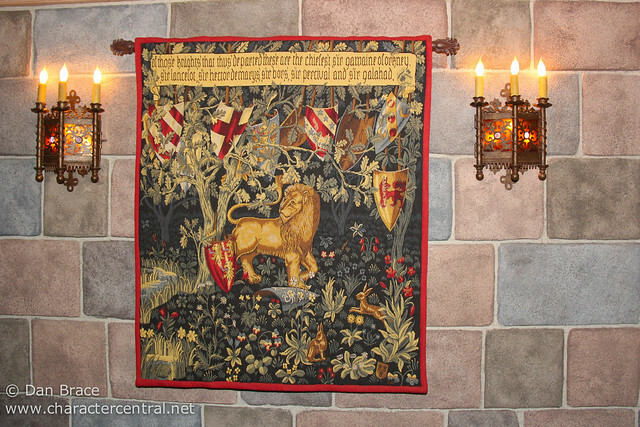 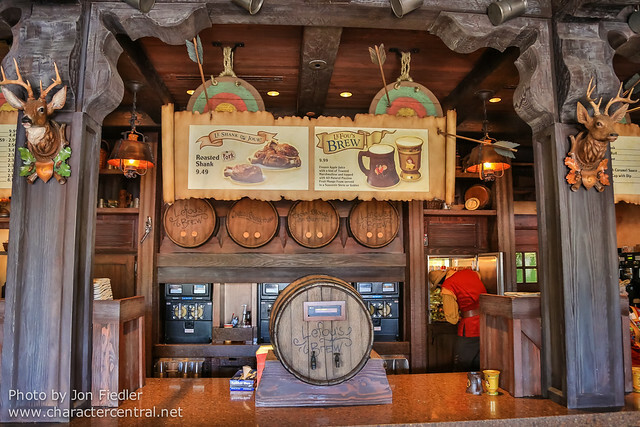 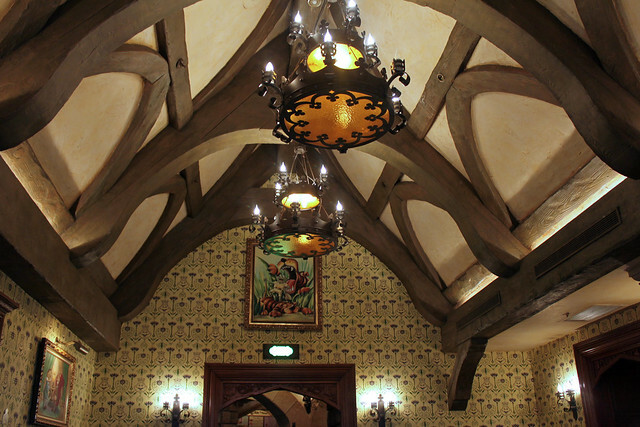 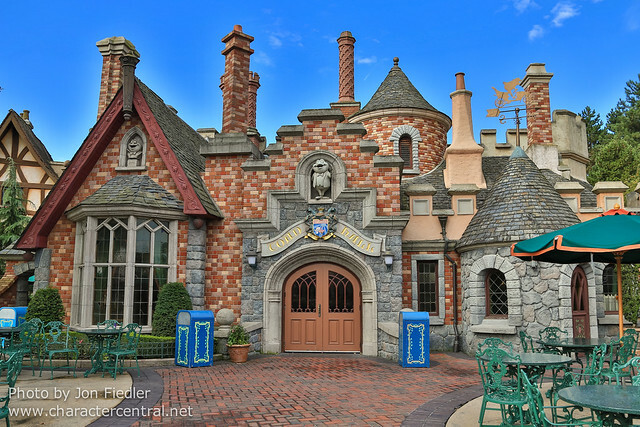 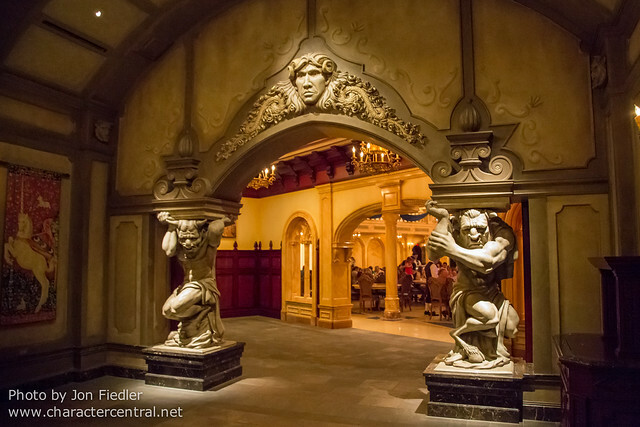 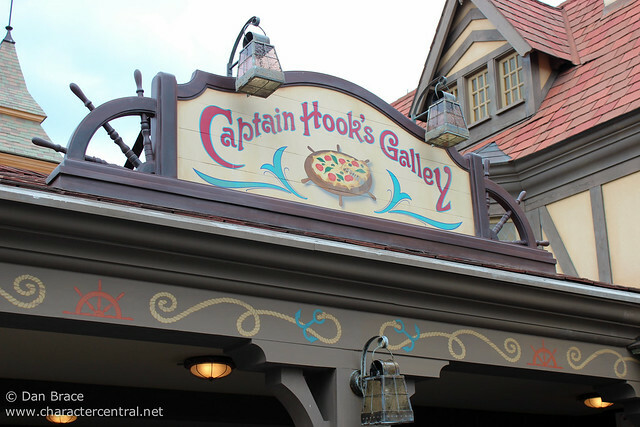 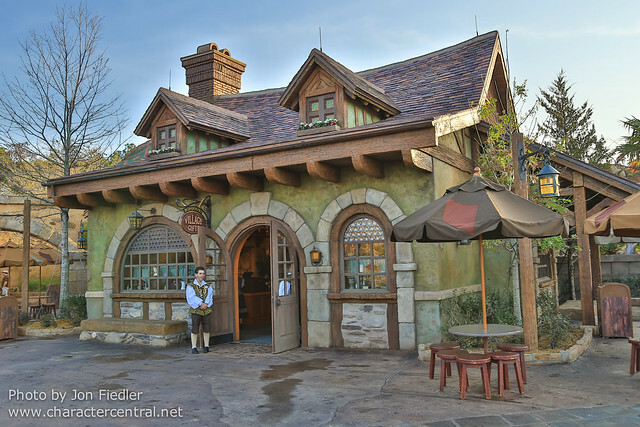 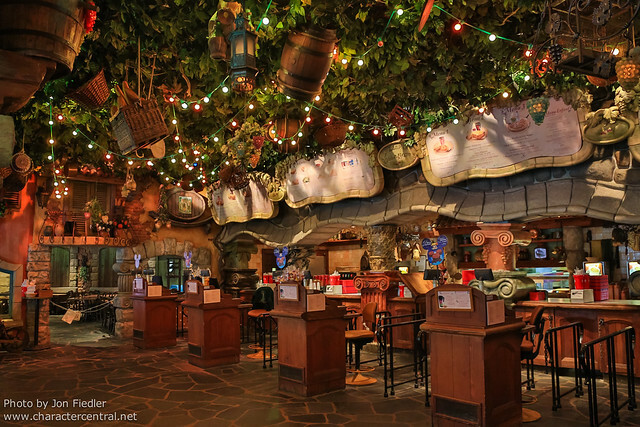 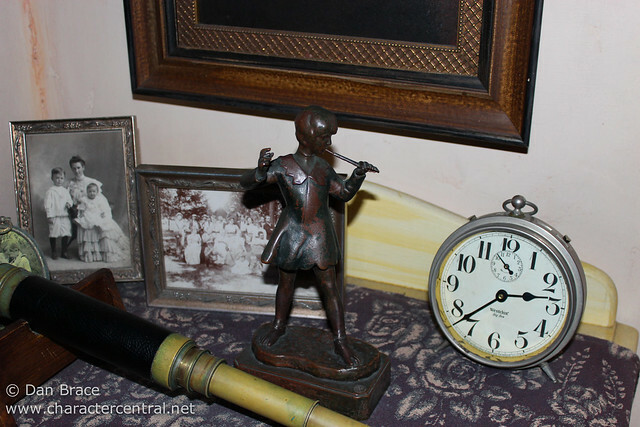 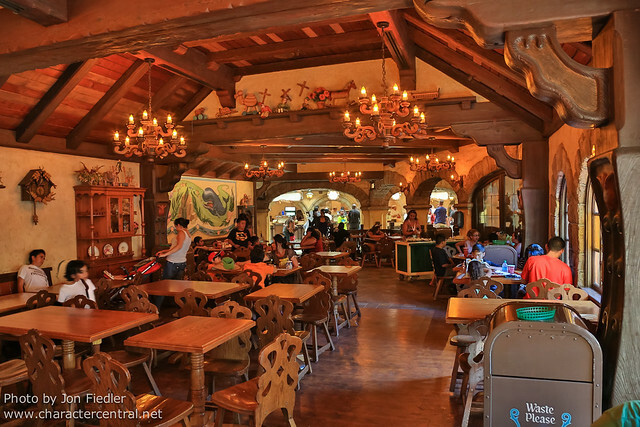 We will take a look inside Toad Hall Restaurant shortly, when we get to the dining part of this article. 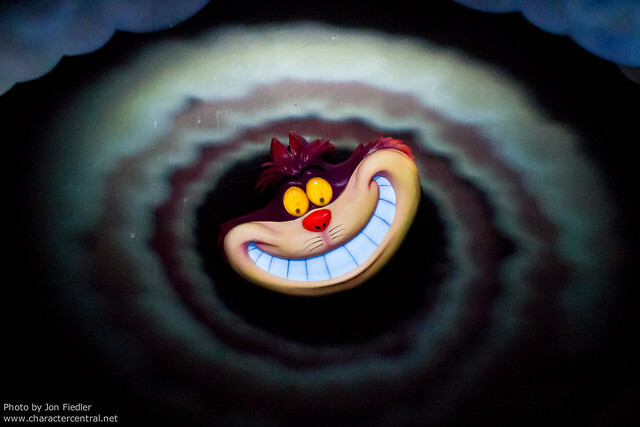 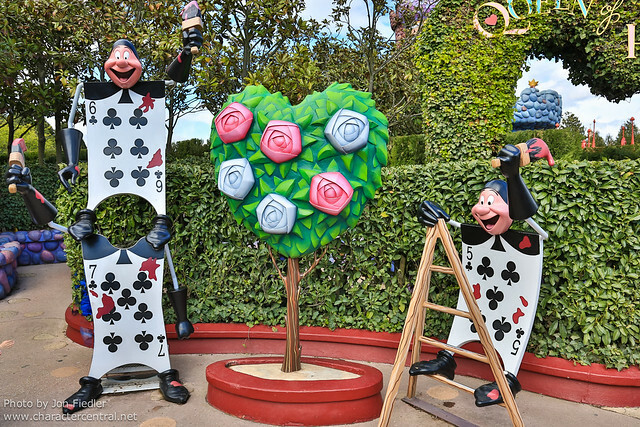 Alice in Wonderland takes you on a whimsical journey down the rabbit hole to Wonderland, where you’ll encounter giant flowers, mad tea parties, the Queen of Hearts, the Cheshire Cat, and much more. 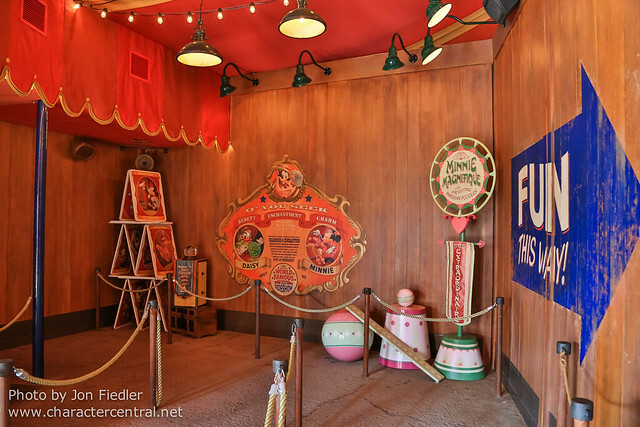 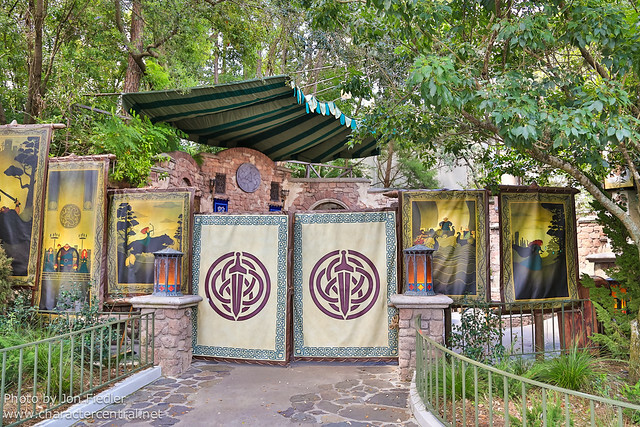 Disneyland recently upgraded this attraction to include some brand new special effects, some of which may not be represented in the photos below, as we are behind on editing photos. 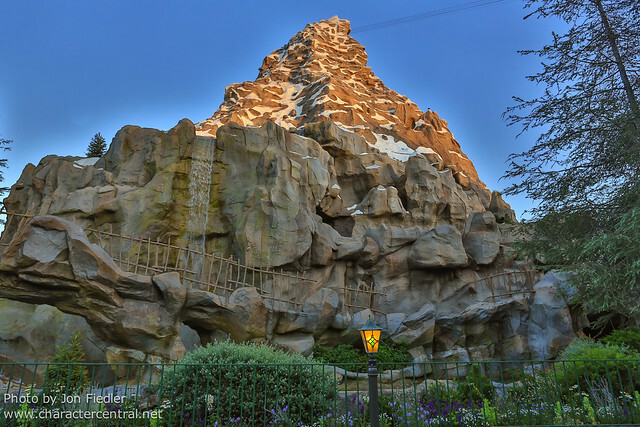 The Matterhorn Bobsleds are a high energy rollercoaster ride through the Matterhorn Mountain. 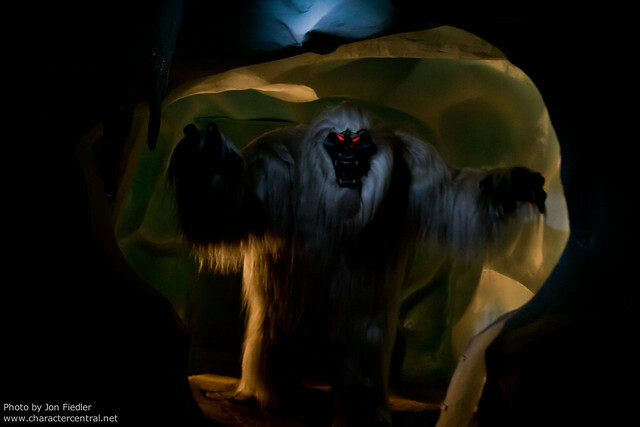 On the way you may even encounter the Yeti! 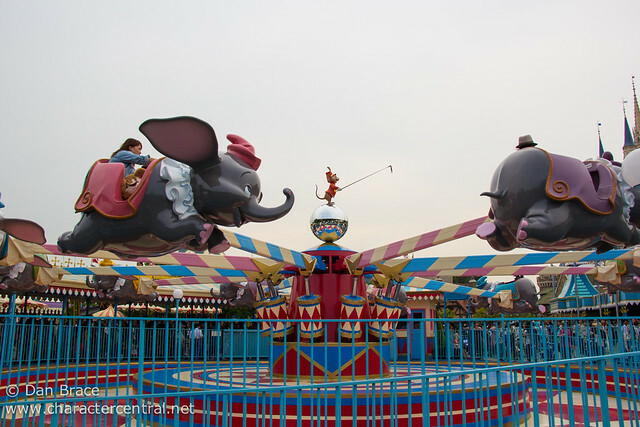 Although it’s a unique attraction, this one is actually a lot less fun than it looks, at least in our experience. 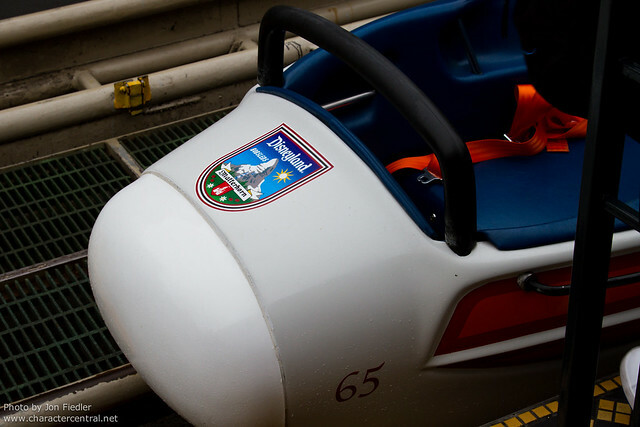 The bobsleds themselves are very cramped, uncomfortable, and you get bumped quite vigorously while riding, making the overall enjoyment of this attraction quite low. 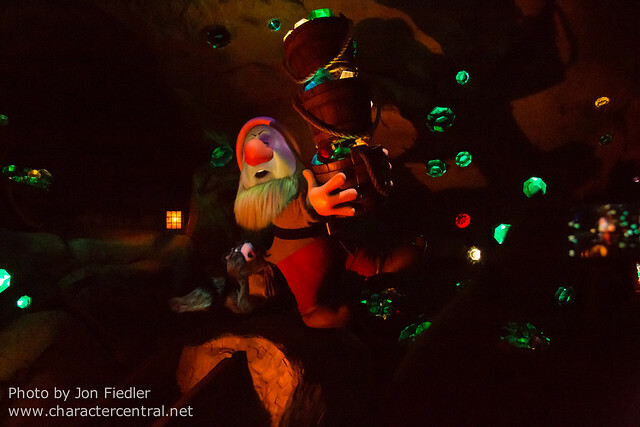 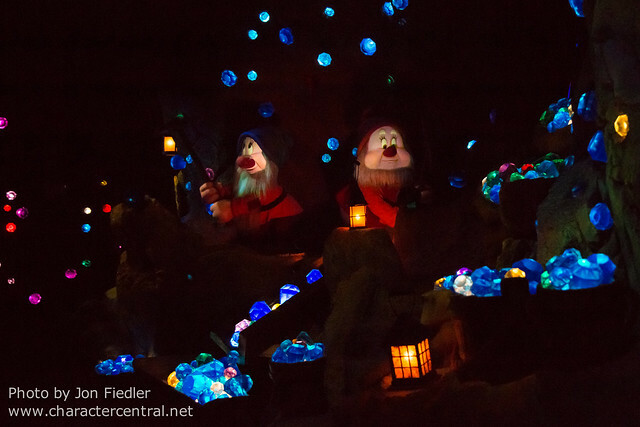 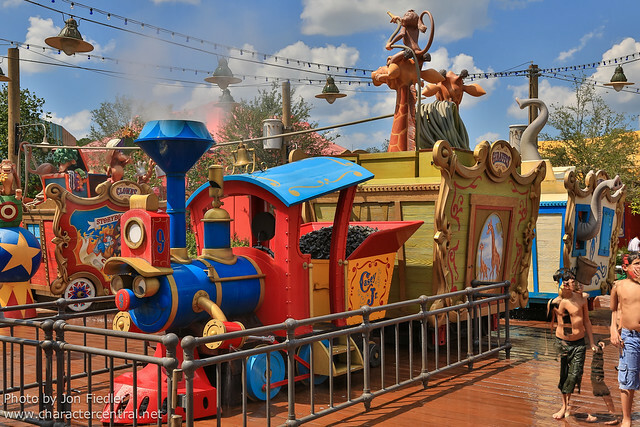 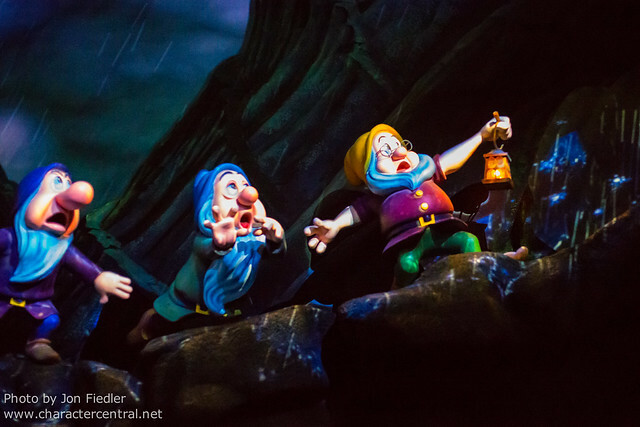 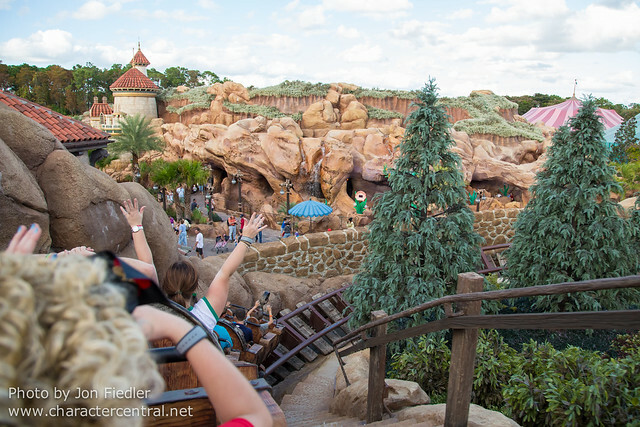 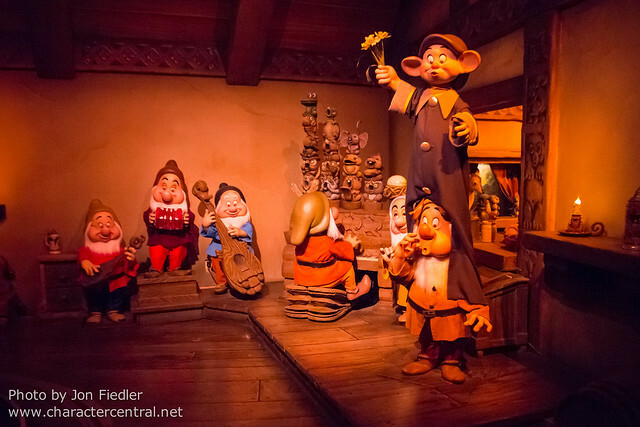 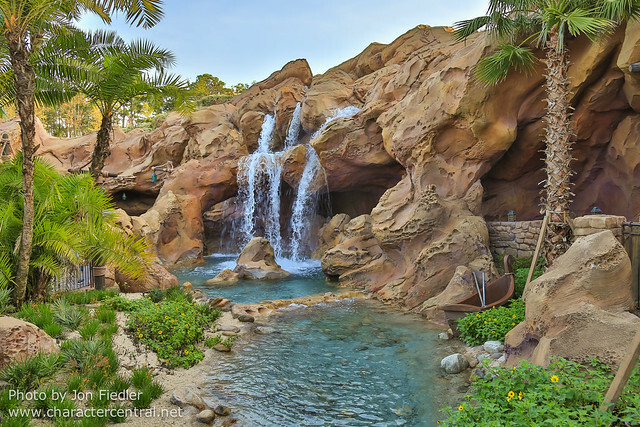 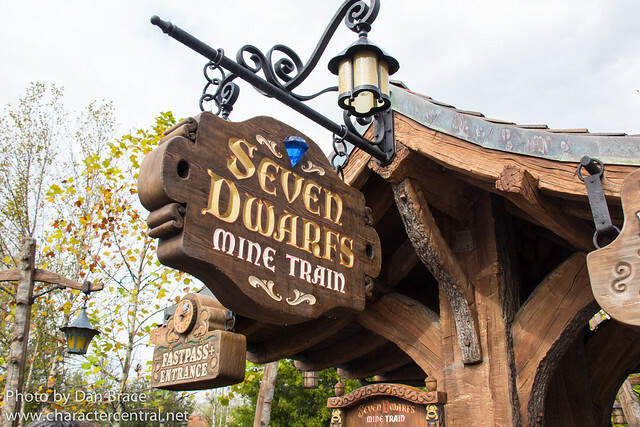 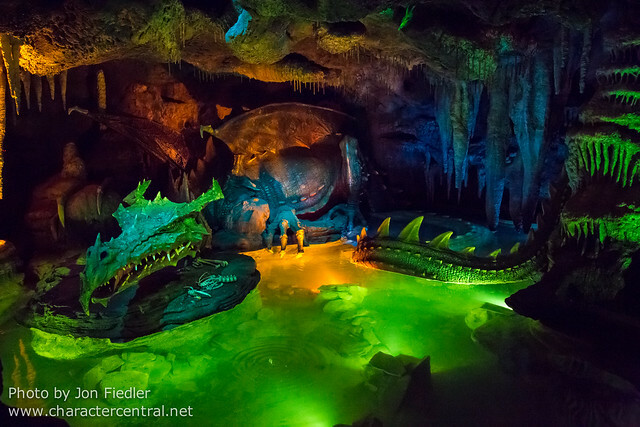 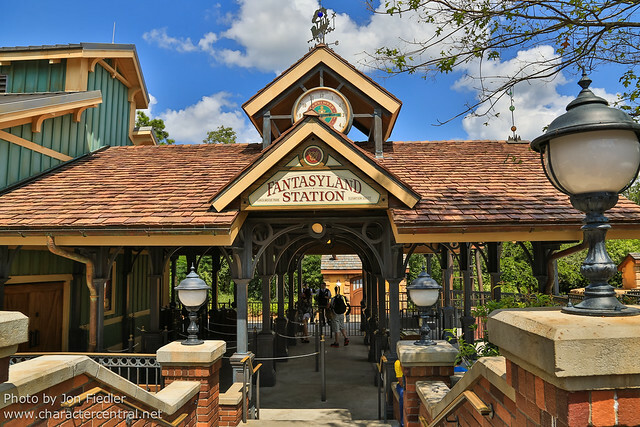 At the Magic Kingdom you can splash around in the Casey Splash ‘N’ Soak Station play area, or take a trip down a diamond mine, on the Seven Dwarfs Mine Train. 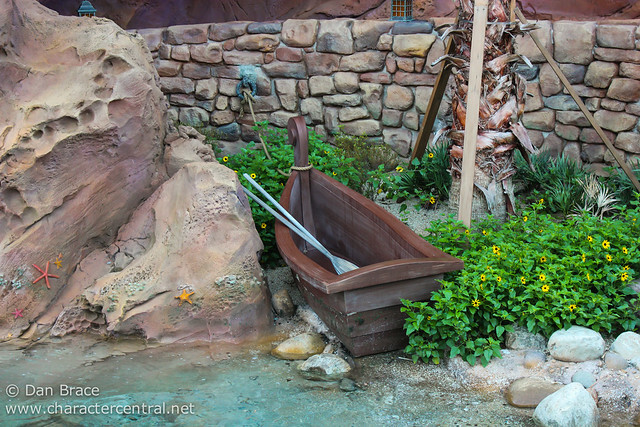 The Mine Train for us was a little underwhelming. 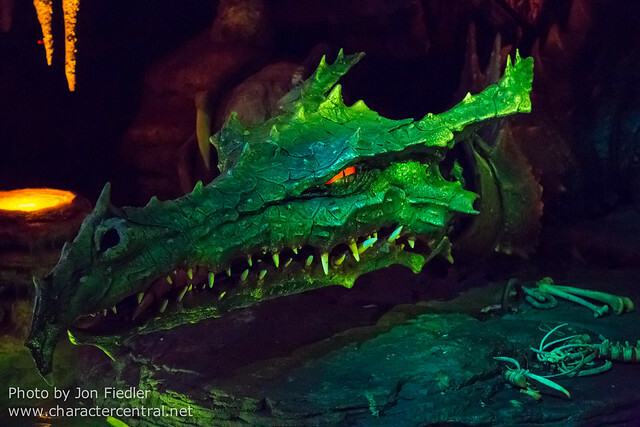 There is a good build up, but it ends too quickly, and while the animatronics are good, there aren’t nearly enough of them and the final scene at the cottage uses old style models that feel out of place with the digitally projected faces you see about a minute prior, down the mine. 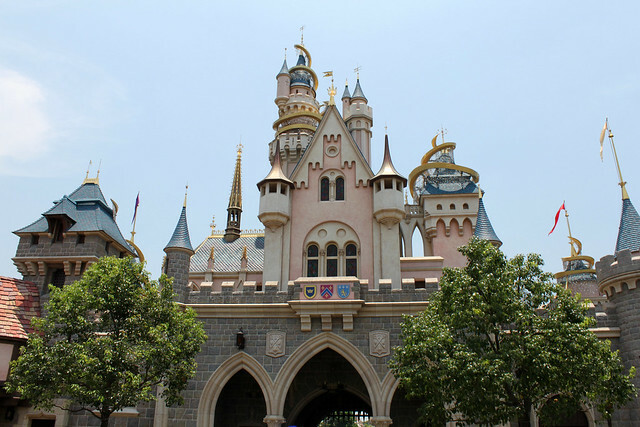 It should be noted that while this is currently a unique attraction to the Magic Kingdom, it is currently also being built at Shanghai Disneyland, which is expected to open around spring next year. 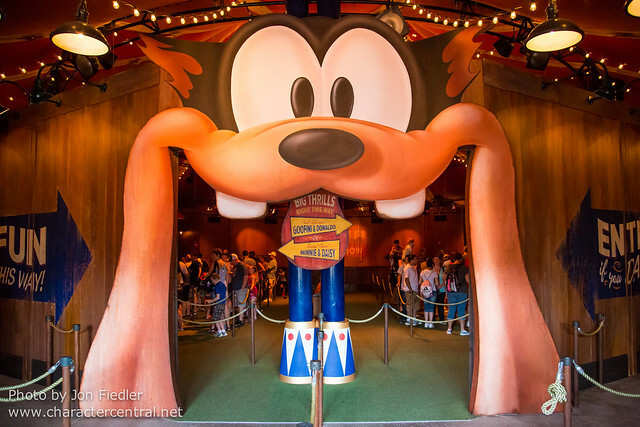 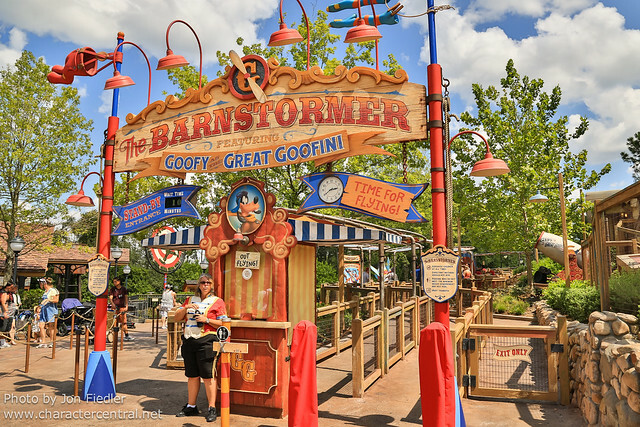 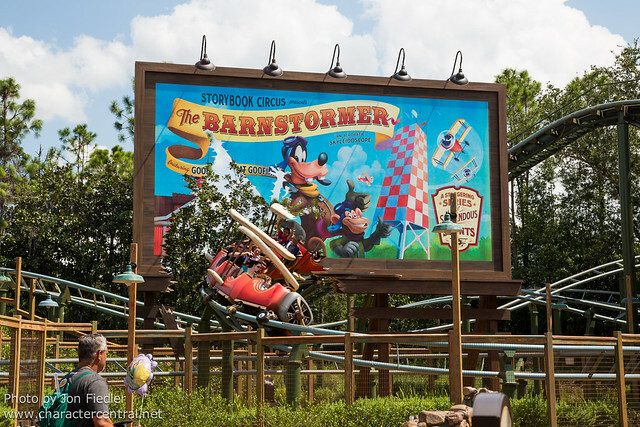 The Magic Kingdom also has The Barnstormer featuring the Great Goofini. 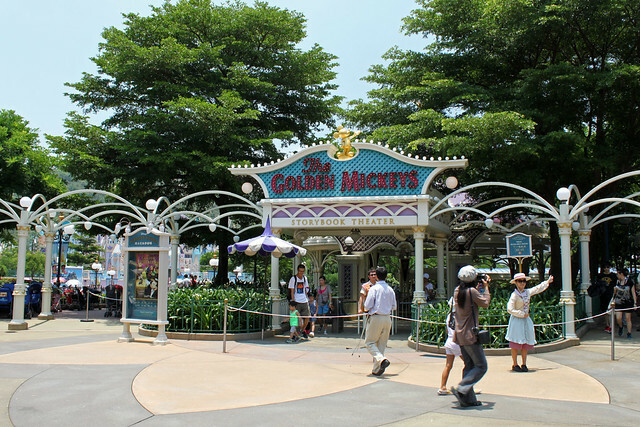 I am calling this one unique, although it should be noted that both Disneyland and Tokyo Disneyland’s Toontown have a version of this coaster, in the form of Gadget’s Go Coaster. 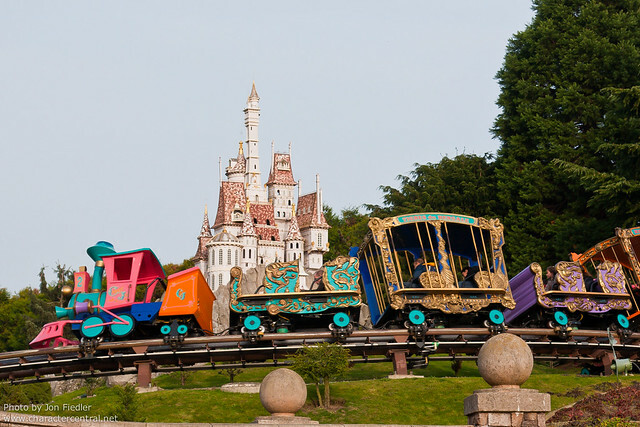 While they are manufactured by the same company, are virtually the same height and length, the theming is completely different, and neither bear any resemblance to the other. 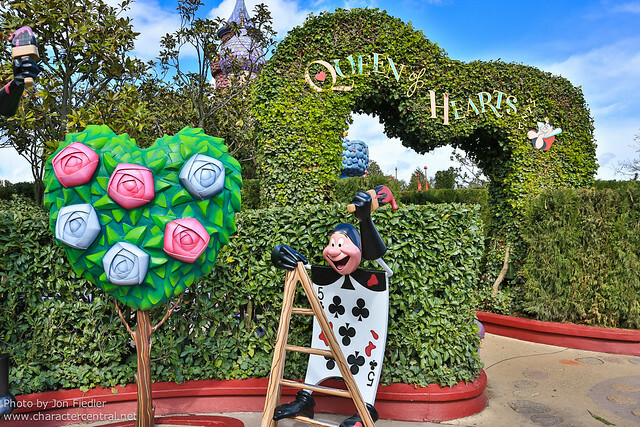 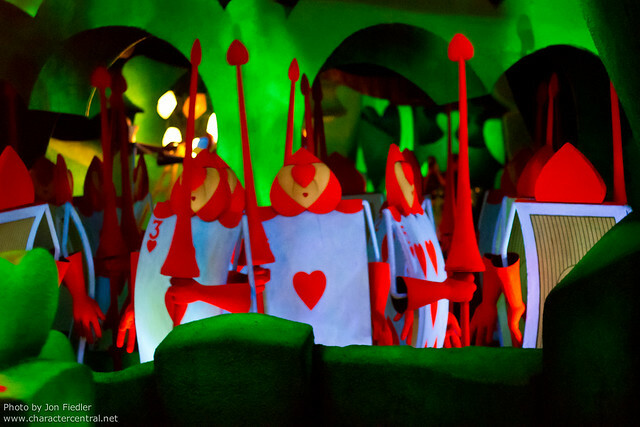 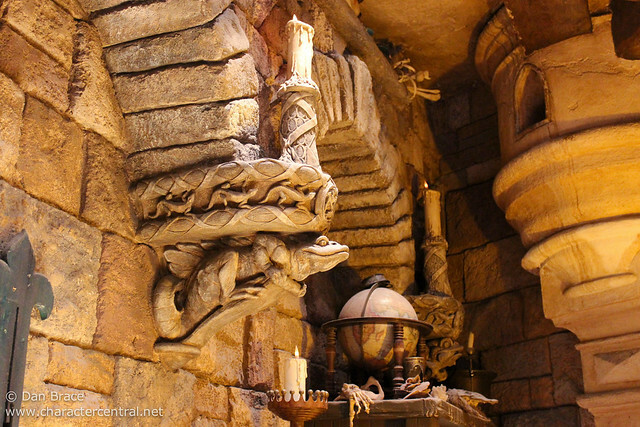 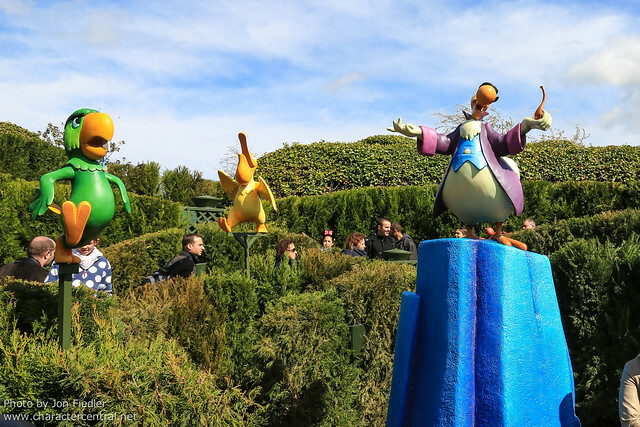 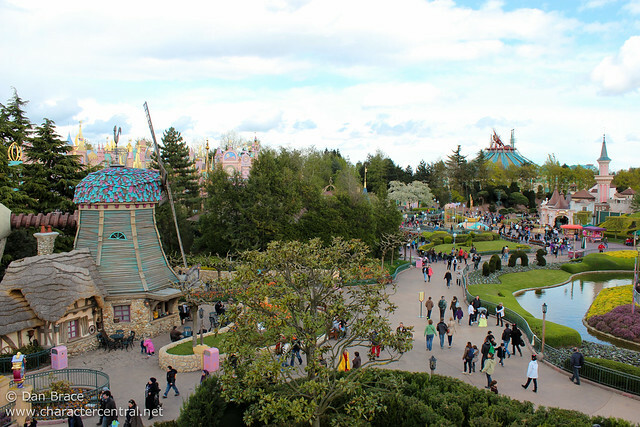 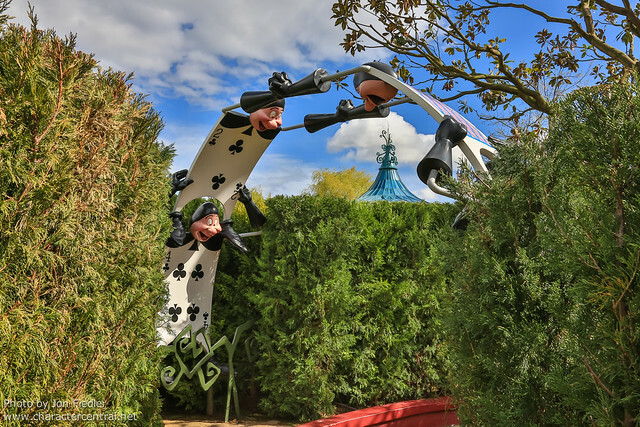 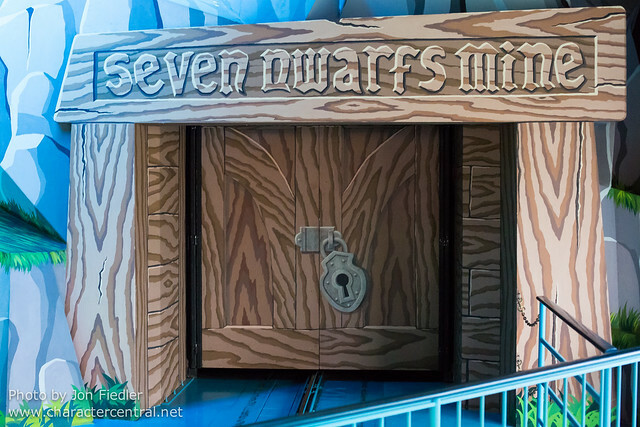 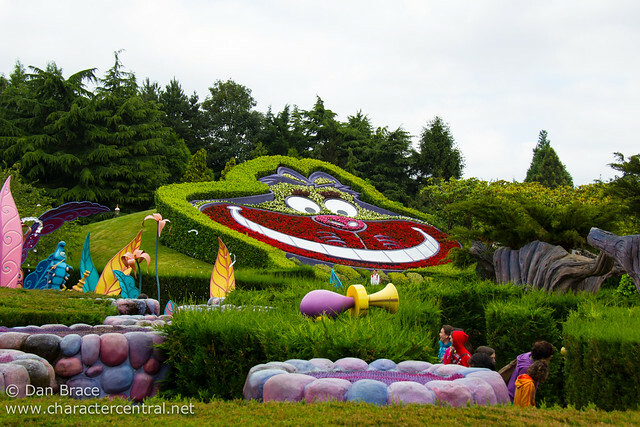 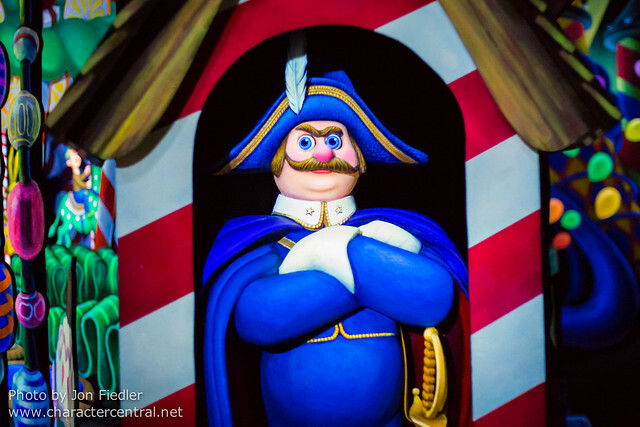 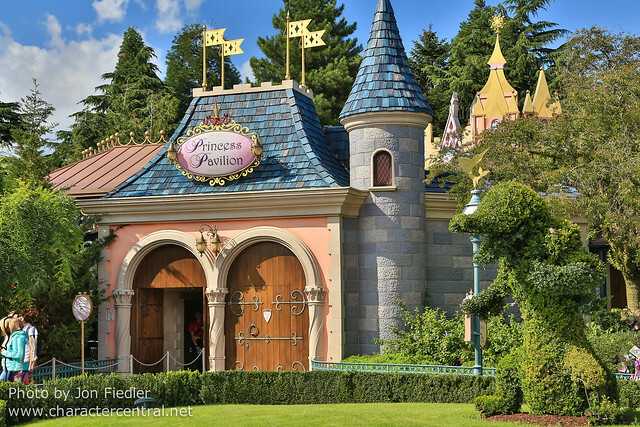 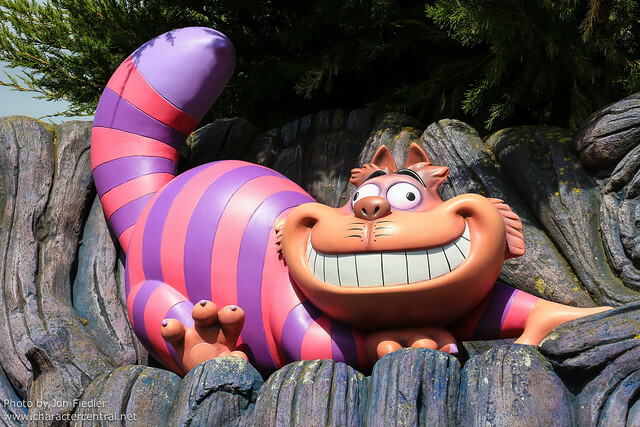 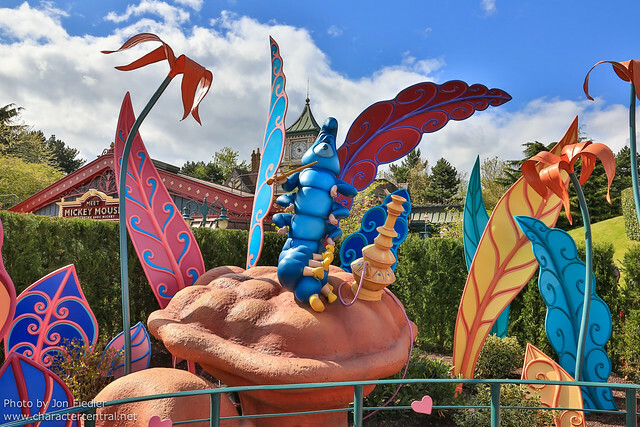 Disneyland Paris features a beautifully crafted maze, Alice’s Curious Labyrinth, which features photo opportunities and another Disney castle - belonging to the Queen of Hearts. 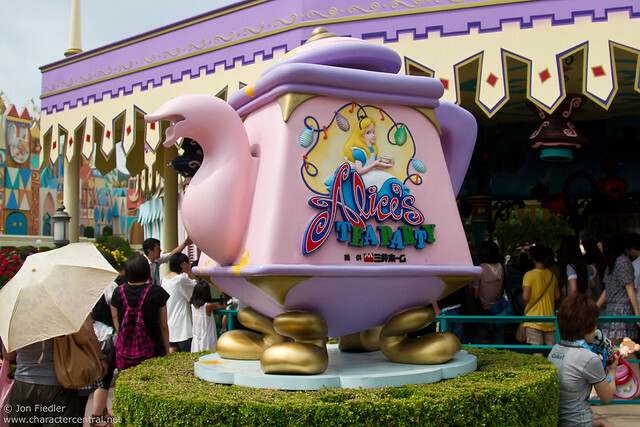 This has been a unique attraction to Disneyland Paris for over twenty years now, but there is a strong suggestion that a similar Alice themed attraction could find its home in the new Shanghai Disneyland; but we shall have to wait and see on that one. 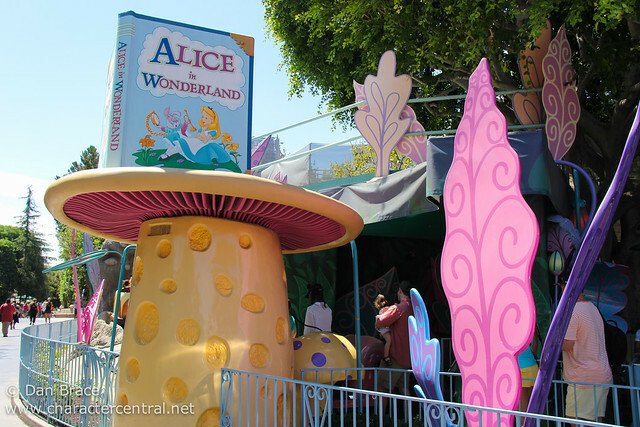 Also, Hong Kong Disneyland is currently developing a maze for their Fantasyland, but it will be princess themed, not Alice. 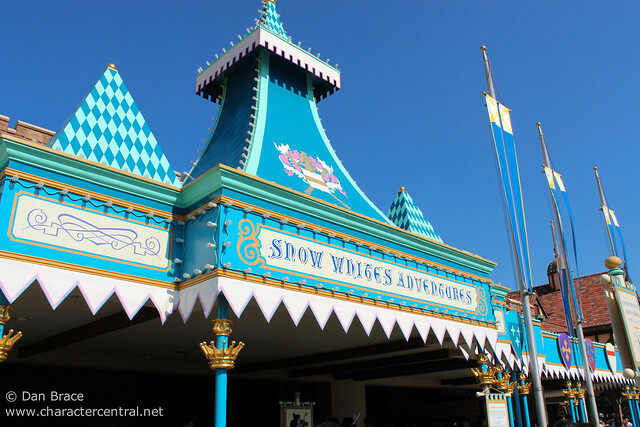 Finally for attractions, I wanted to mention two things. 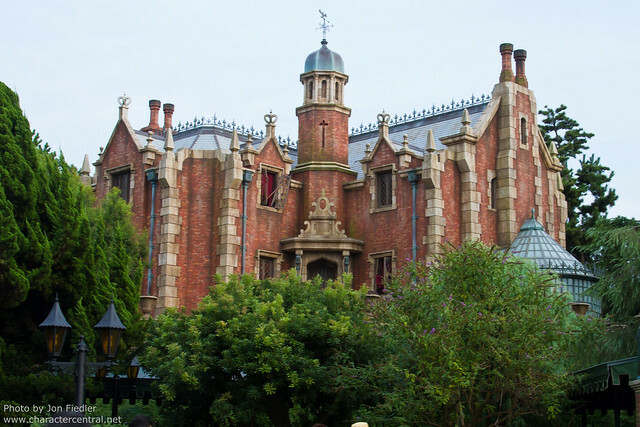 We already discussed the Haunted Mansion in the previous article, but it should be noted that the Haunted Mansion in Tokyo is technically located in Fantasyland. 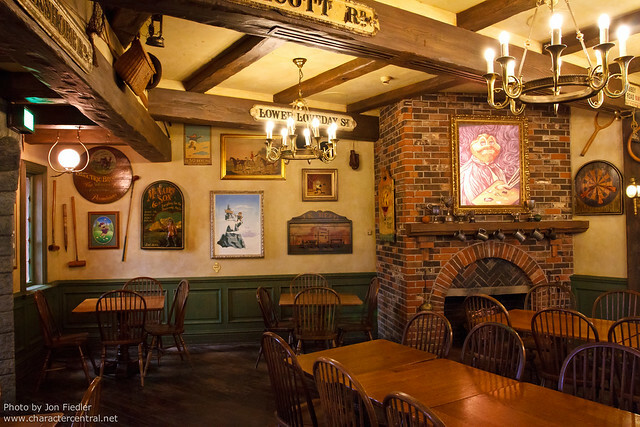 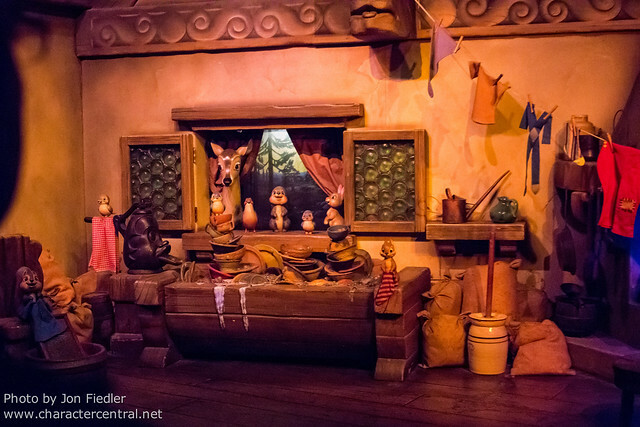 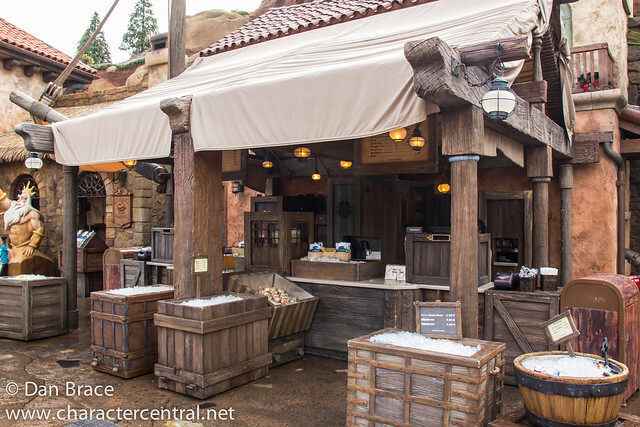 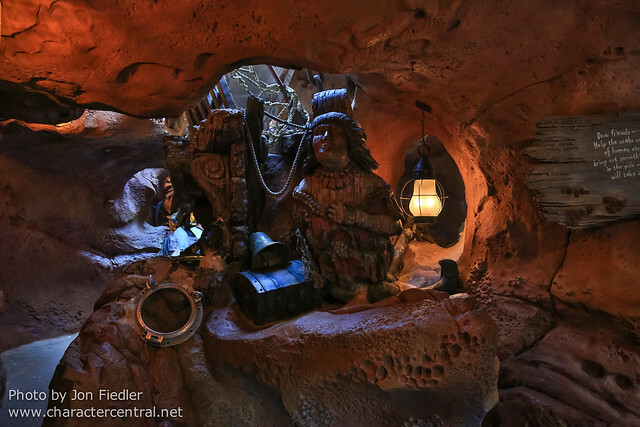 I’ll put a photo below for reference, but to find out more information, and why I included it in the Frontierland tour, you’ll have to see that part. 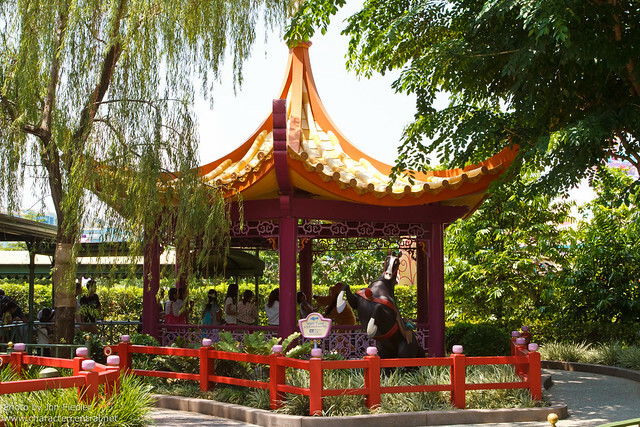 The second point is that I have covered unique attractions at all the parks, except Hong Kong. 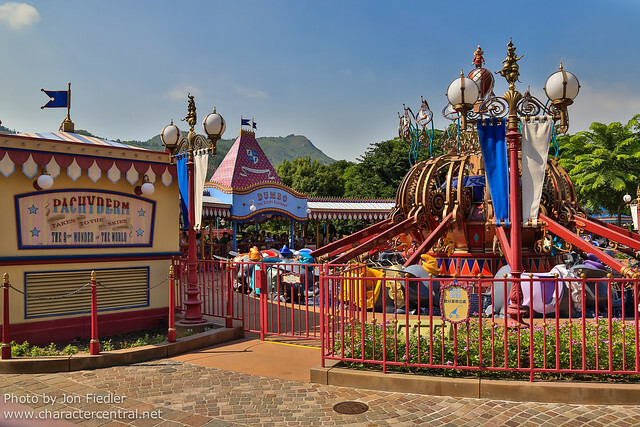 Sadly, at least at the moment, Hong Kong Disneyland does not feature any unique attractions. 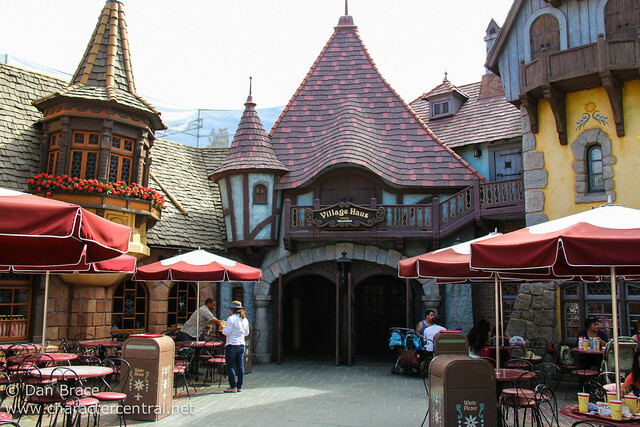 So now we are finally done with attractions, let’s see what other locations there are in Fantasyland. 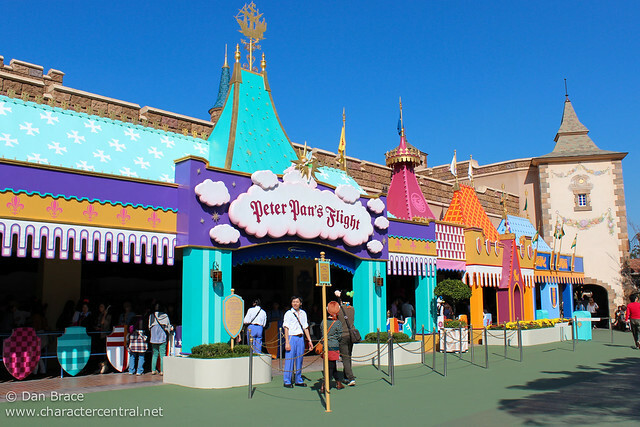 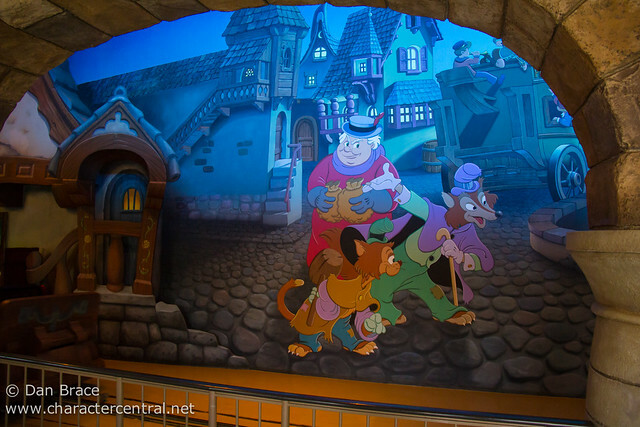 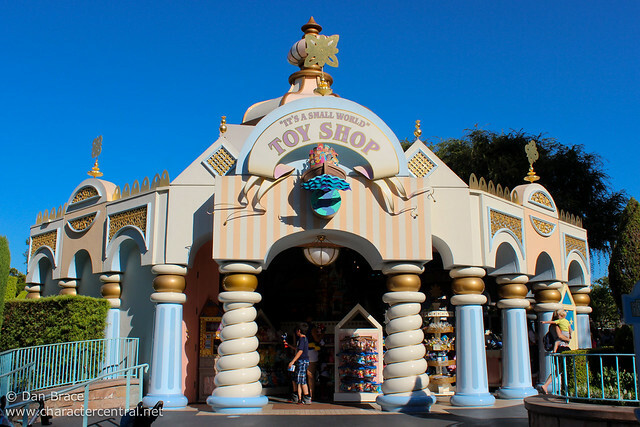 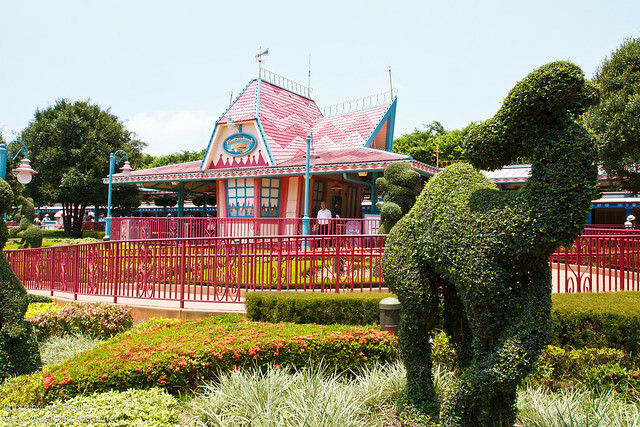 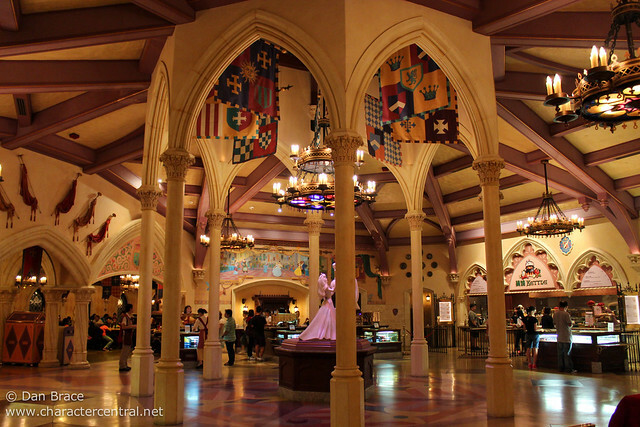 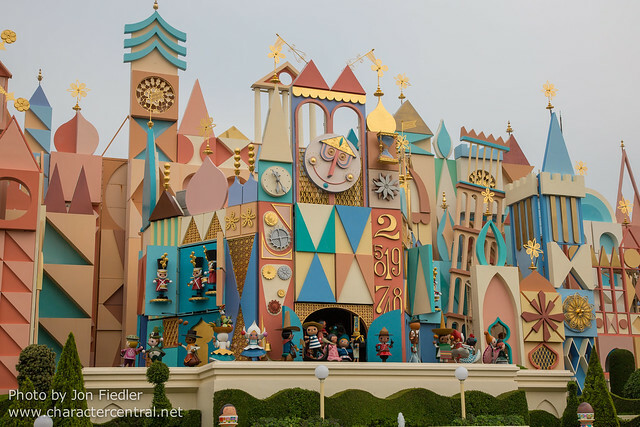 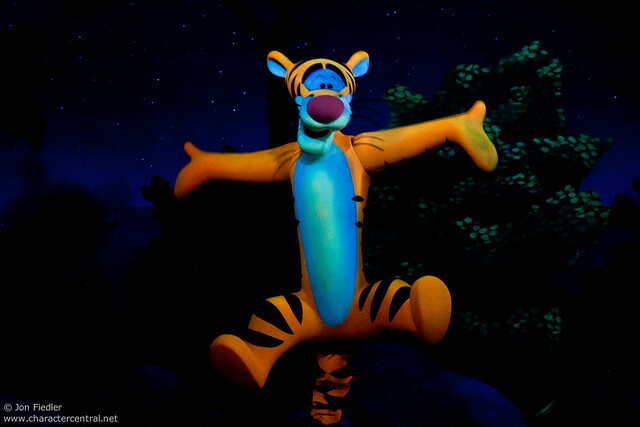 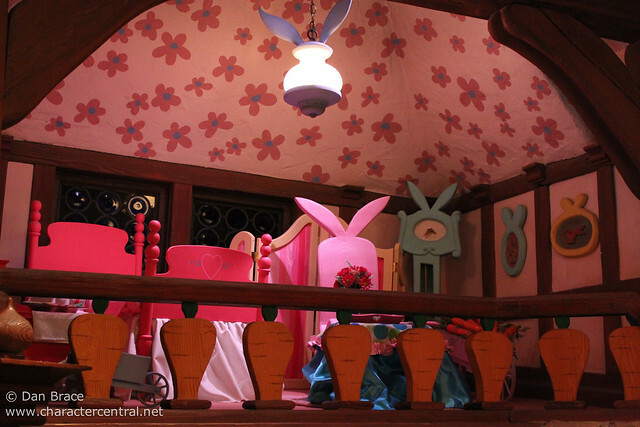 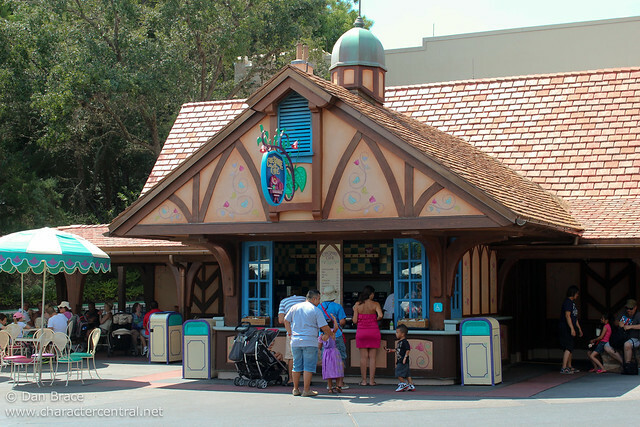 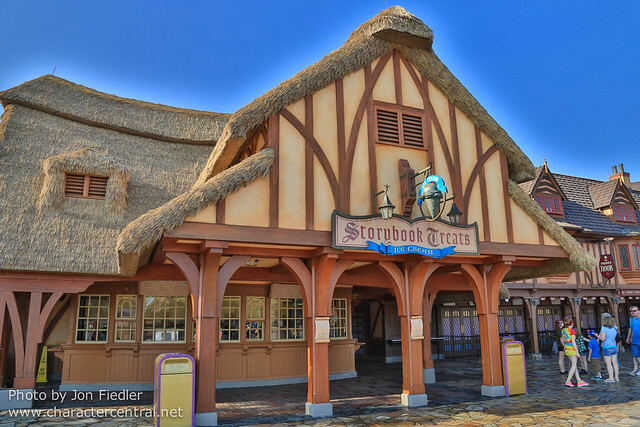 Each Fantasyland, except Tokyo, has dedicated areas for Disney character meet ‘n’ greets, and while the characters can change sometimes, the buildings usually stay the same. 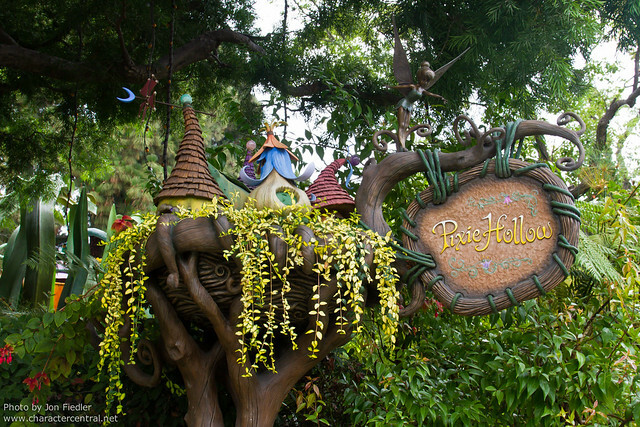 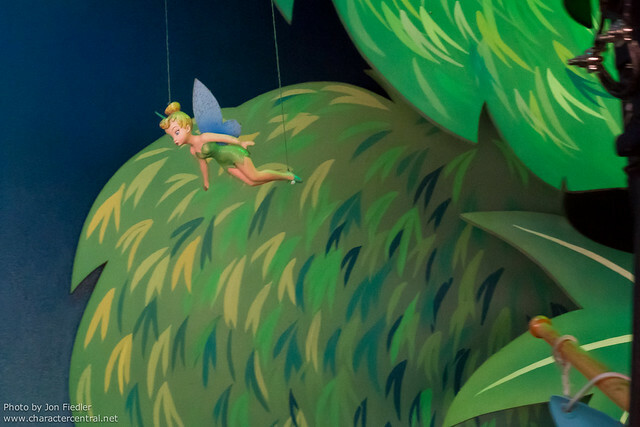 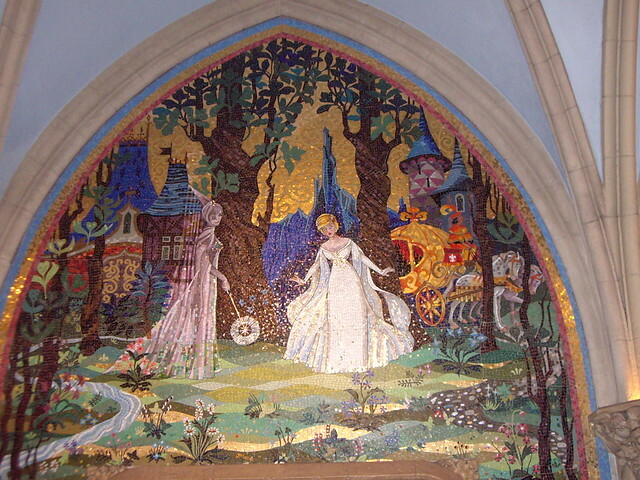 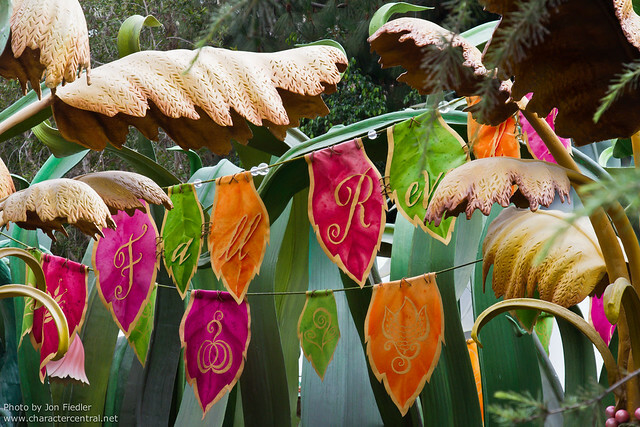 At Disneyland, you can meet the princesses inside Royal Hall, and Disney Fairies in Pixie Hollow. 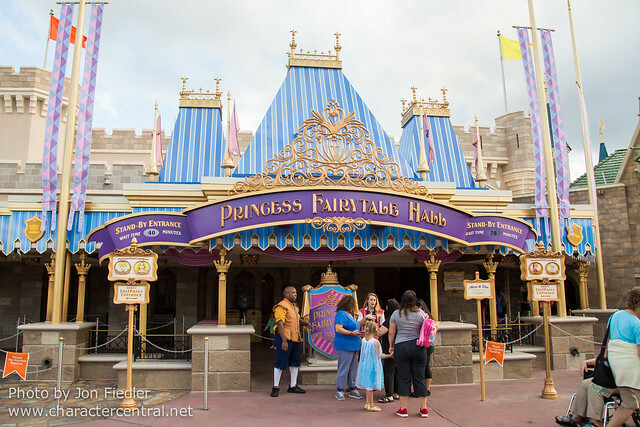 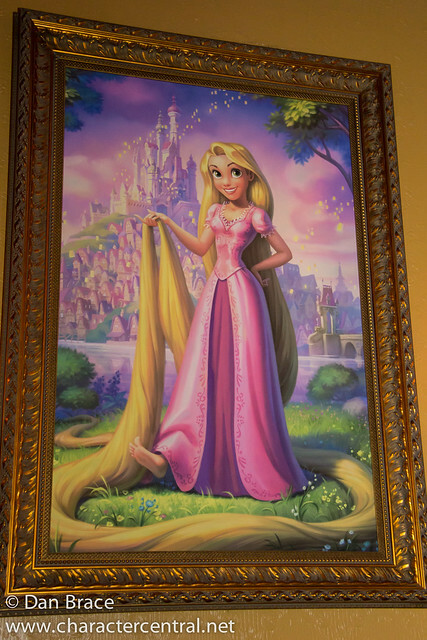 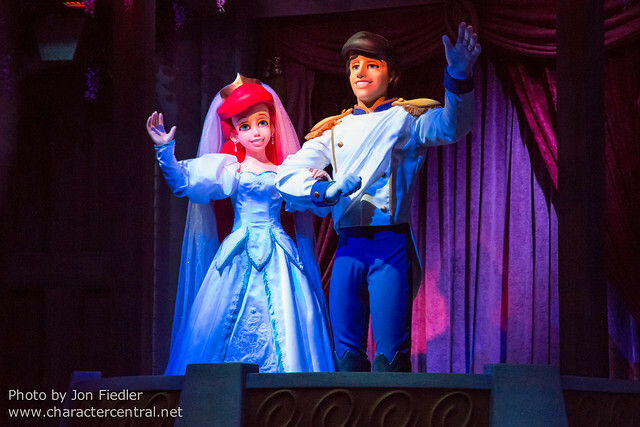 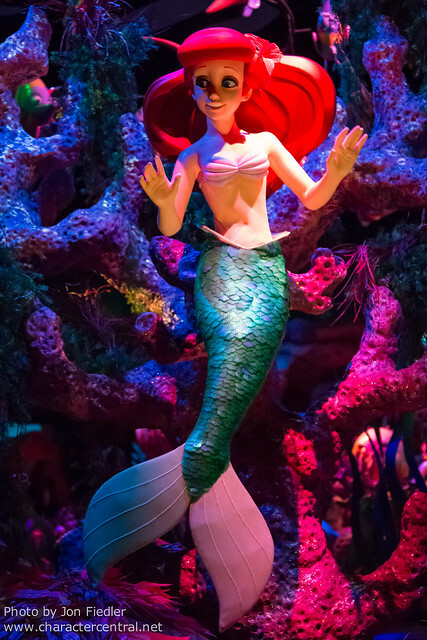 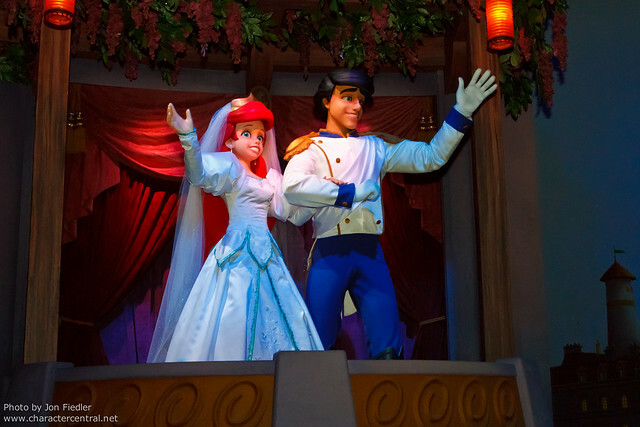 At the Magic Kingdom, you can meet the princesses at Princess Fairytale Hall, some of Mickey’s friends at Pete’s Silly Sideshow and Ariel in her grotto. 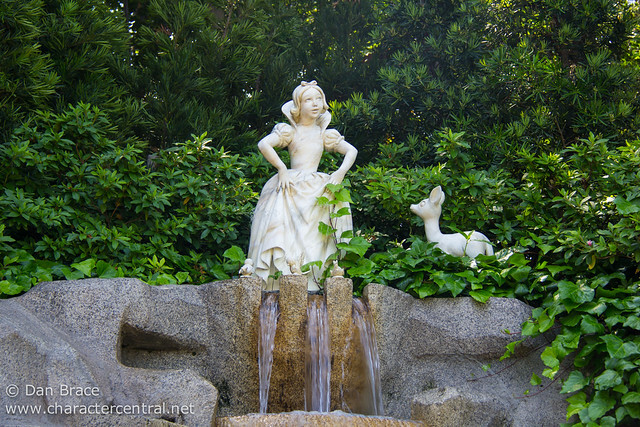 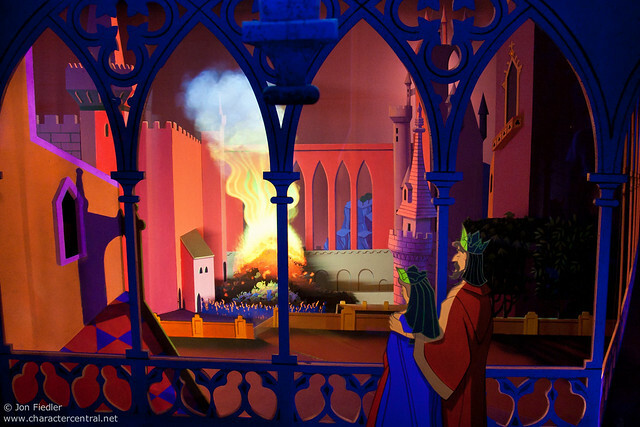 The Fairytale Garden has also been a long term spot for princesses, and currently it is Merida who occupies this location, but as with everything, that could change. 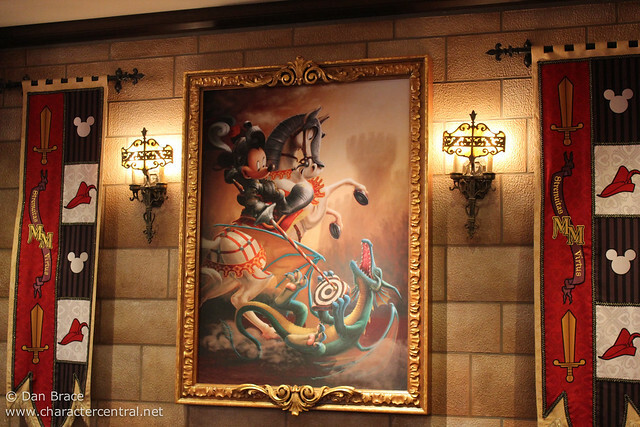 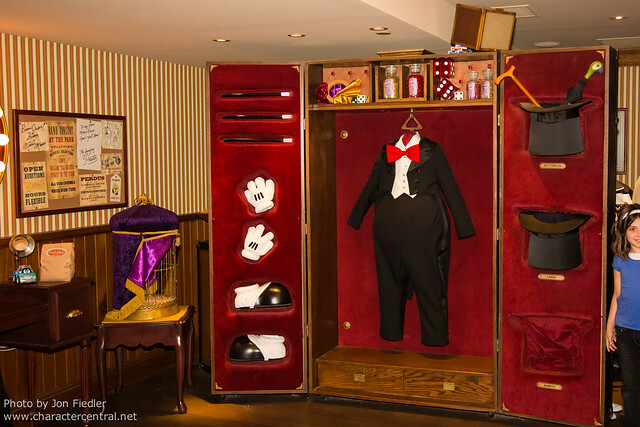 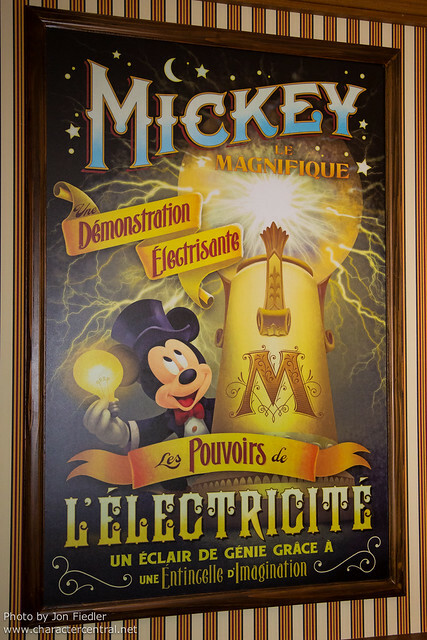 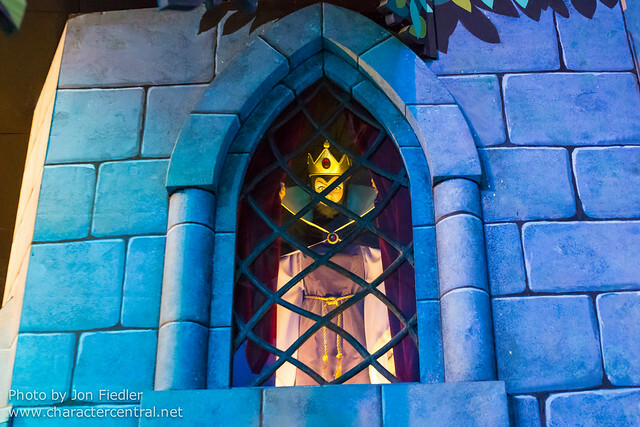 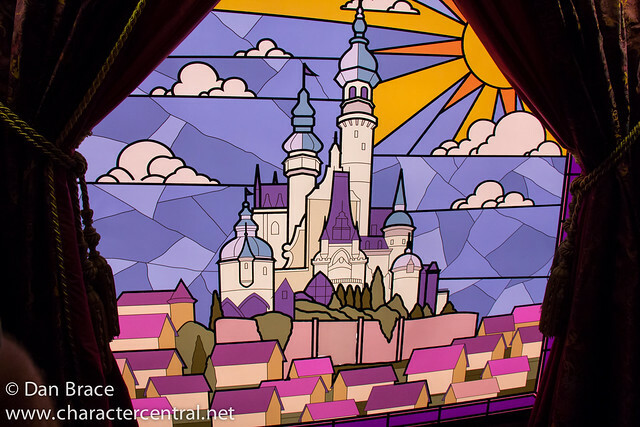 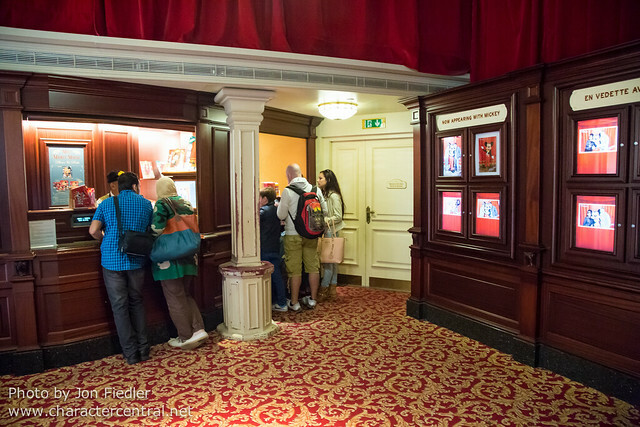 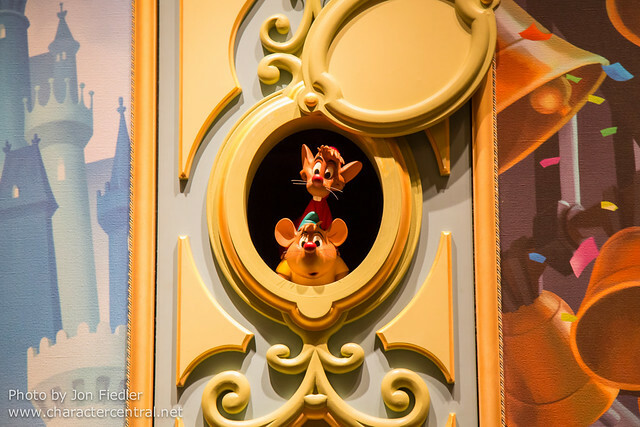 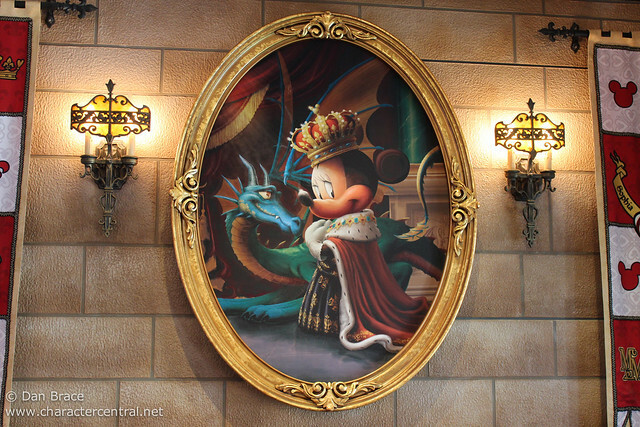 At Disneyland Paris, Mickey has a permanent home inside the Fantasyland Theatre, at Meet Mickey Mouse. 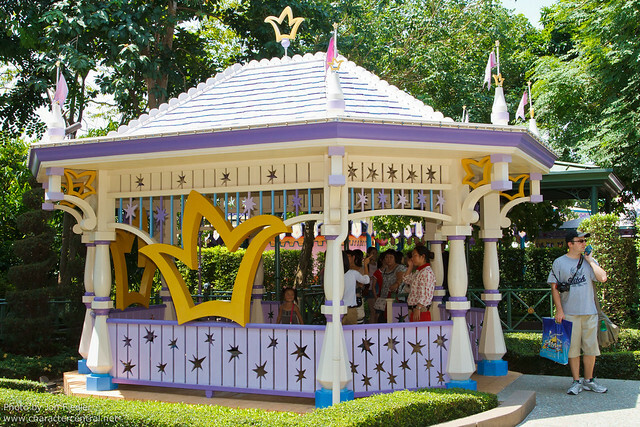 You can meet princesses at the Princess Pavilion. 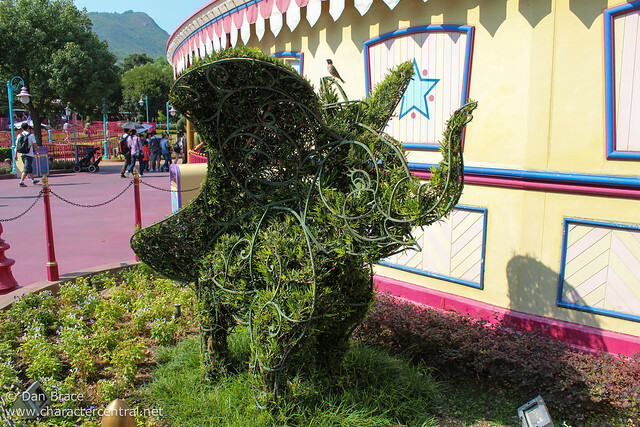 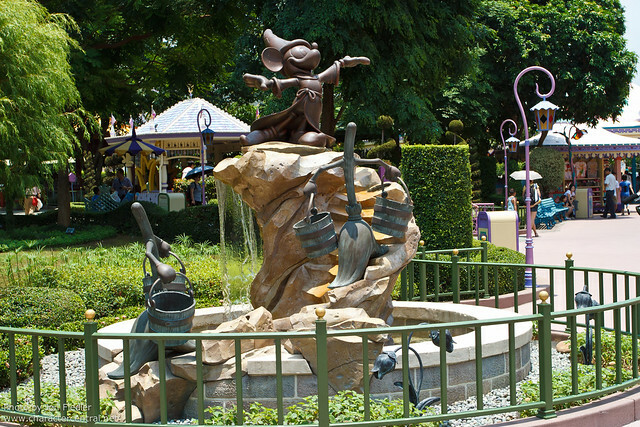 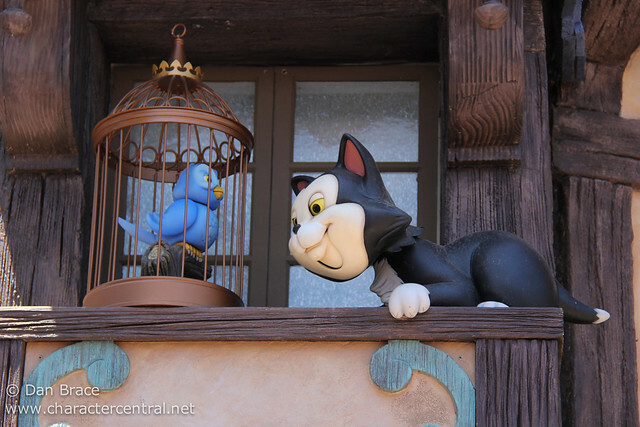 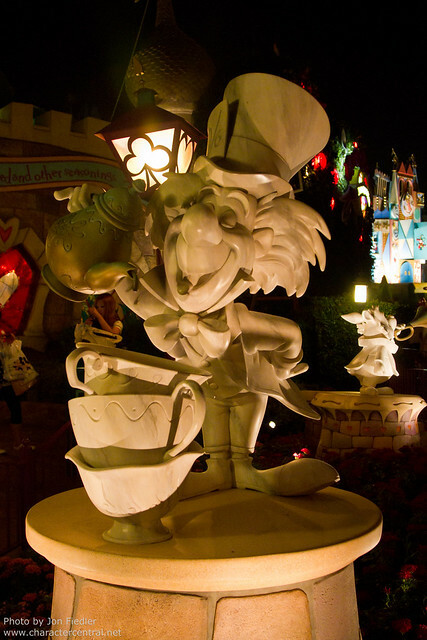 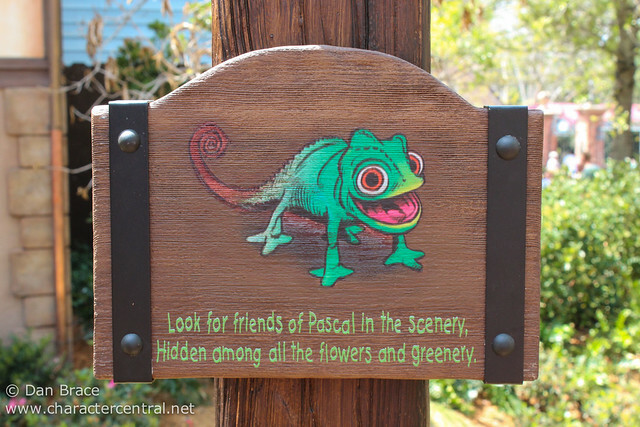 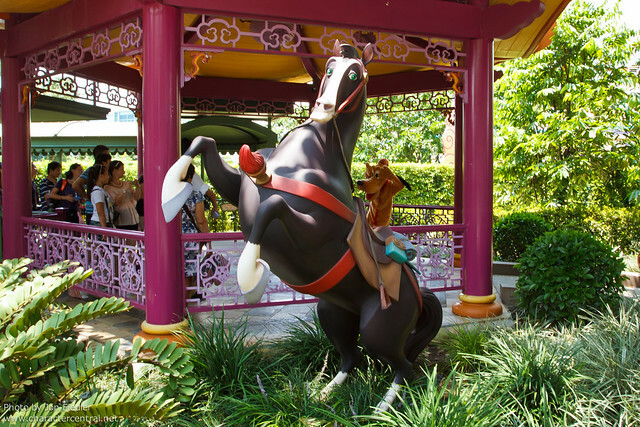 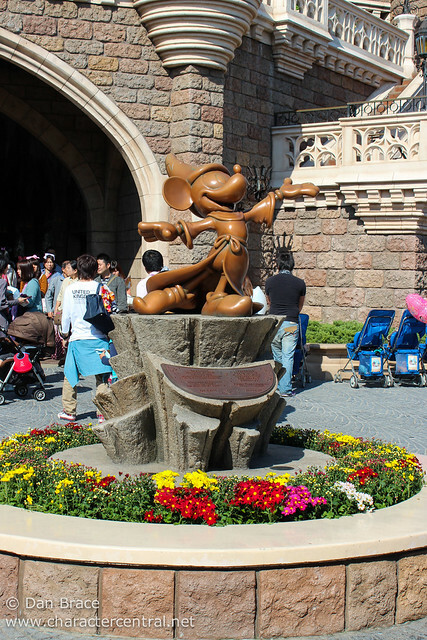 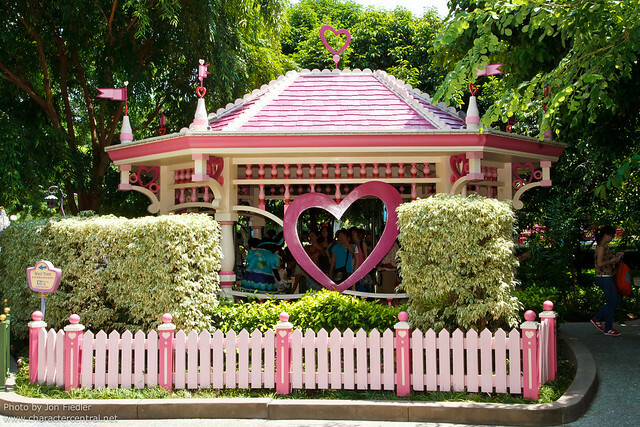 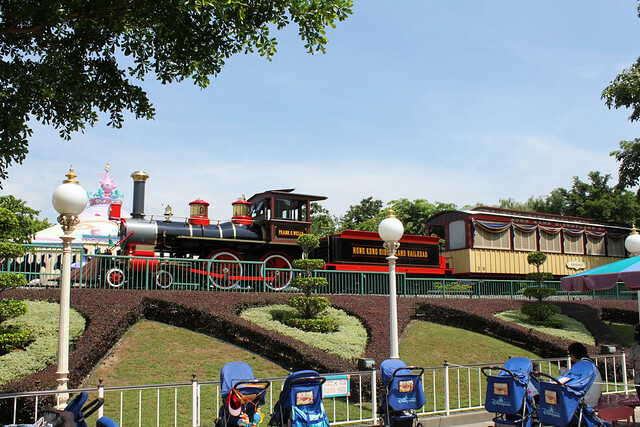 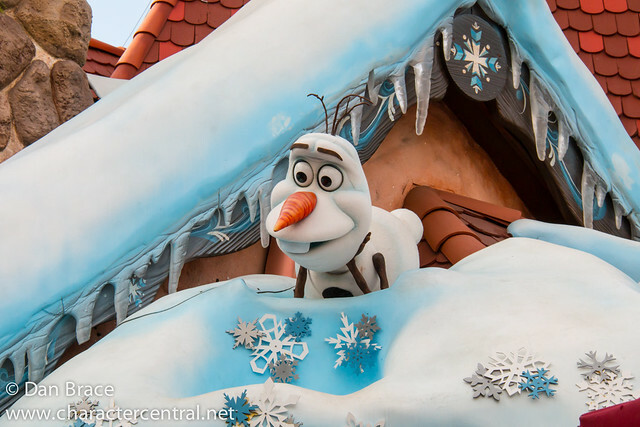 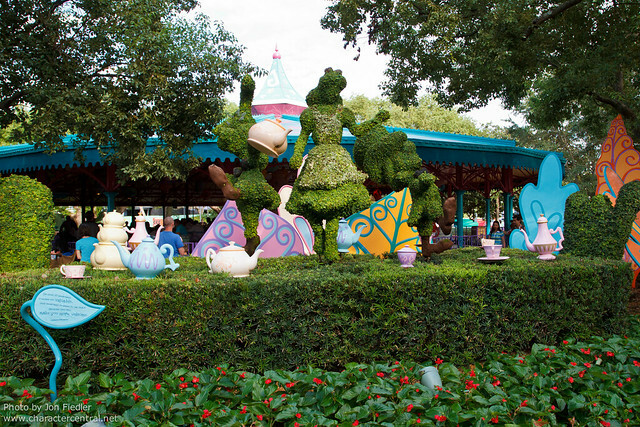 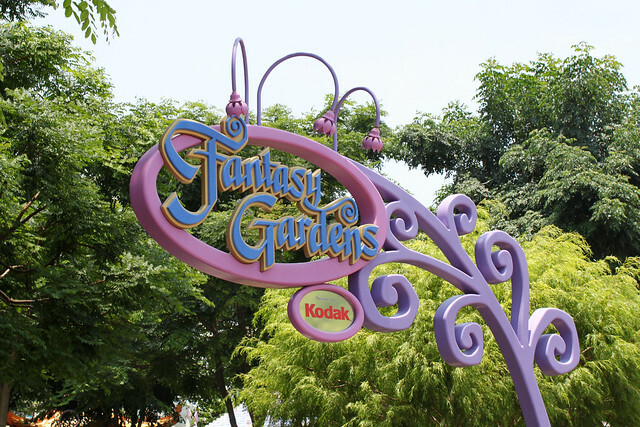 At Hong Kong Disneyland, you can meet variety of Disney friends at Fantasy Gardens. 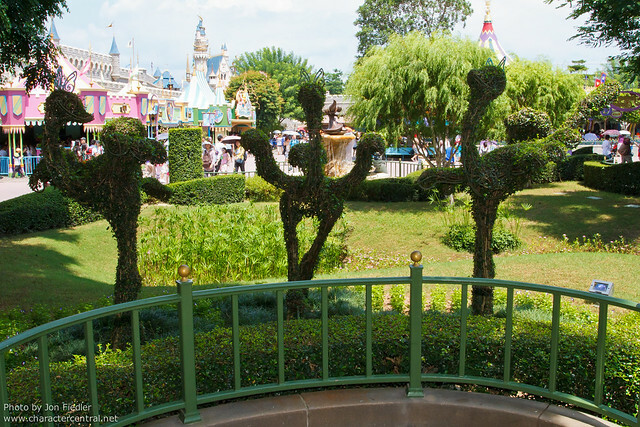 this is a really well thought out area with topiaries and statues, shaded by trees and the greeting gazebos. 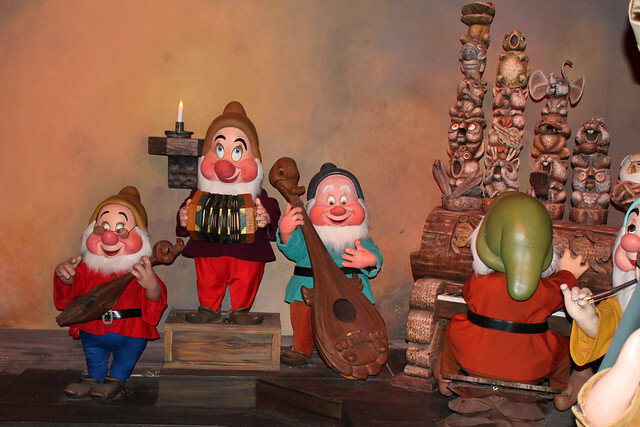 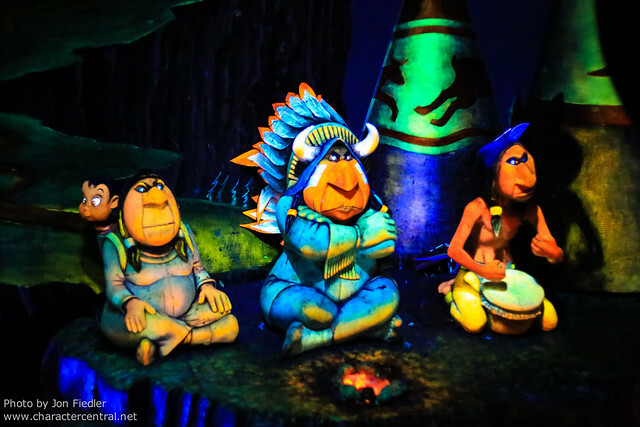 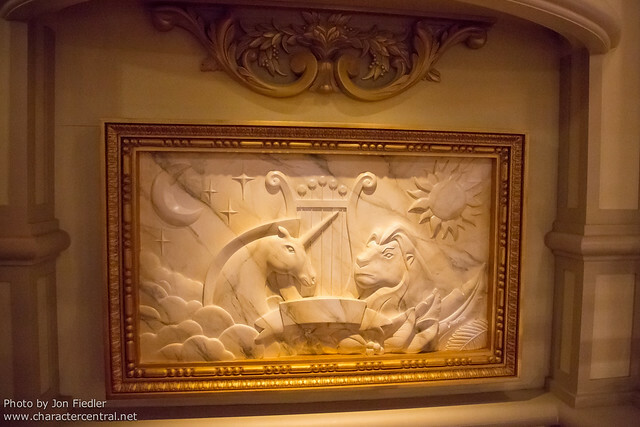 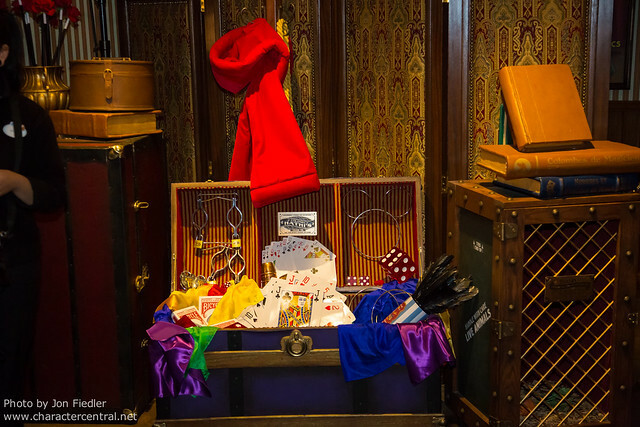 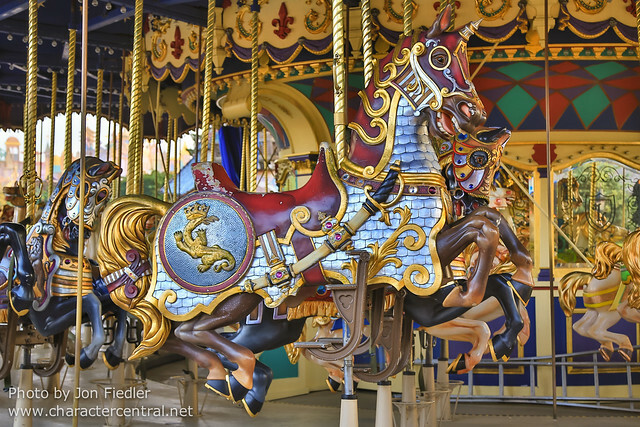 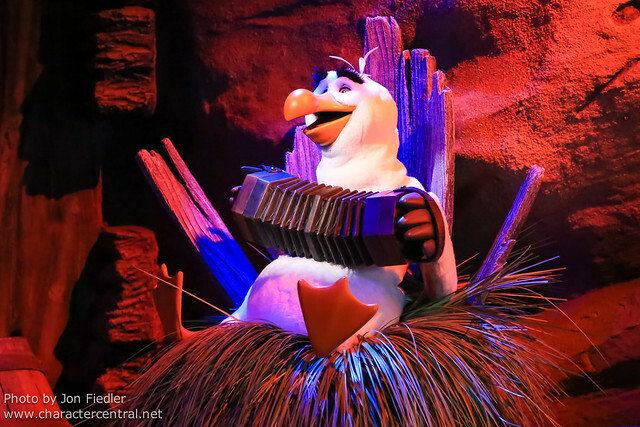 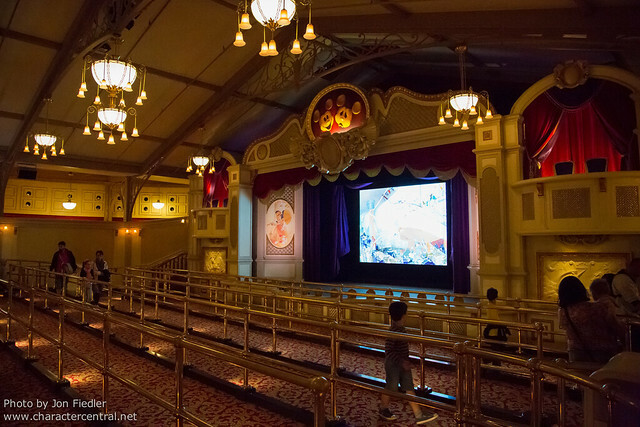 Entertainment is also another factor that can be very variable, and so I won’t comment too much on the entertainment in each Fantasyland, but we can at least look at some of the permanent features. 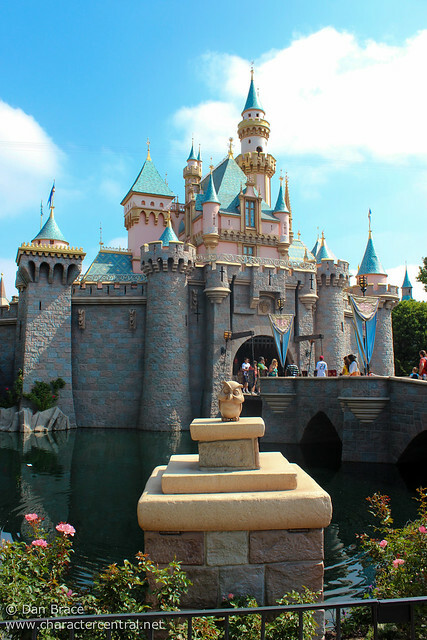 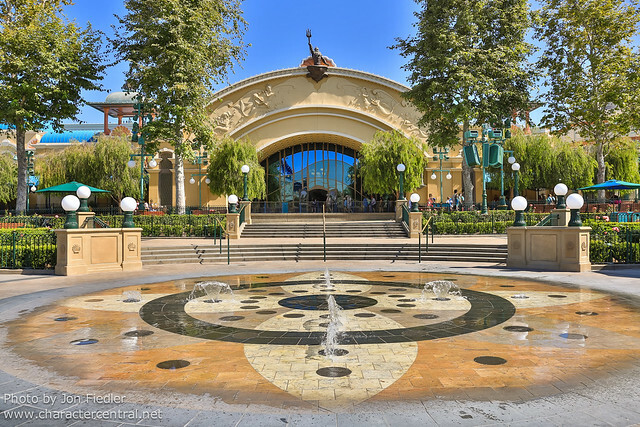 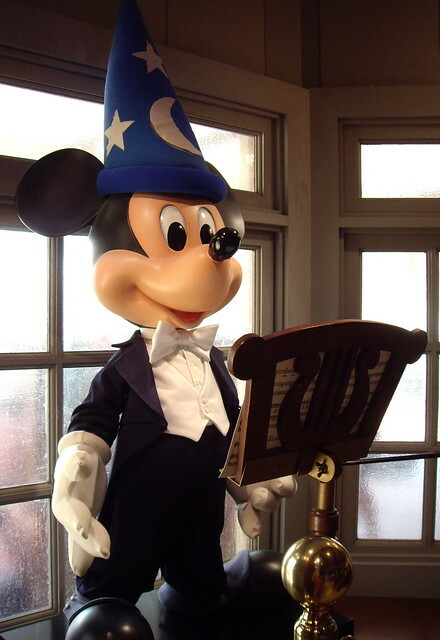 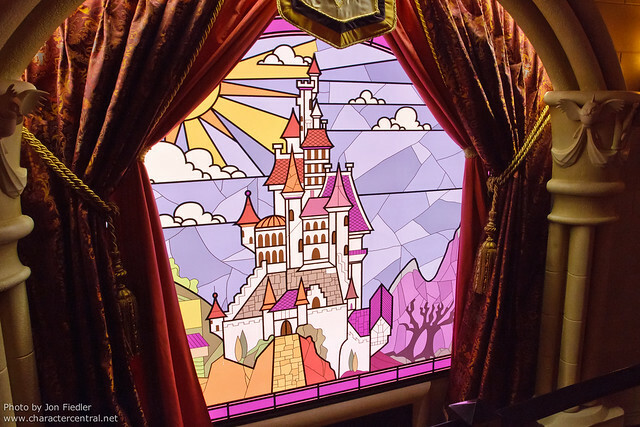 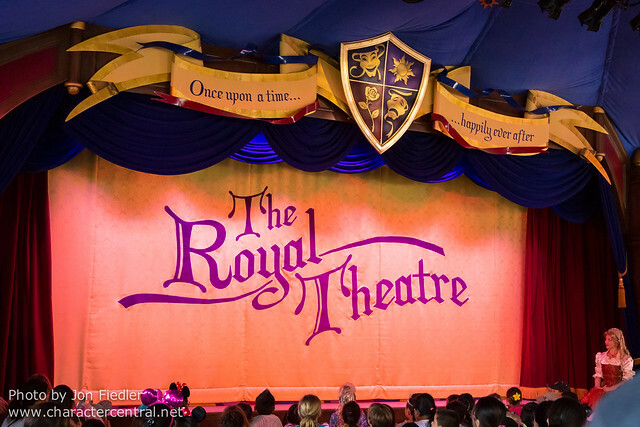 At Disneyland, you can catch shows which are usually related to different princesses, at the Royal Theatre, and the Fantasyland Theatre is home to large scale productions, such as Mickey and the Magical Map. 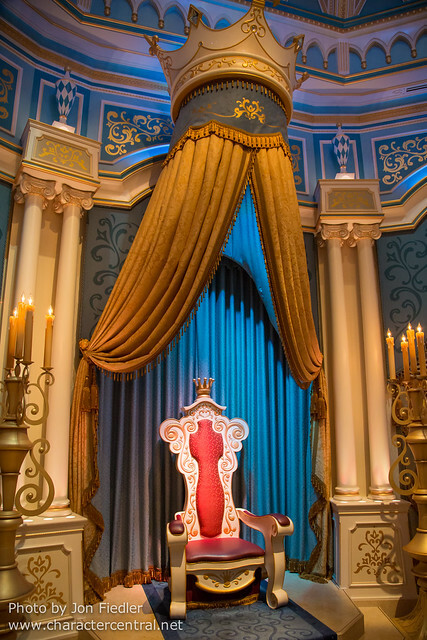 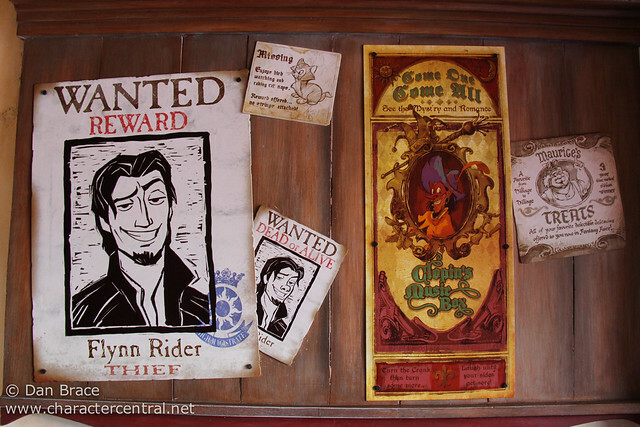 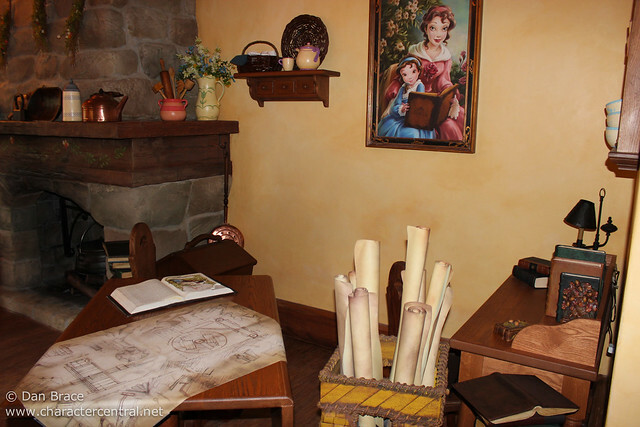 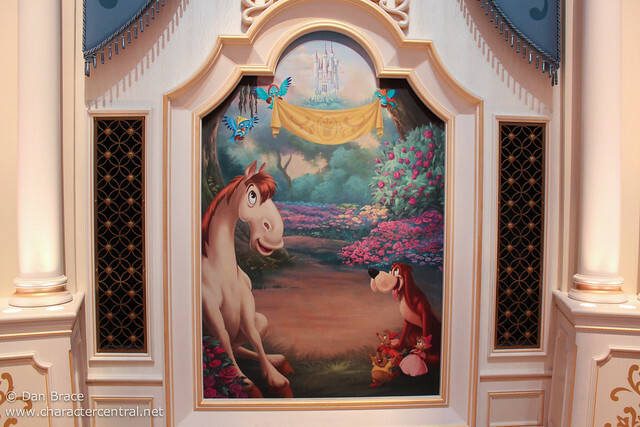 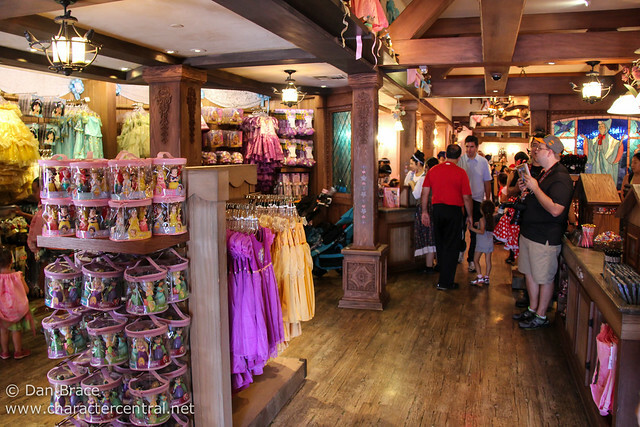 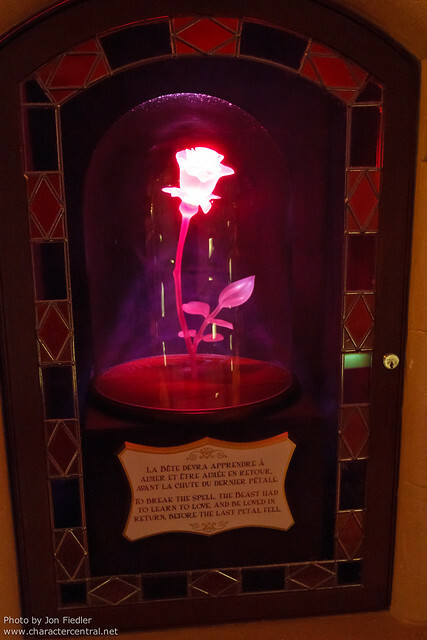 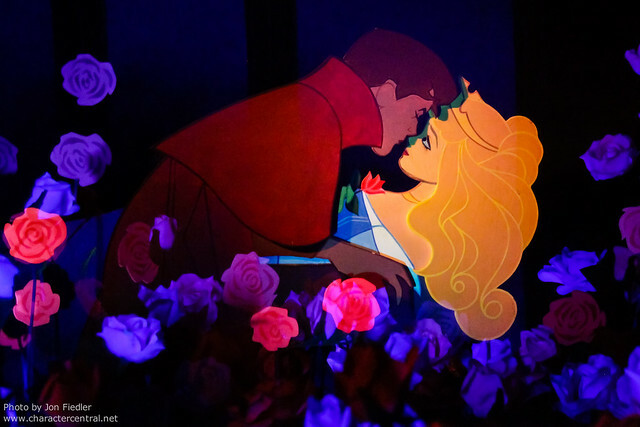 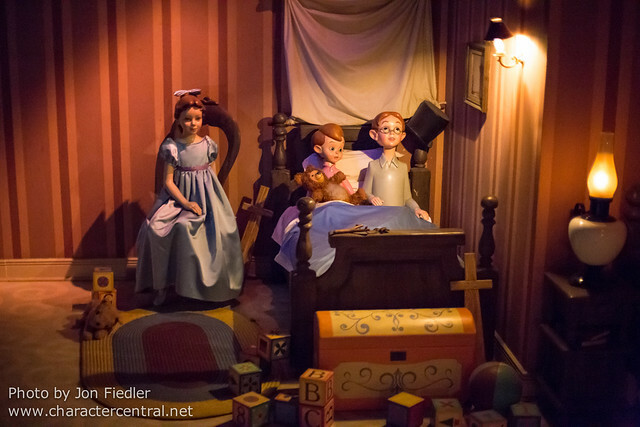 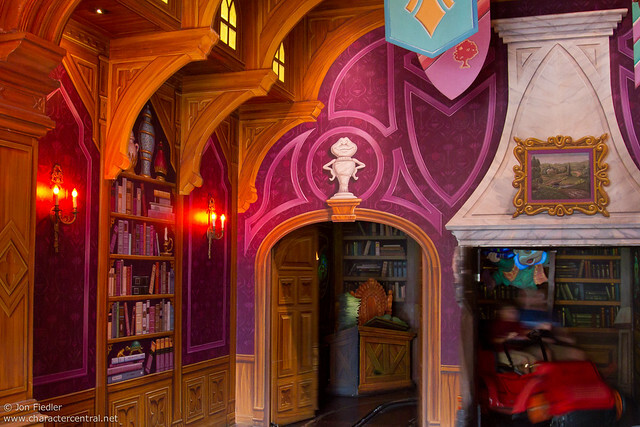 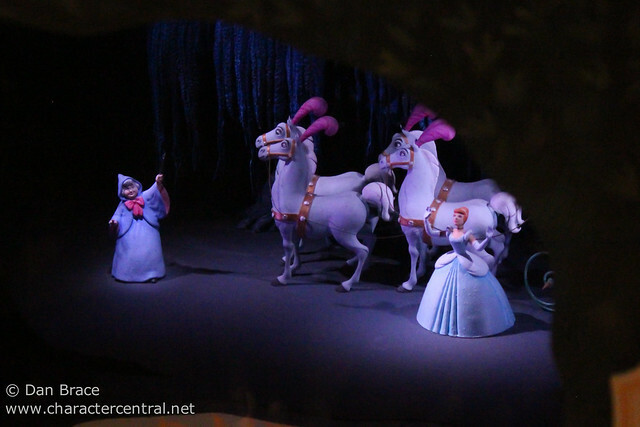 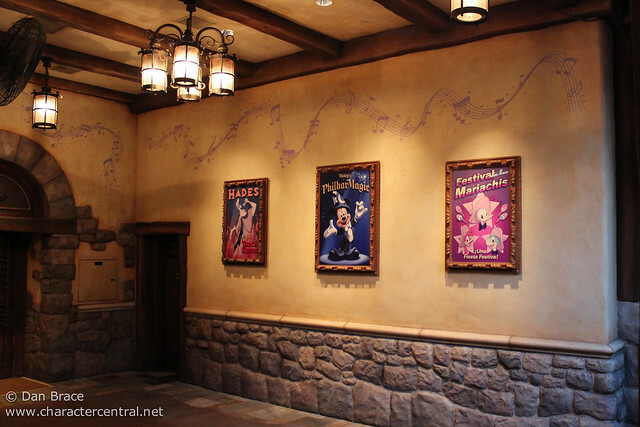 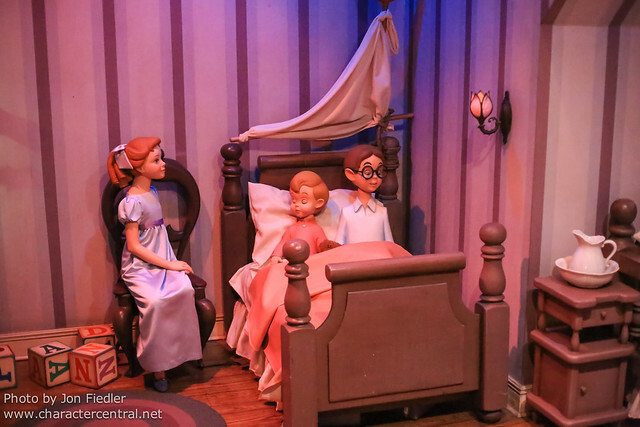 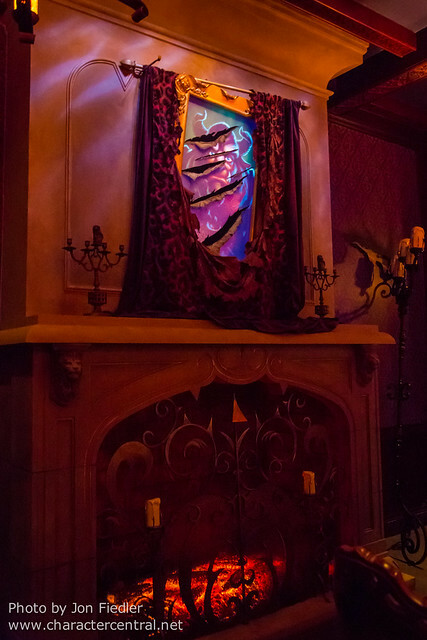 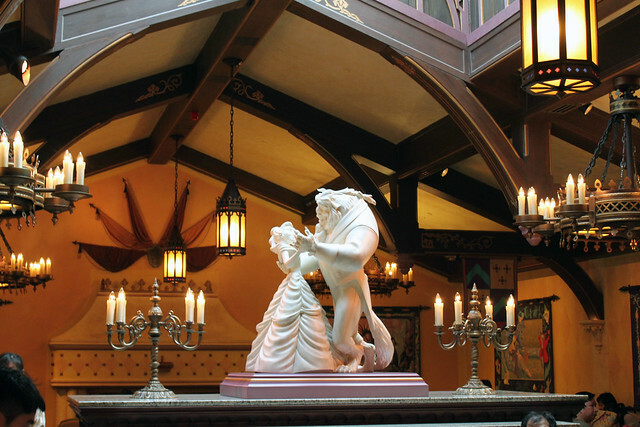 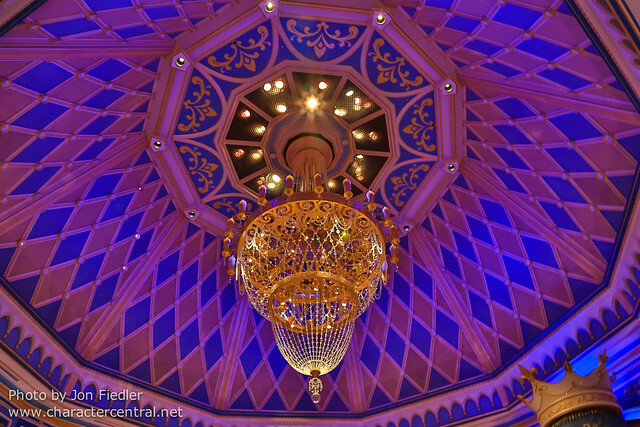 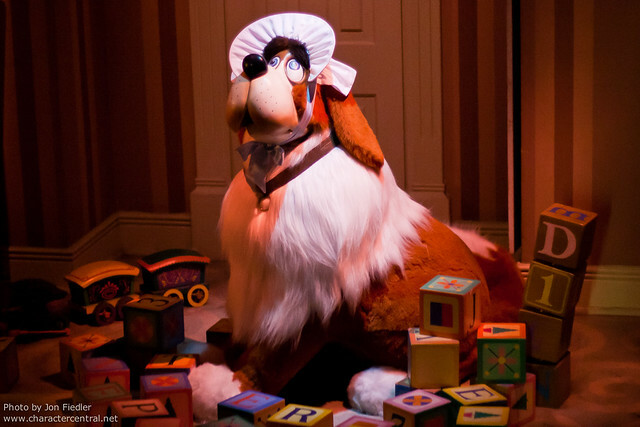 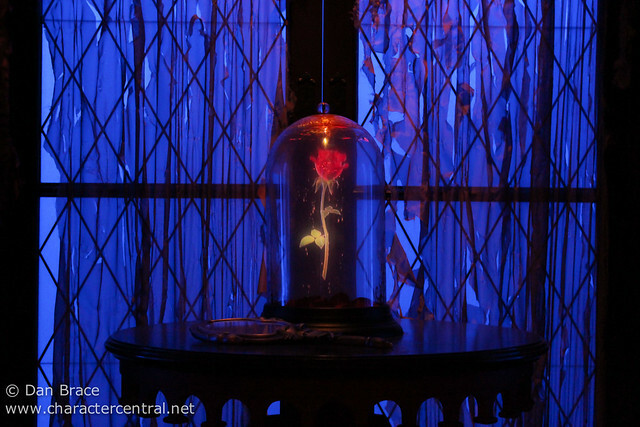 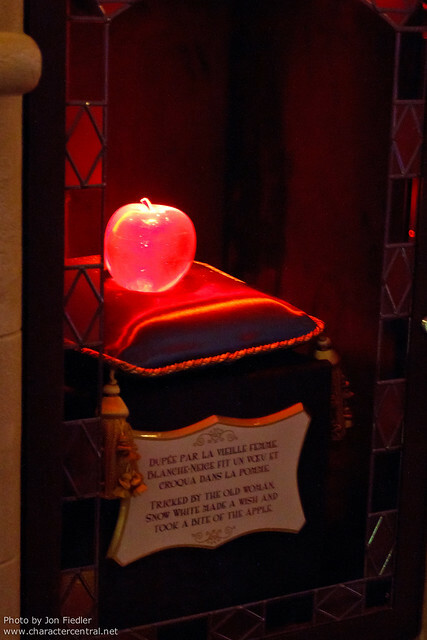 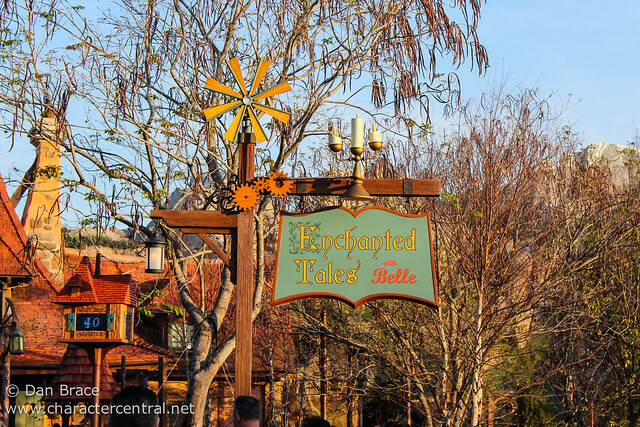 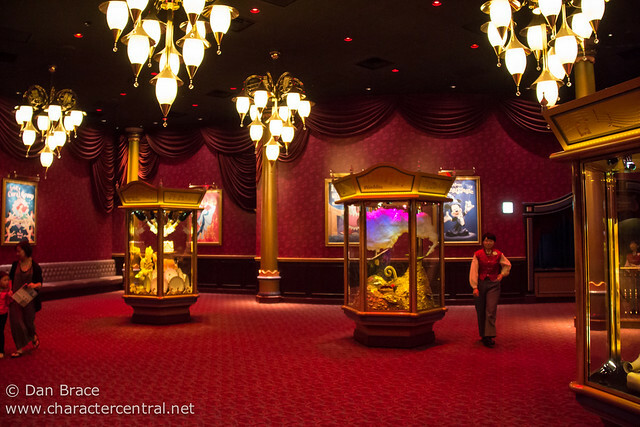 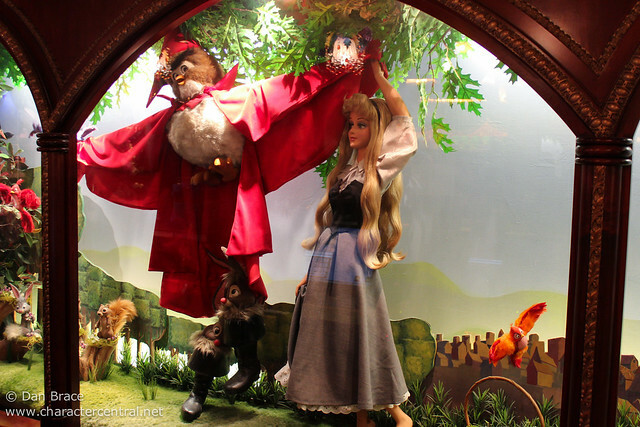 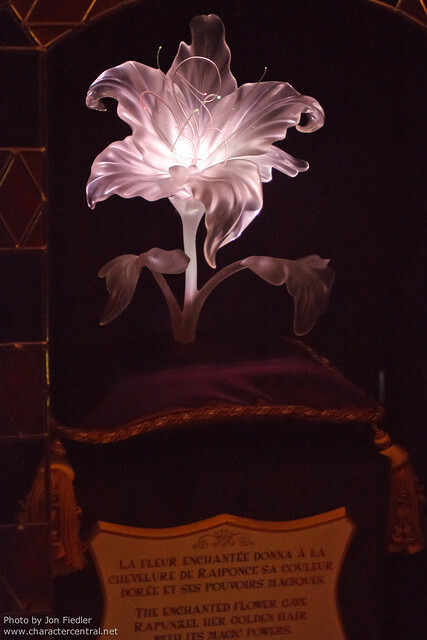 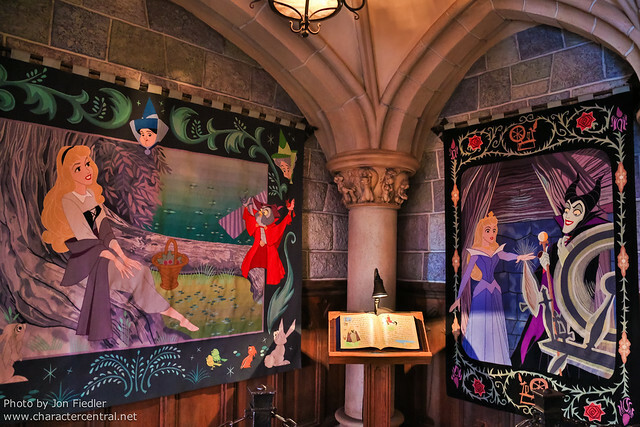 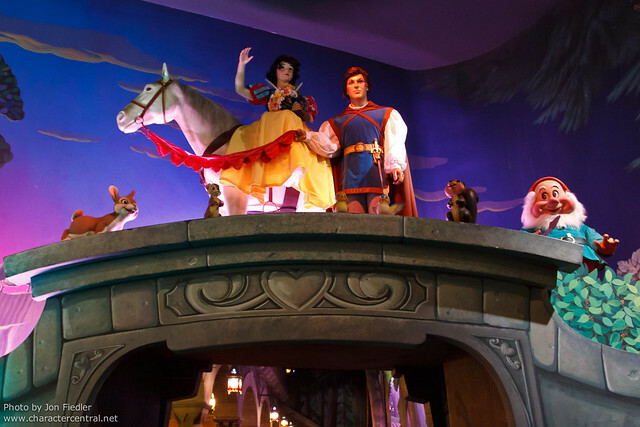 At the Magic Kingdom, Enchanted Tales with Belle is a permanent location which tells the story of Belle and Beast. 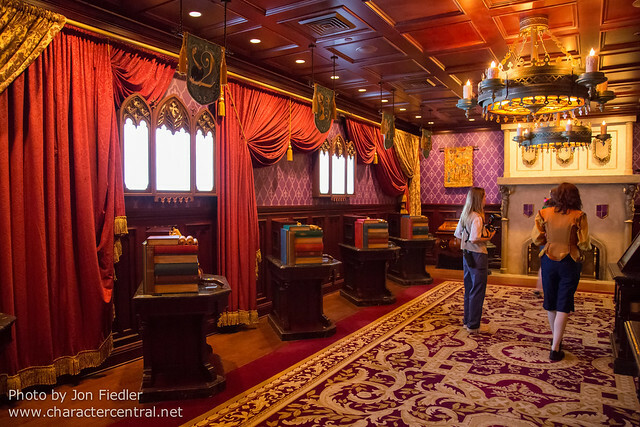 There are some really magical moments during the experience where you can step right into the story. 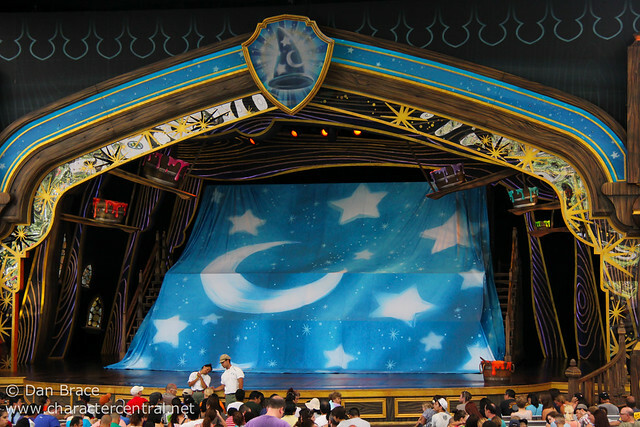 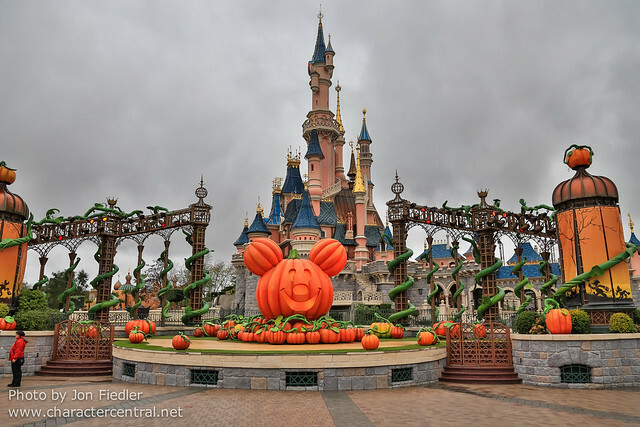 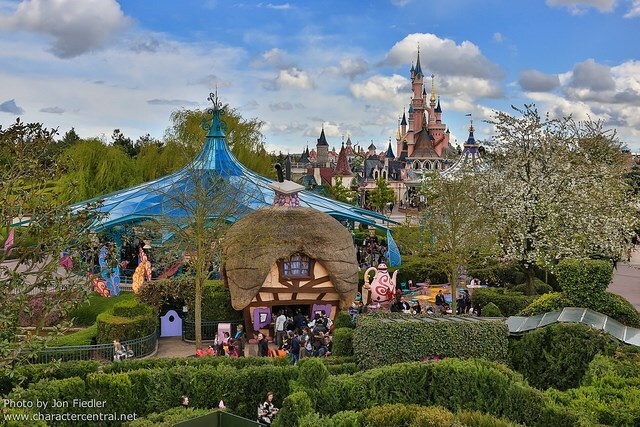 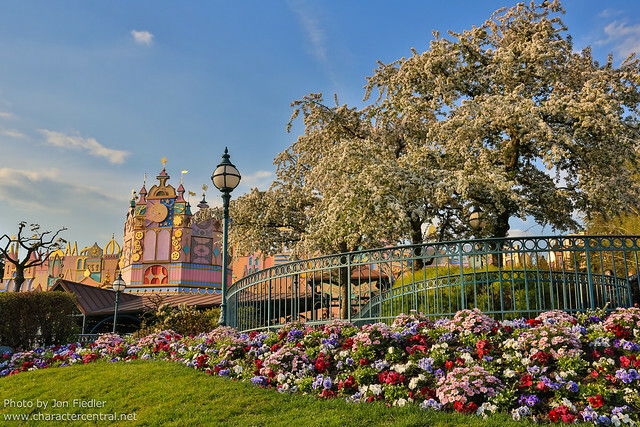 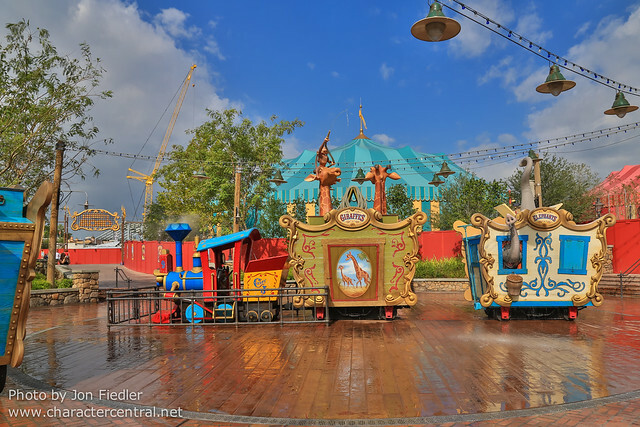 There is a stage in Fantasyland at Disneyland Paris, but it is not used for regular entertainment as it is completely outdoors and exposed to the elements, however, it is used during seasonal events, such as Halloween or Swing into Spring. 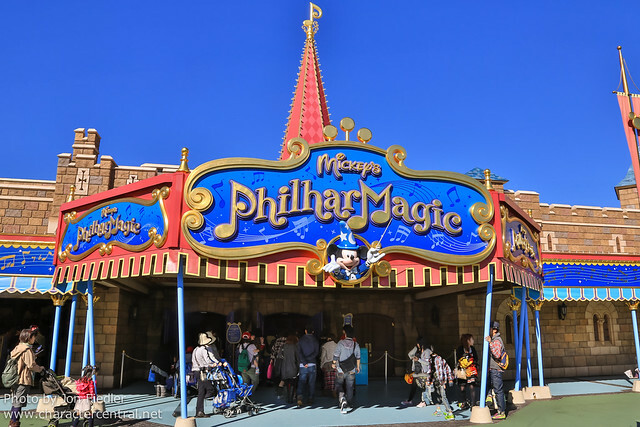 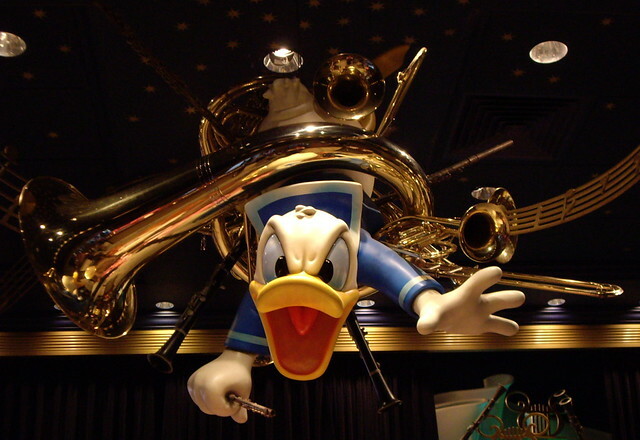 Tokyo Disneyland does not currently have any permanent entertainment venues in its Fantasyland, however, with their new expansion plans, this may (or may not) change. 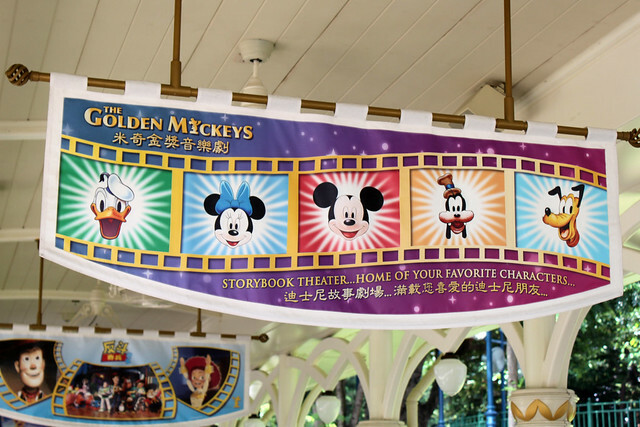 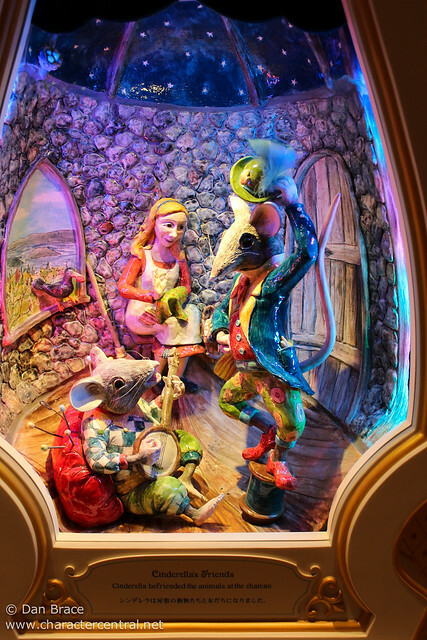 Hong Kong Disneyland’s Fantasyland is home to the Storybook Theatre, which has featured the Golden Mickeys show for nearly ten years now. 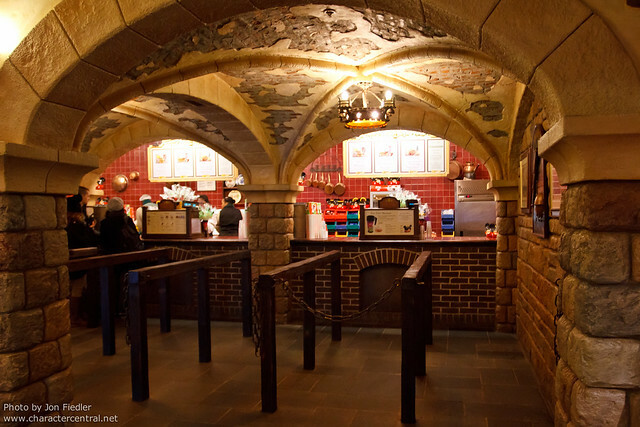 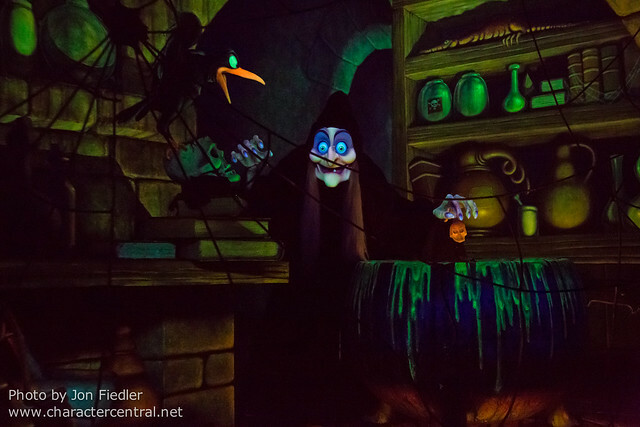 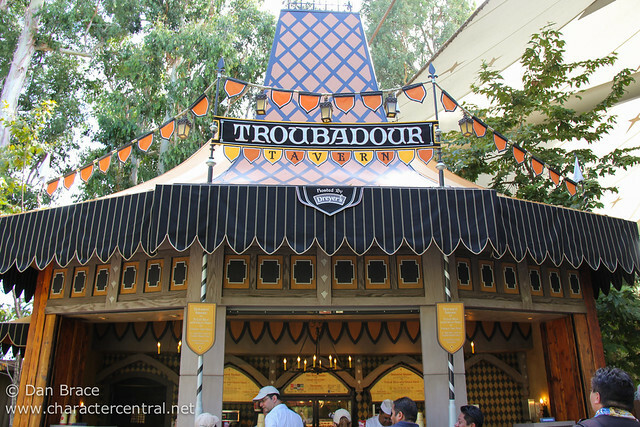 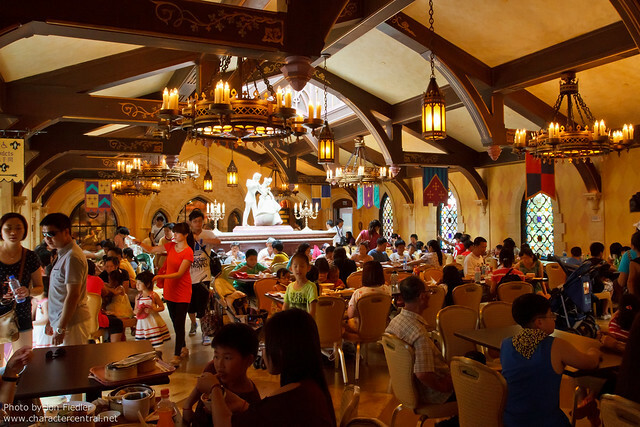 Dining in Fantasyland can be a varied experience at each park; some have lots to offer, some not. 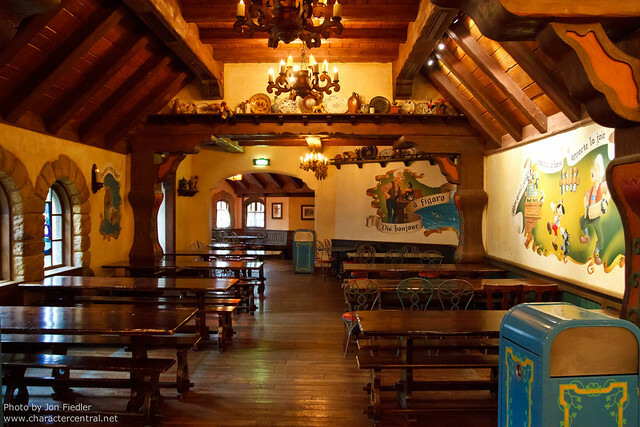 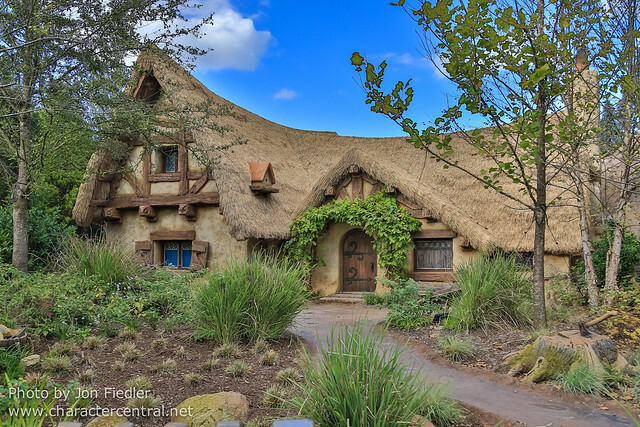 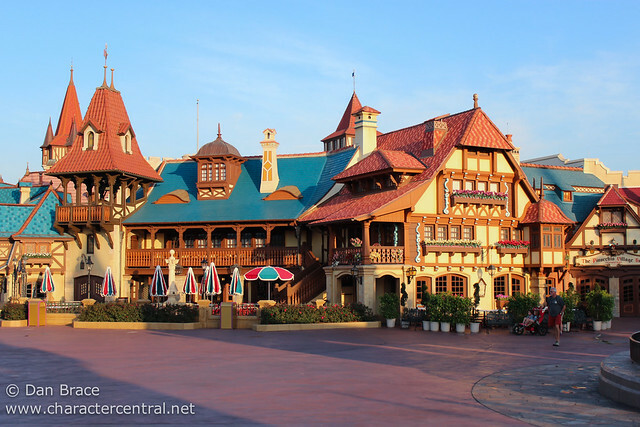 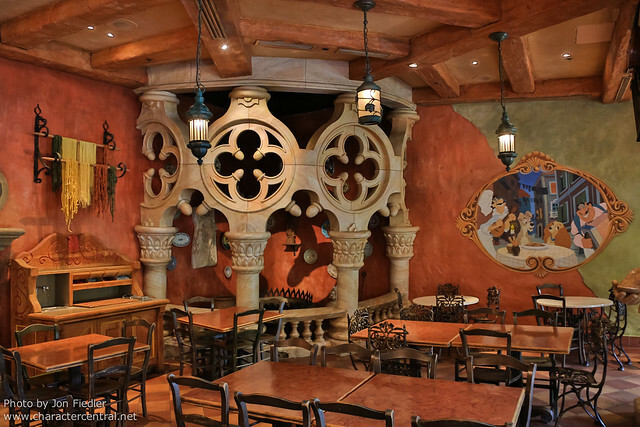 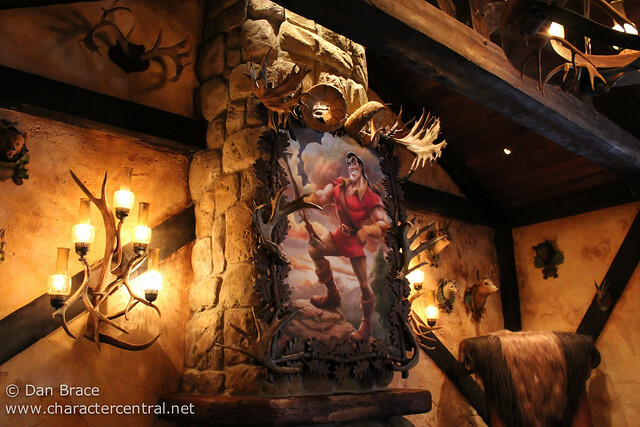 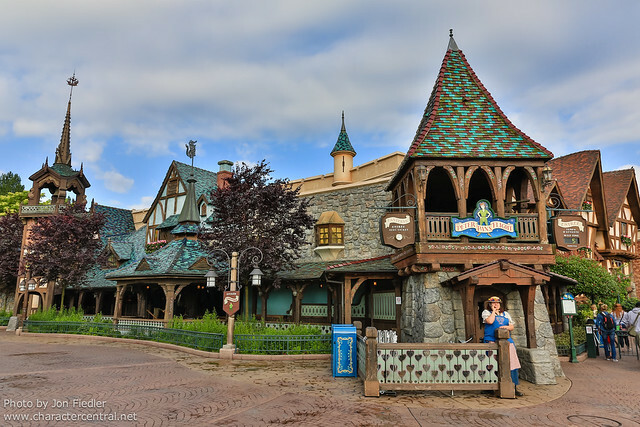 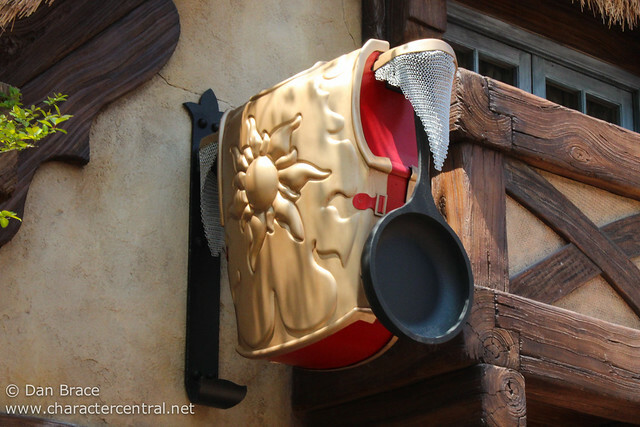 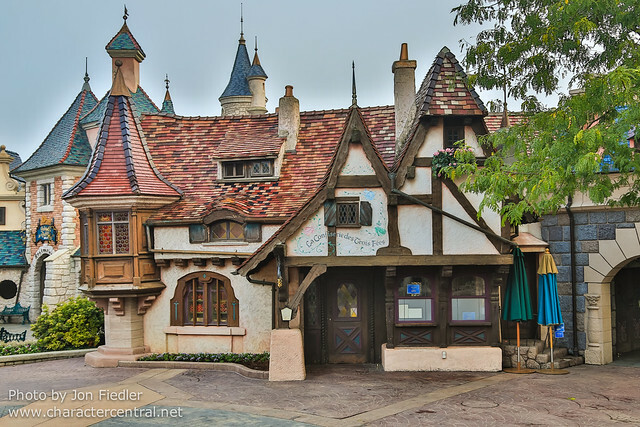 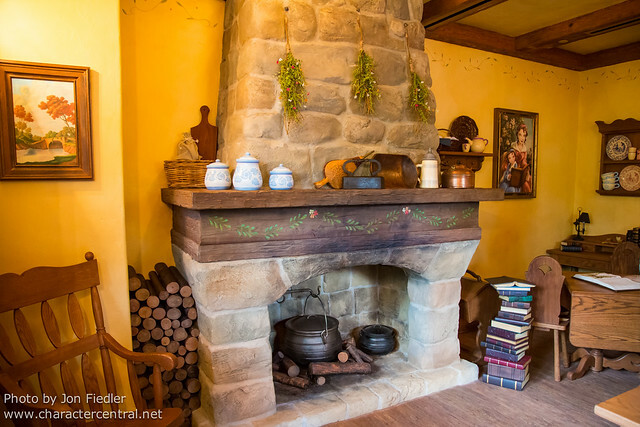 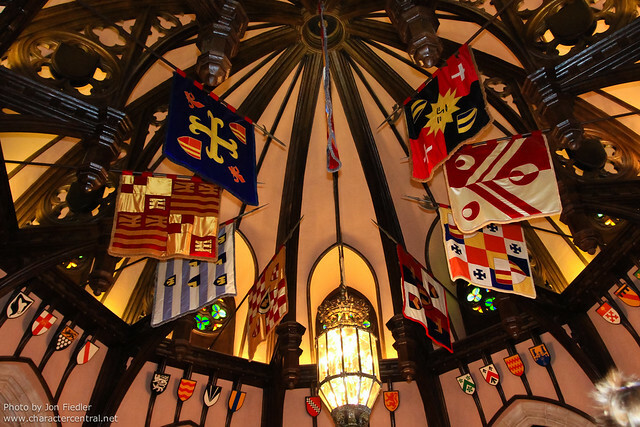 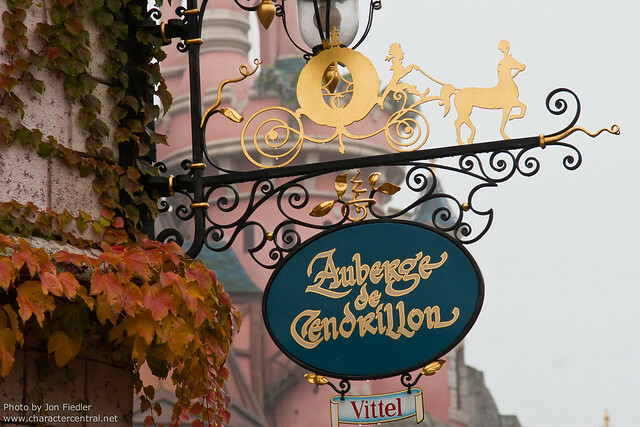 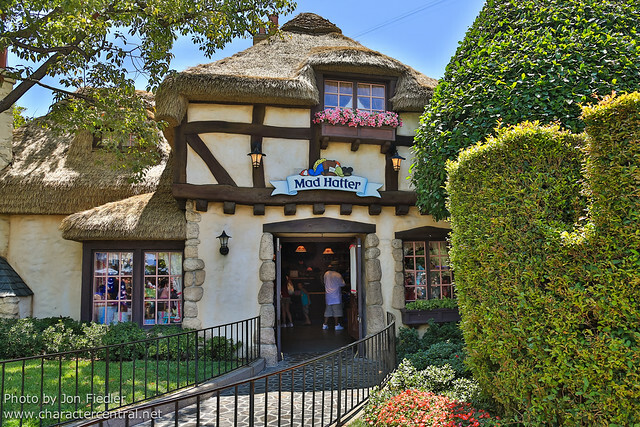 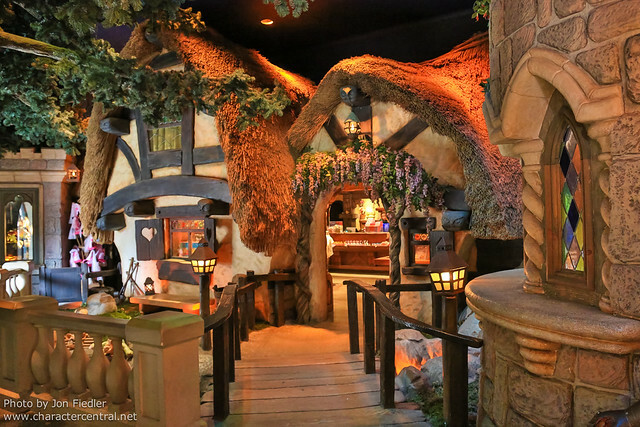 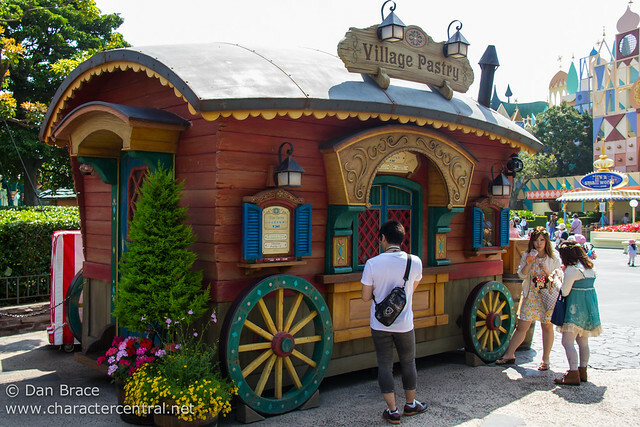 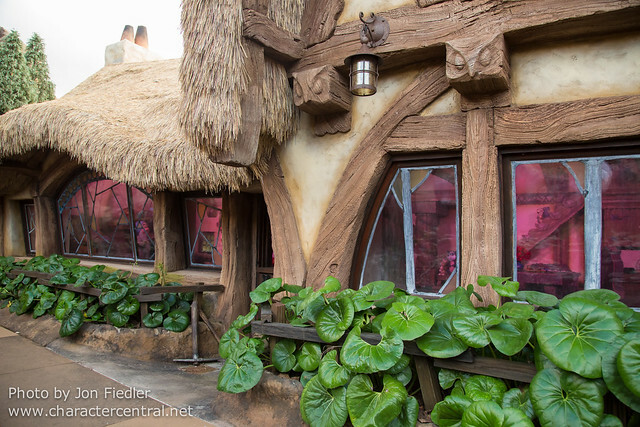 There is only really one restaurant that is comparable at four of the five Kingdoms, Village Haus/Au Chalet, and the rest are pretty different from one another. 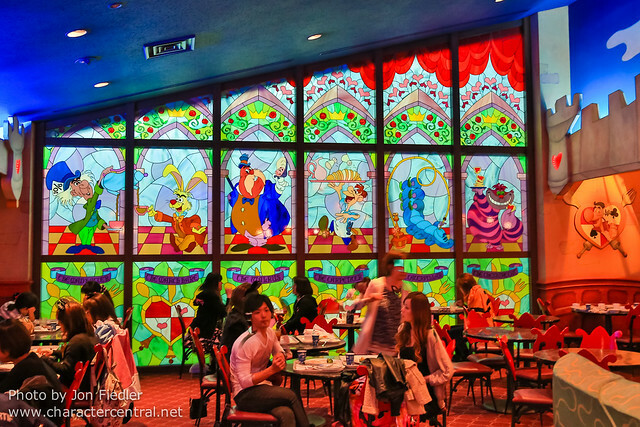 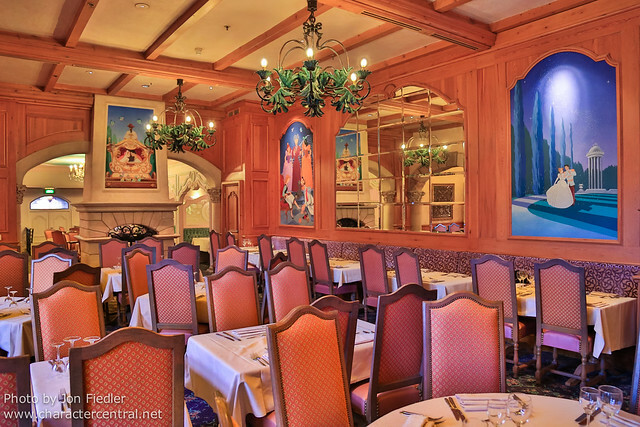 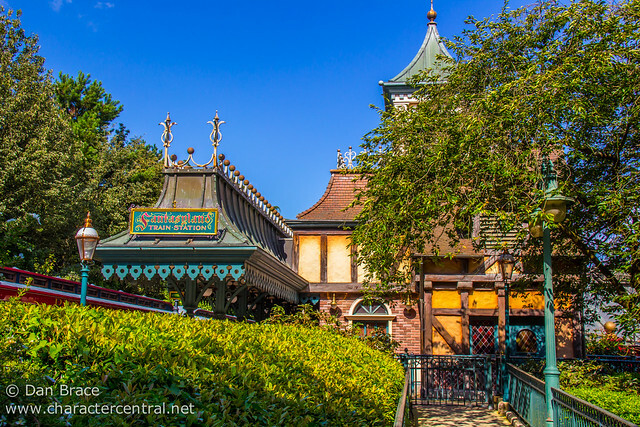 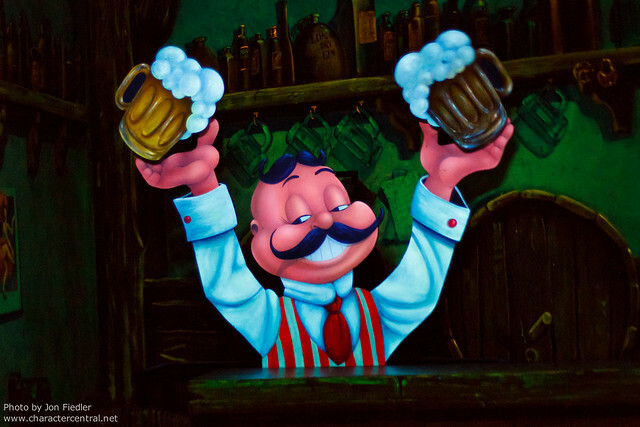 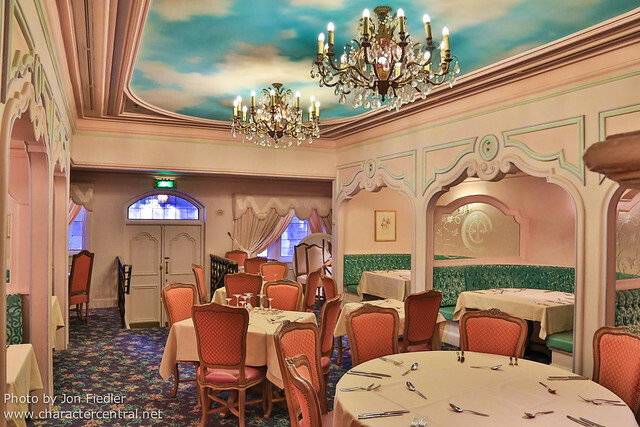 Overall, I think for me personally, Disneyland Paris has the best range of dining options in Fantasyland, with at least three indoor full counter service locations, one table service, and lots of window venues. 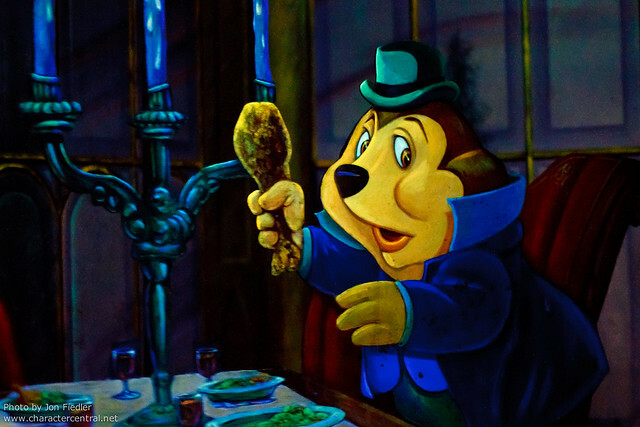 Of course, how you dine also can depend greatly on your own food preferences, diet, and so forth. 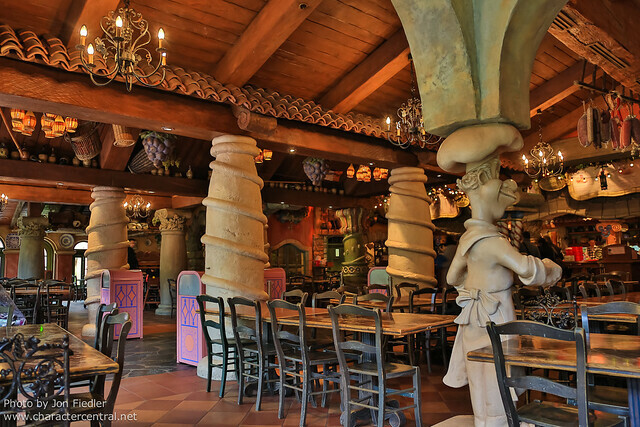 I won’t say much else about restaurants, and instead will just share photos from all the dining locations at all the parks, and let you decide which you think has the best options. 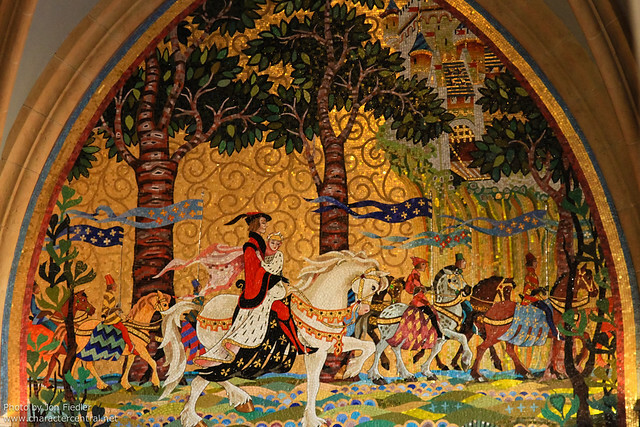 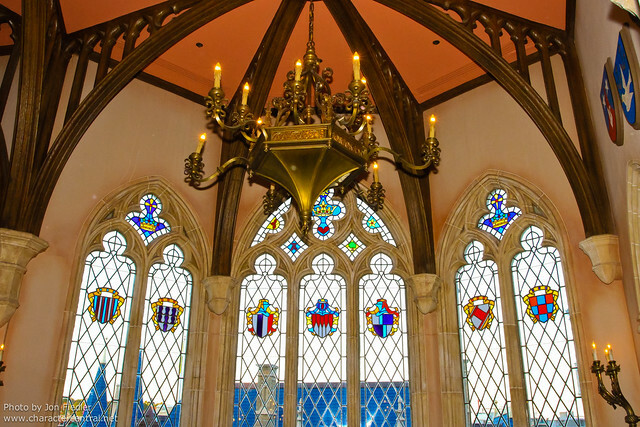 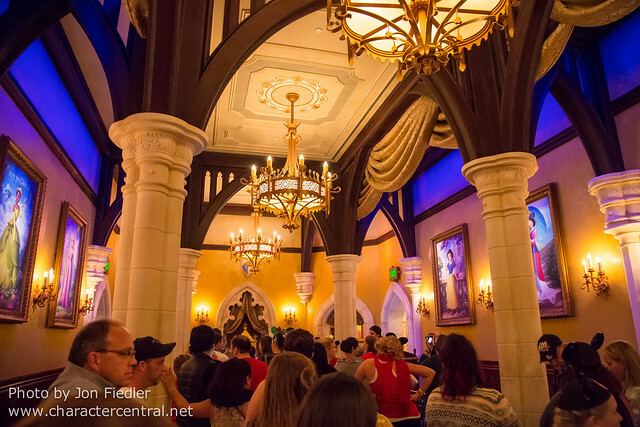 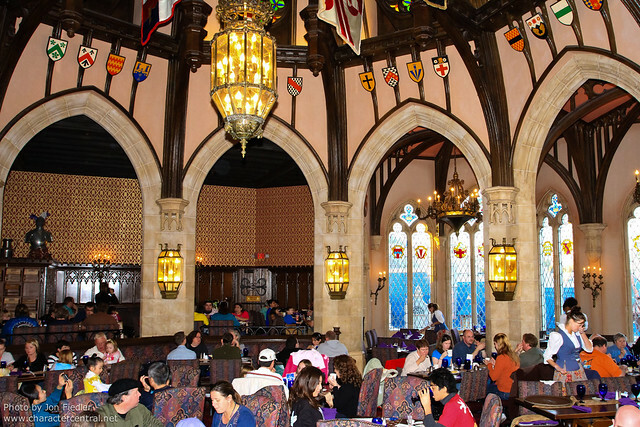 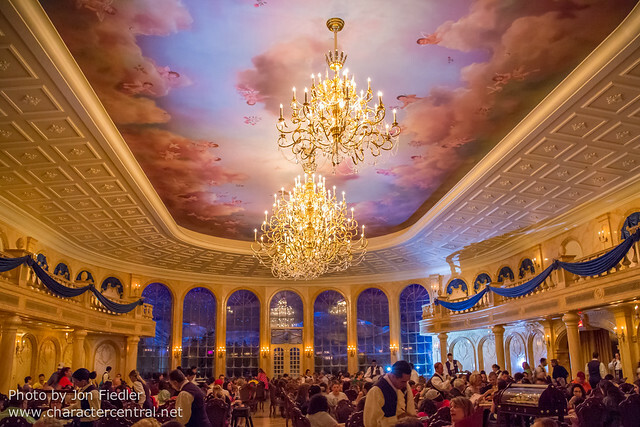 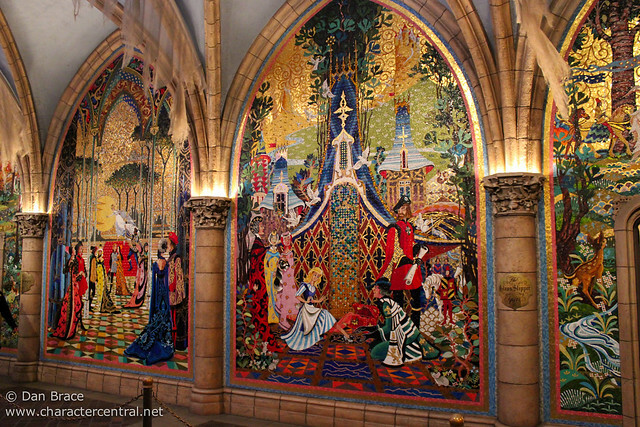 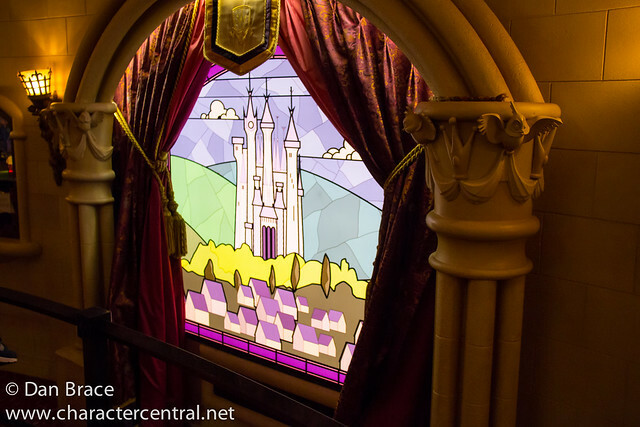 I already shared photos of Cinderella’s Royal Table near the start of this article when I discussed Cinderella Castle, so I won't repeat them here. 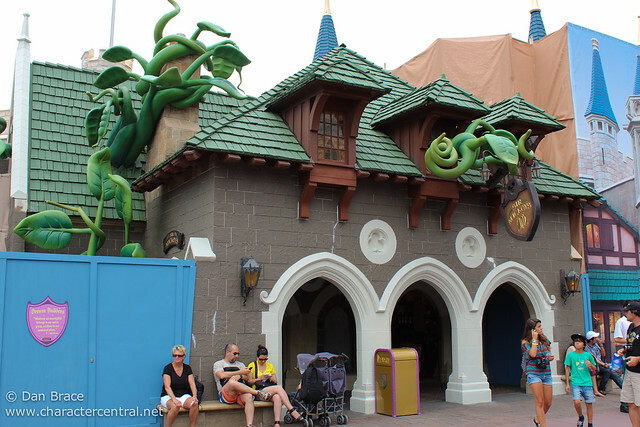 The stores of Fantasyland are the final thing we have left to cover. 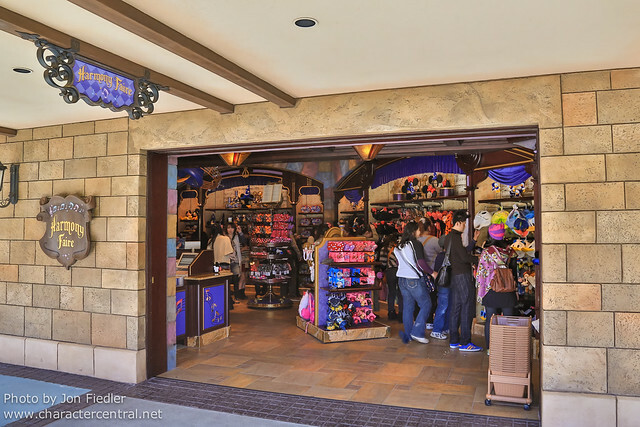 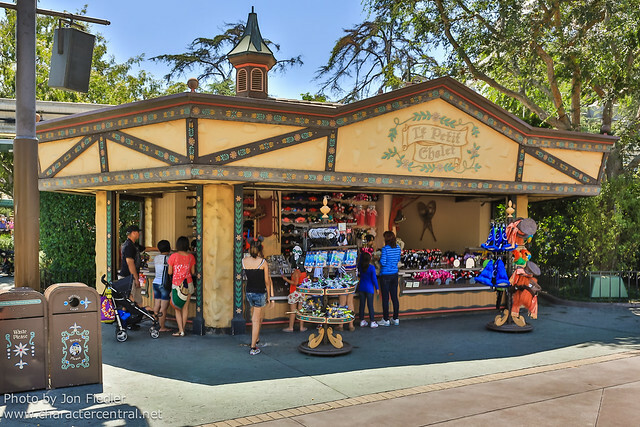 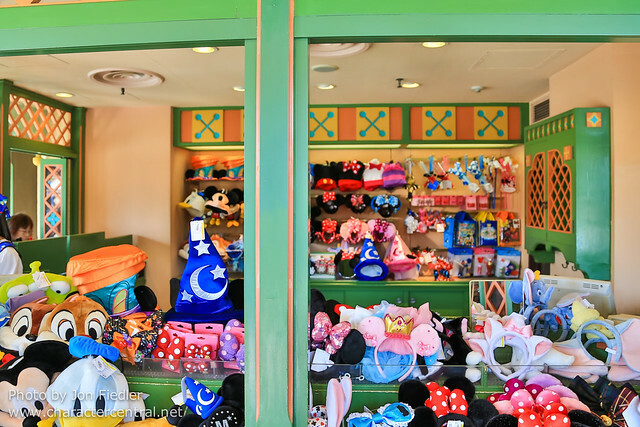 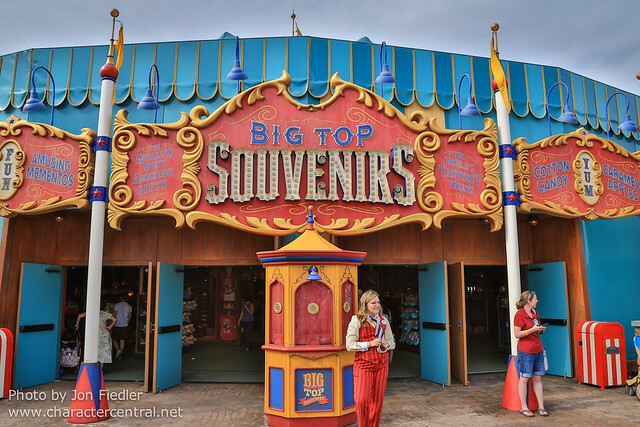 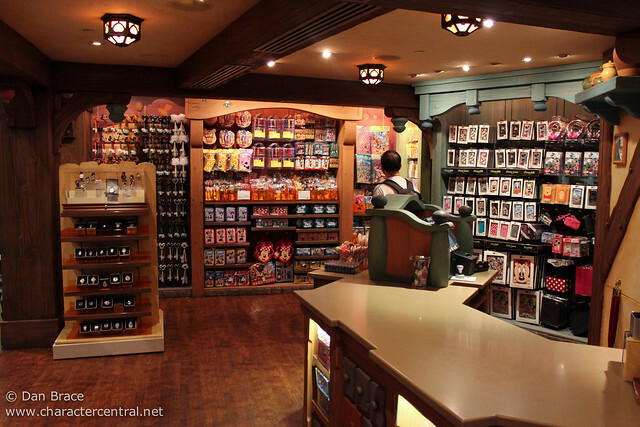 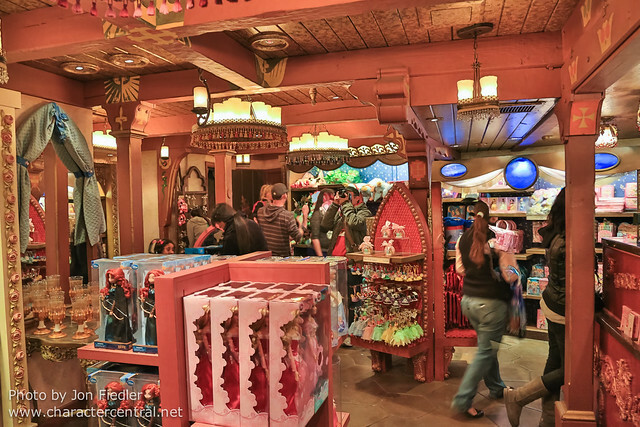 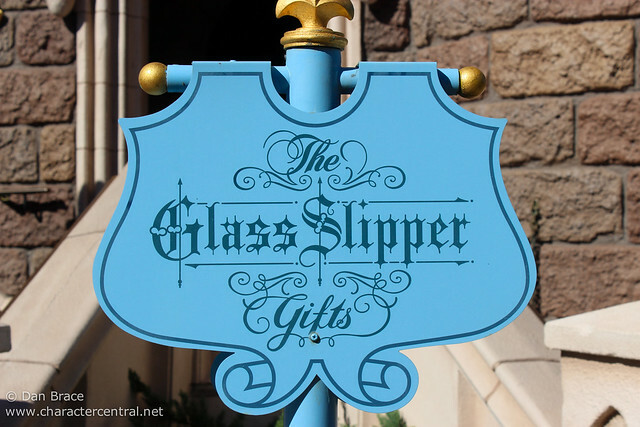 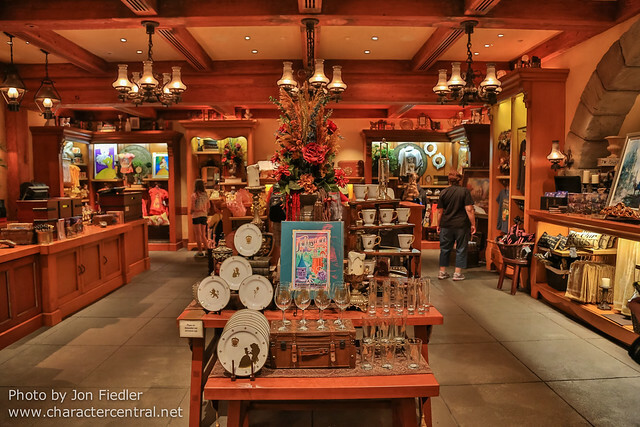 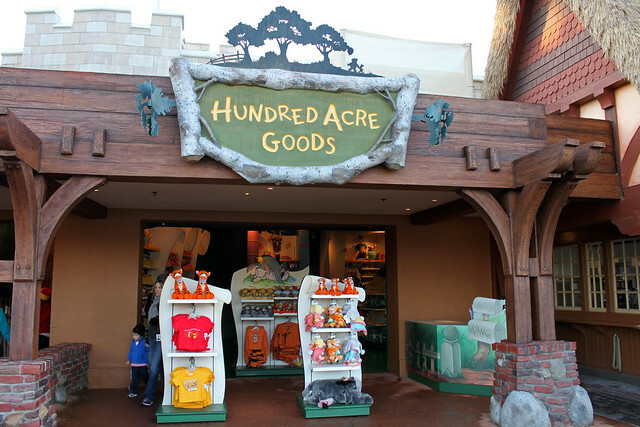 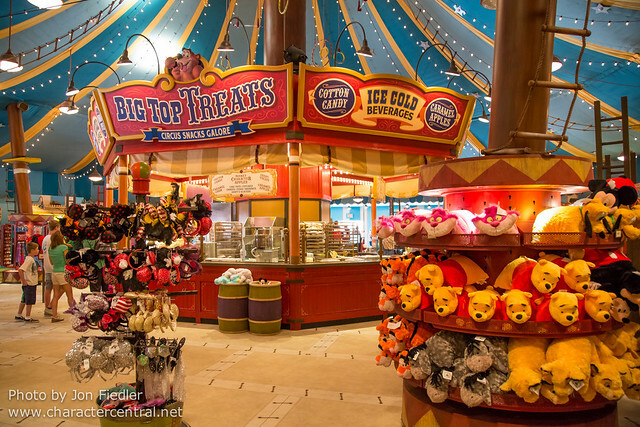 Generally speaking, most stores at the parks carry the usual generic merchandise, with the occasional store offering something a little more specific. 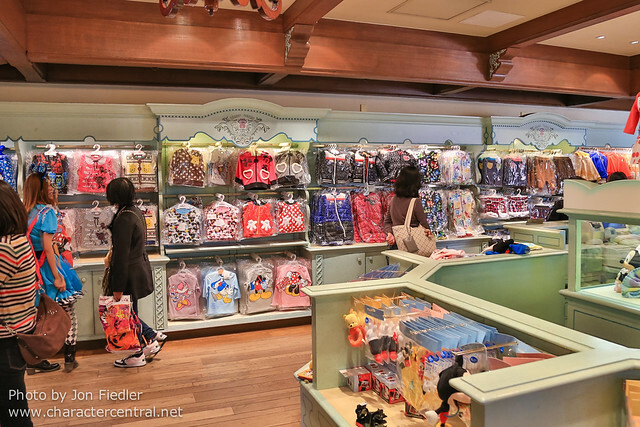 Tokyo does this best, with stores such as Baby Mine (a baby store), Pooh Corner (Pooh items) and Pleasure Island Candies (candy, unsurprisingly). 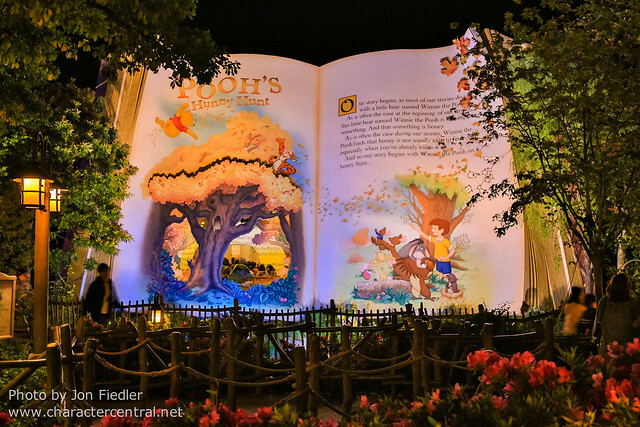 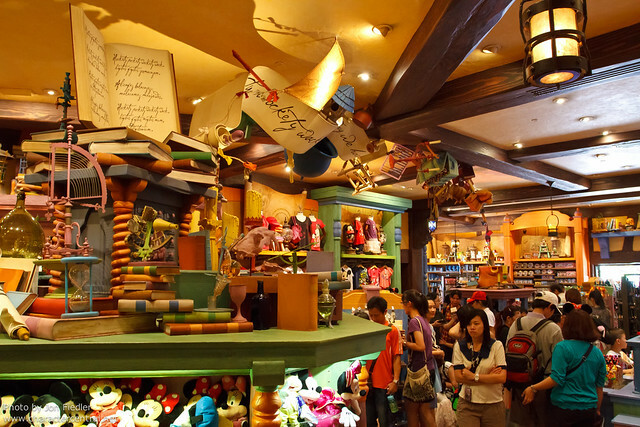 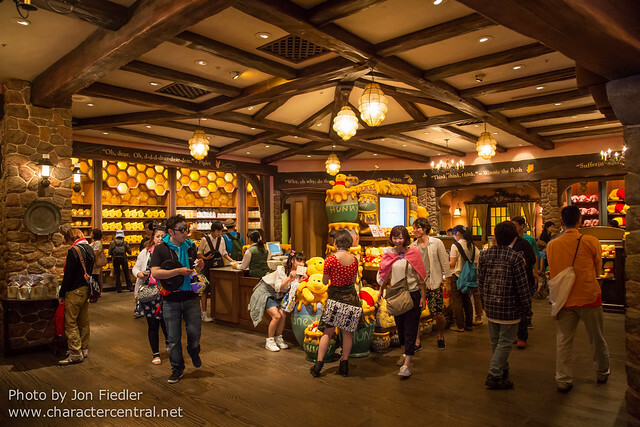 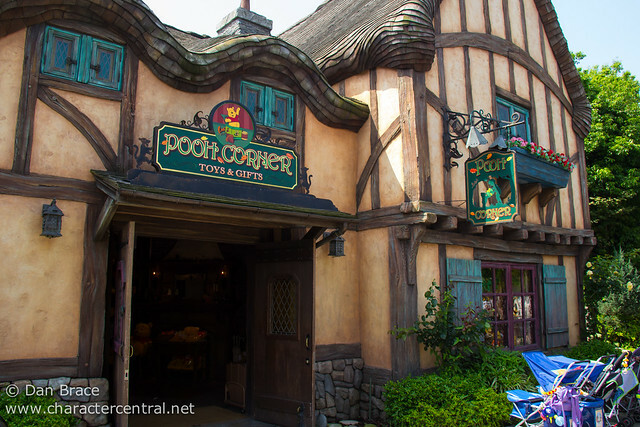 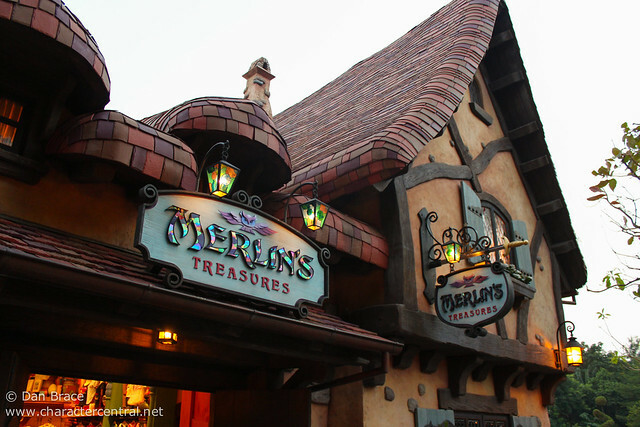 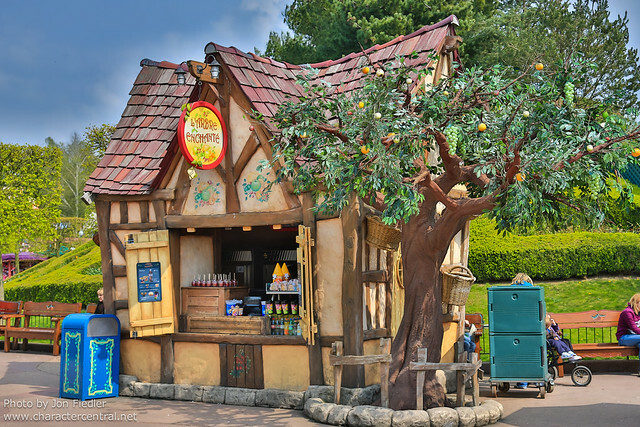 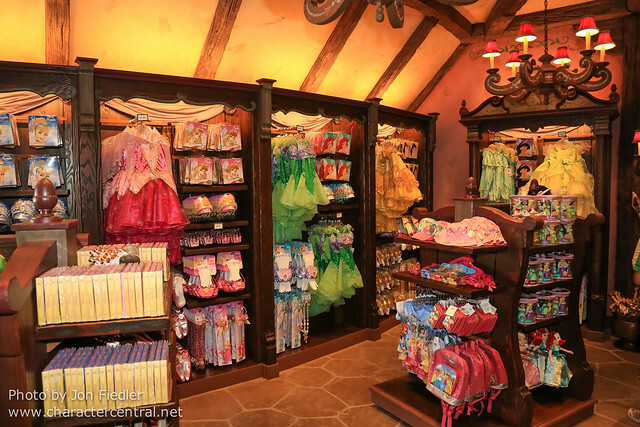 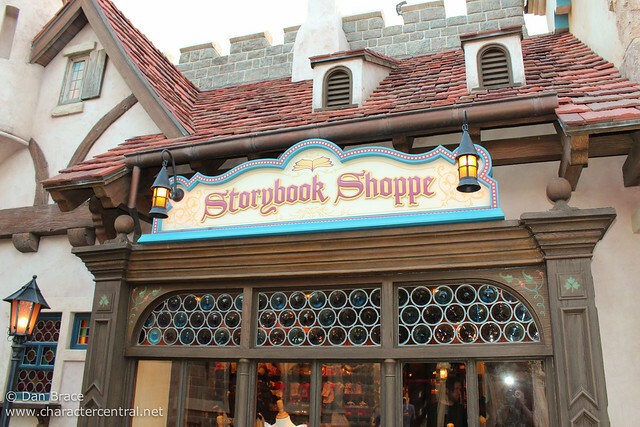 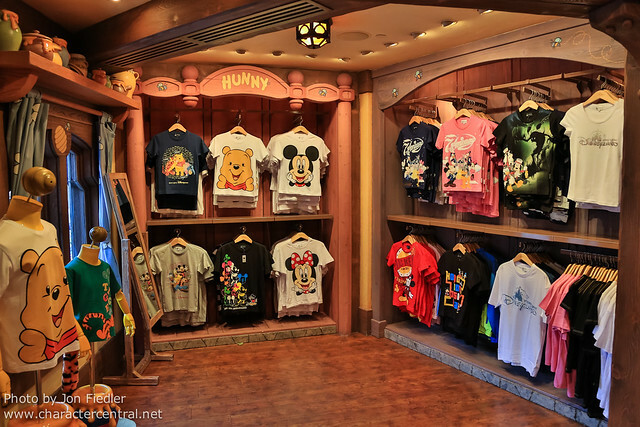 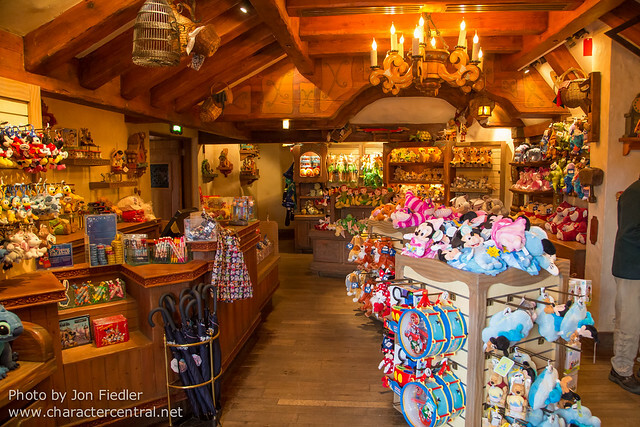 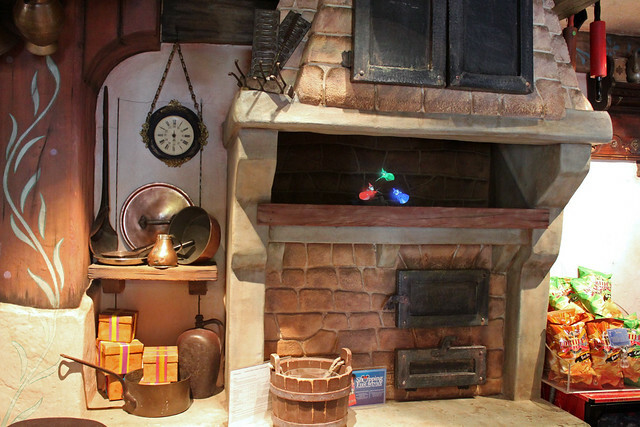 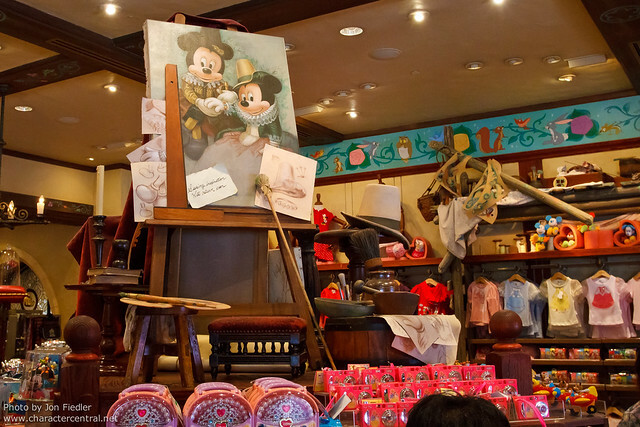 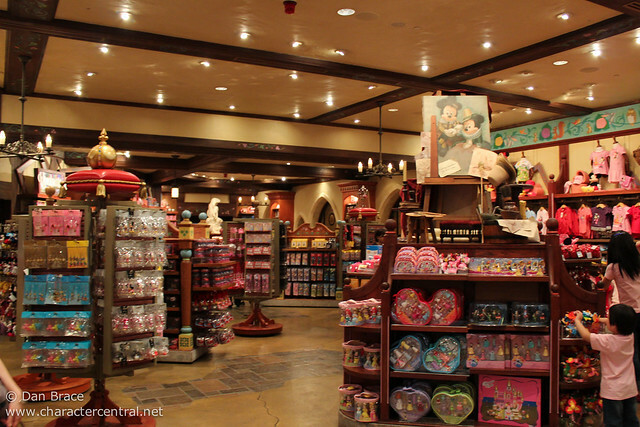 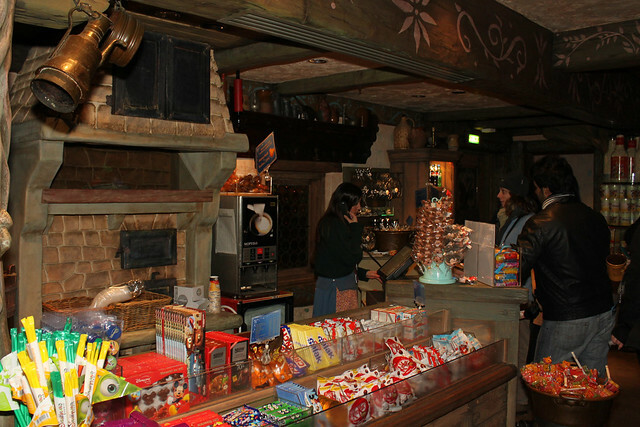 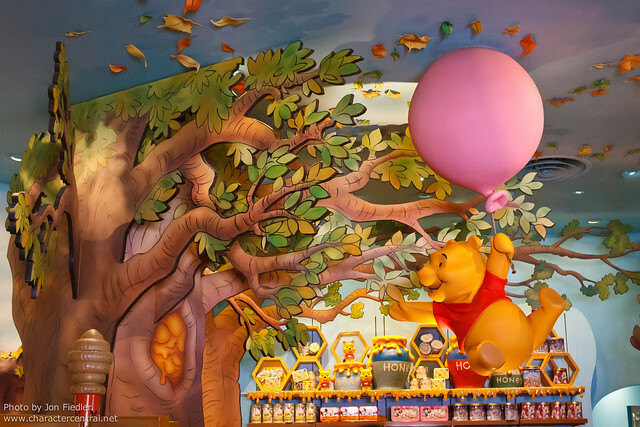 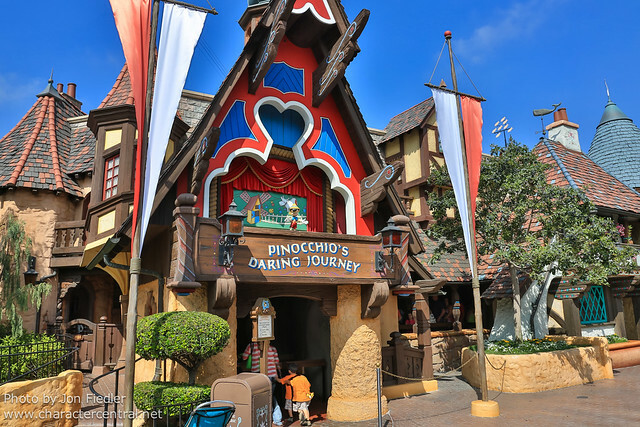 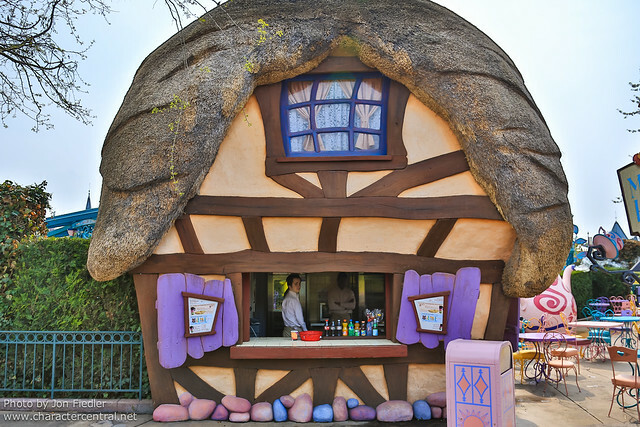 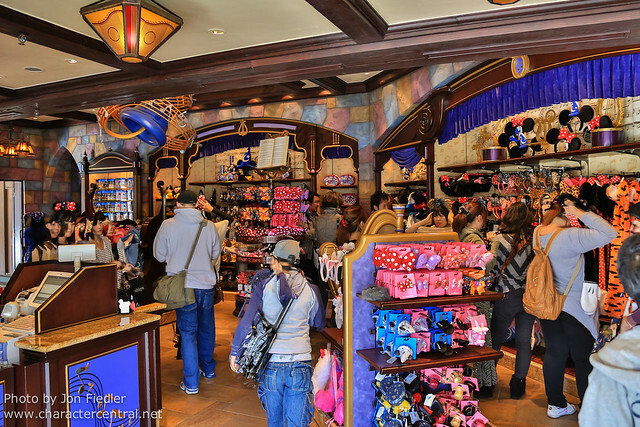 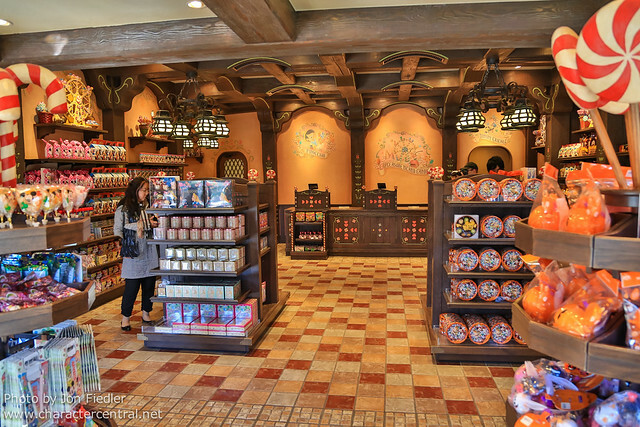 As with dining, there aren’t really any comparable stores, except perhaps the Pooh stores in Magic Kingdom, Tokyo and Hong Kong, but even then, they are quite different. 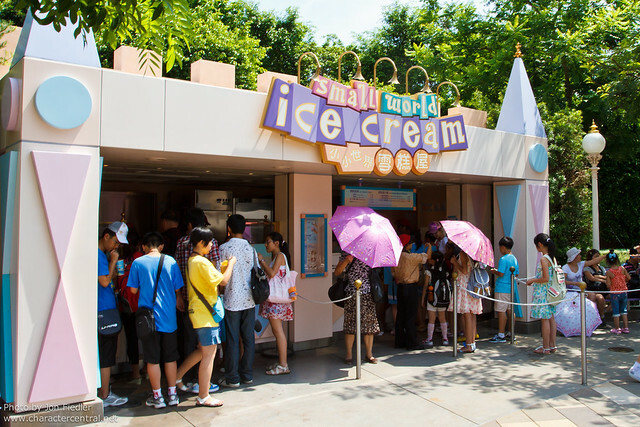 I’ll share by park, and let you see for yourself what is on offer. 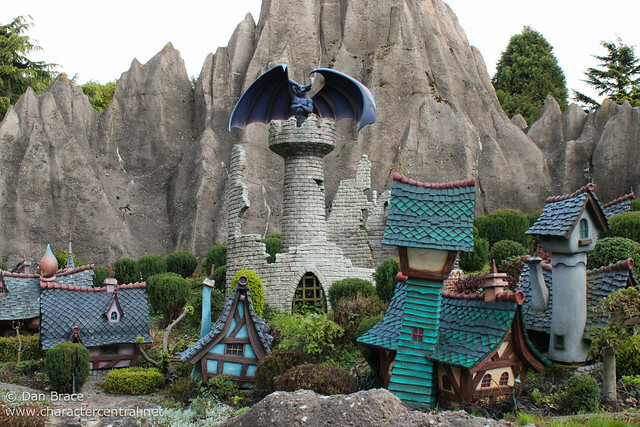 Before we finish up, I want to share some more photos from just around the various Fantasylands. 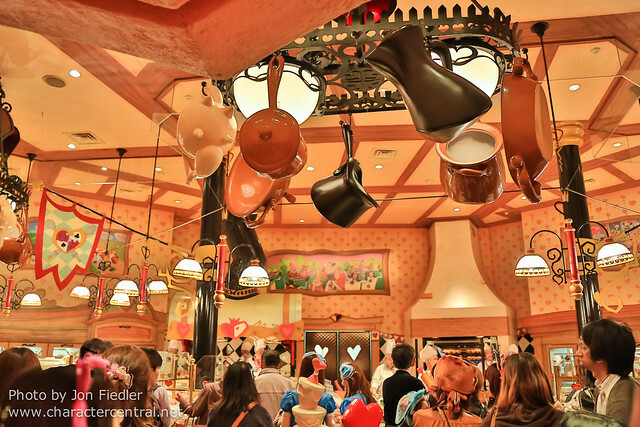 Focussing in on just attractions, stores and restaurants means that we potentially miss other details around the land. 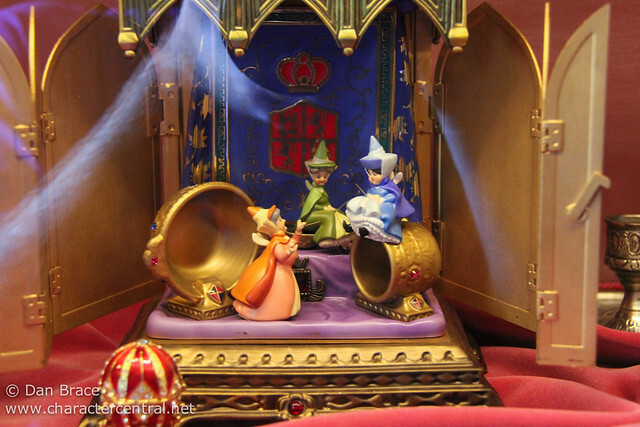 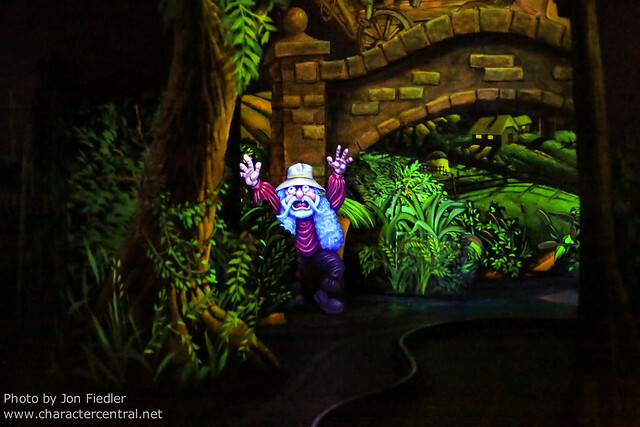 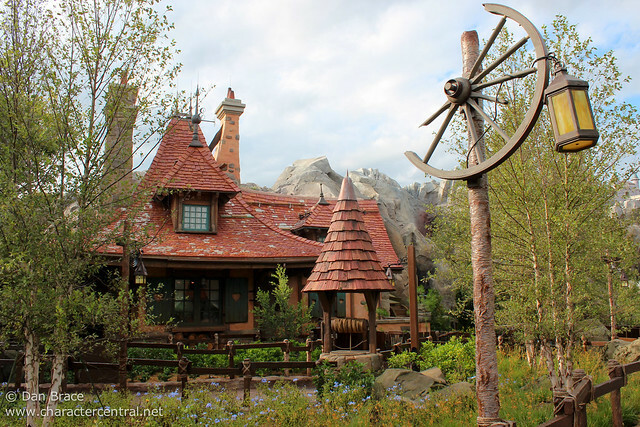 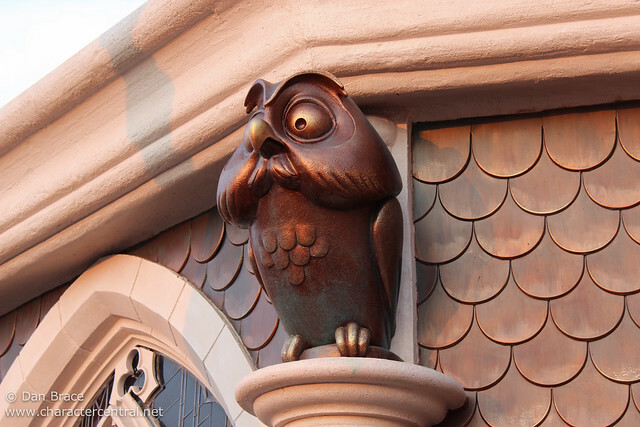 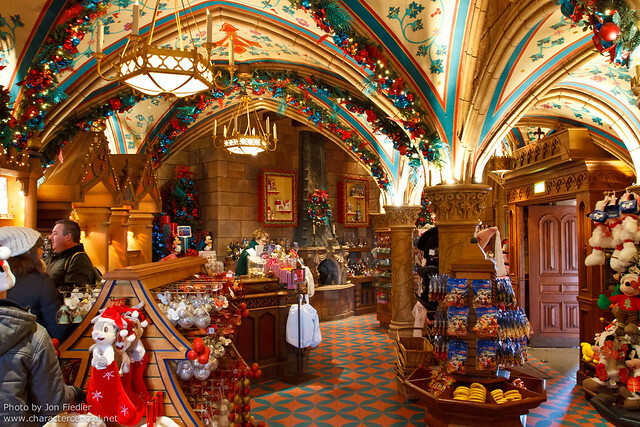 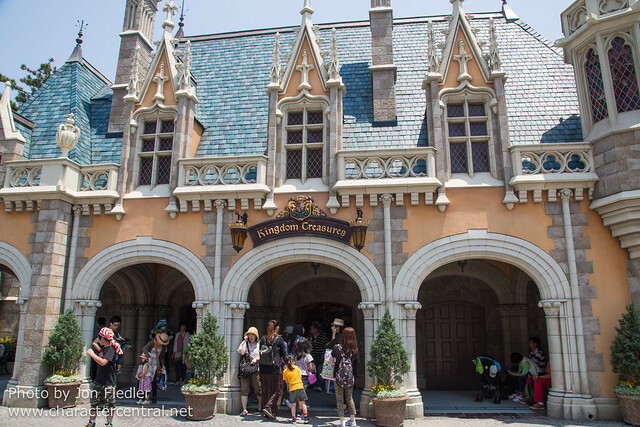 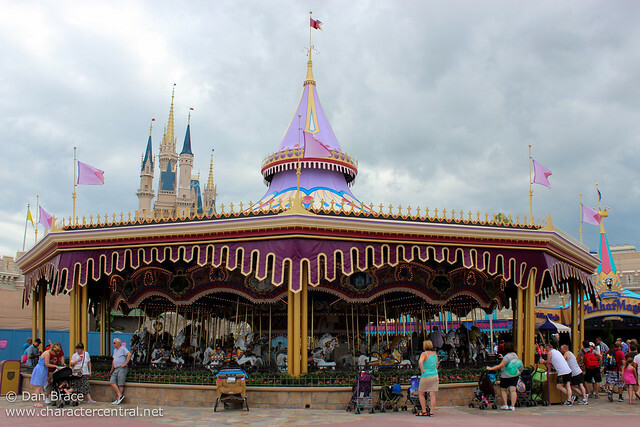 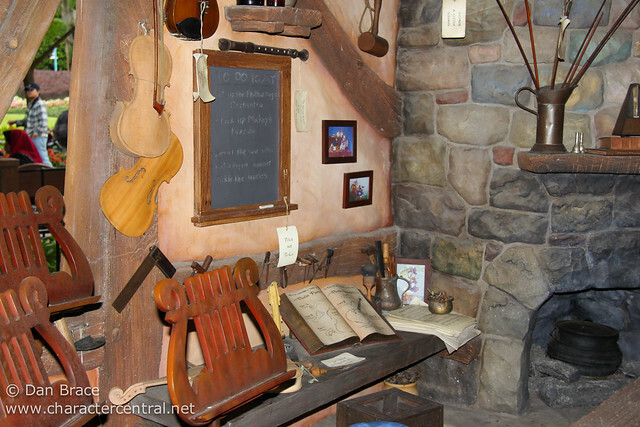 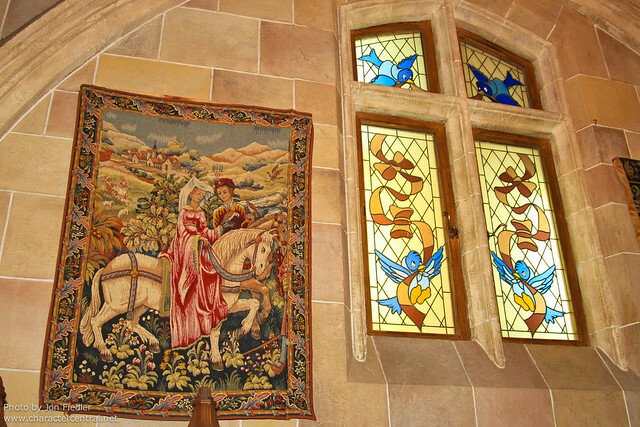 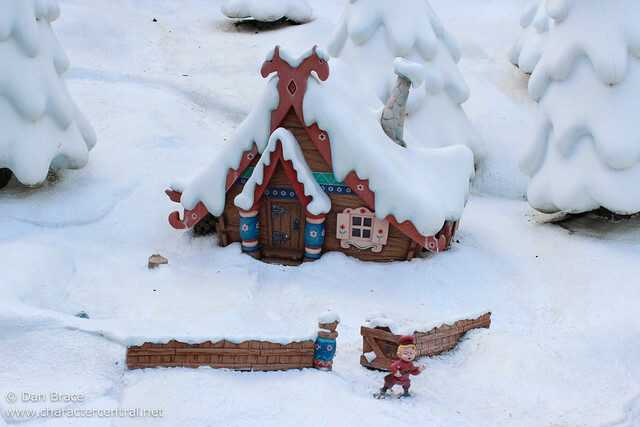 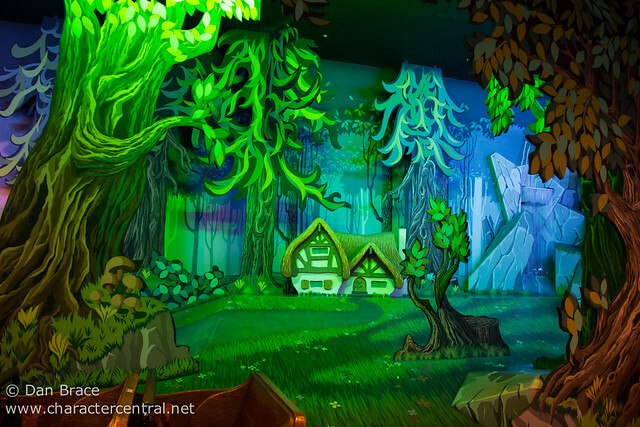 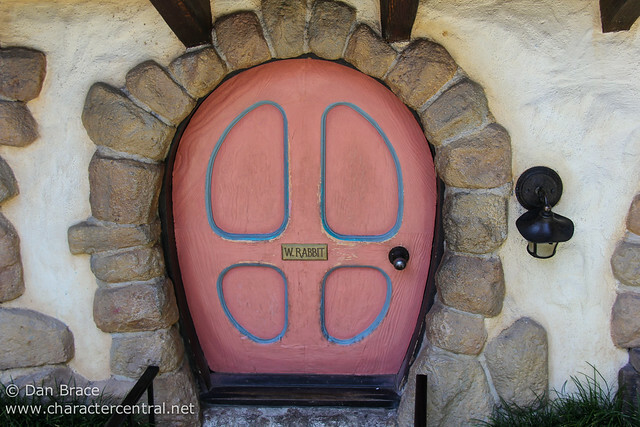 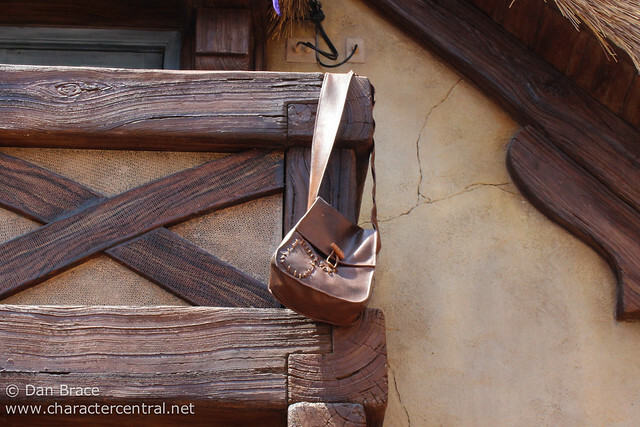 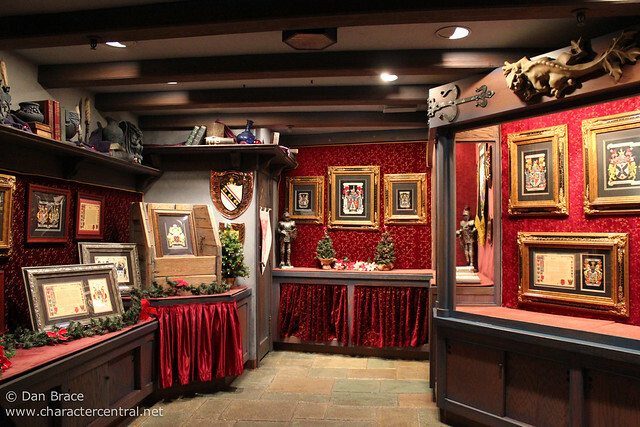 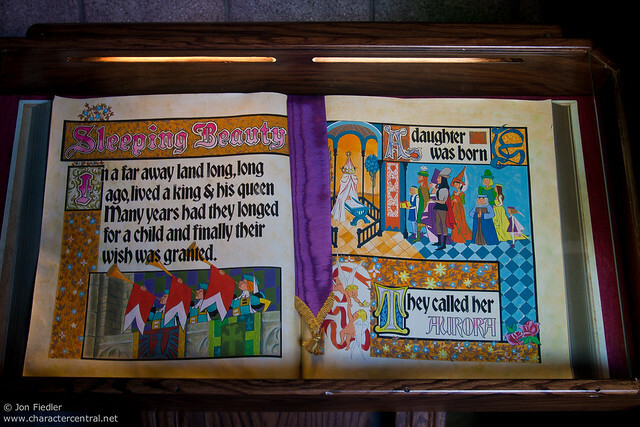 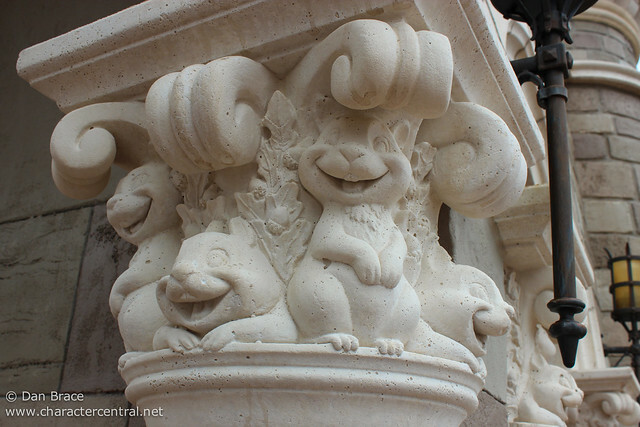 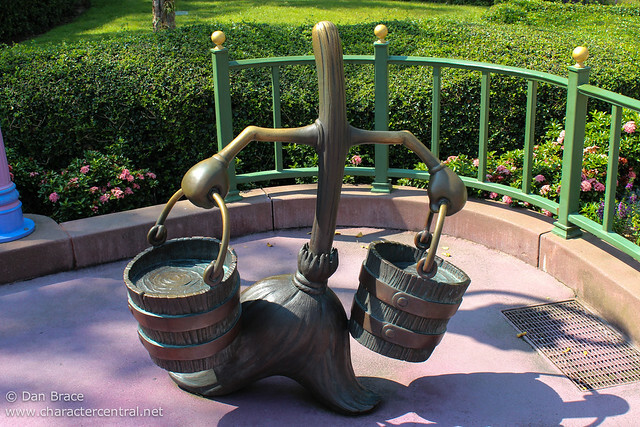 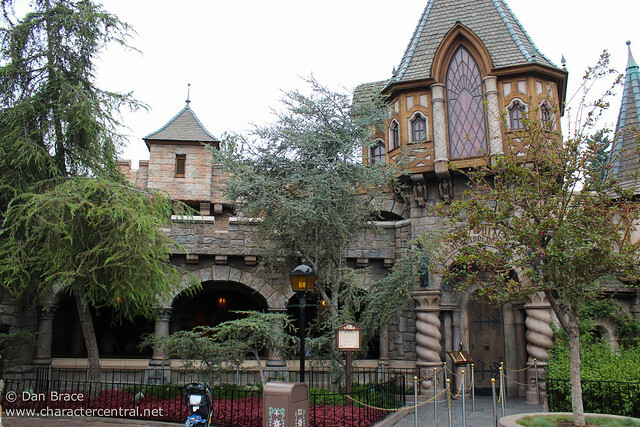 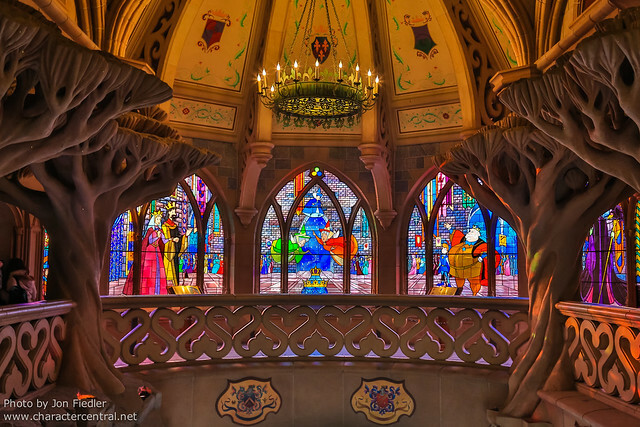 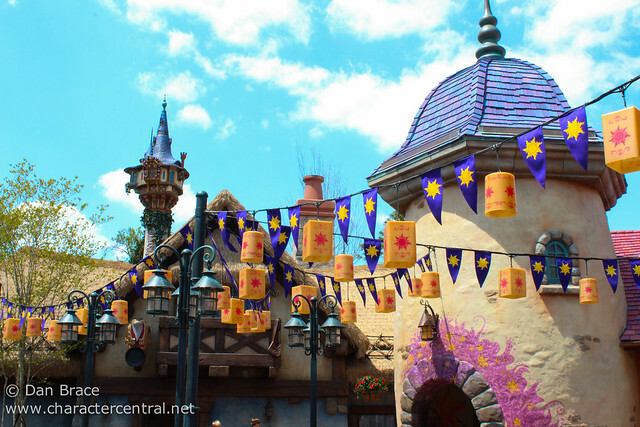 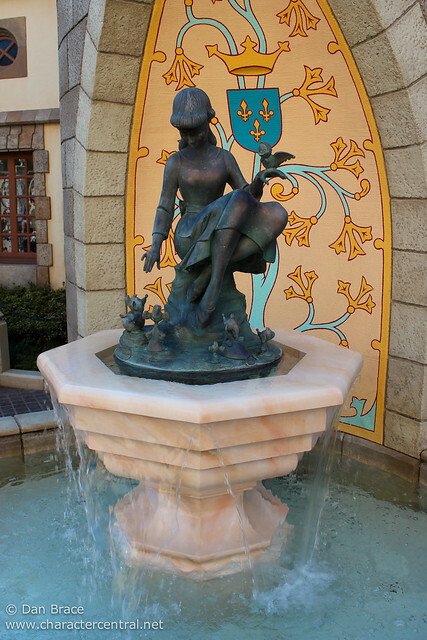 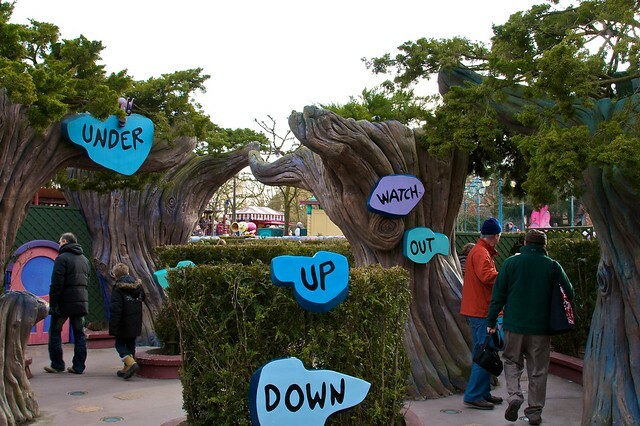 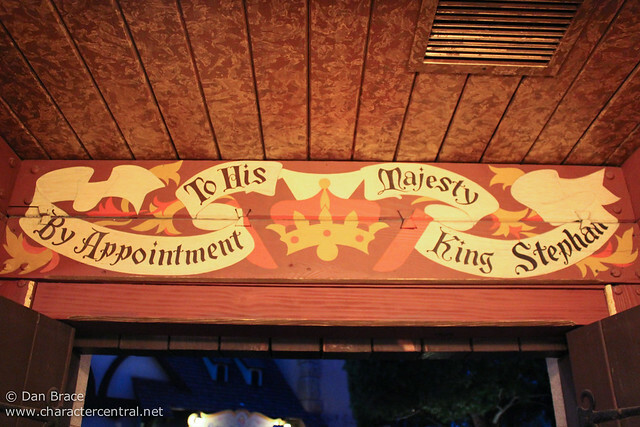 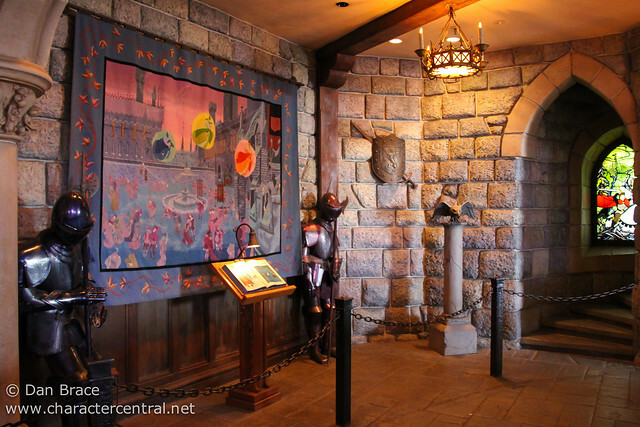 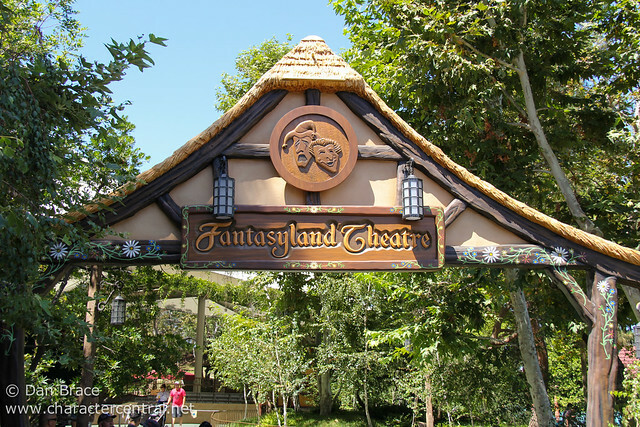 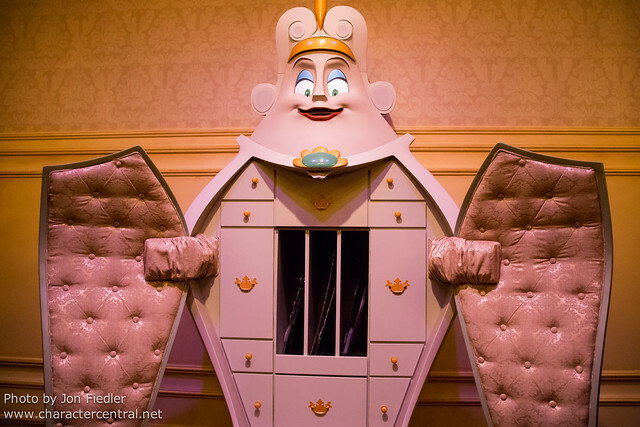 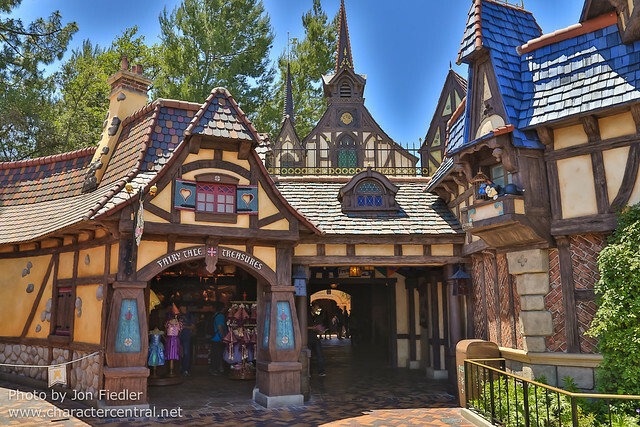 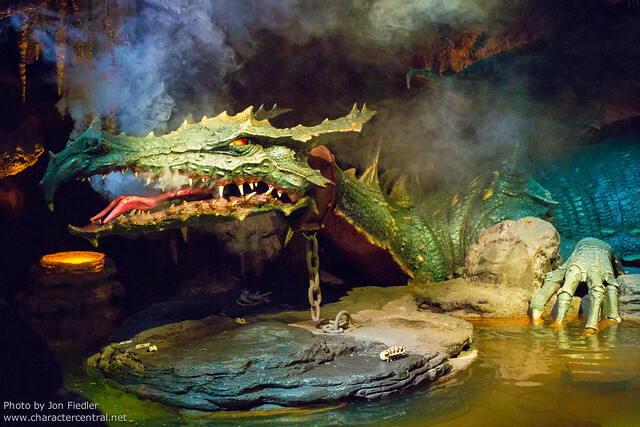 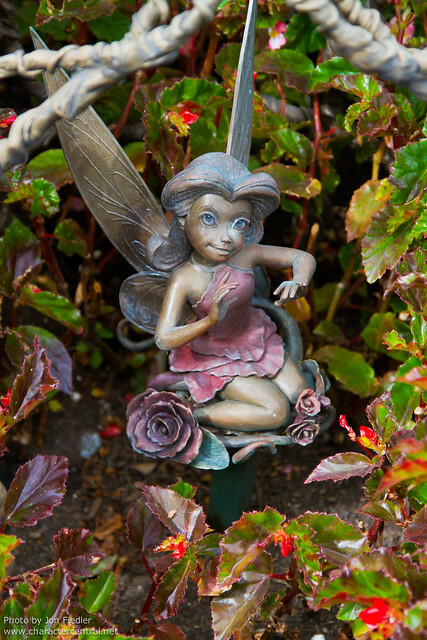 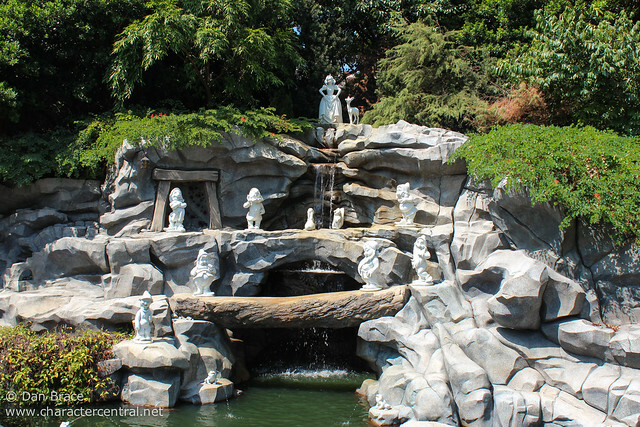 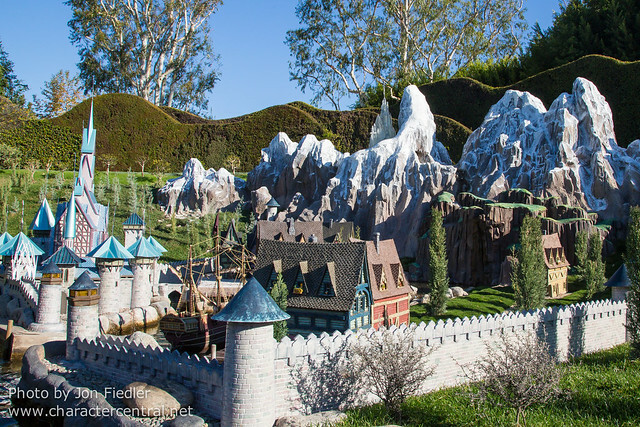 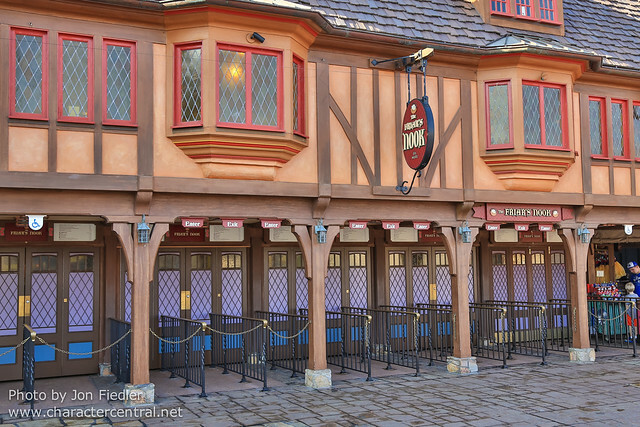 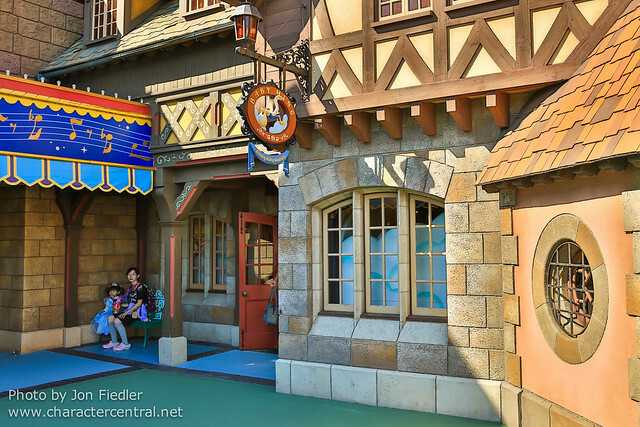 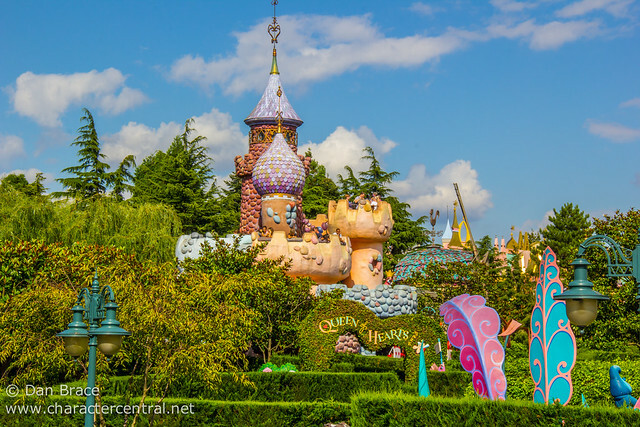 Let’s take a look and see what else Fantasyland has to offer. 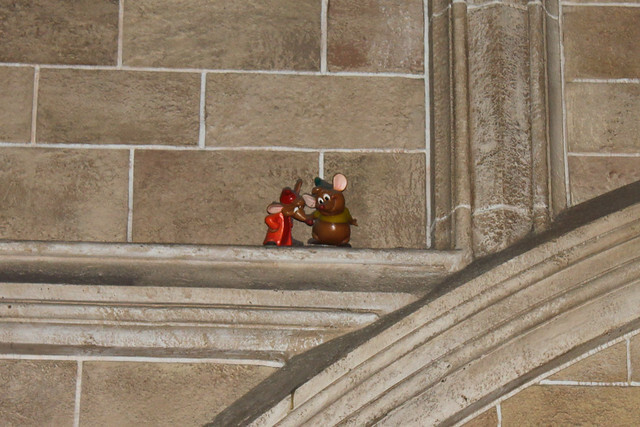 Well, we have come to the end of the tour! 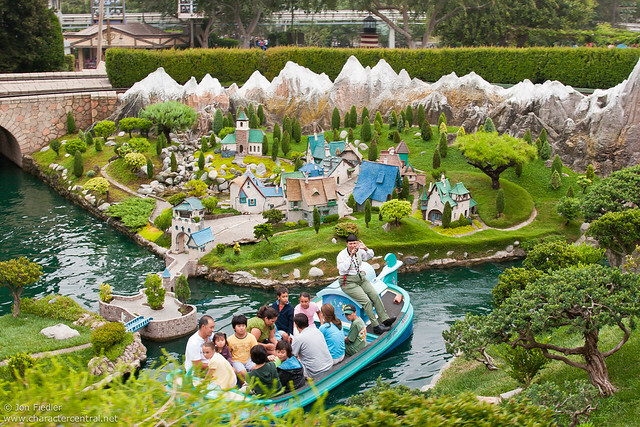 As you can see, the Fantasylands of the world have so much to offer, from familiar attractions in each park, to completely unique experiences. 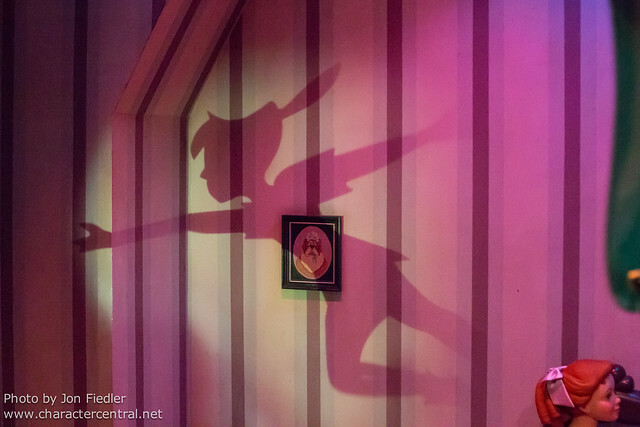 It’s been an interesting experience for me writing this series of articles, because it always highlights things that I may not have noticed otherwise. 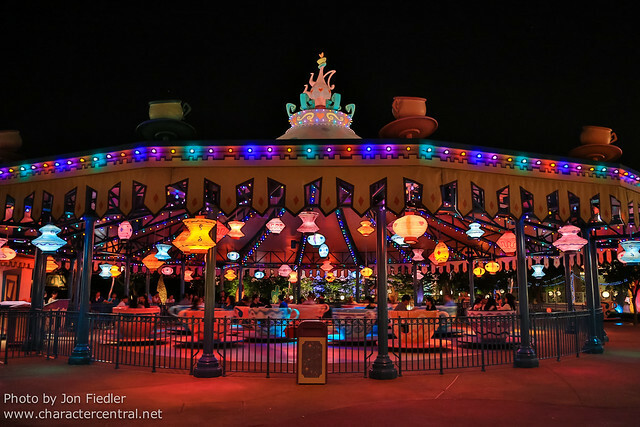 It’s very easy to walk around and just think, “Oh, that’s the same”, when in fact more times than not, there is something different about whatever it is I’m looking at. 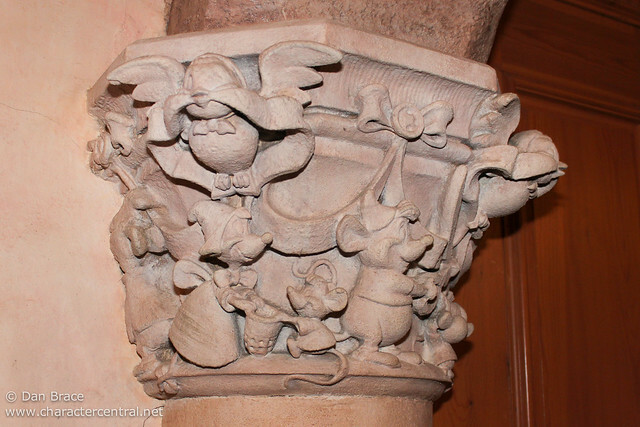 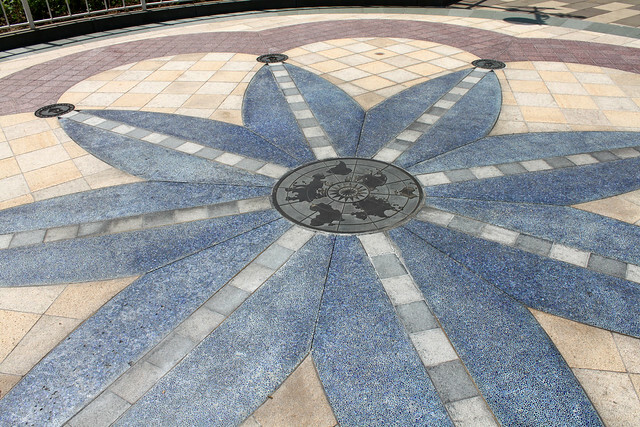 Seeing everything side by side allows us to appreciate the diversity of the parks, but also see where the later Kingdoms drew inspiration in things that are alike. 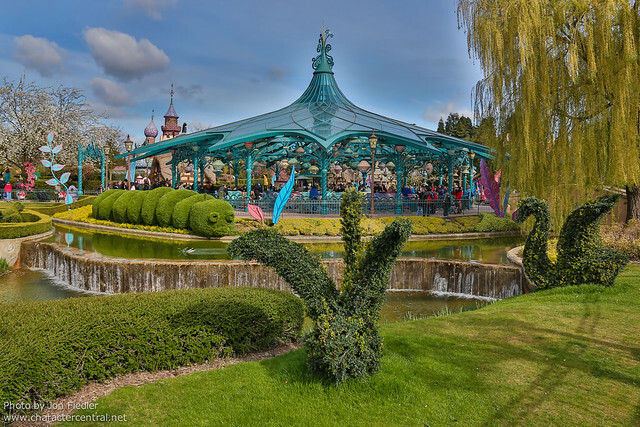 Despite their vast differences, and many similarities, I would still argue that Disneyland Paris has the edge in design, theming and layout. 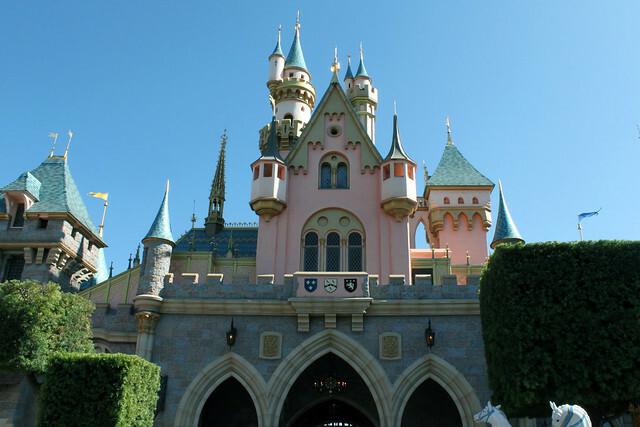 Disneyland has the most attractions in Fantasyland, with fourteen, while Magic Kingdom and Disneyland Paris both have twelve. 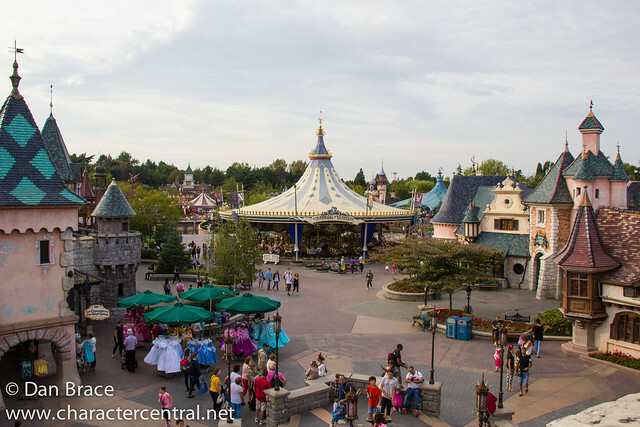 However, Disneyland Paris has the advantage of size, and being the third built it has a more cohesive layout. 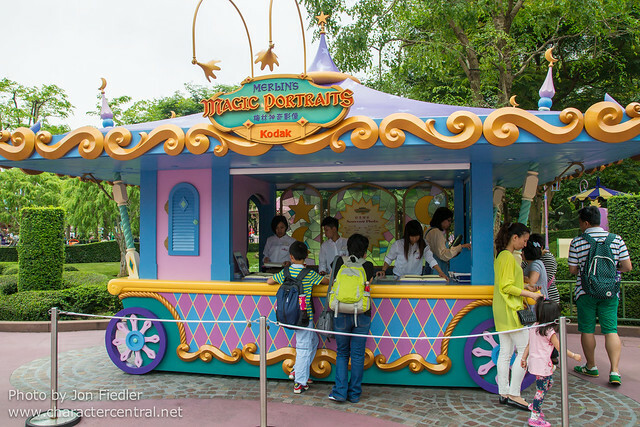 Tokyo needs a massive overhaul - which it will be getting - and Hong Kong just needs more, but does have some charm. 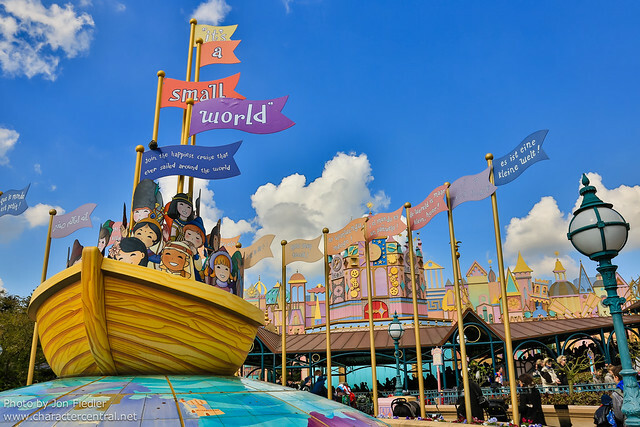 It’s all these little things that I could talk about all day that make up more than just a park; they make up a whole world of magic and fantasy, which is timeless and endearing. 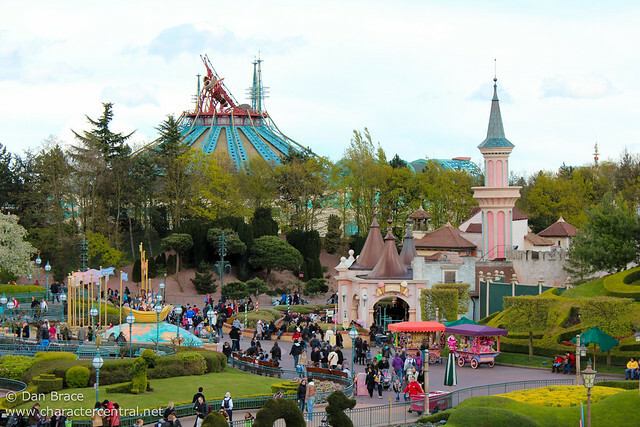 The fifth and final part of this tour will be about Tomorrowland/Discoveryland. 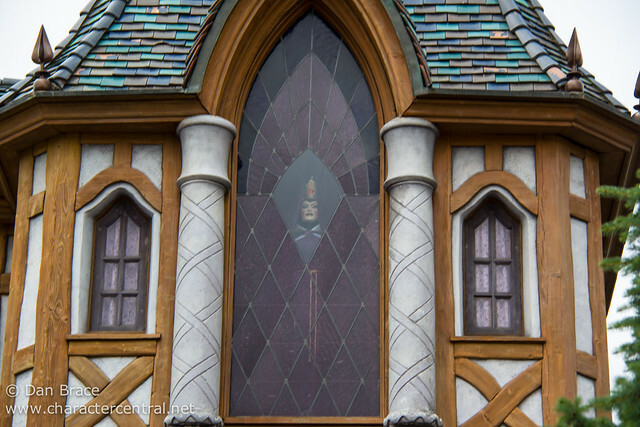 Keep an eye on the Character Central blog for that one.